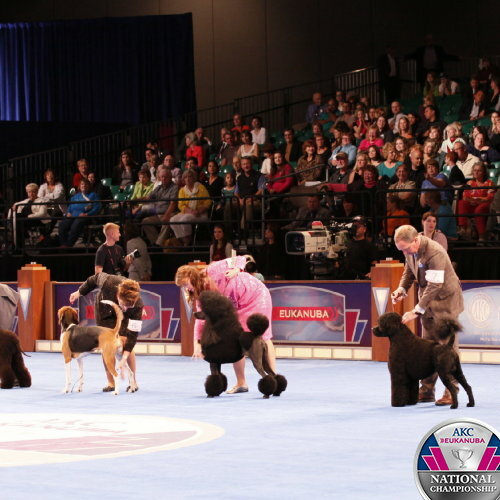 The entirety of Sunday night's events including Group Judging for Herding, Terrier and Working and overall Best in Show. 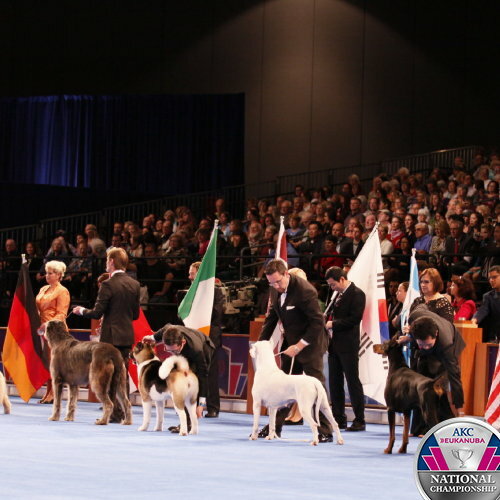 The entirety of Saturday night's events including Group Judging for Sporting, Non-Sporting, Hound & Toy. 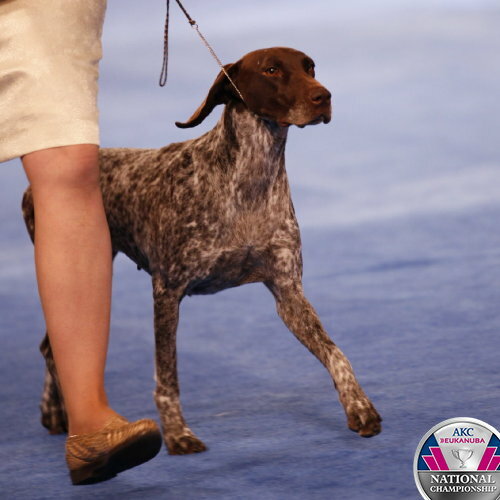 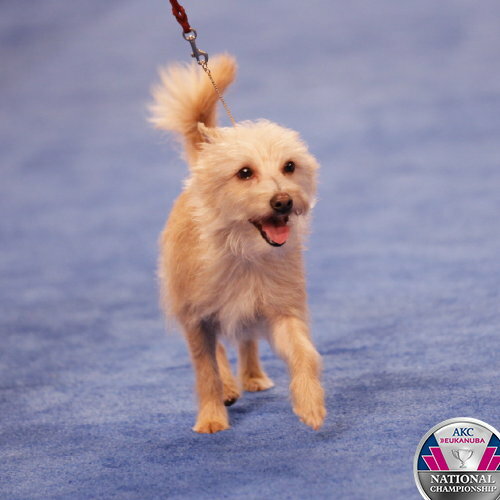 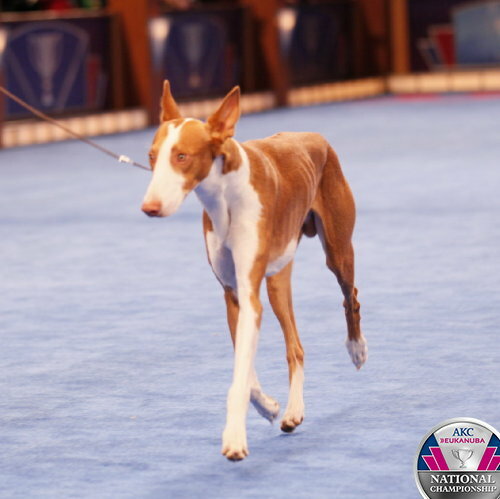 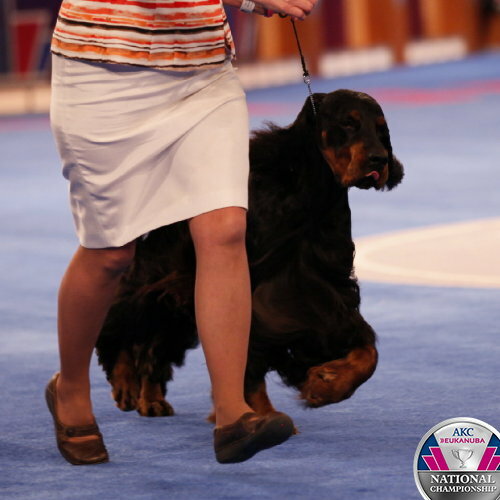 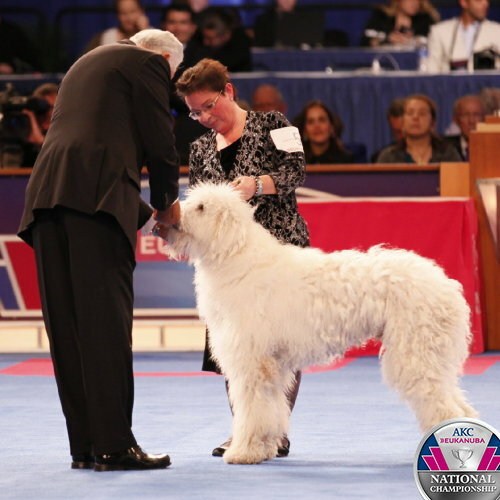 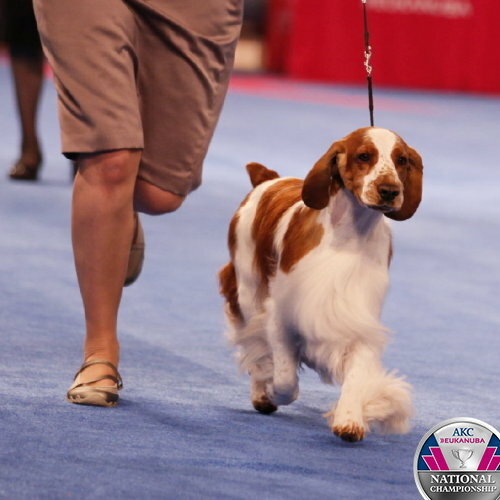 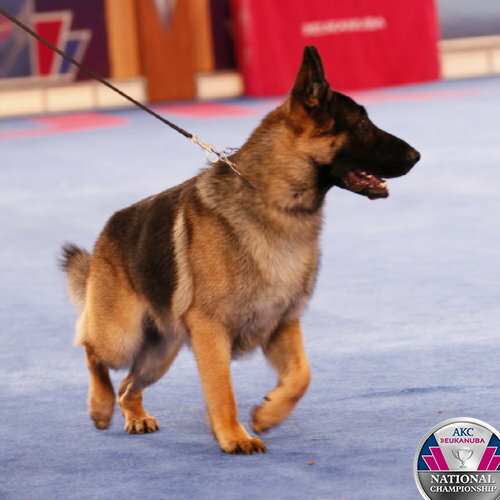 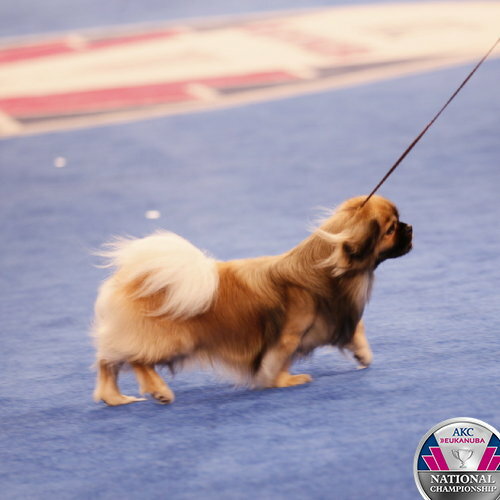 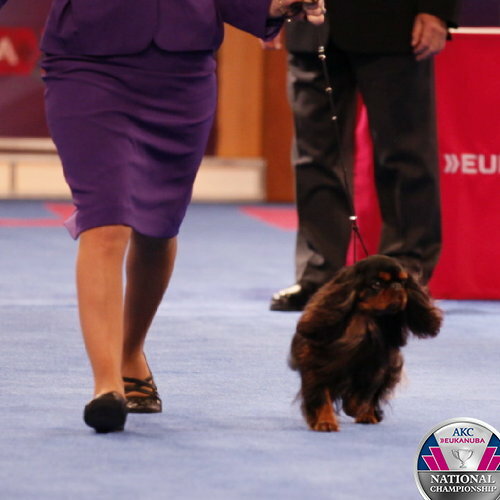 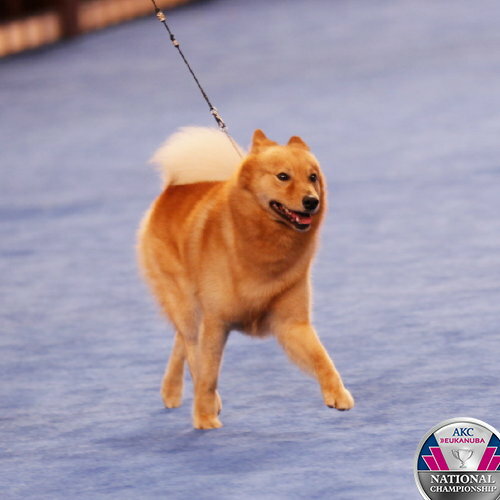 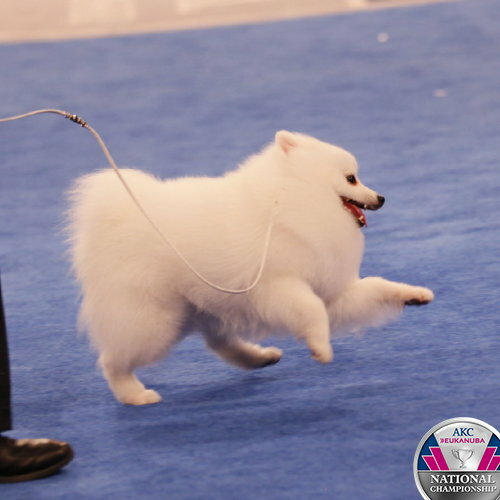 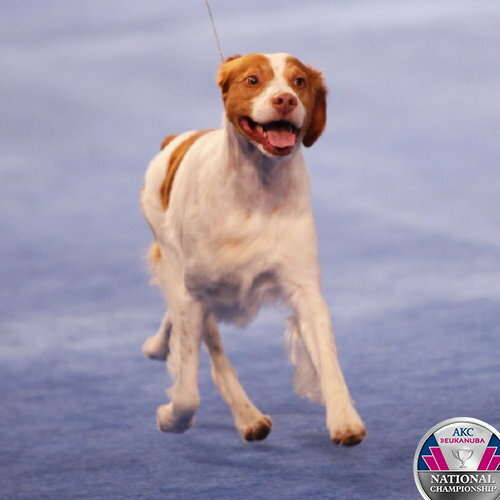 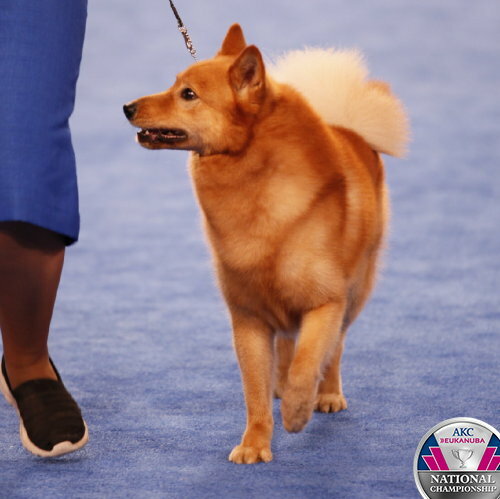 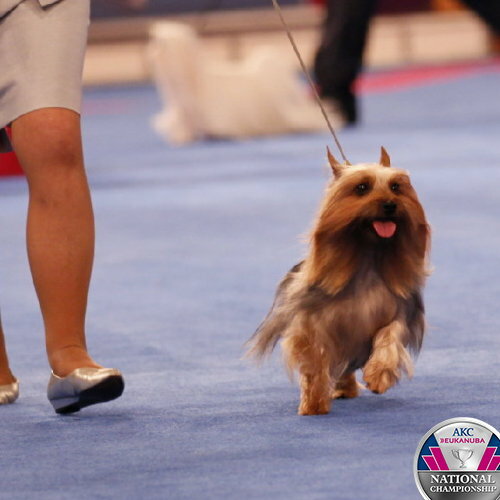 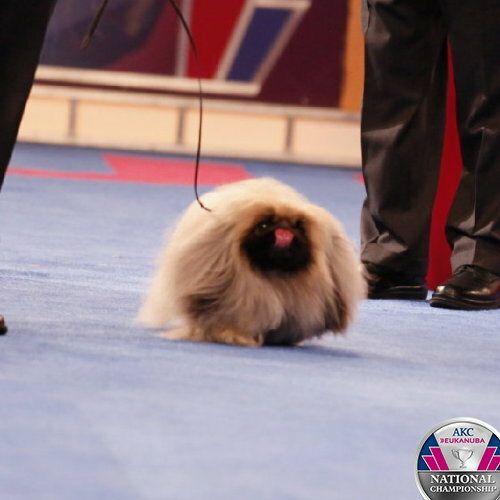 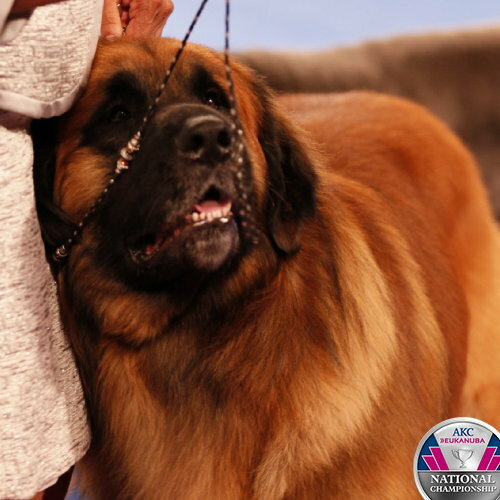 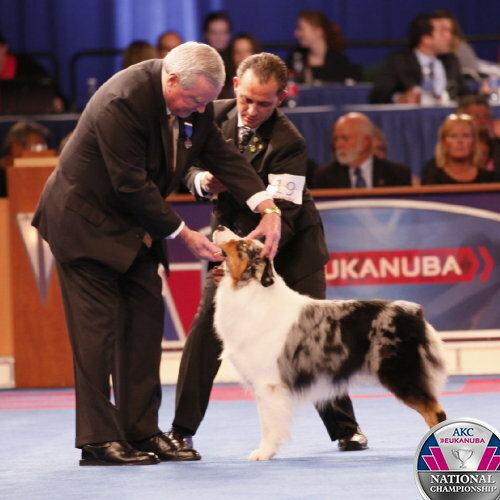 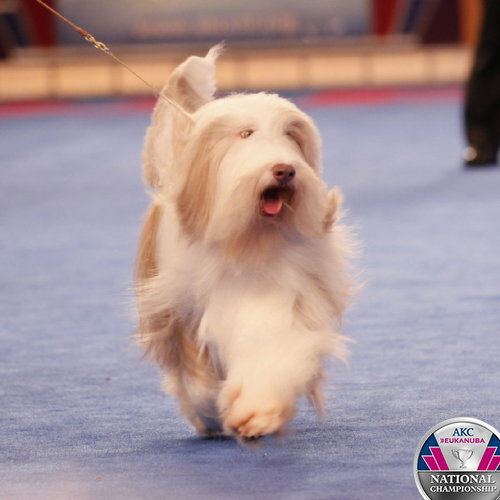 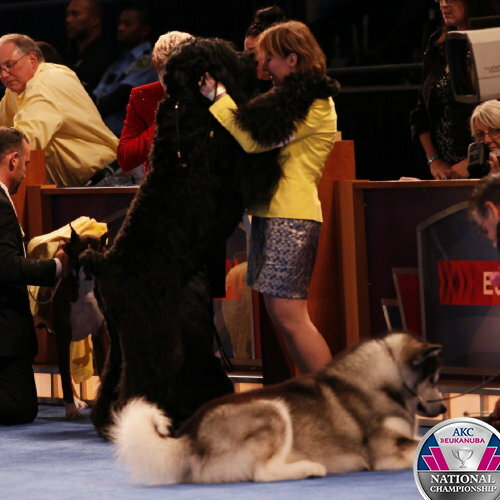 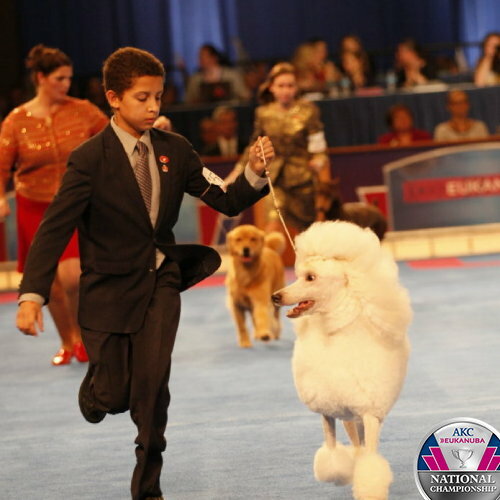 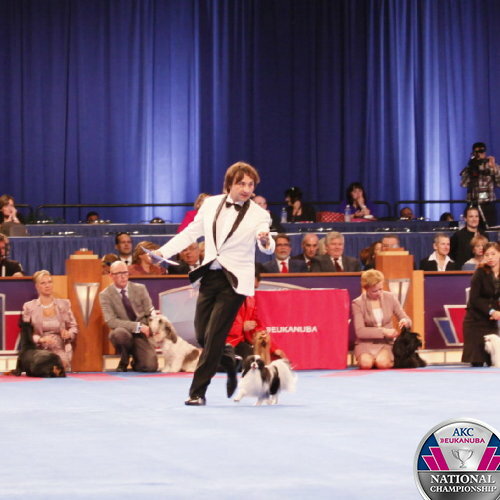 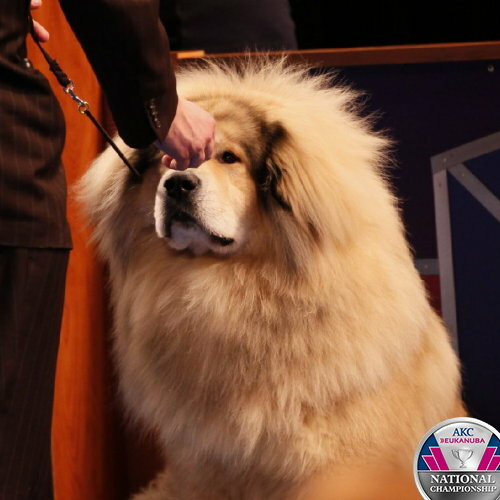 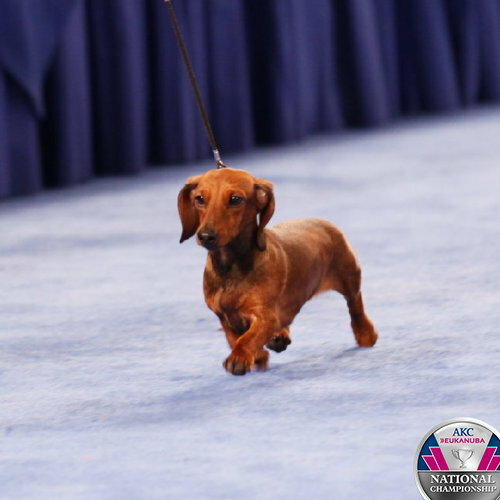 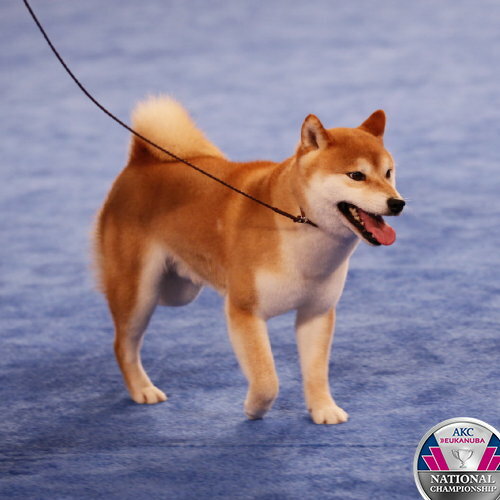 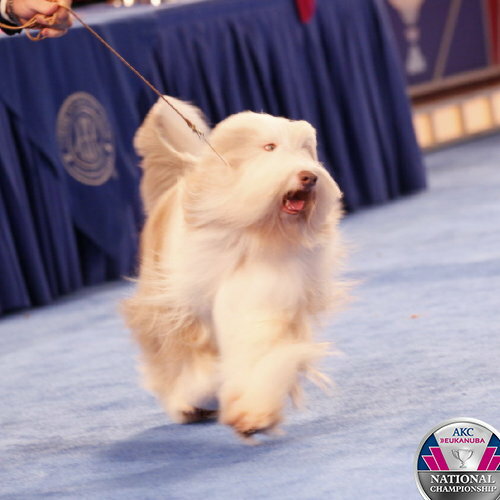 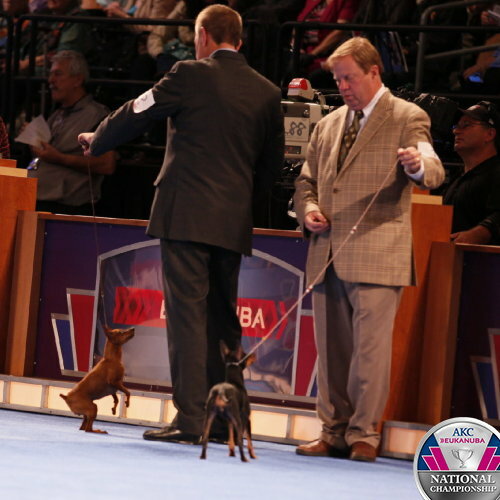 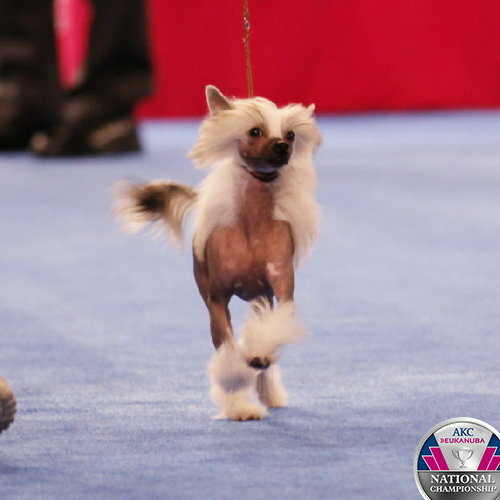 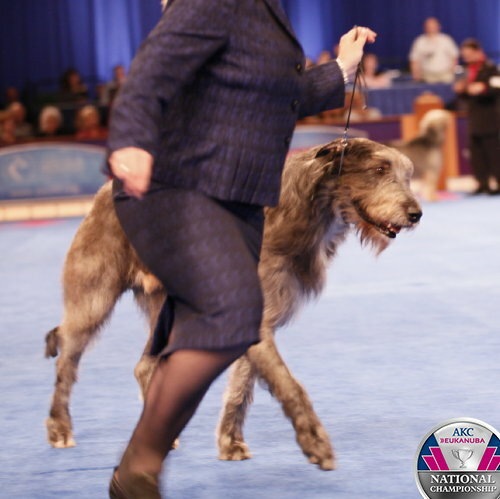 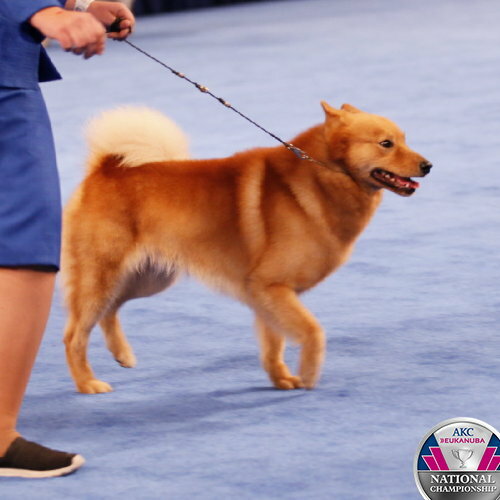 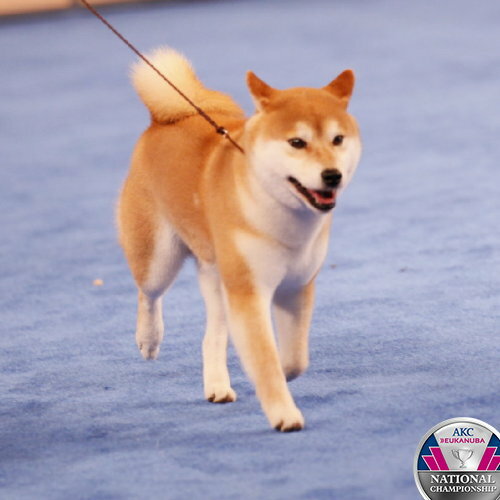 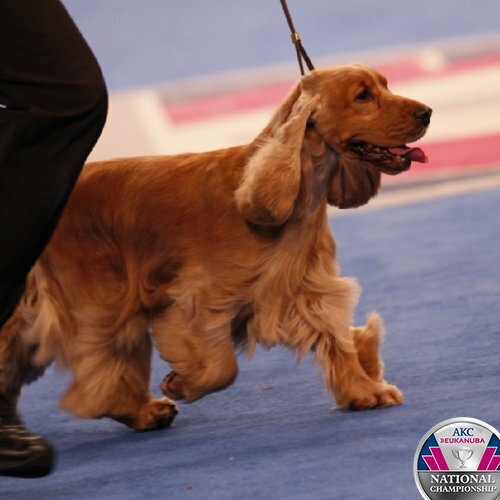 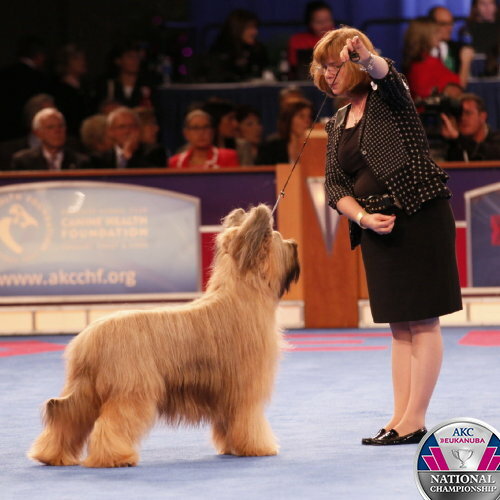 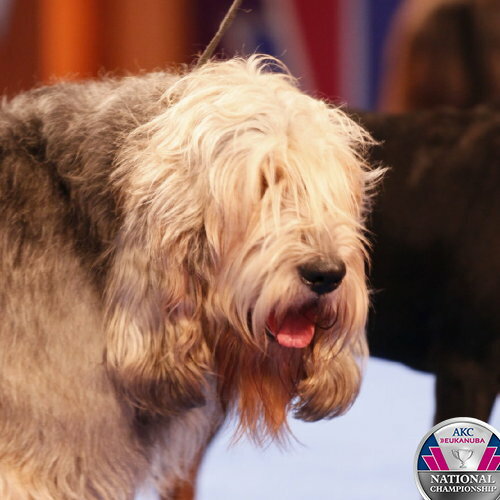 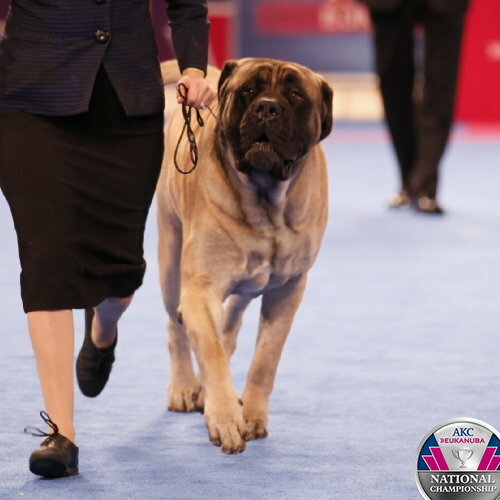 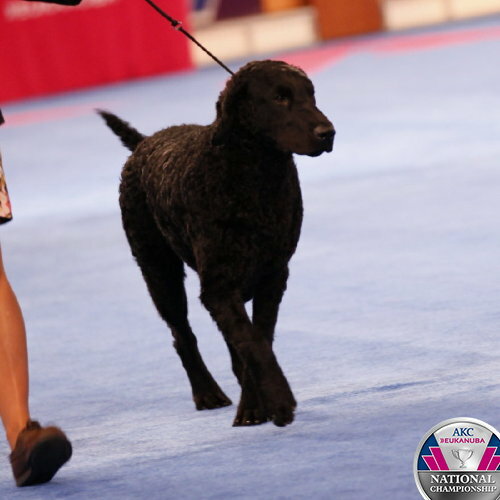 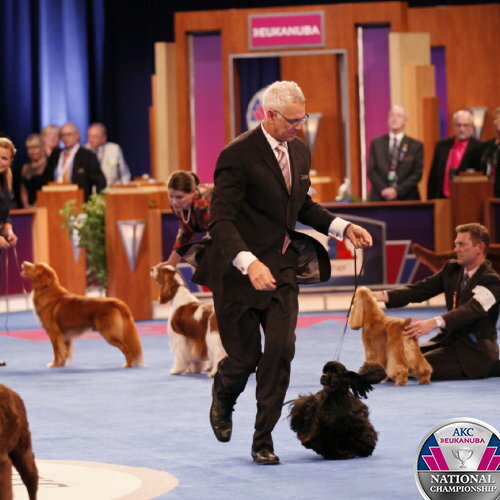 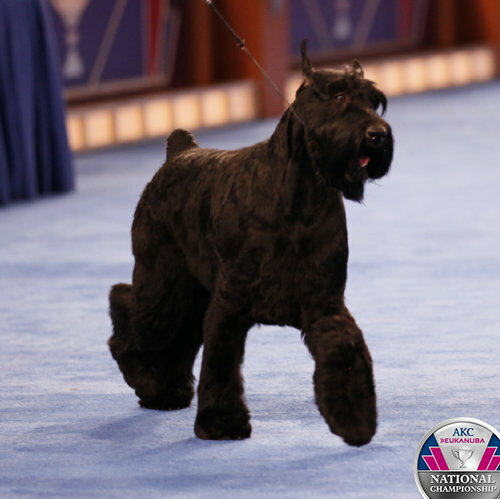 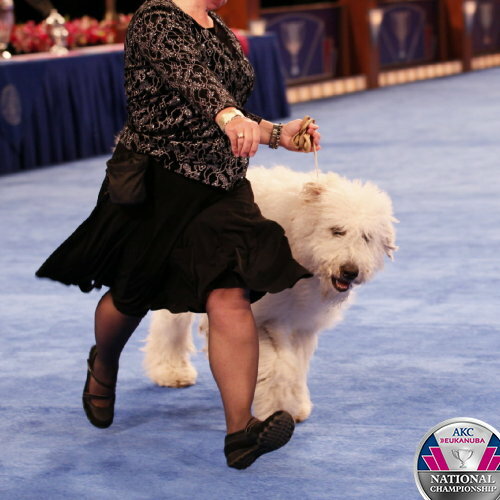 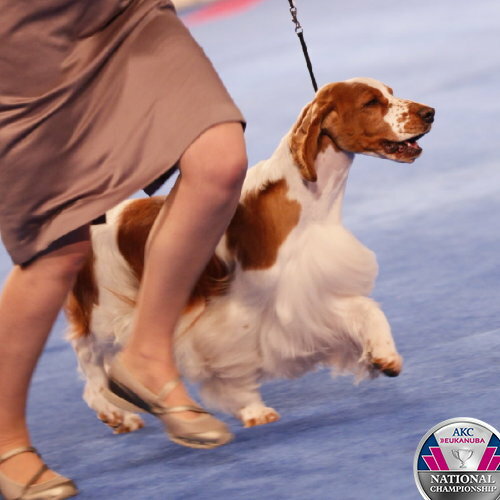 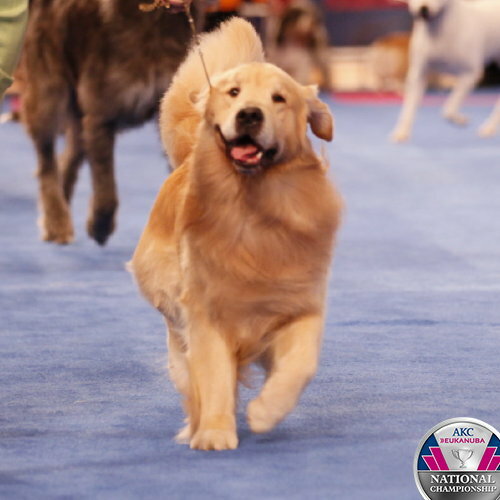 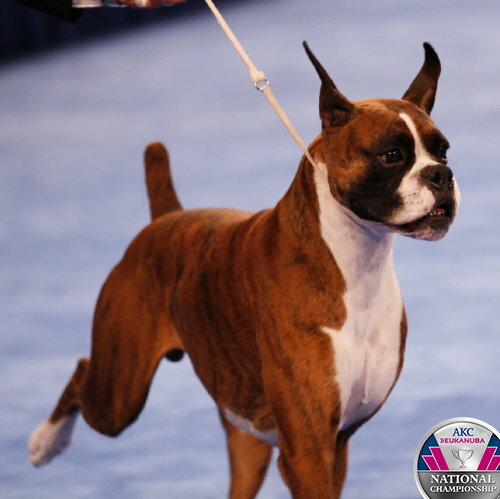 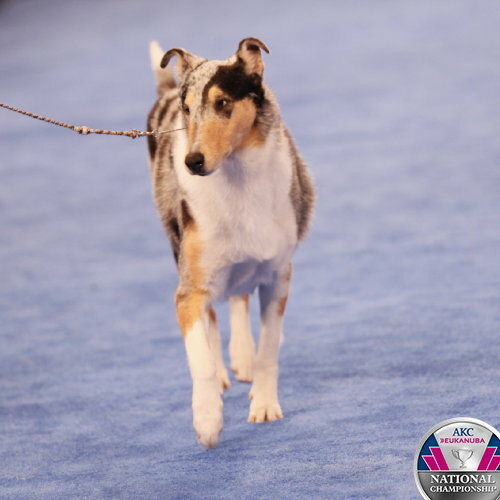 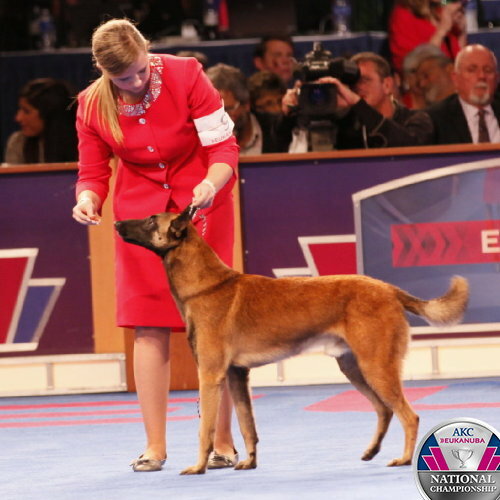 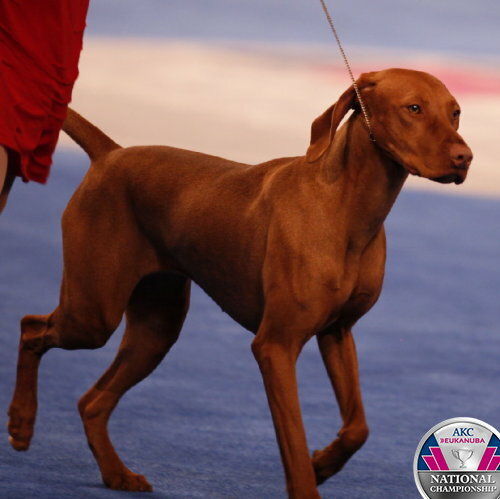 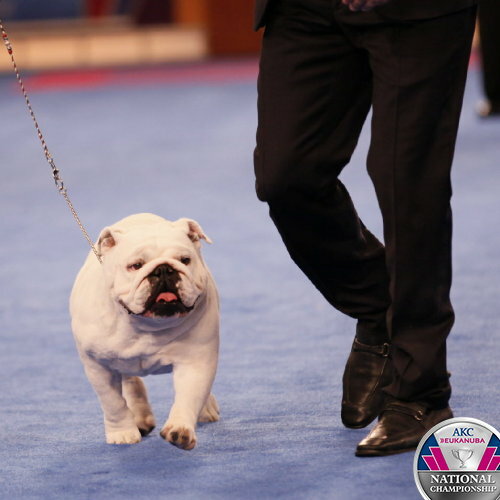 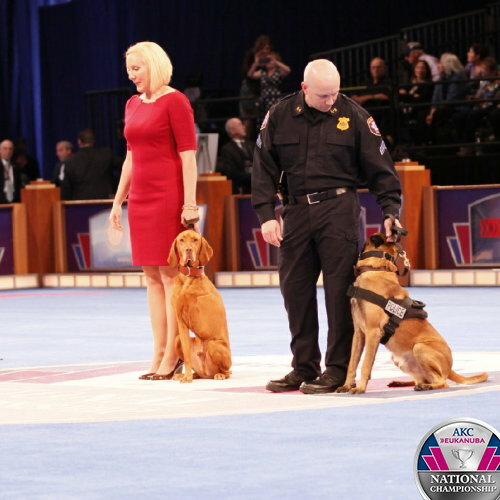 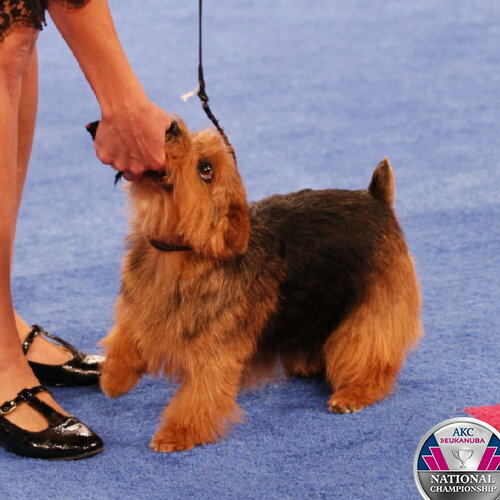 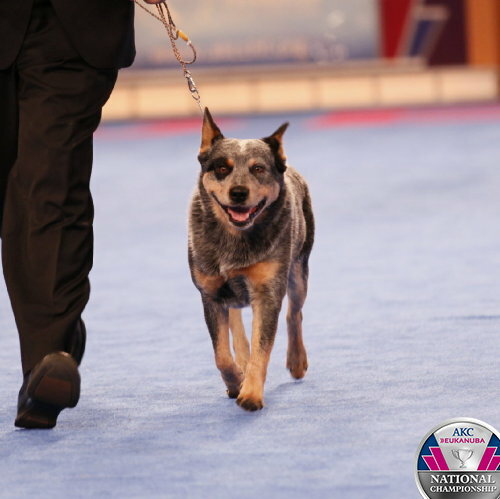 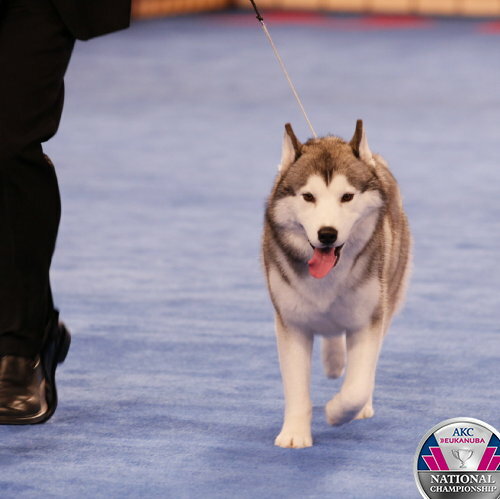 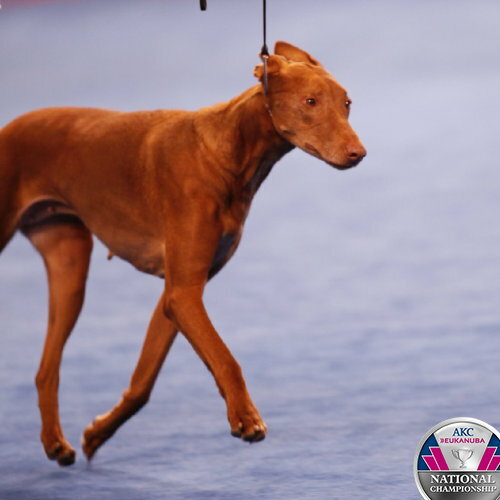 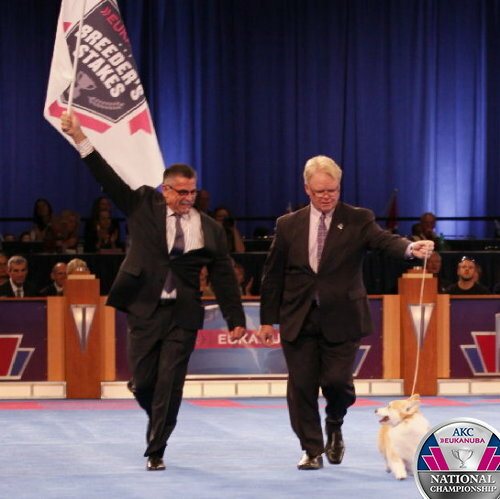 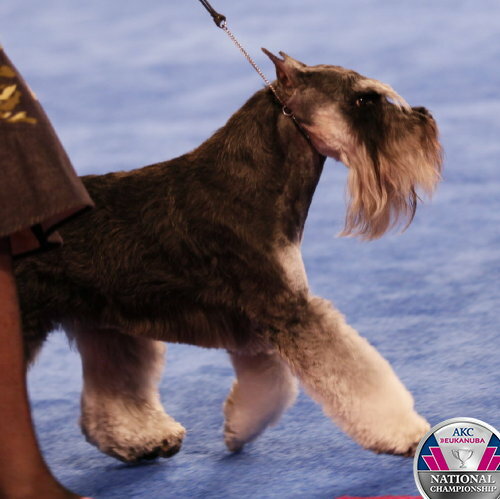 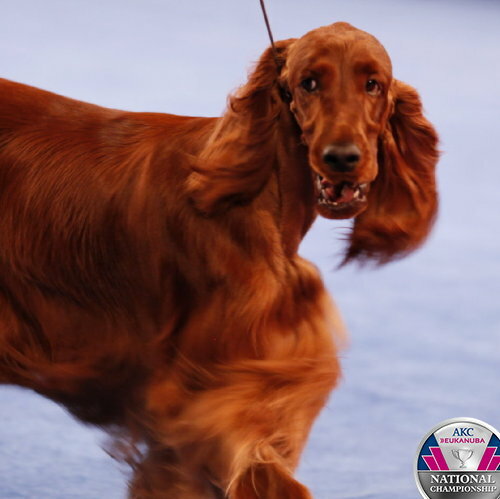 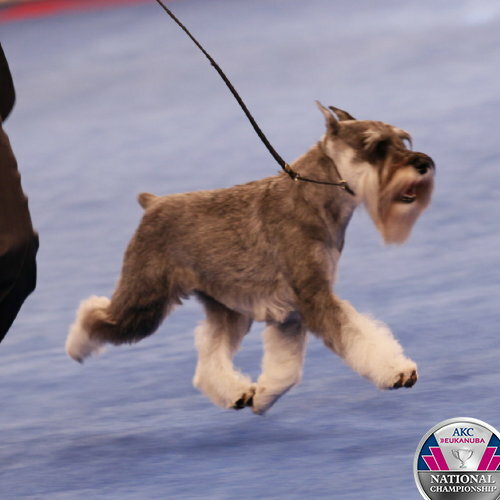 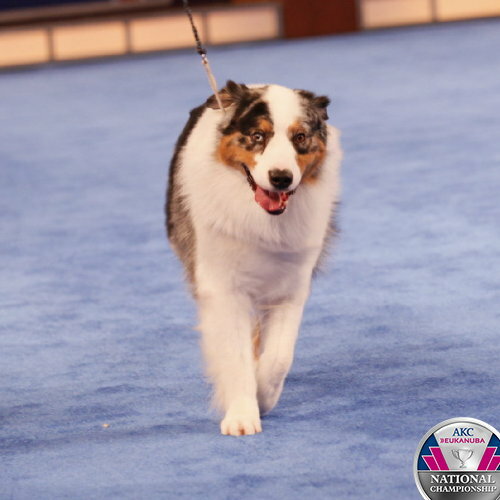 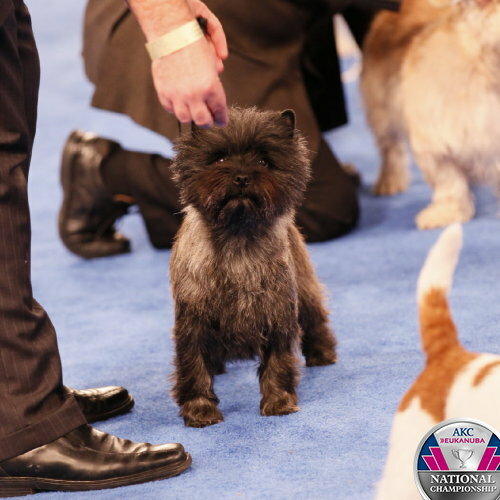 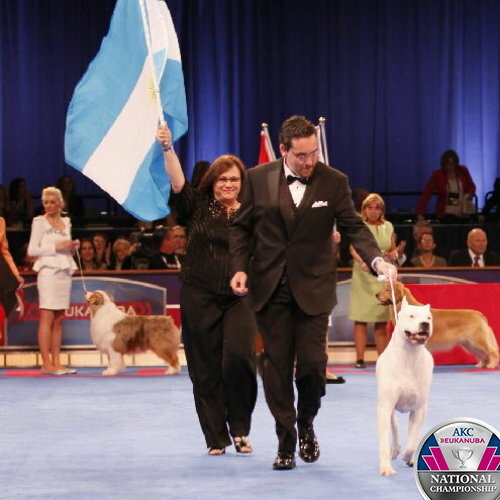 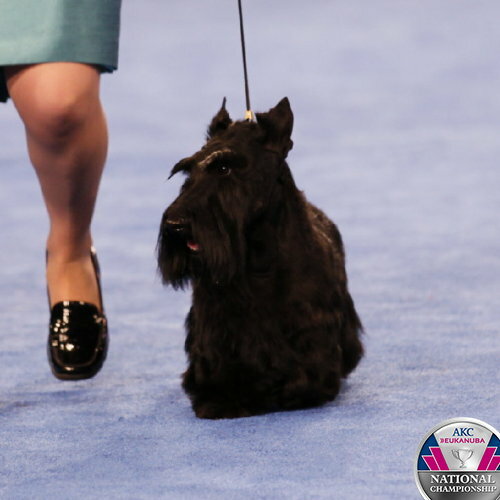 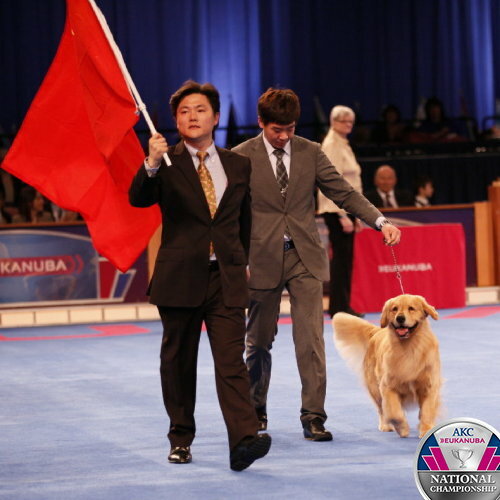 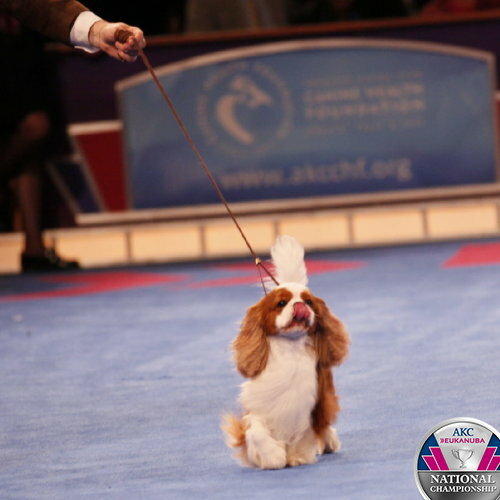 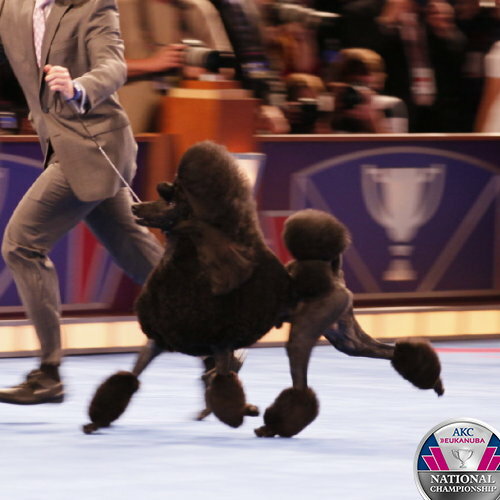 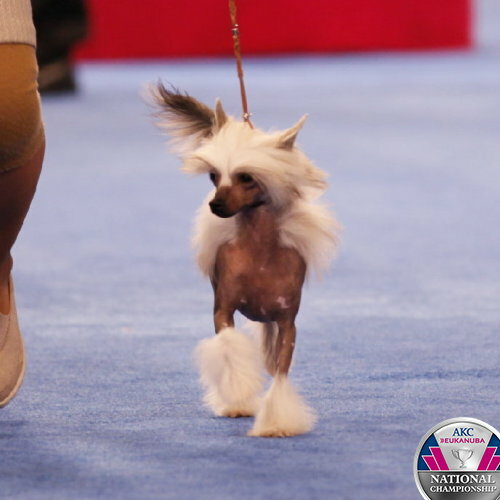 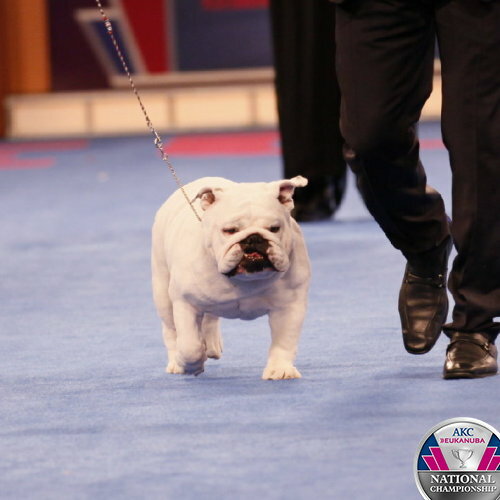 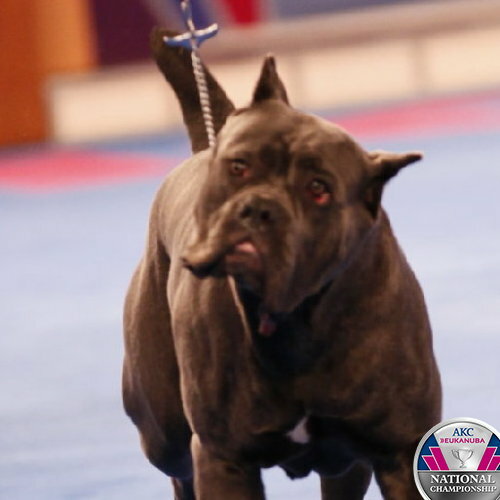 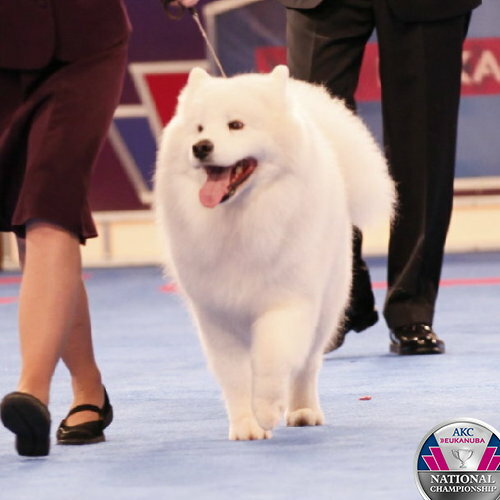 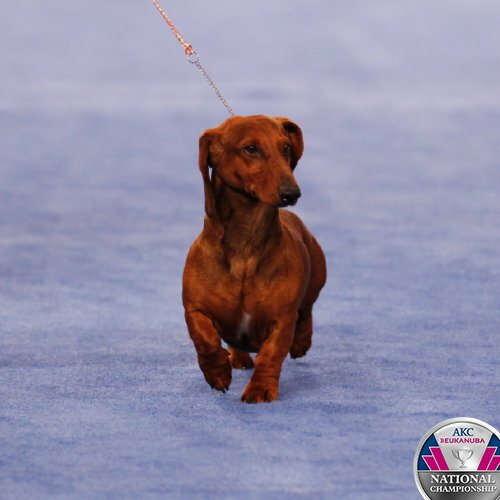 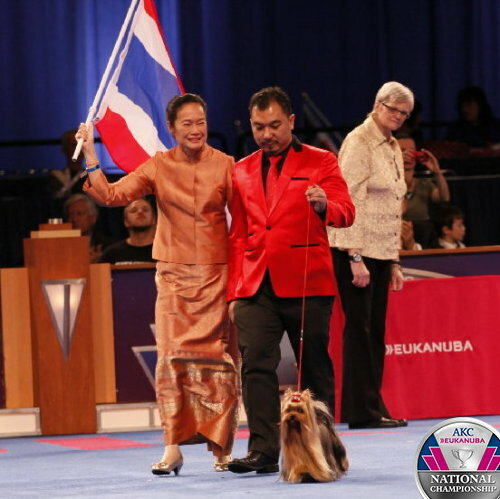 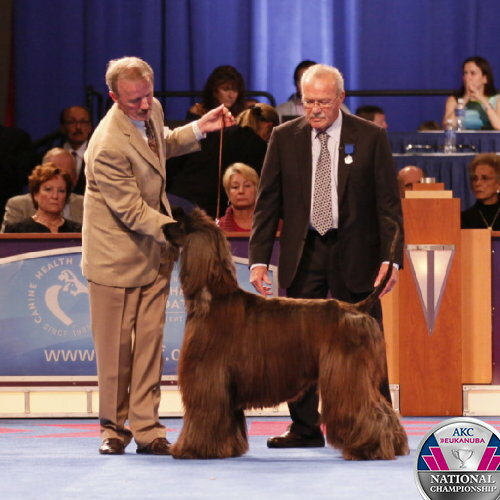 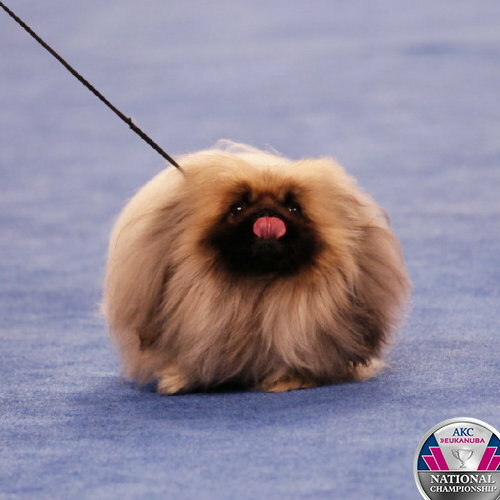 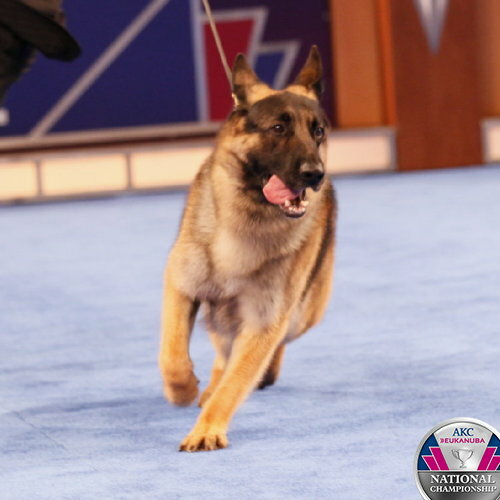 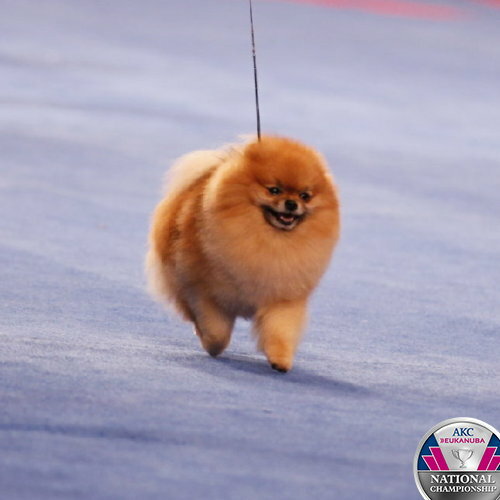 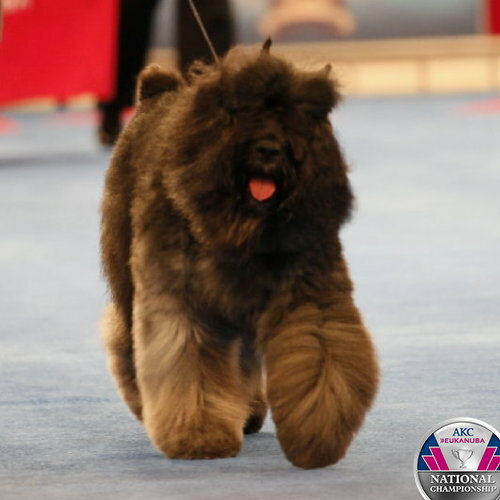 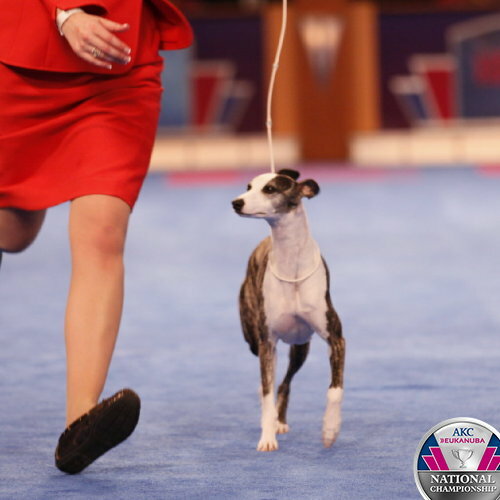 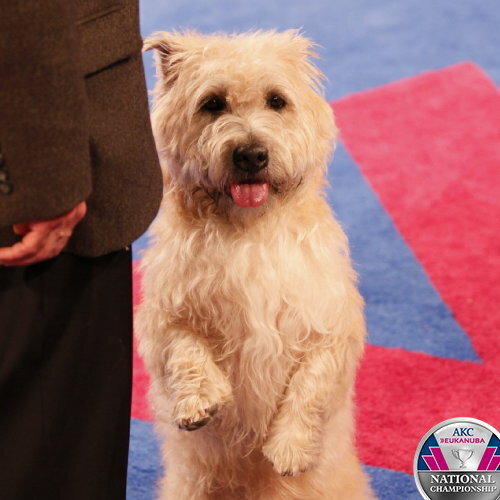 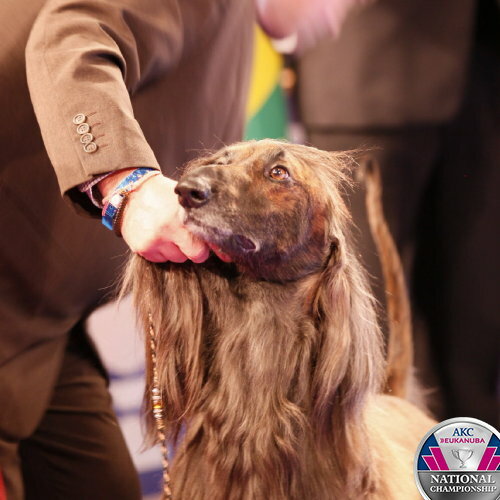 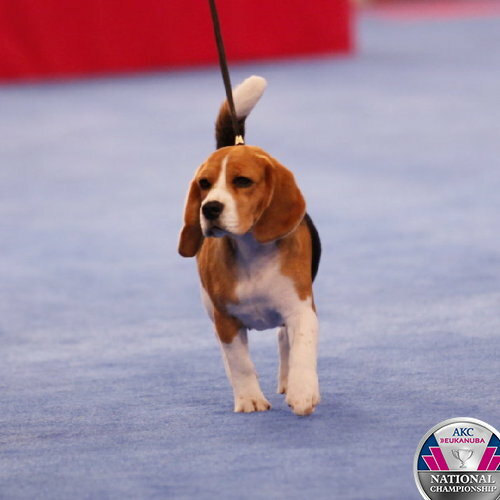 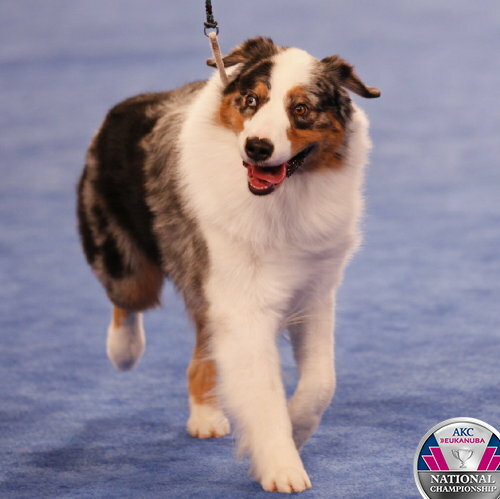 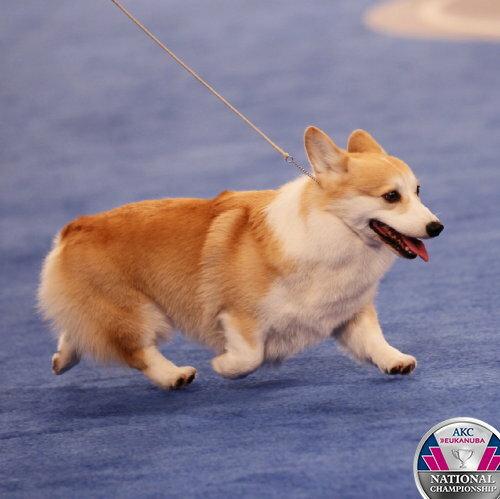 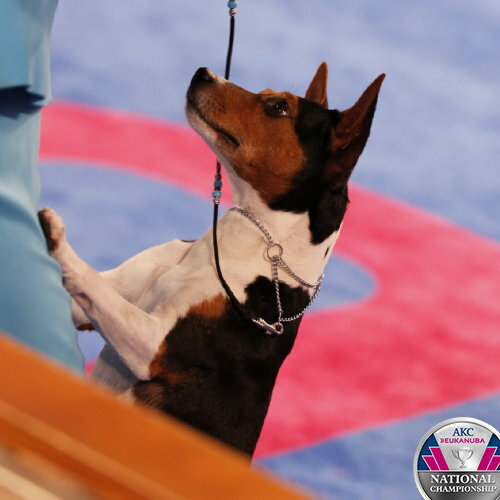 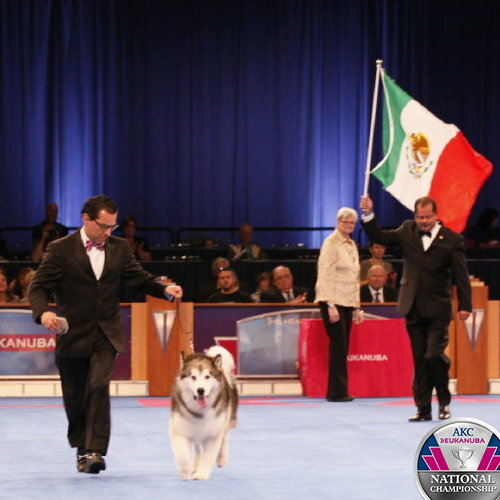 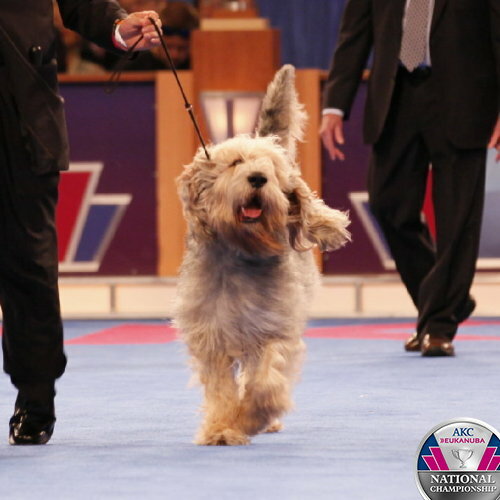 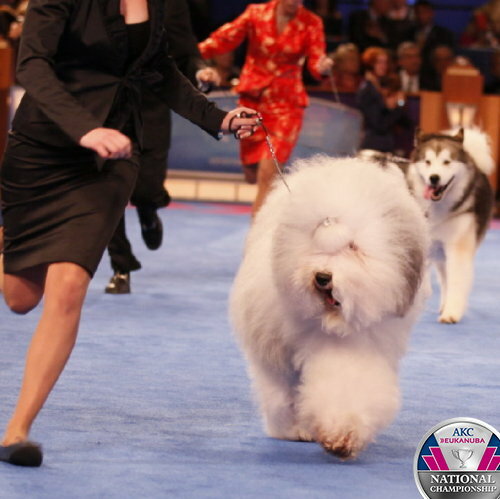 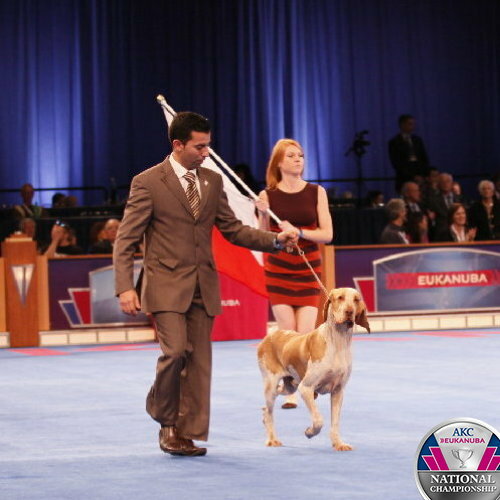 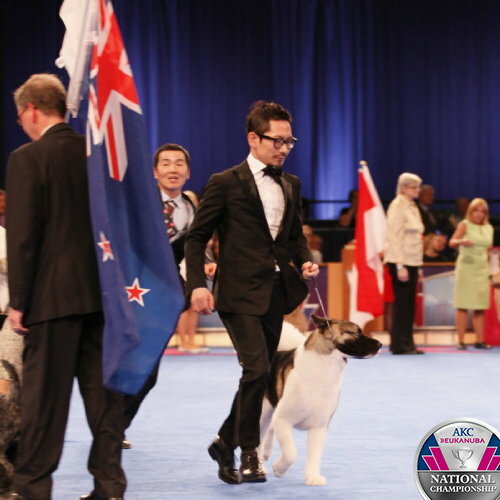 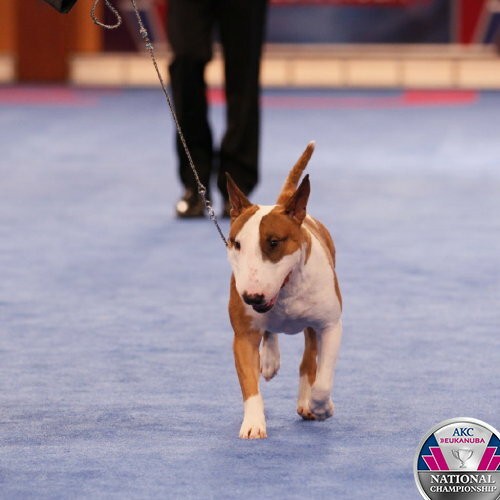 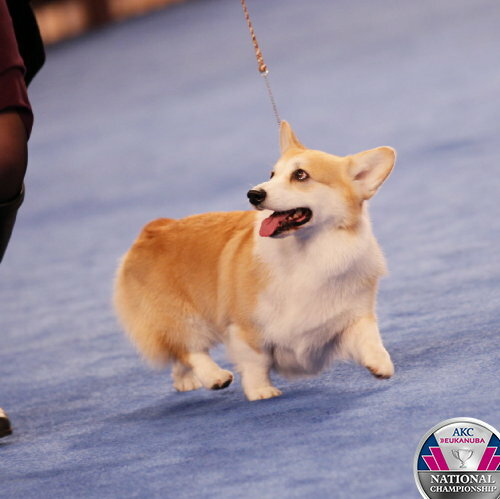 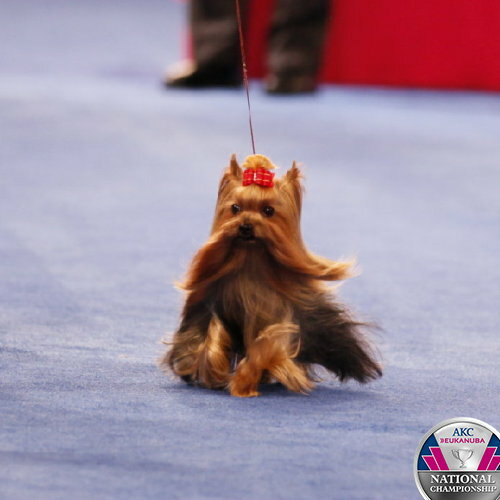 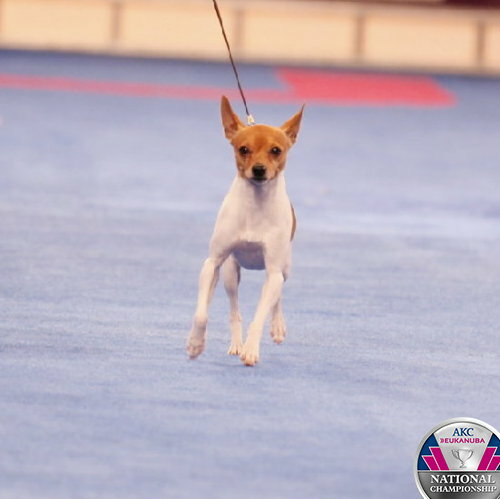 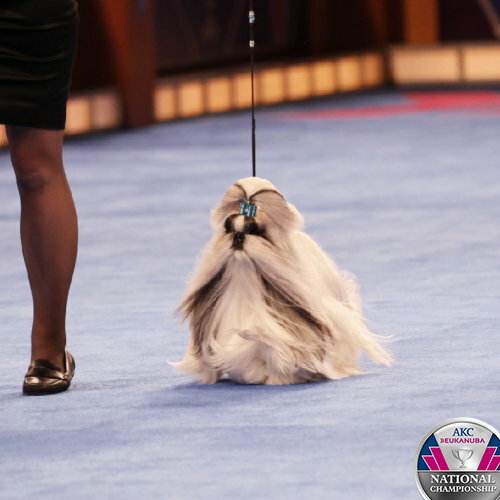 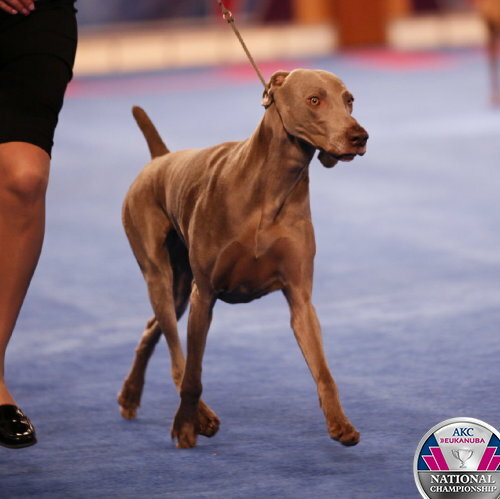 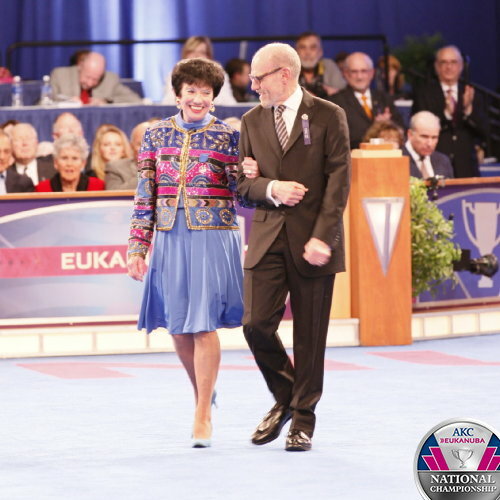 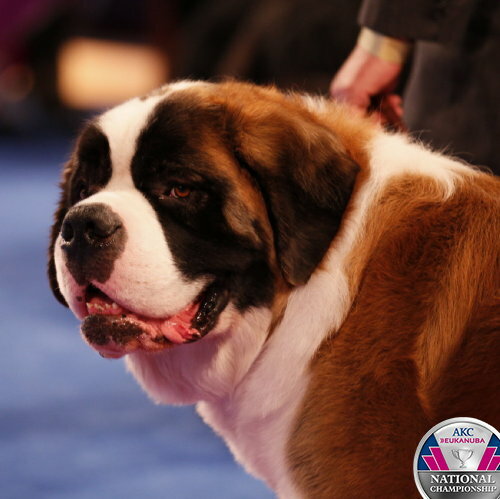 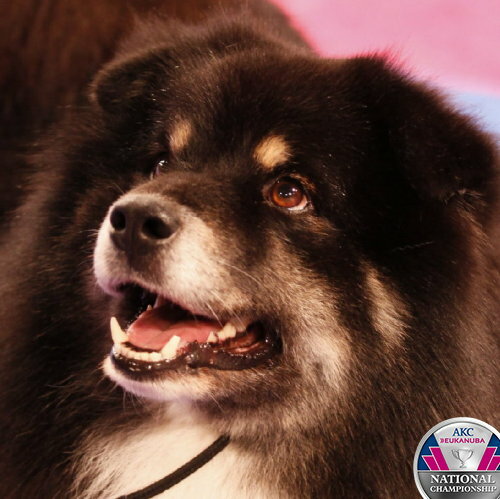 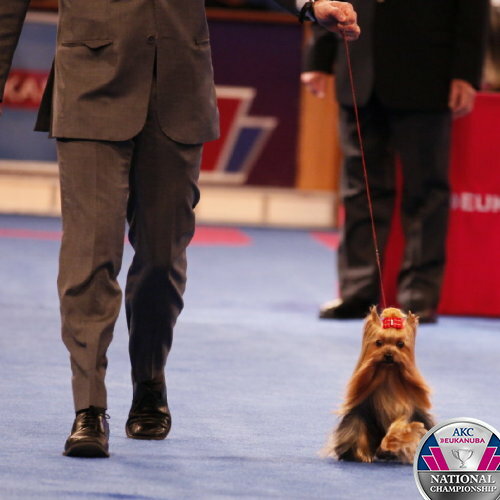 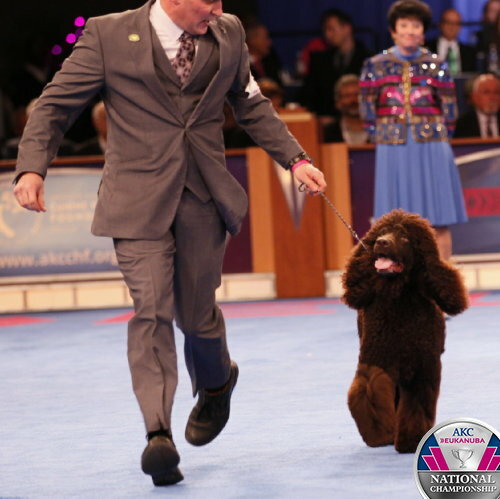 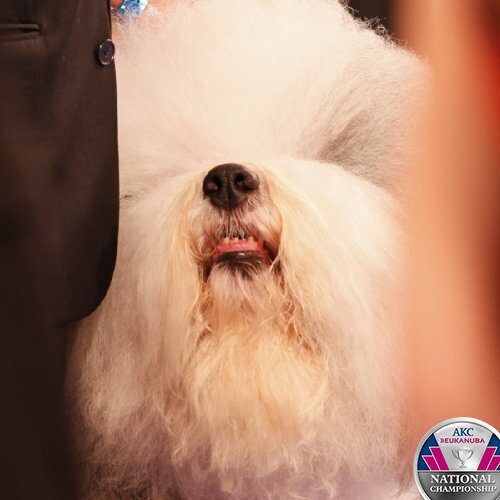 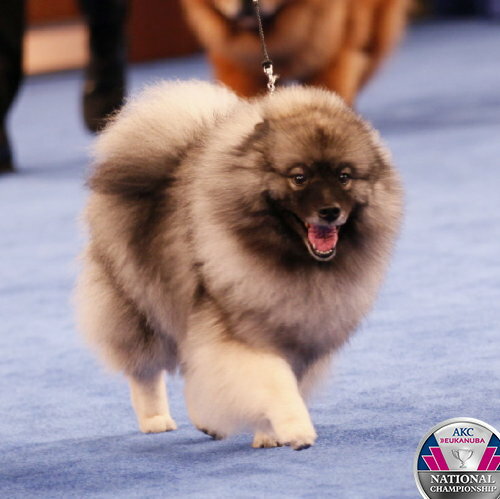 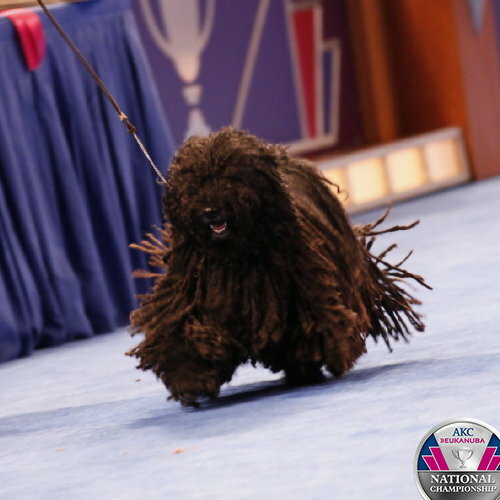 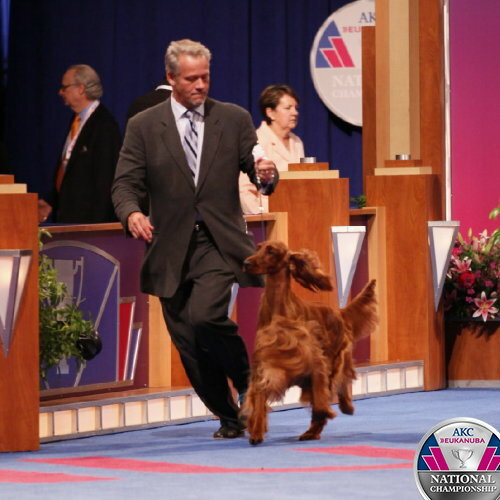 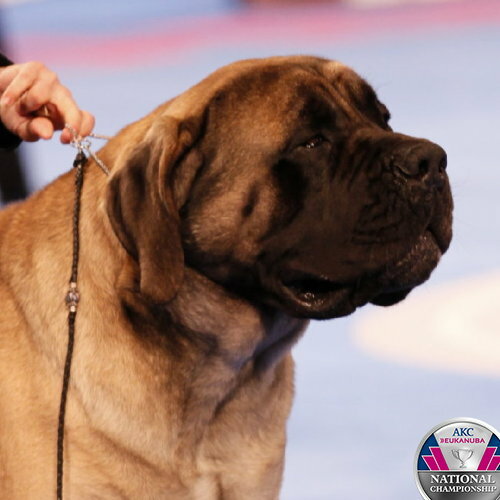 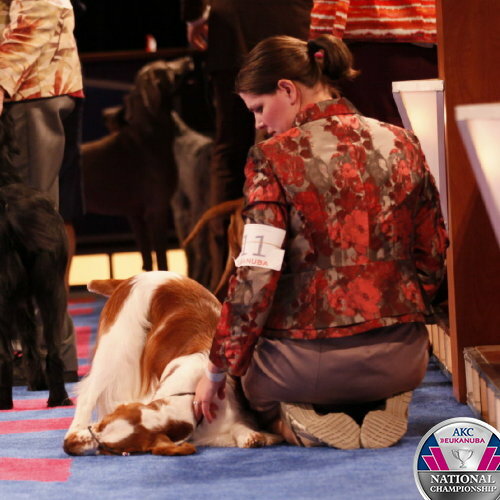 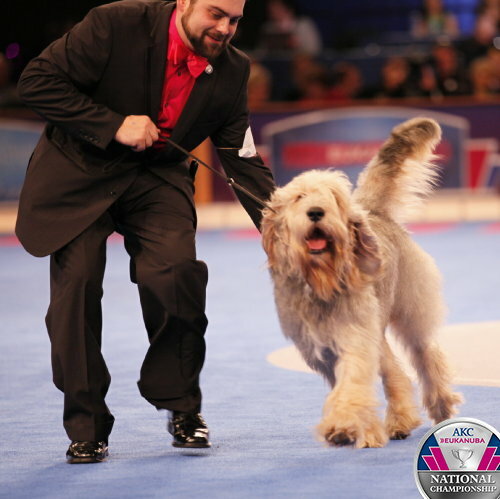 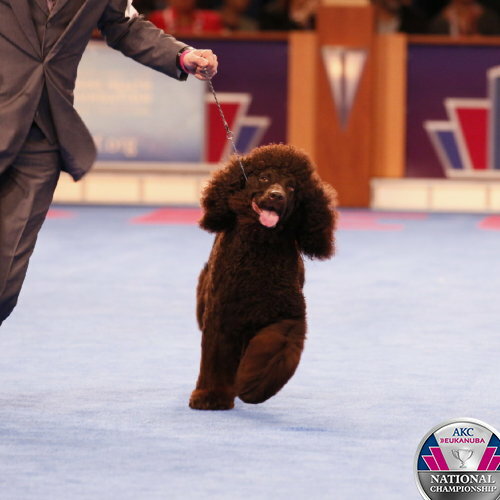 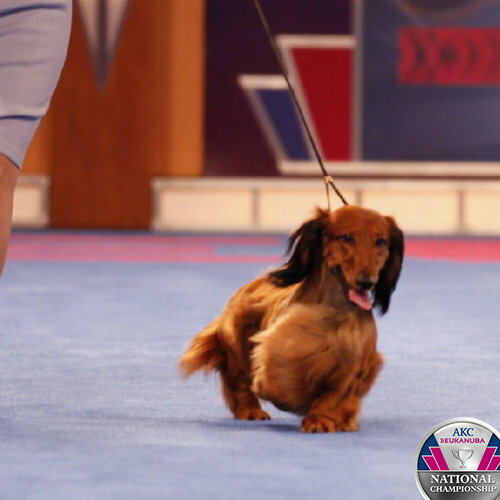 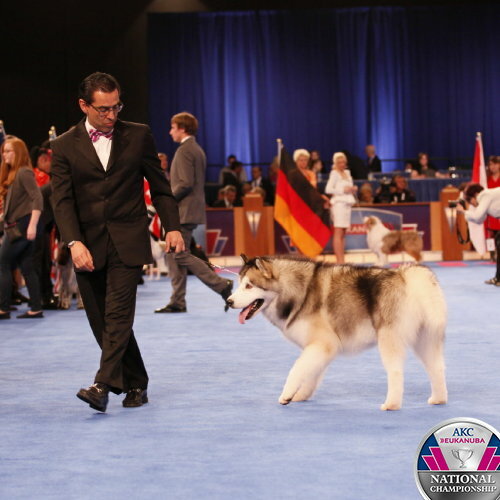 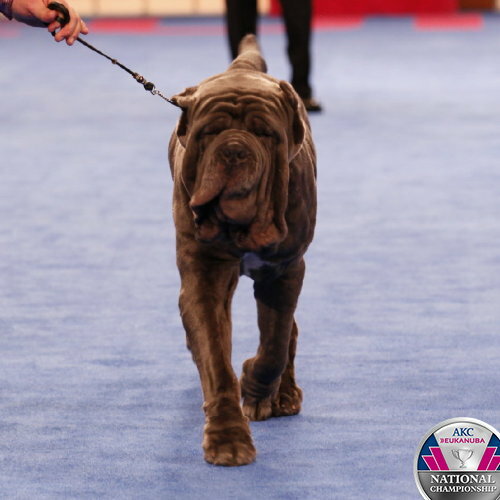 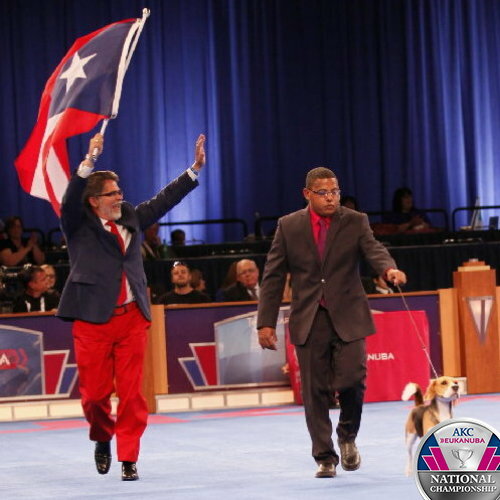 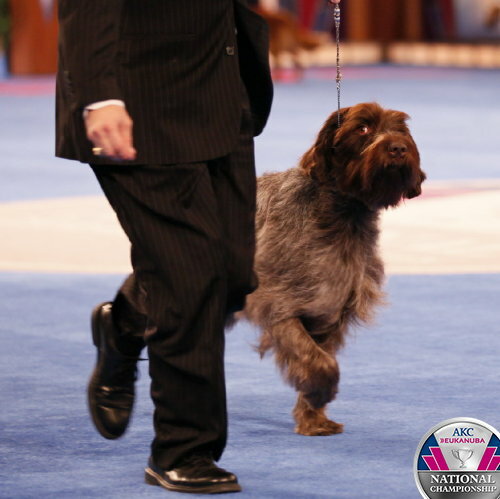 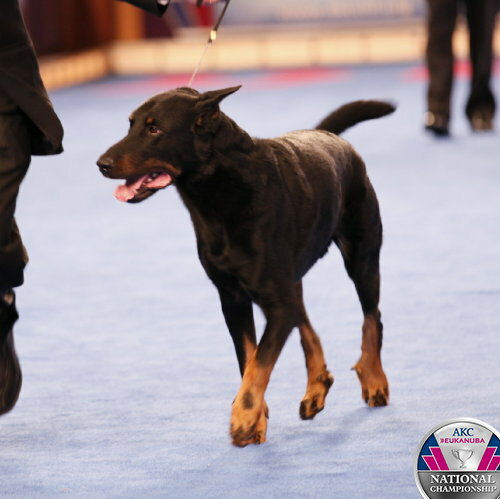 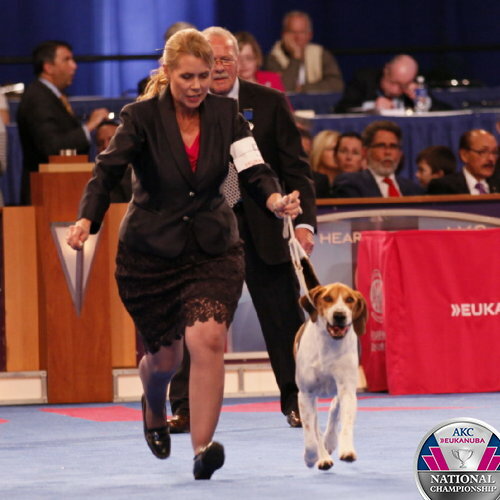 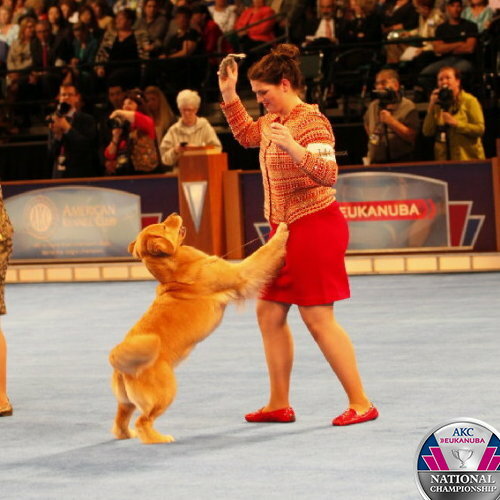 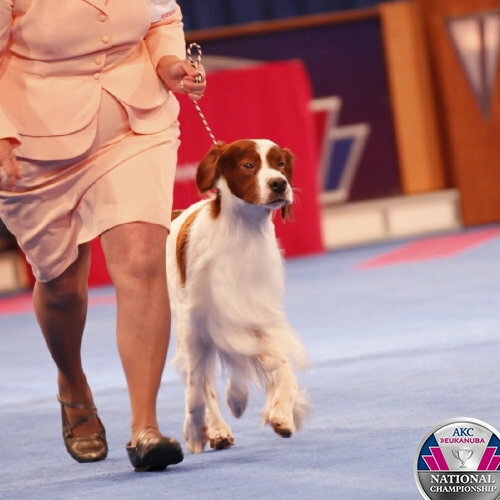 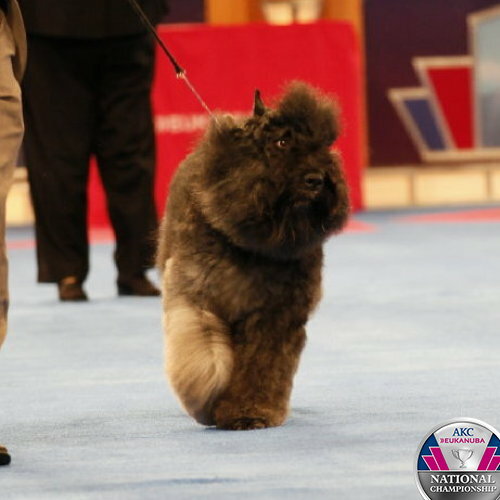 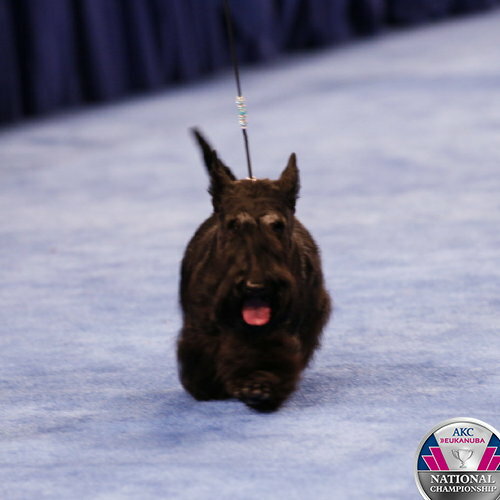 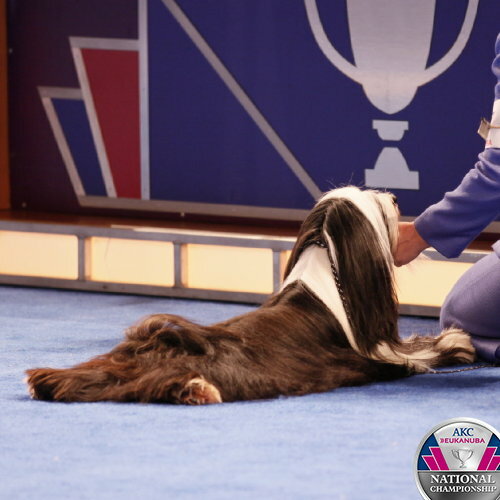 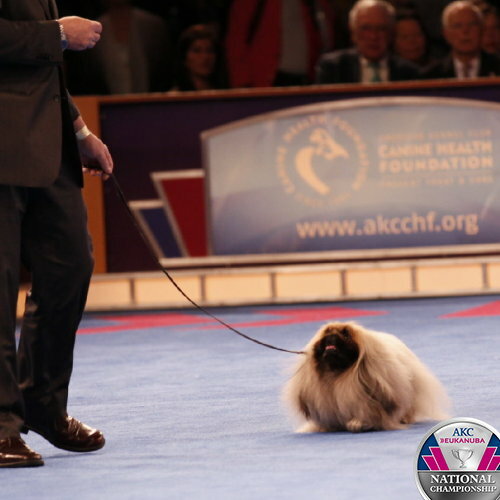 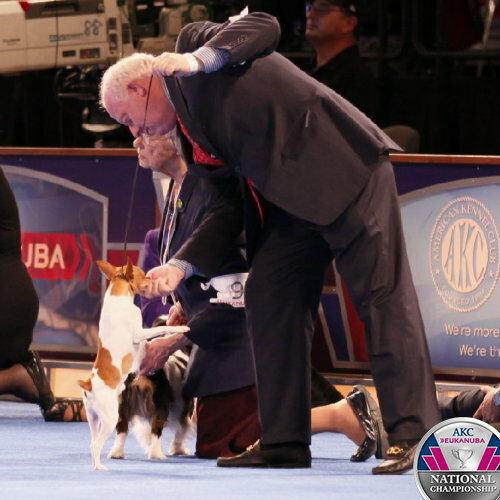 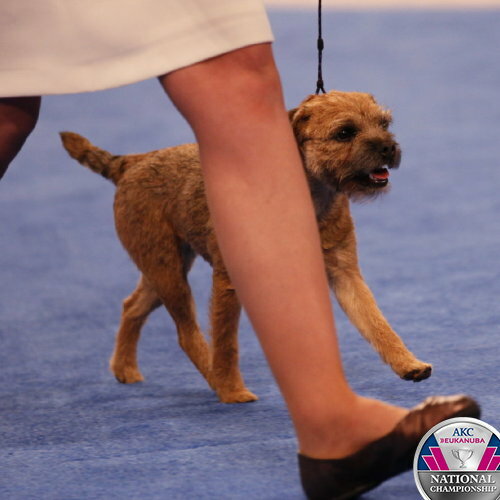 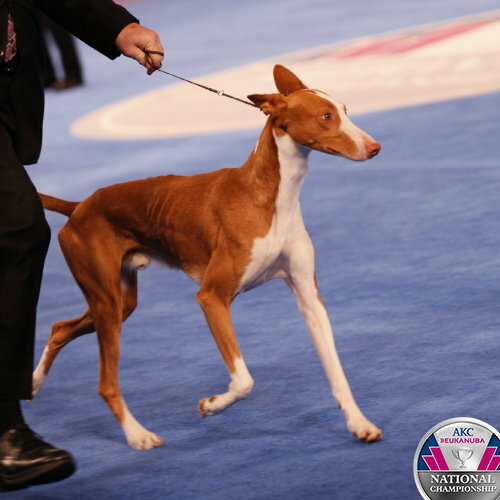 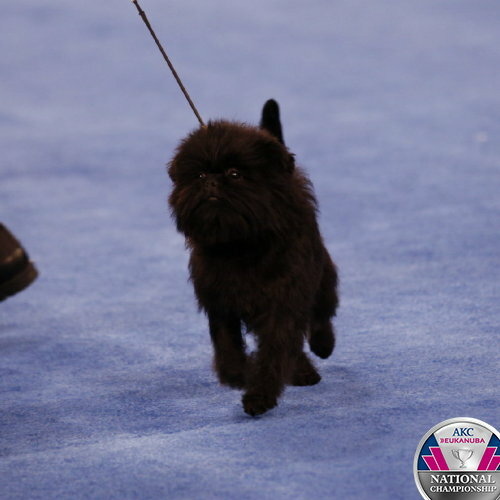 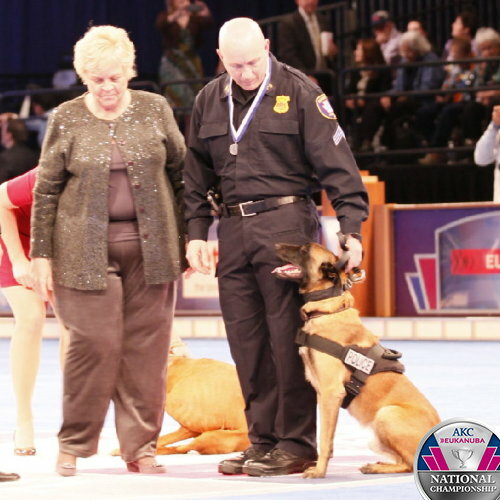 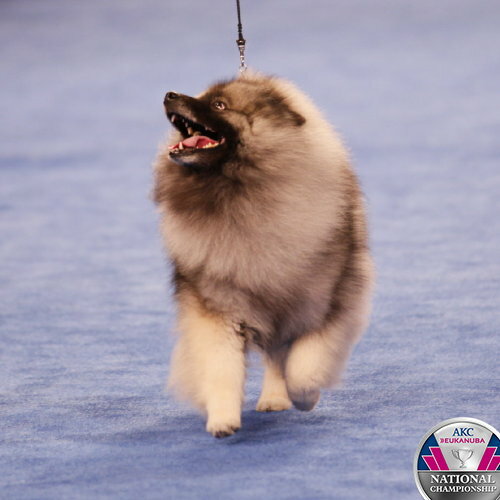 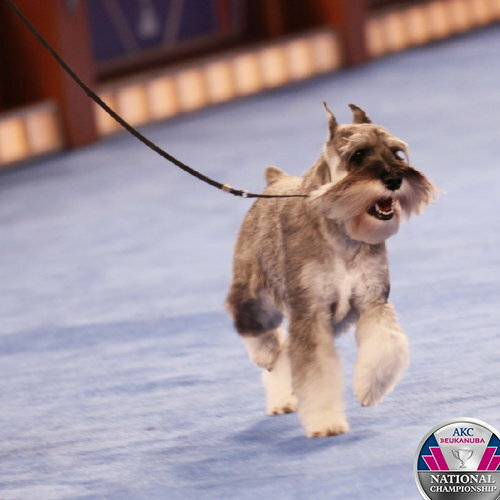 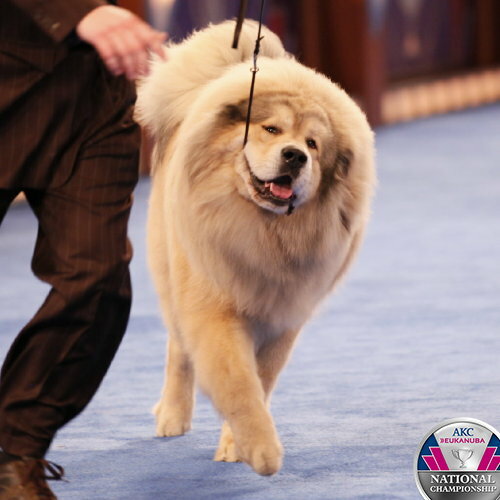 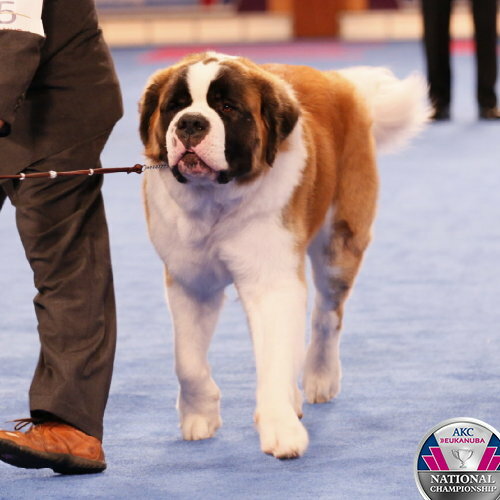 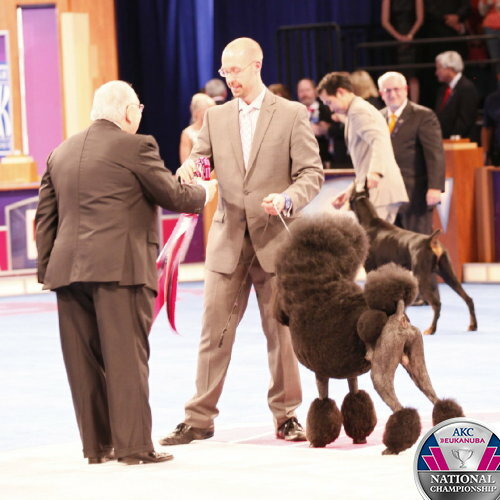 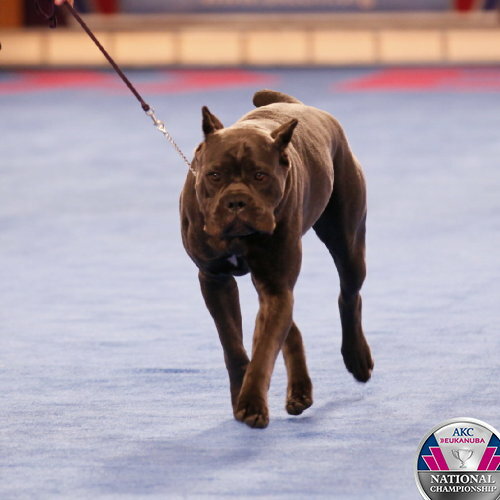 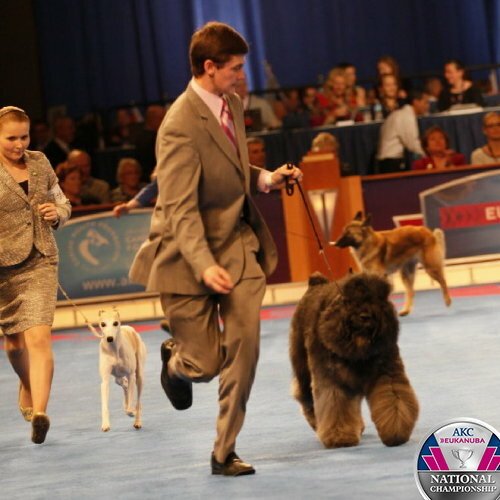 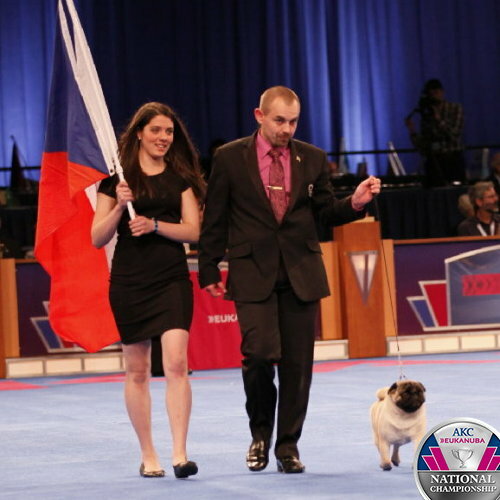 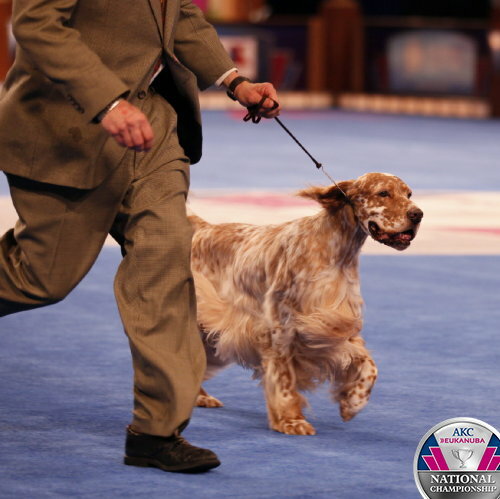 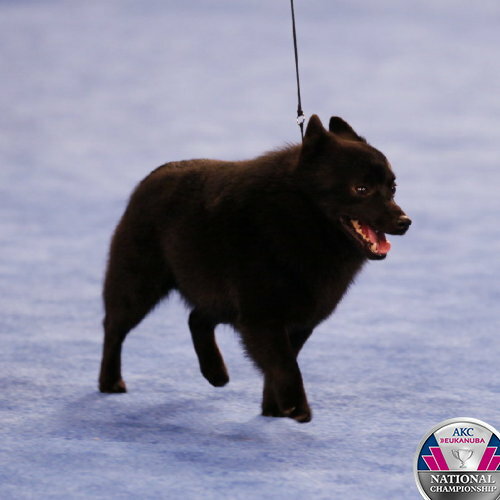 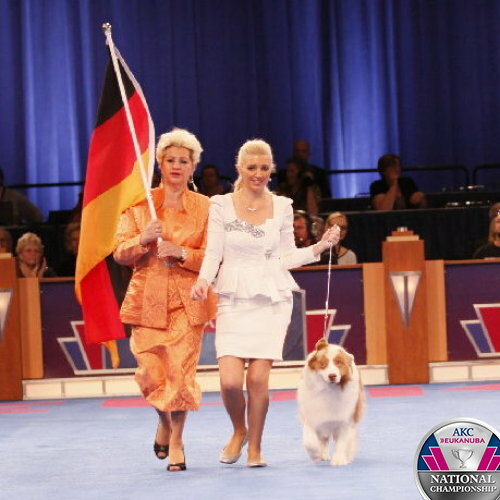 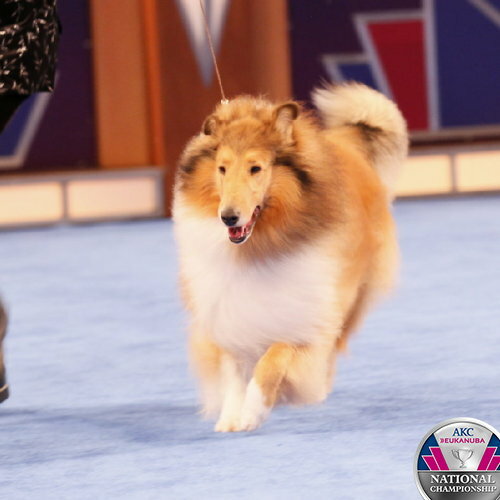 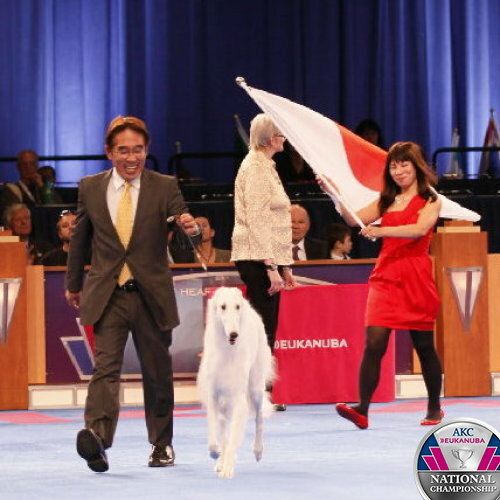 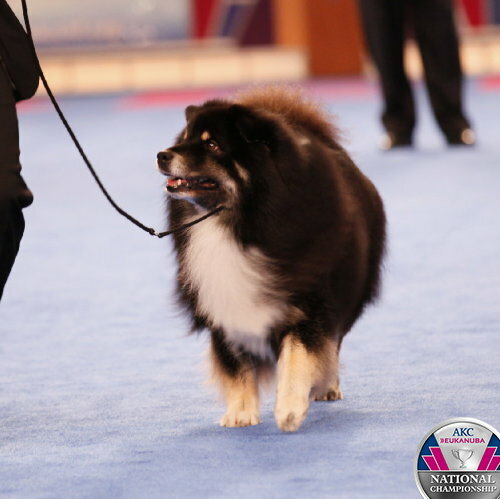 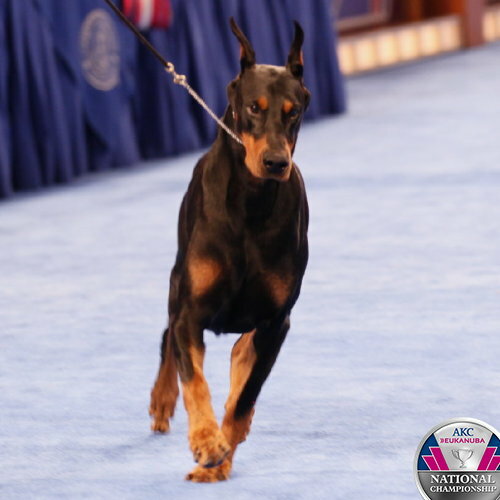 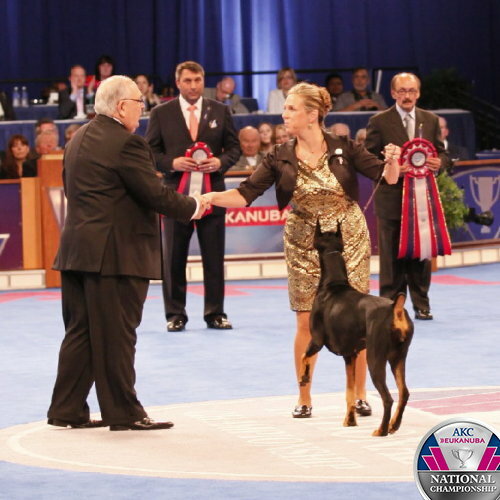 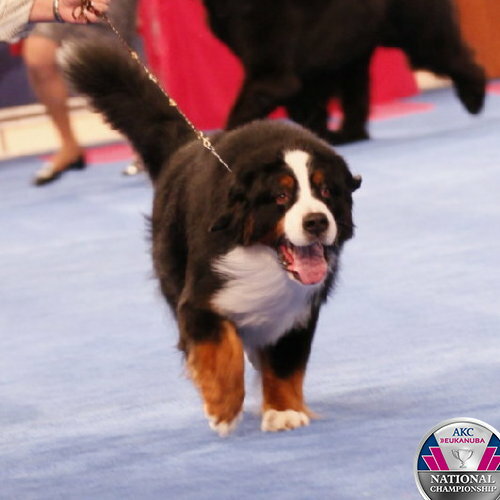 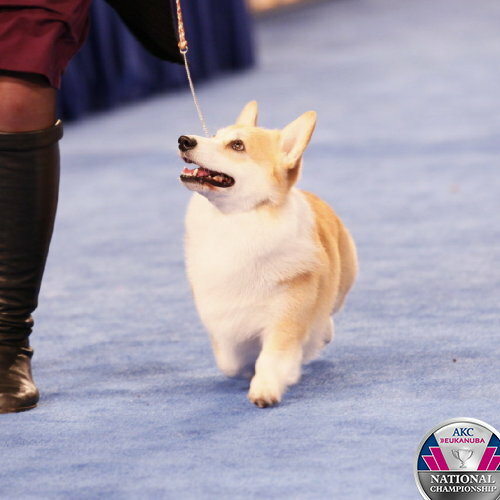 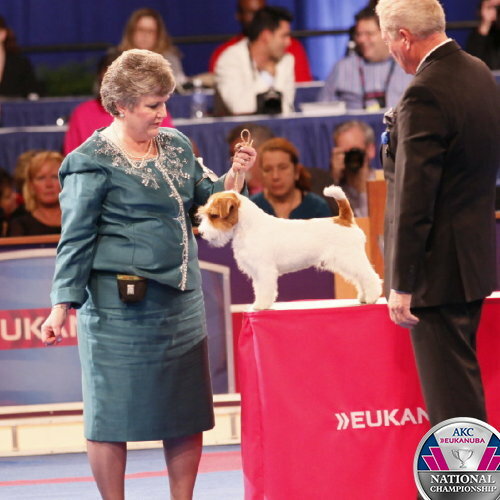 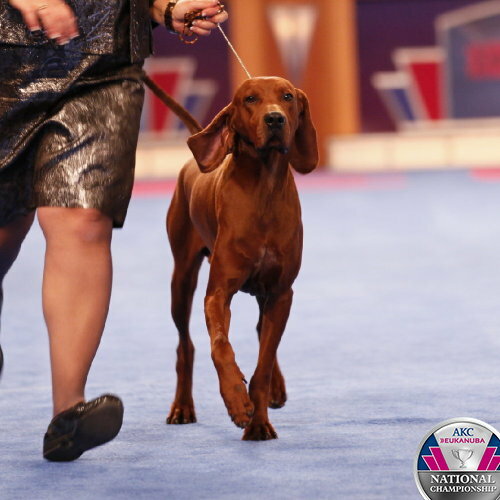 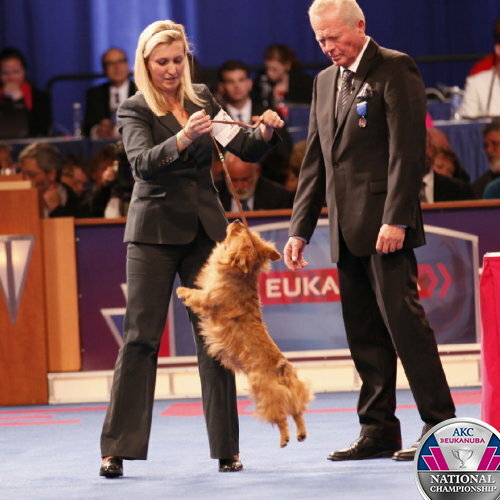 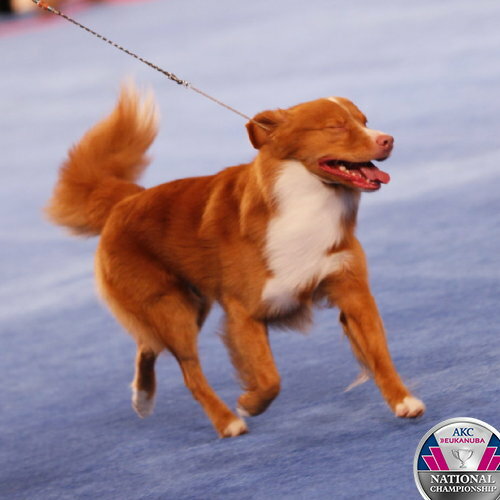 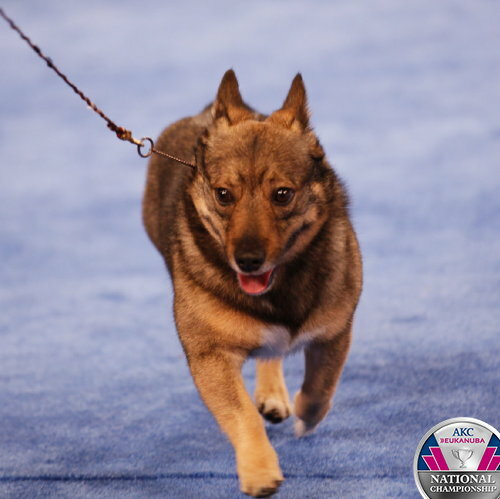 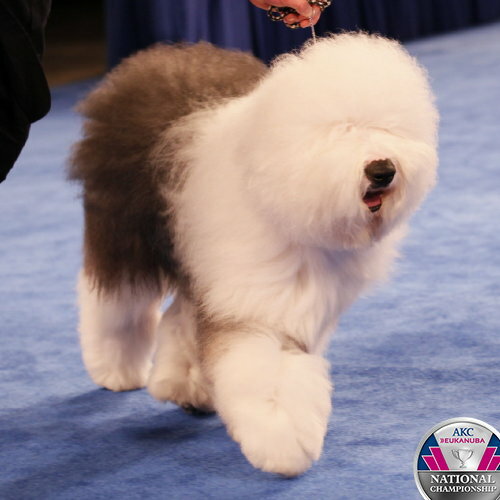 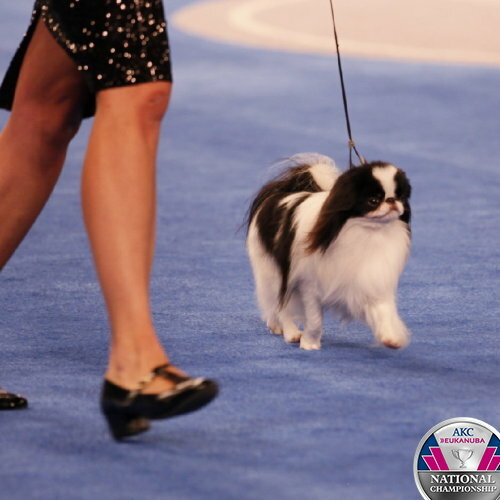 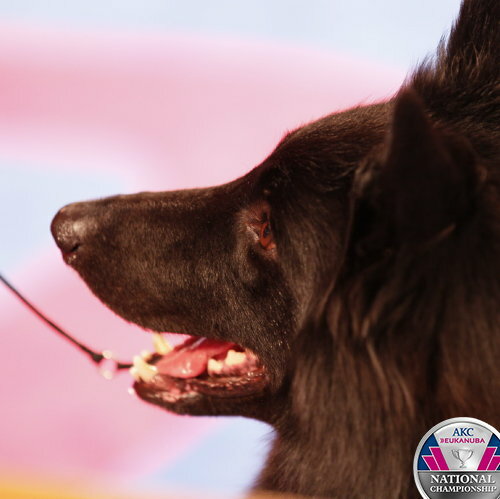 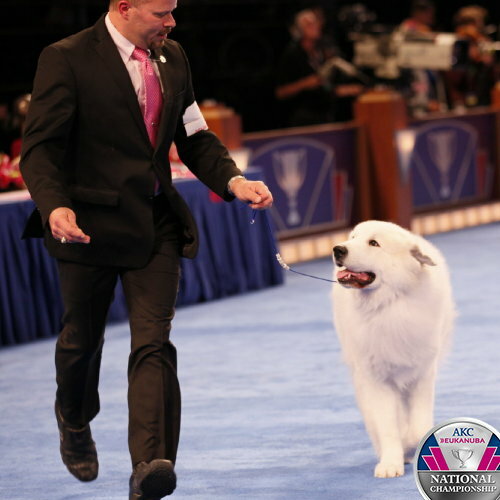 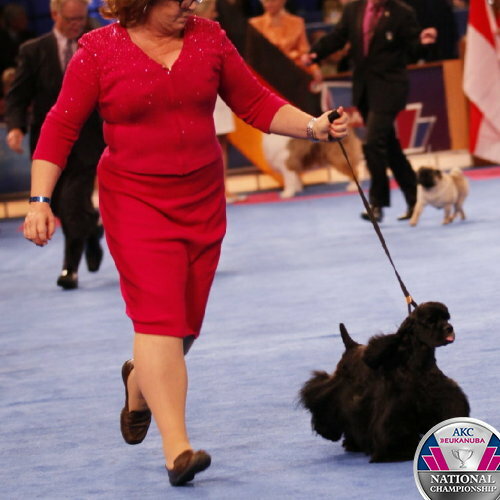 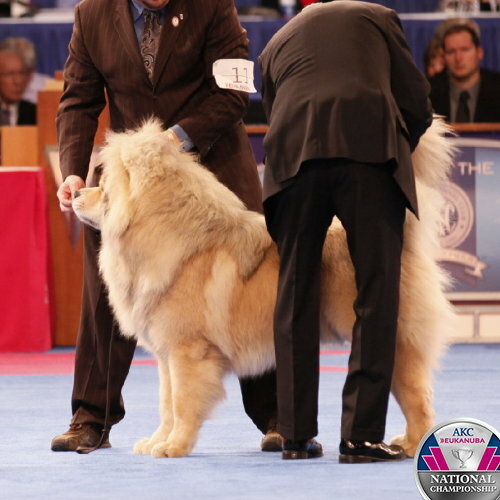 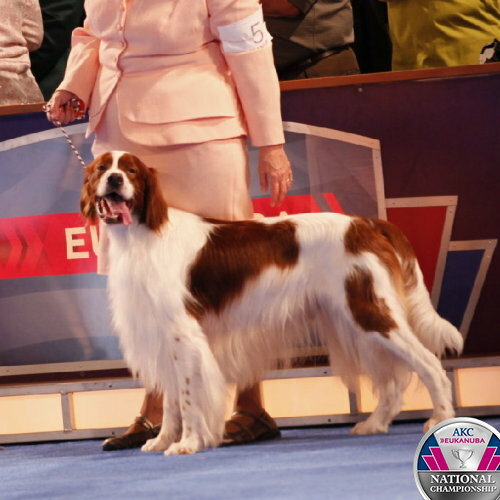 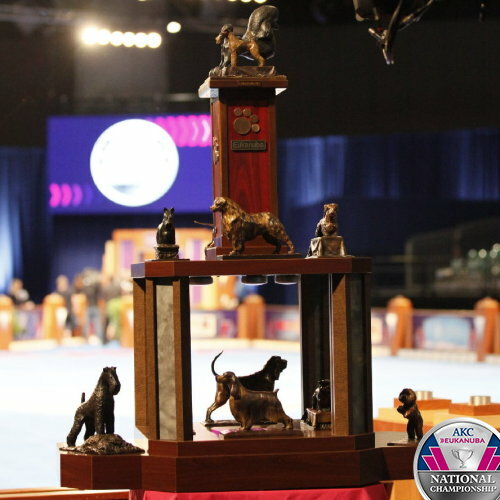 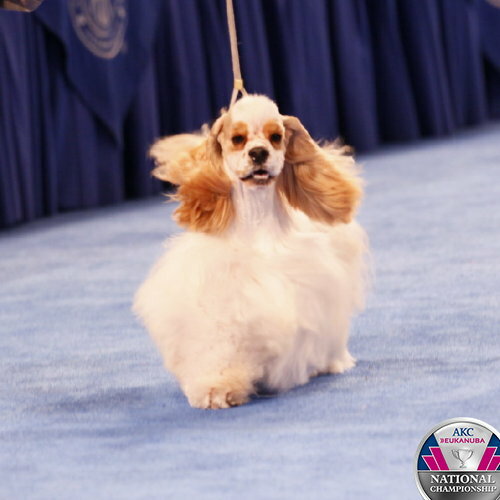 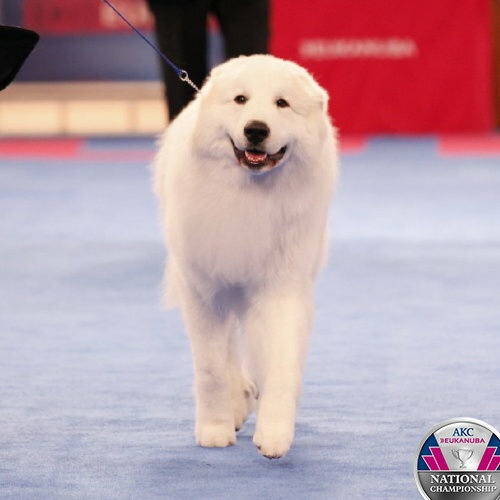 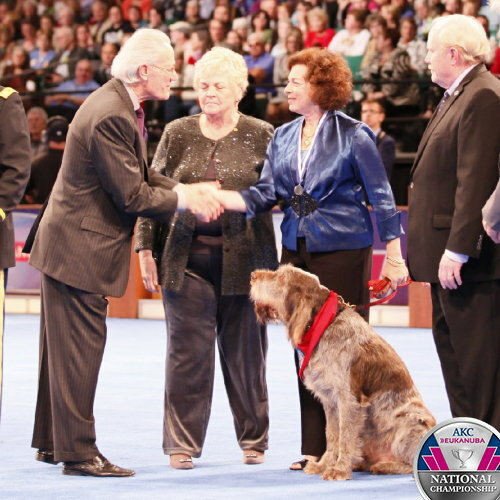 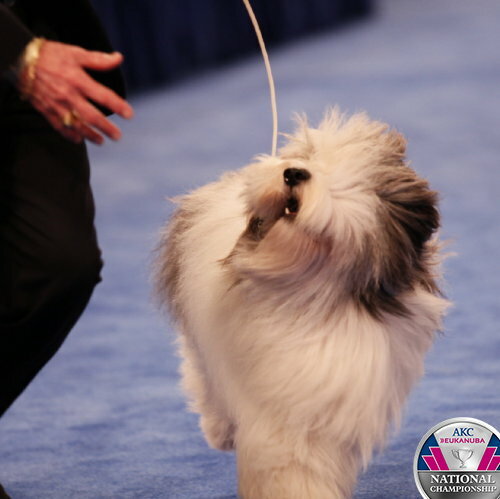 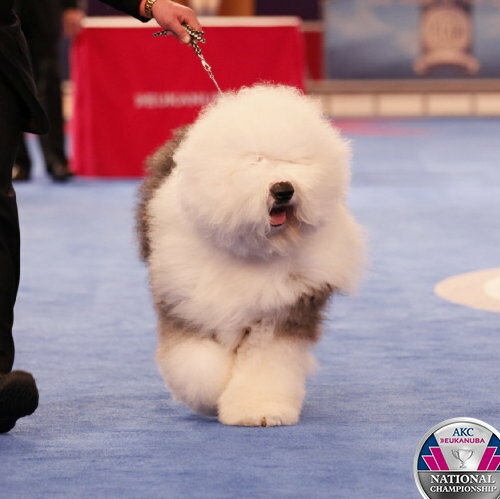 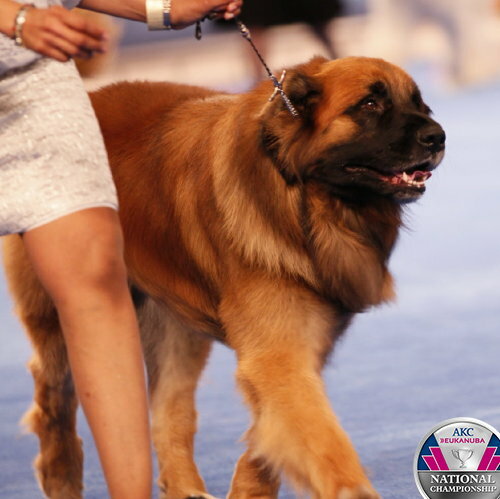 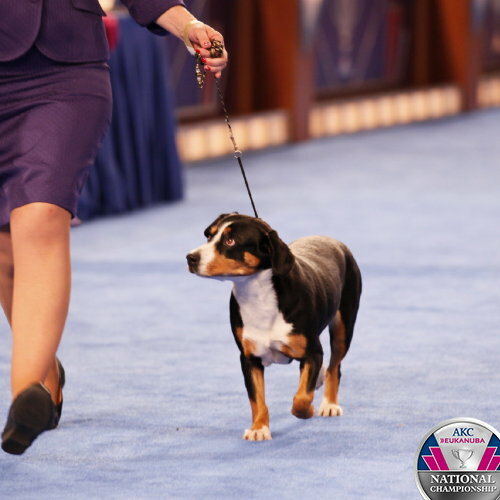 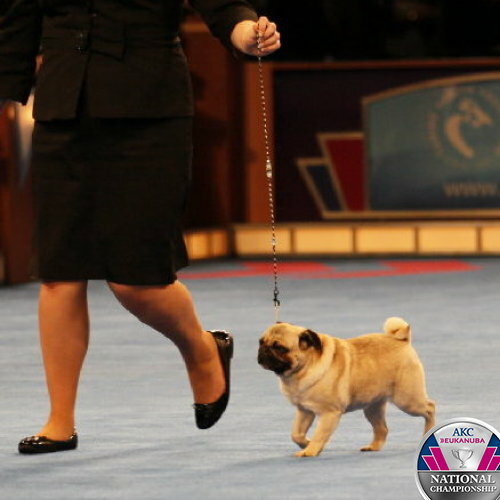 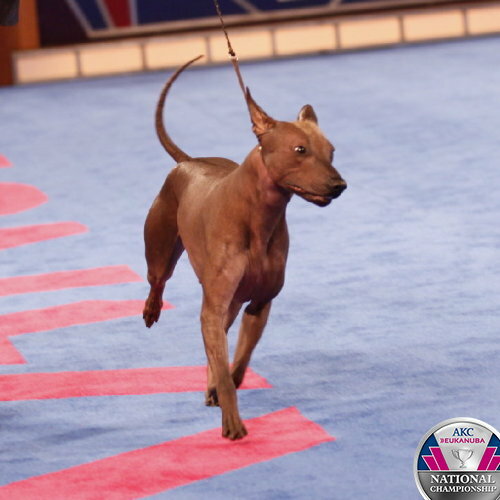 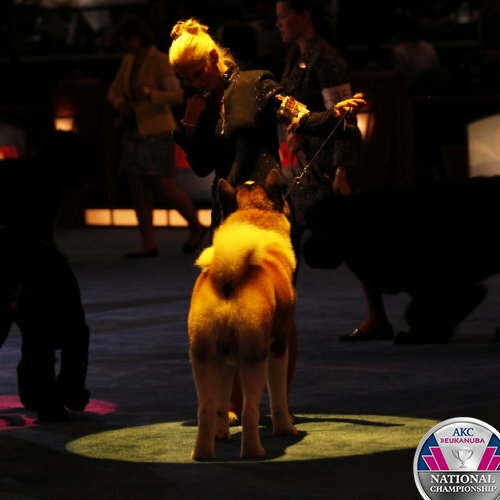 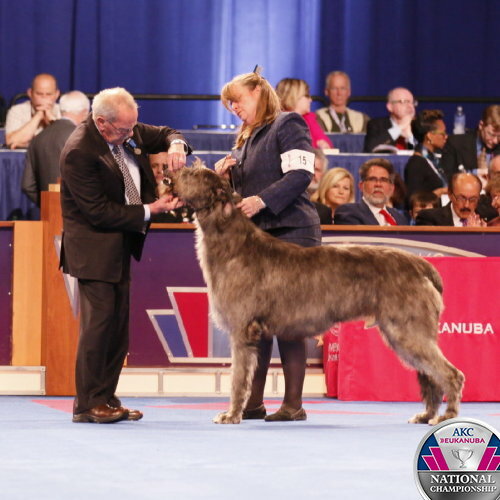 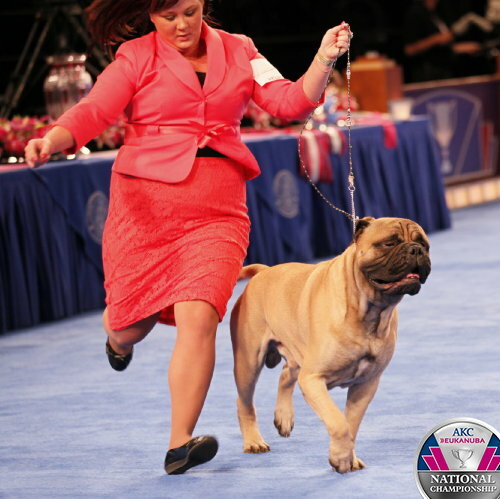 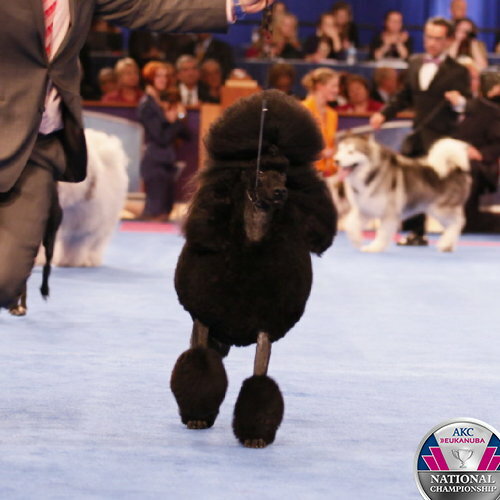 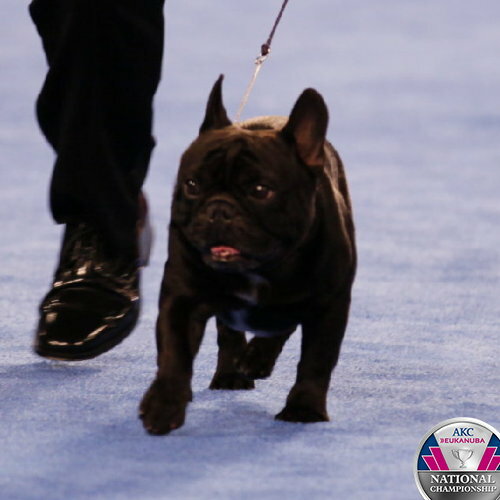 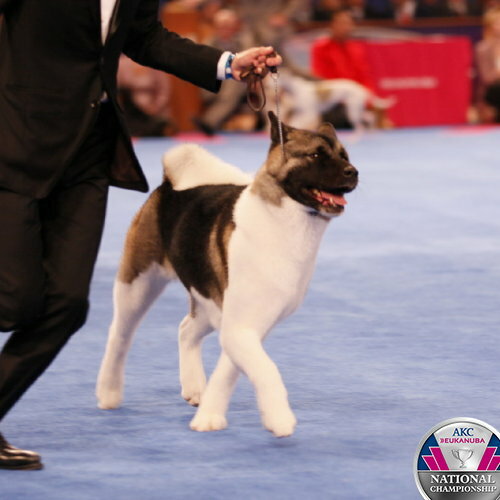 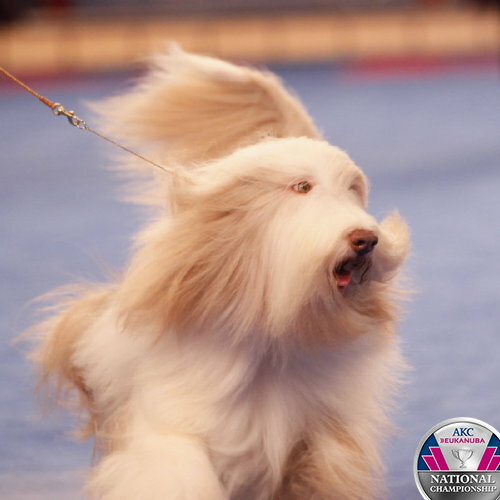 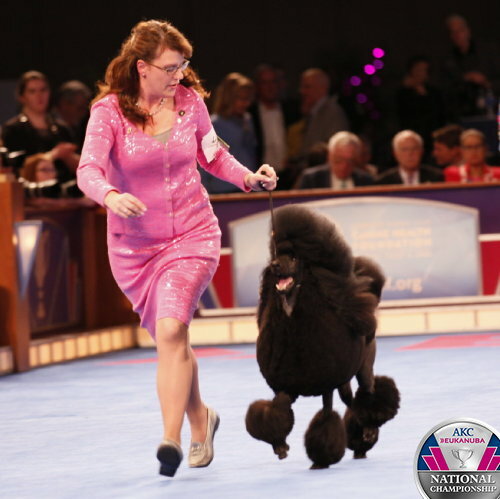 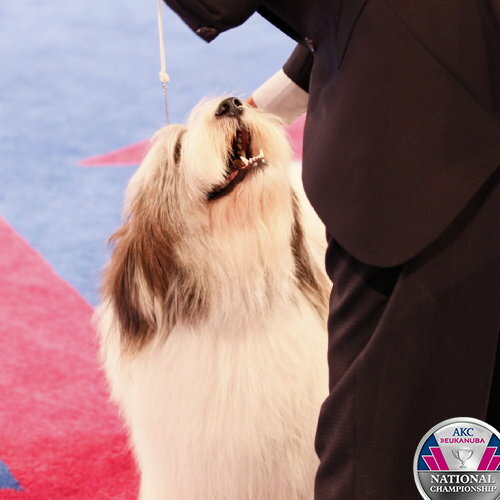 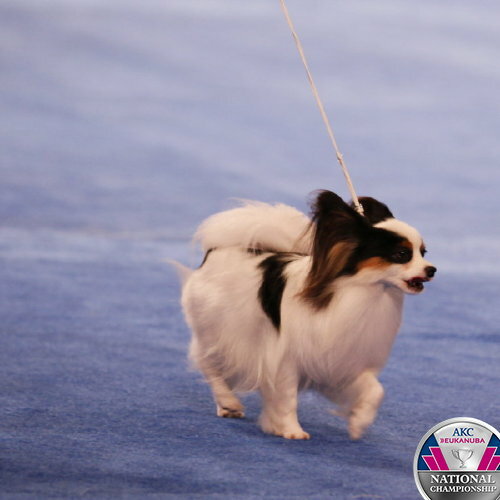 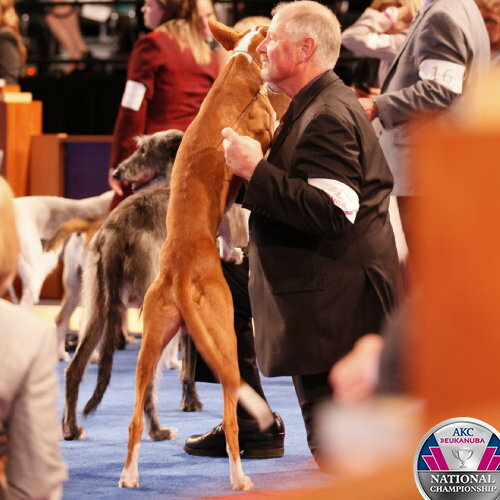 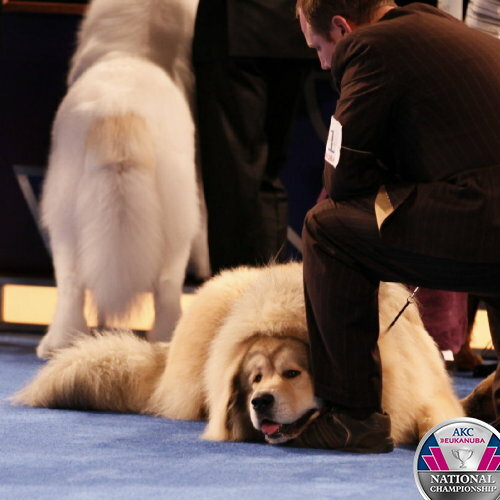 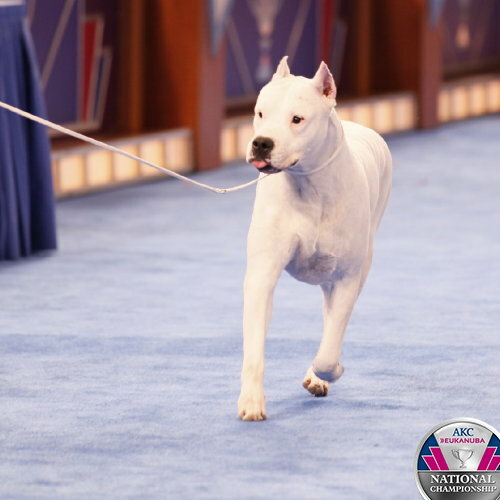 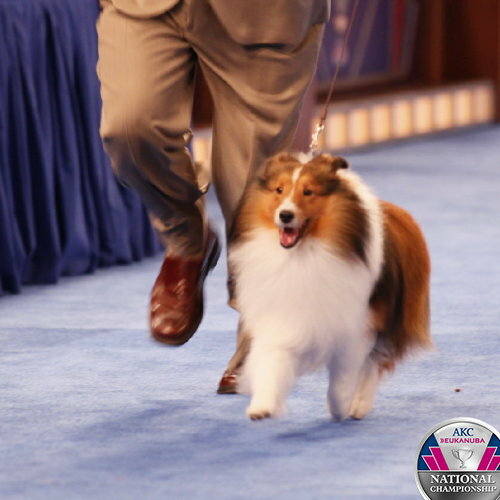 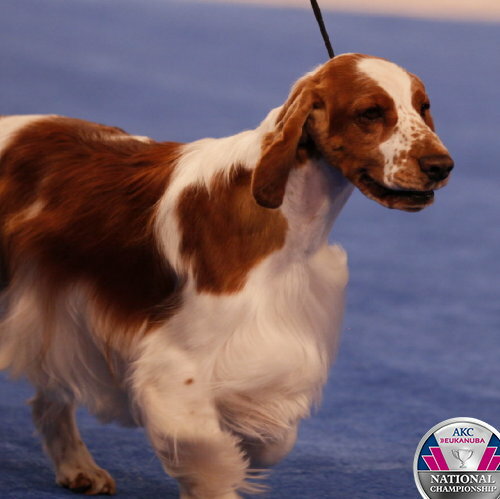 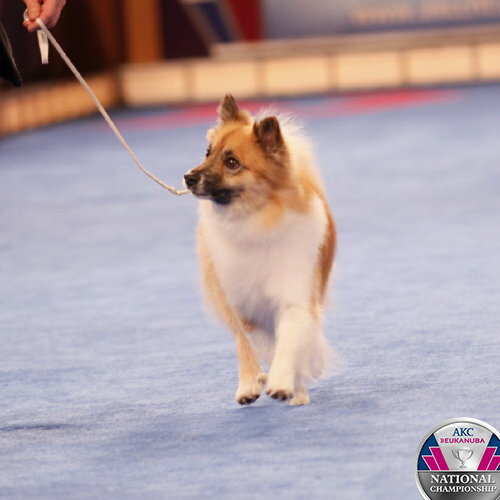 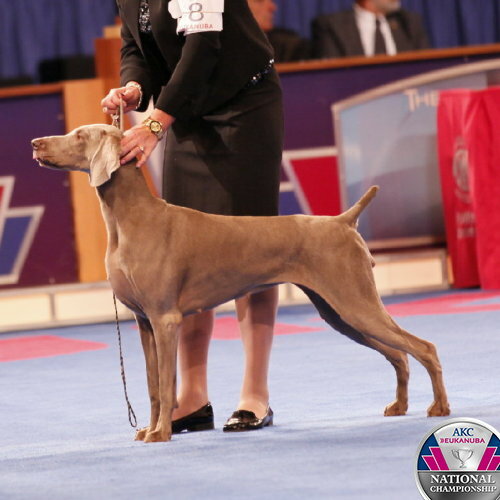 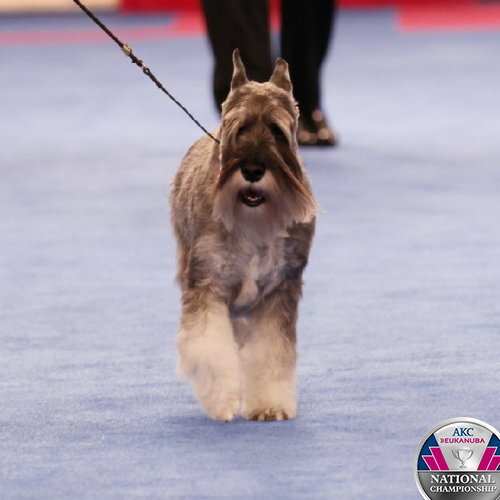 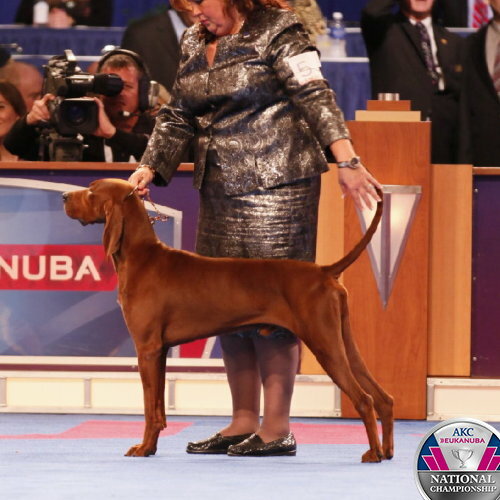 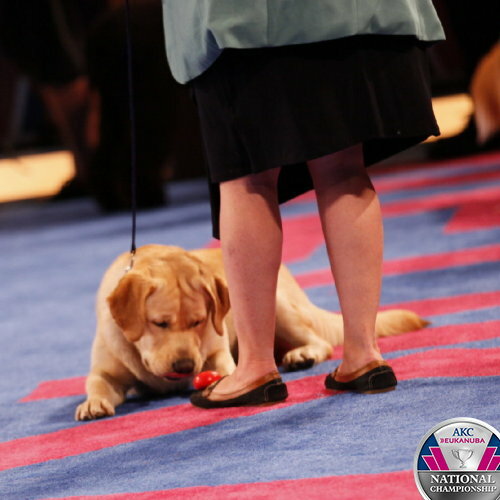 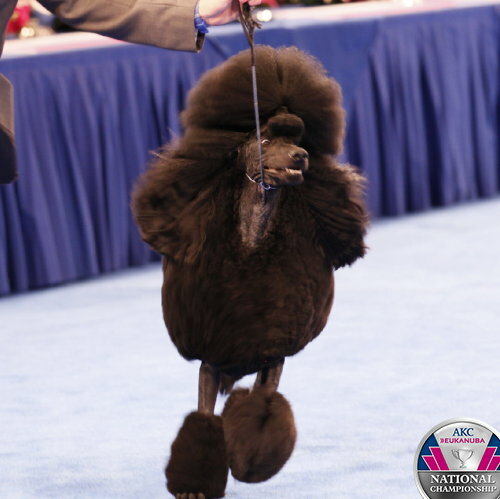 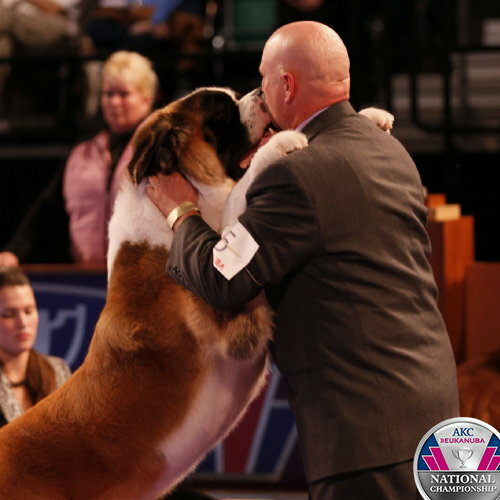 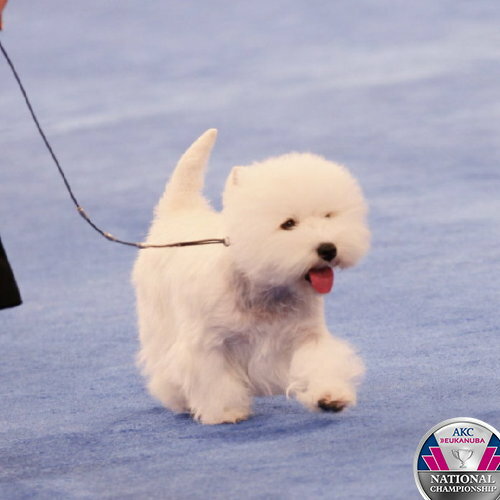 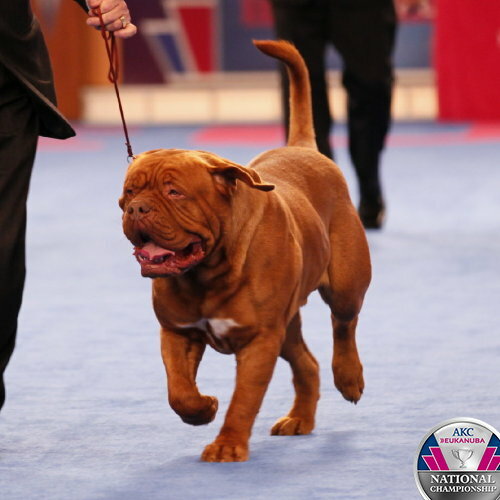 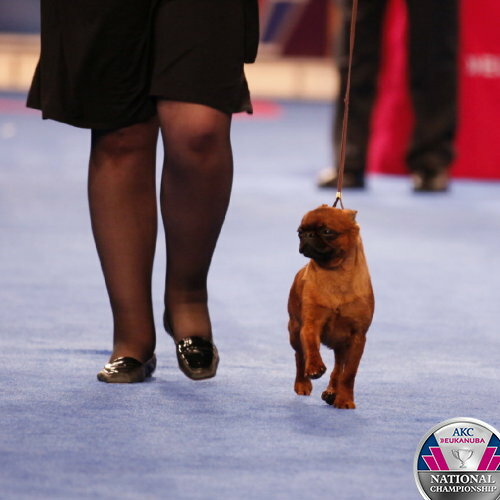 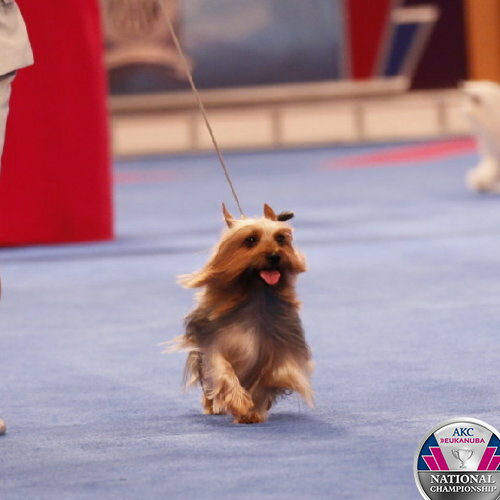 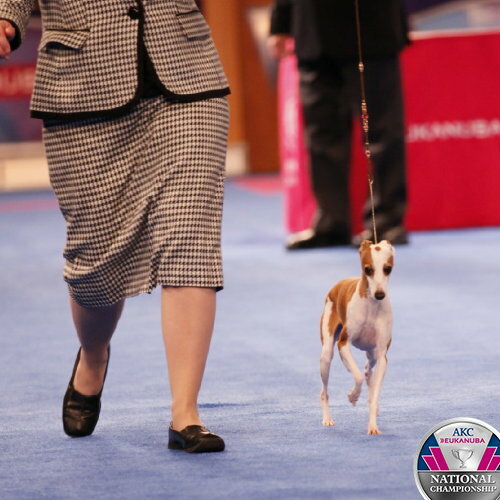 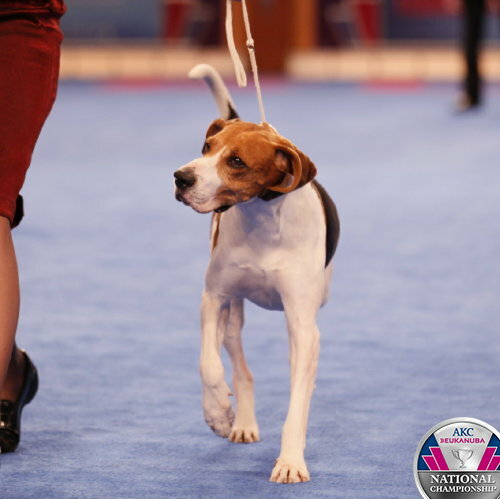 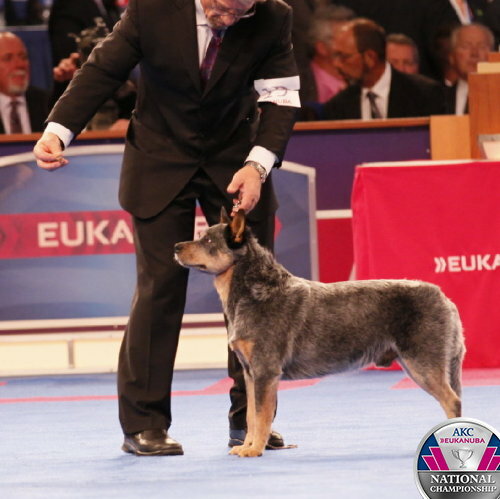 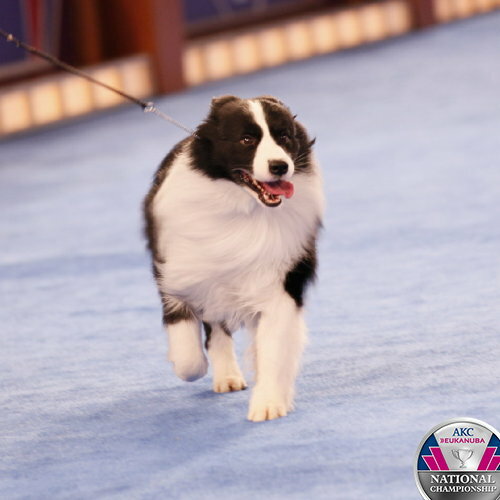 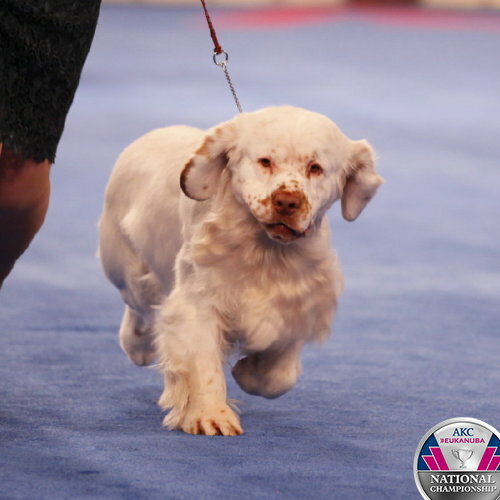 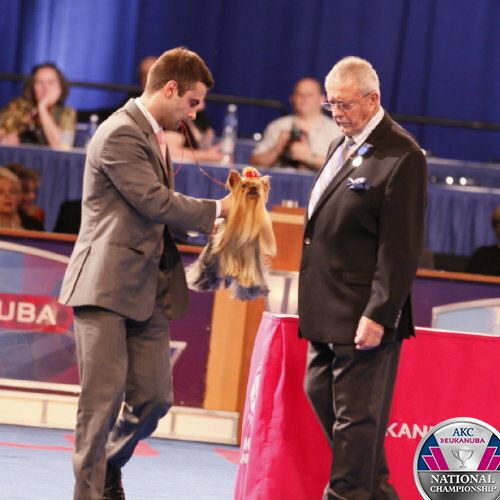 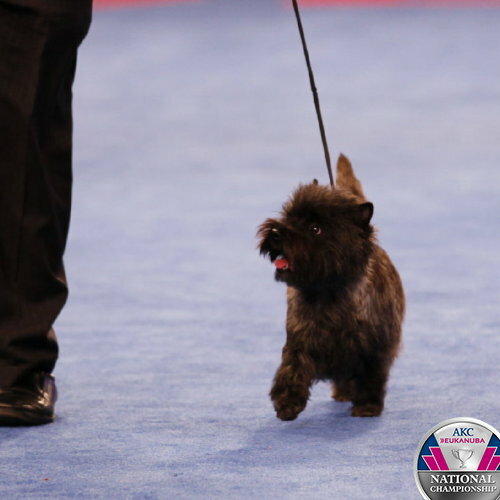 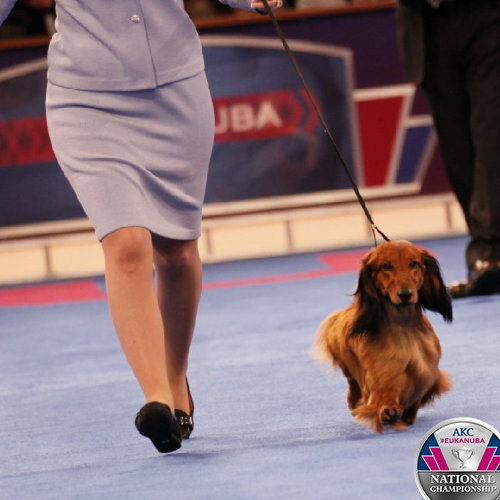 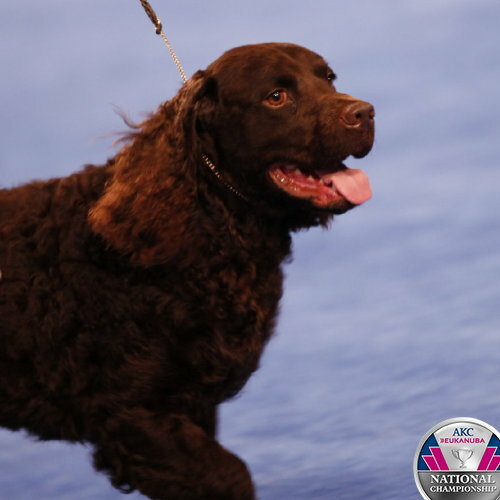 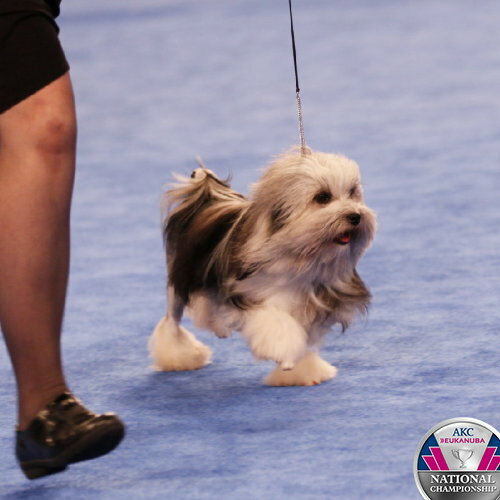 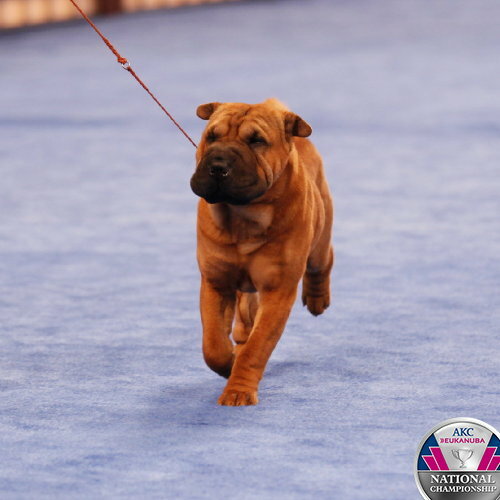 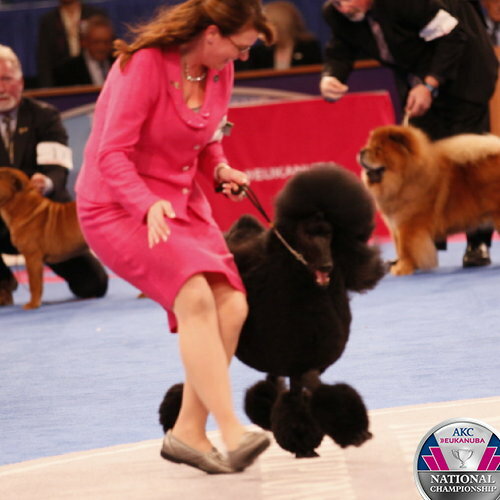 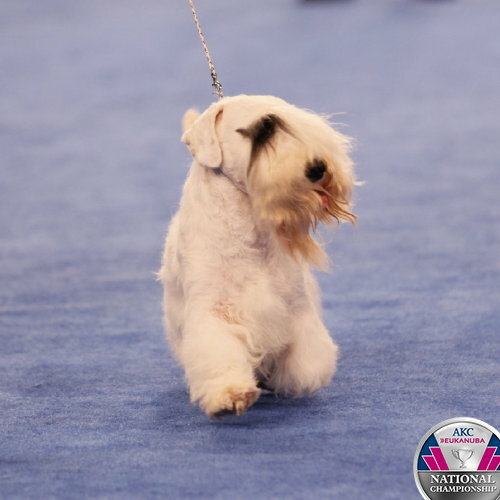 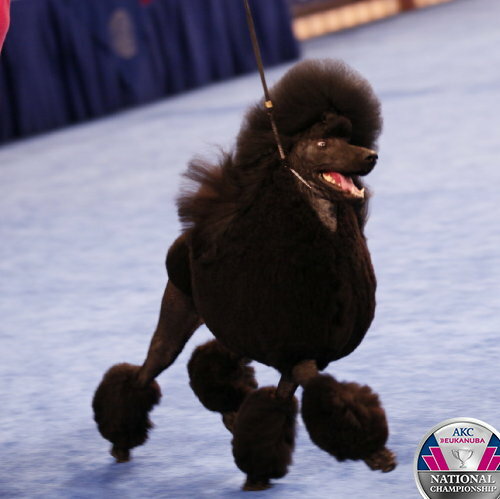 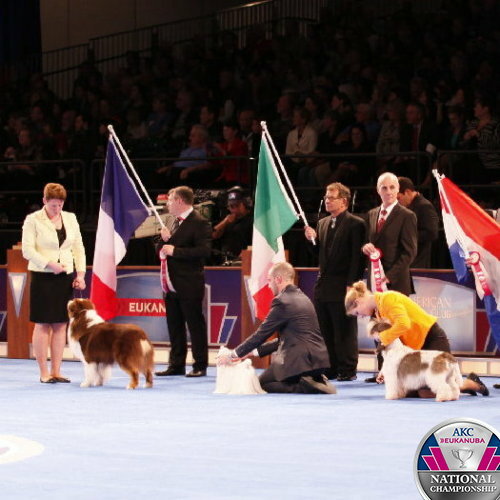 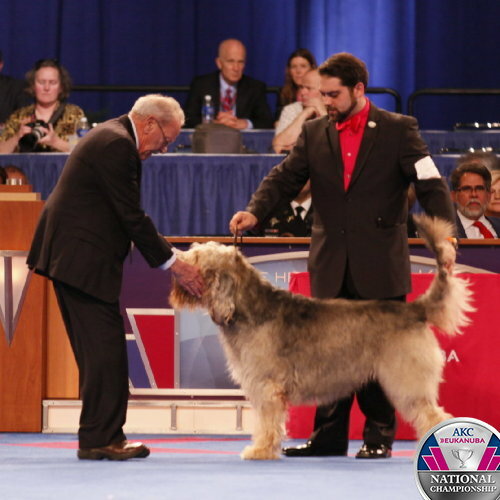 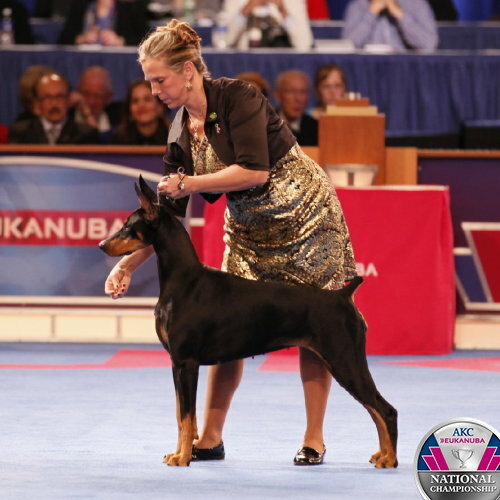 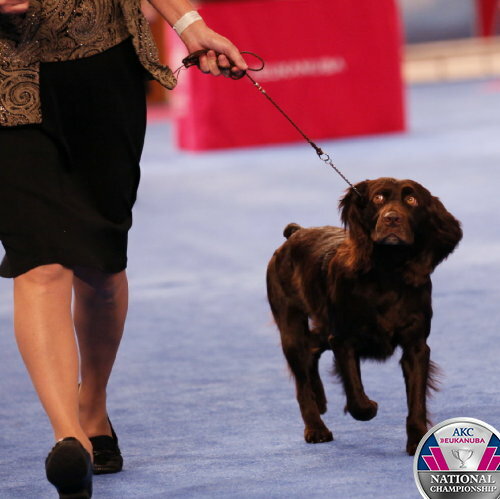 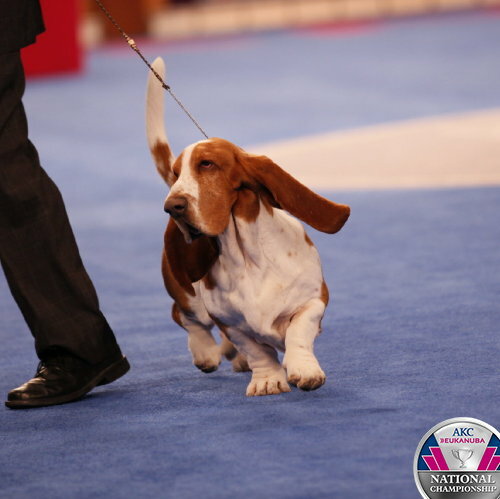 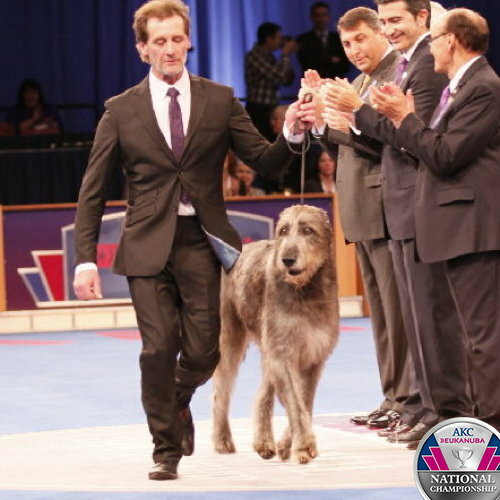 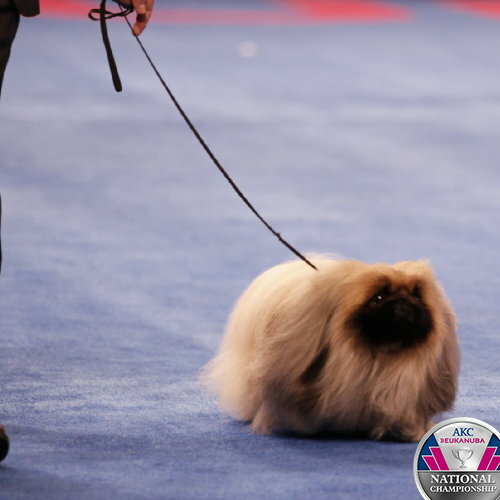 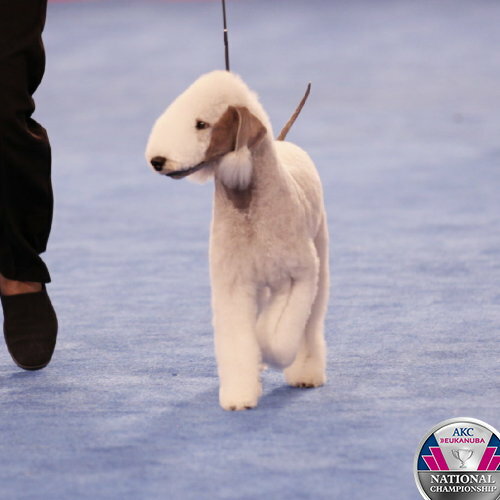 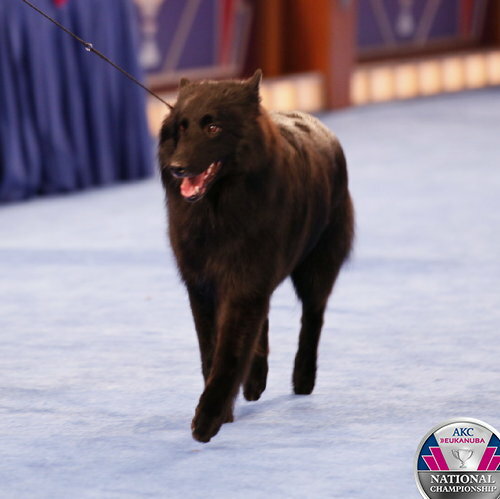 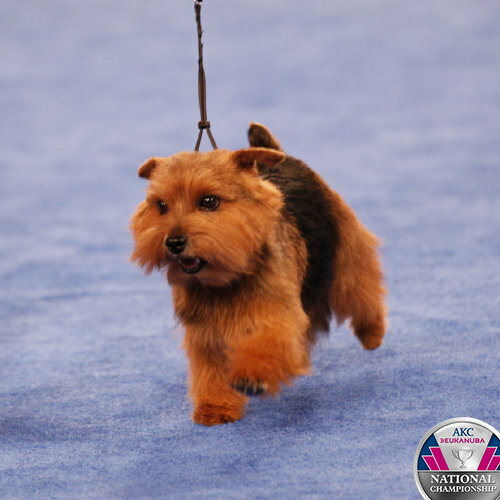 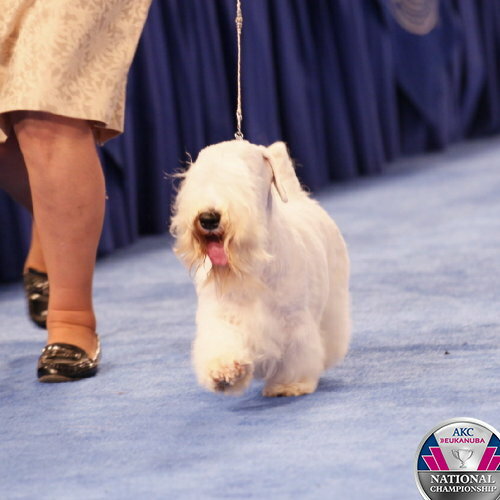 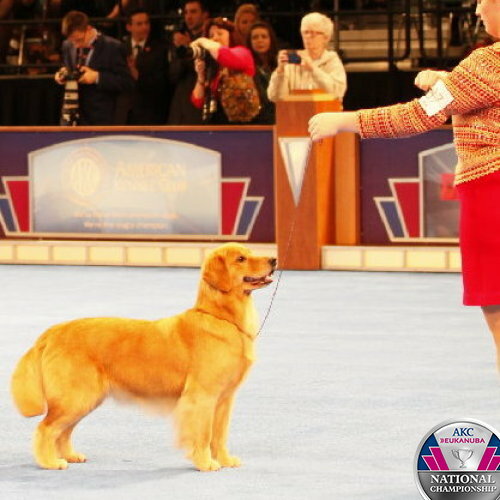 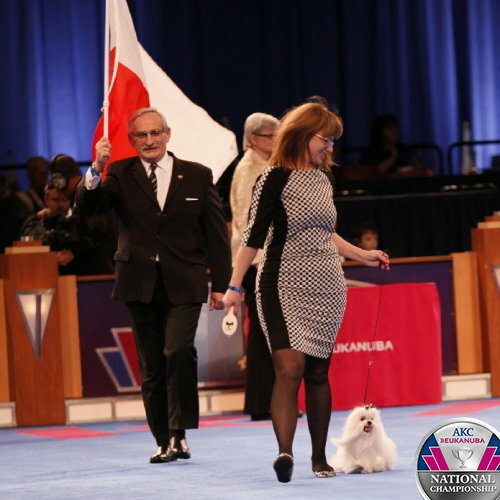 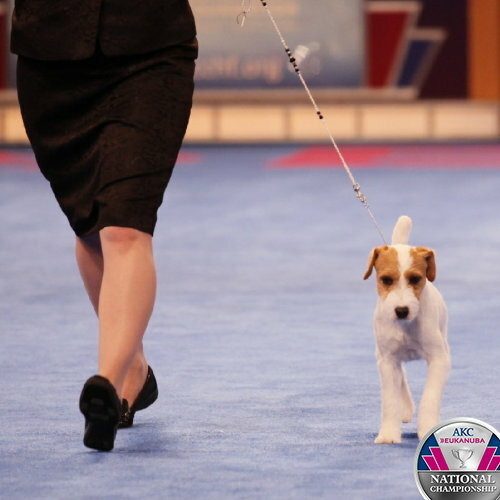 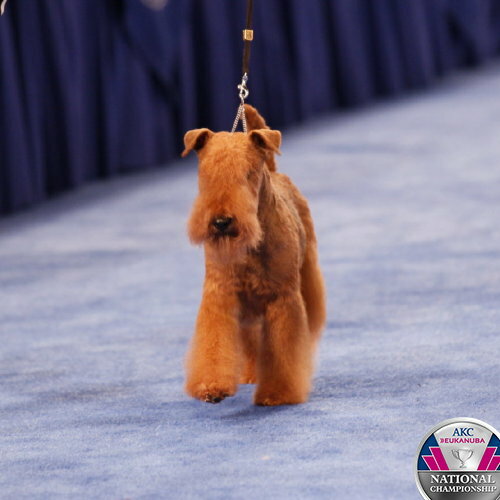 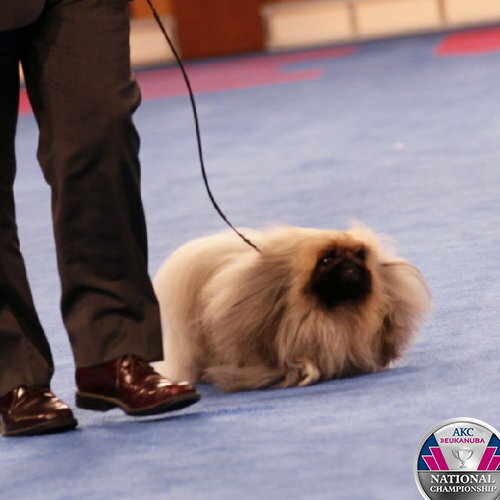 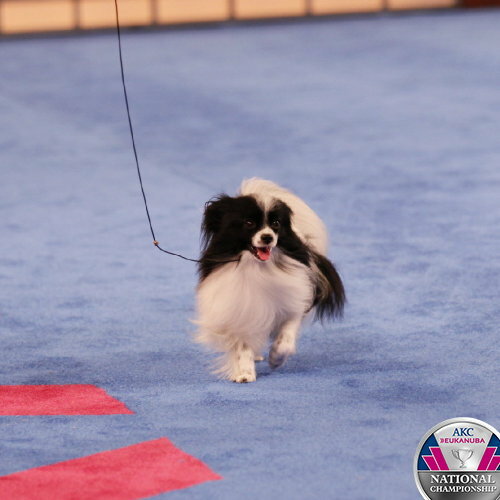 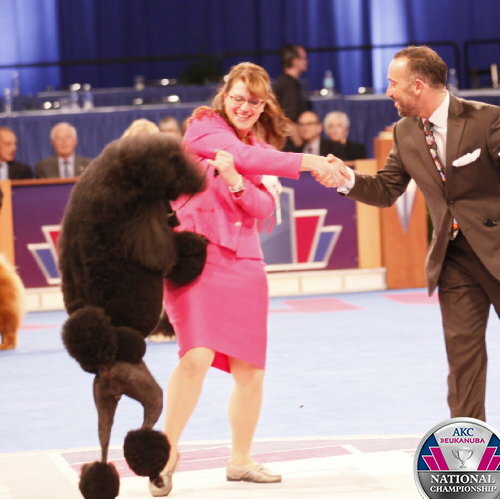 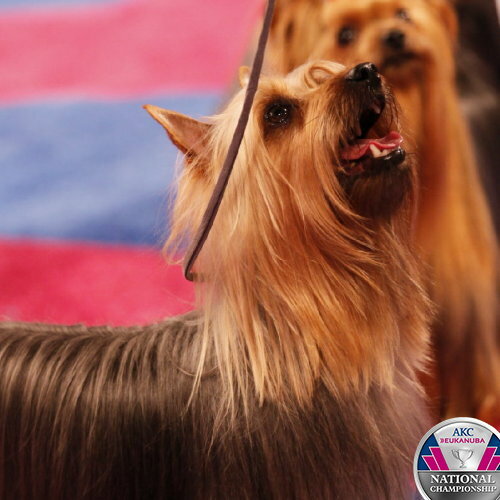 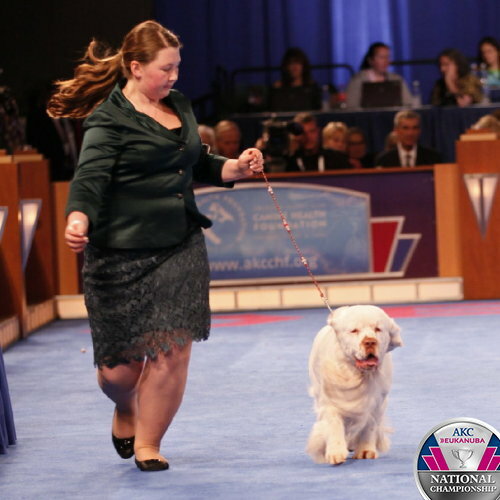 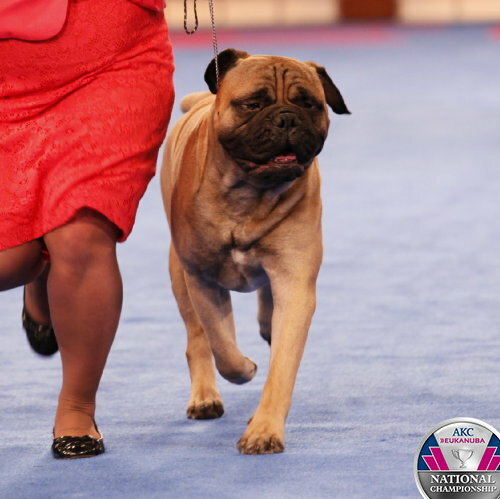 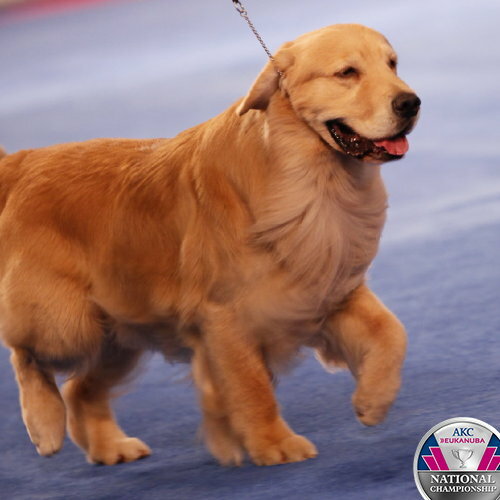 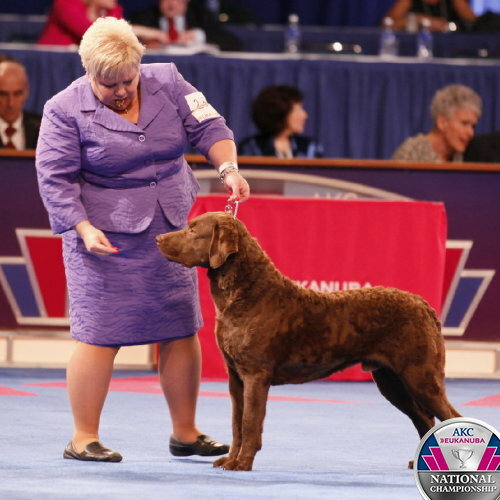 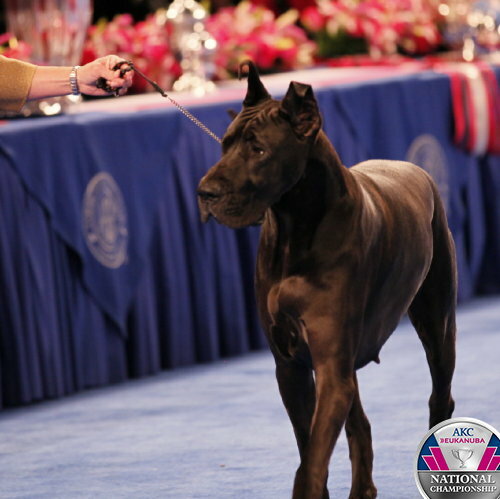 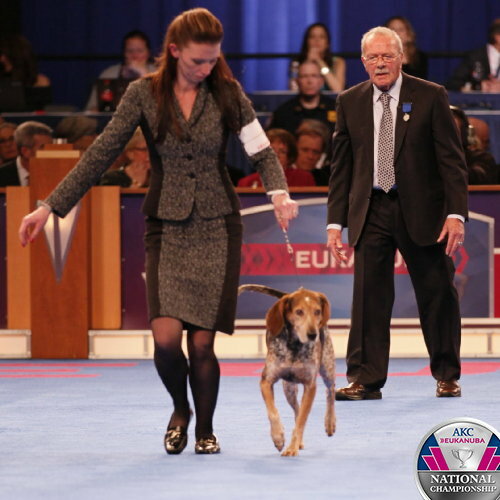 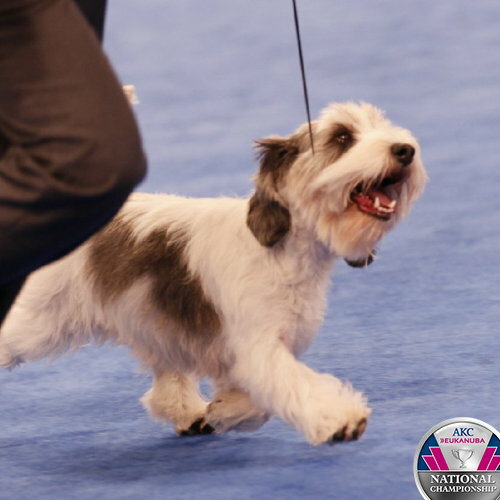 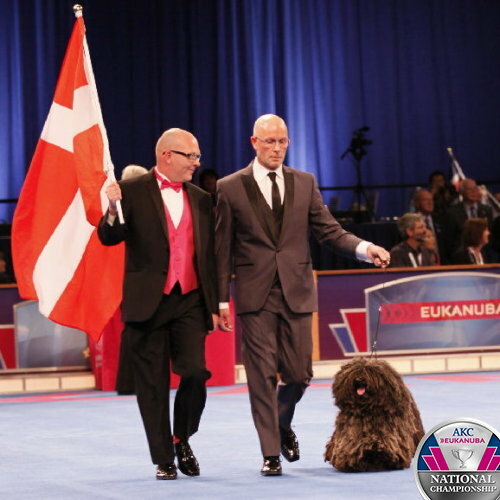 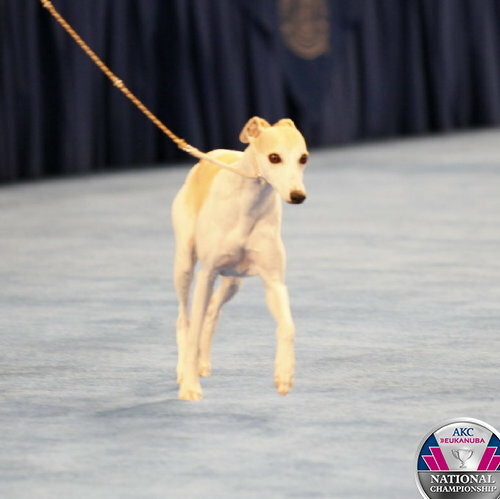 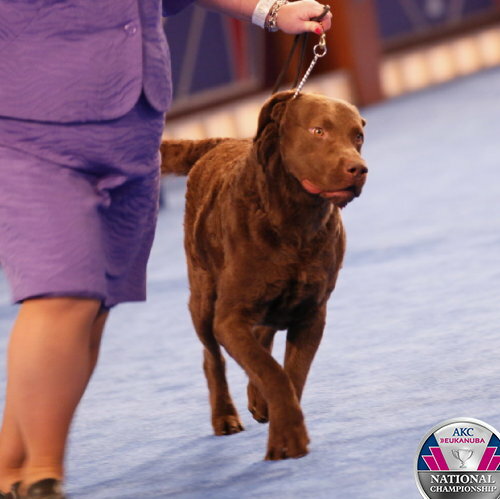 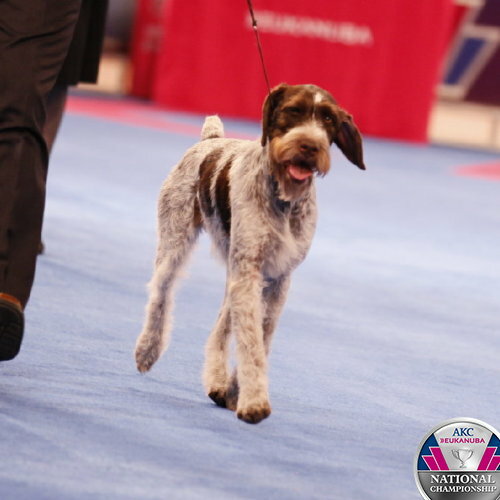 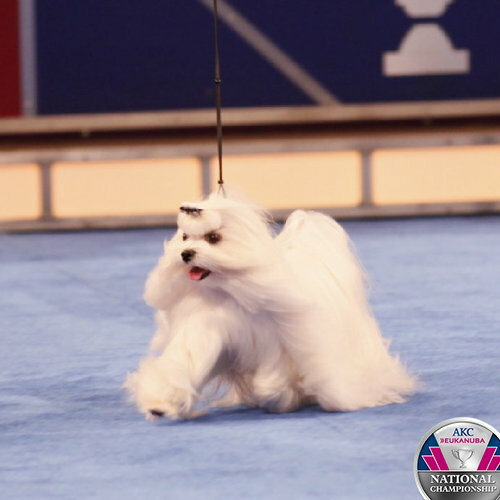 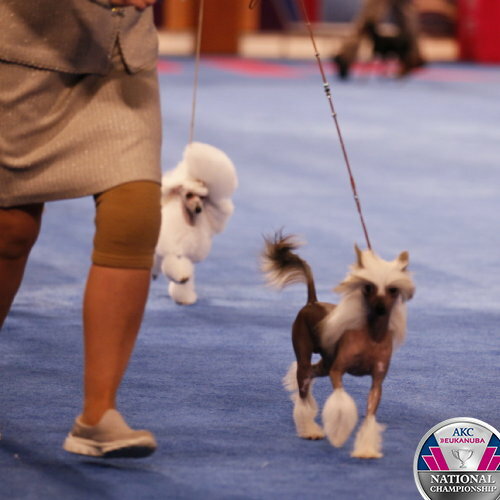 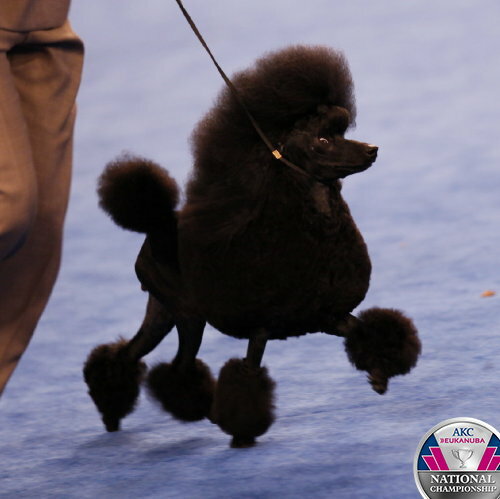 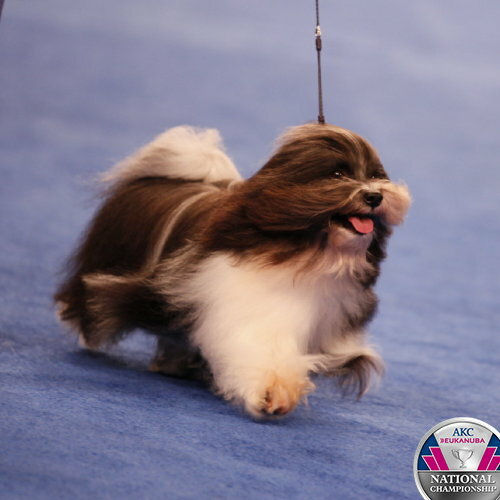 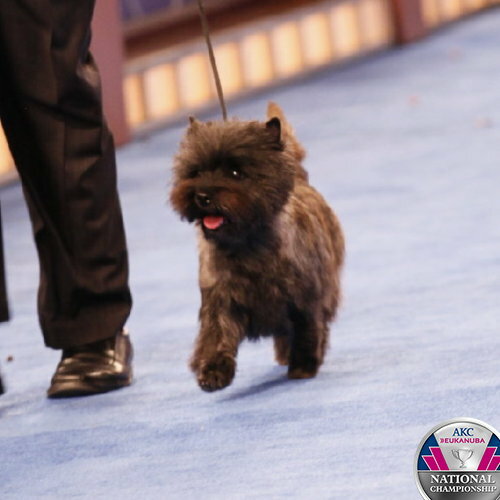 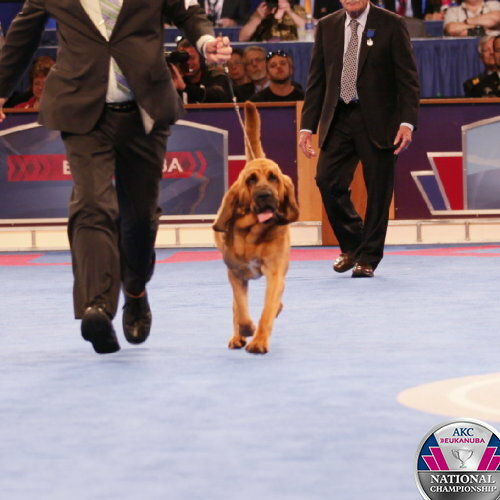 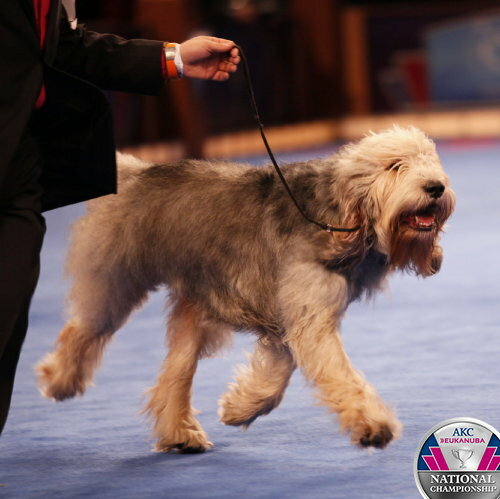 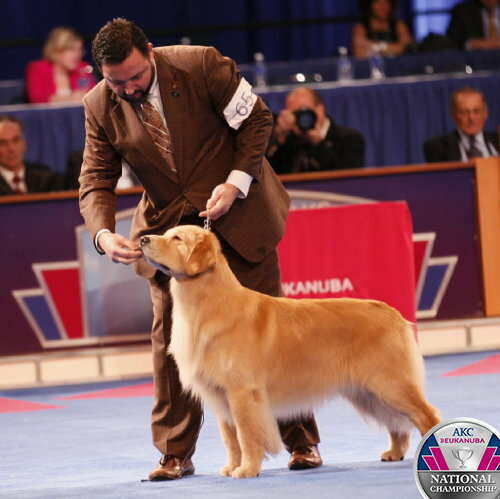 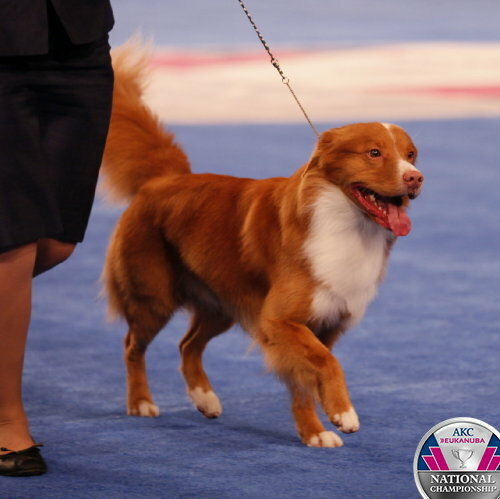 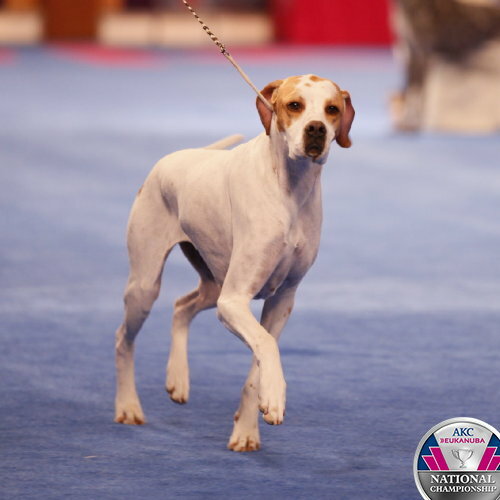 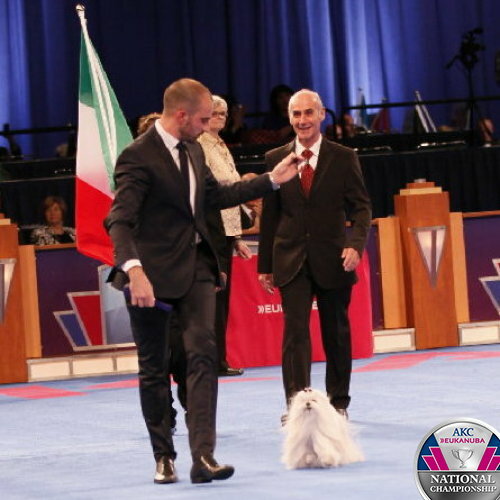 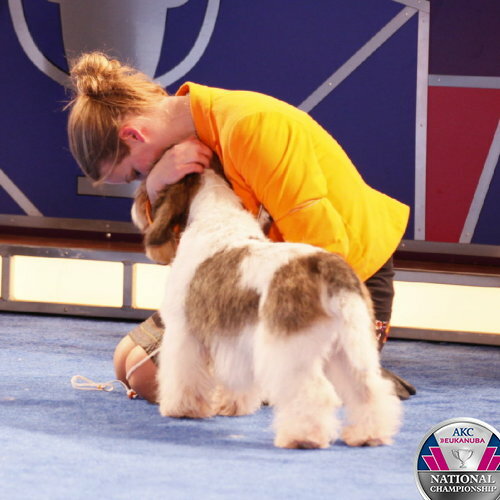 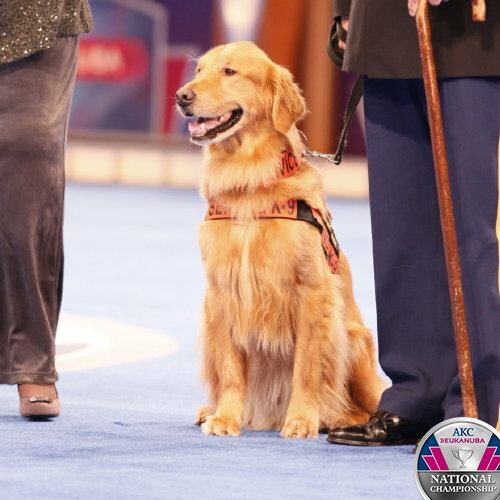 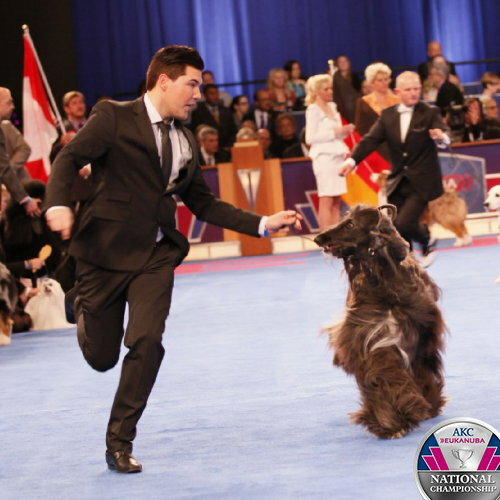 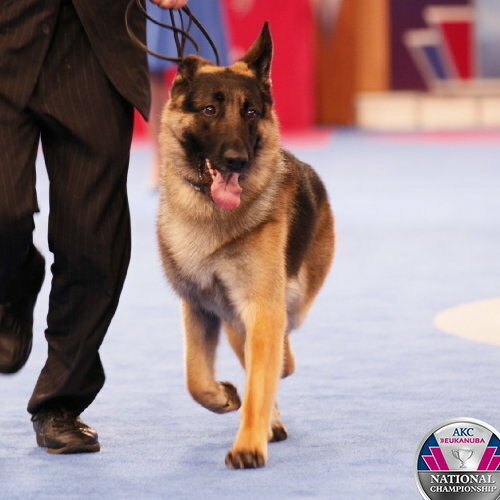 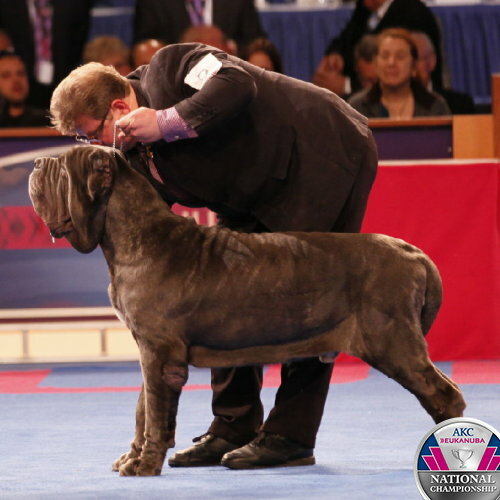 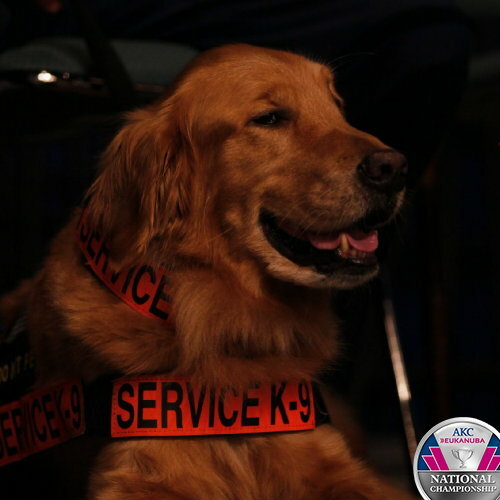 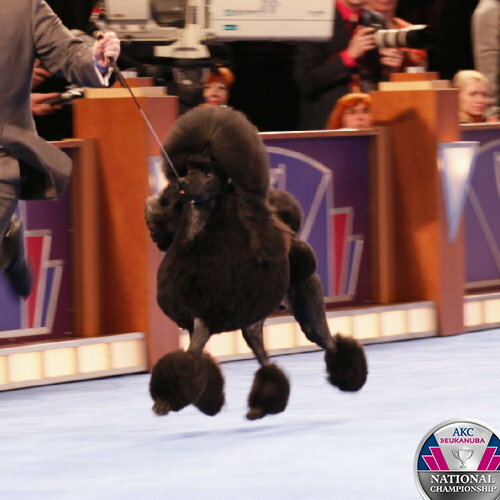 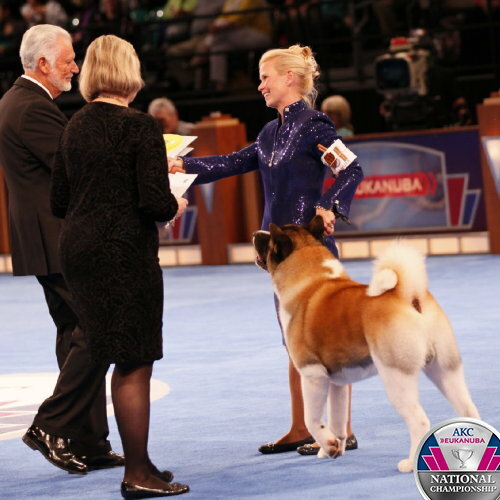 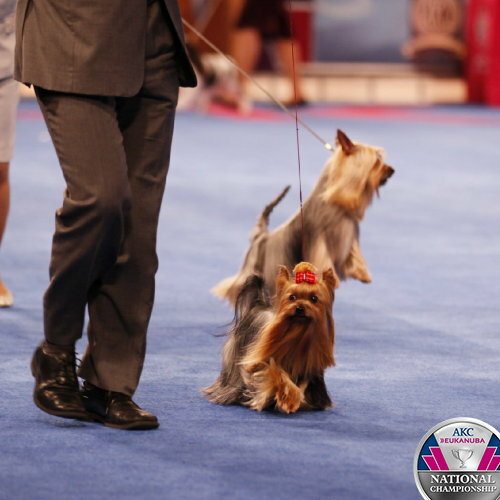 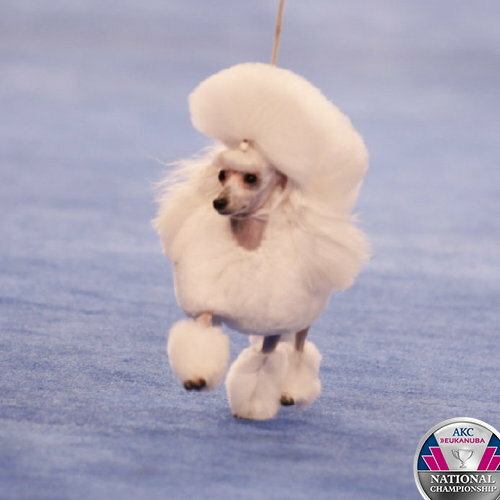 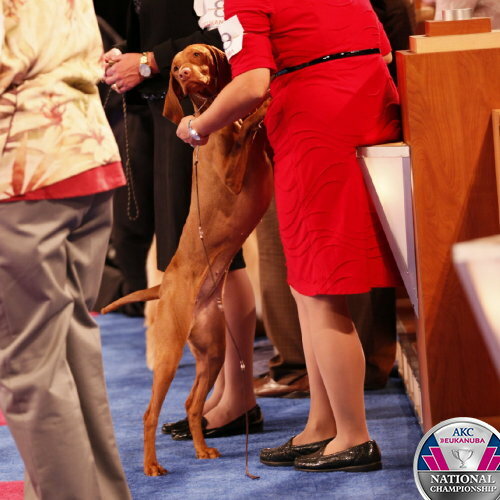 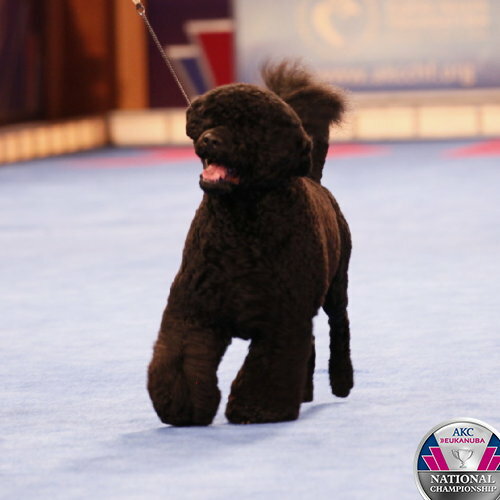 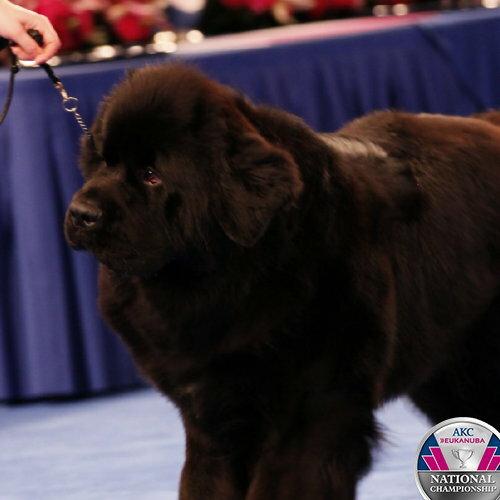 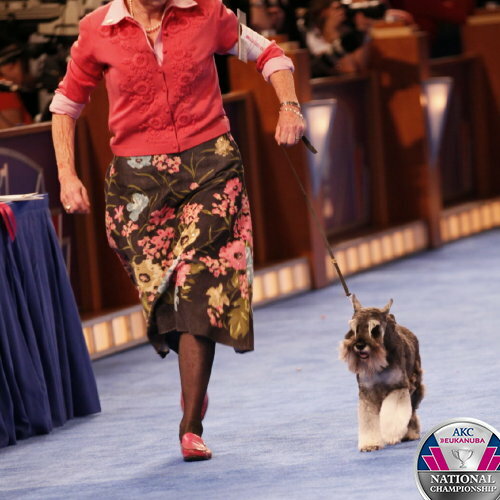 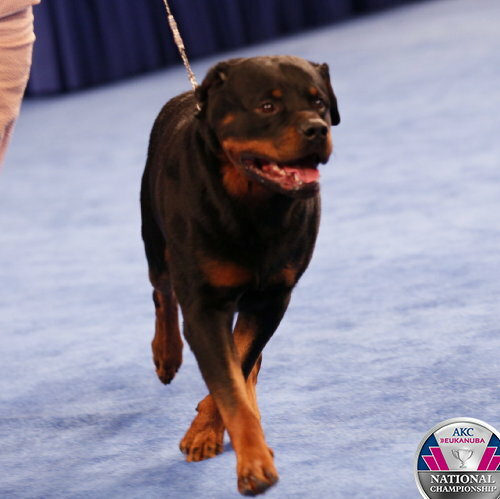 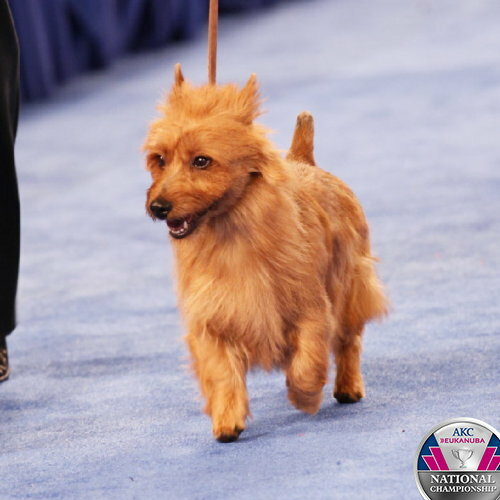 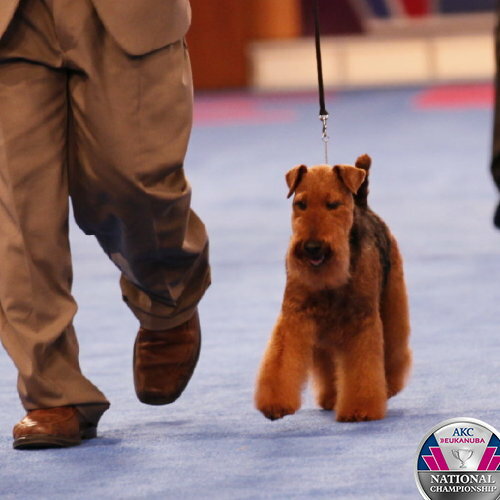 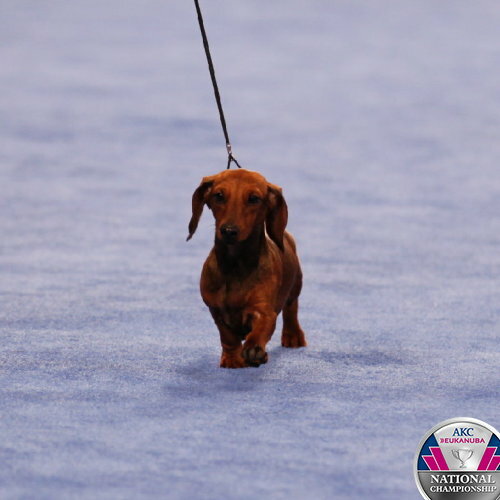 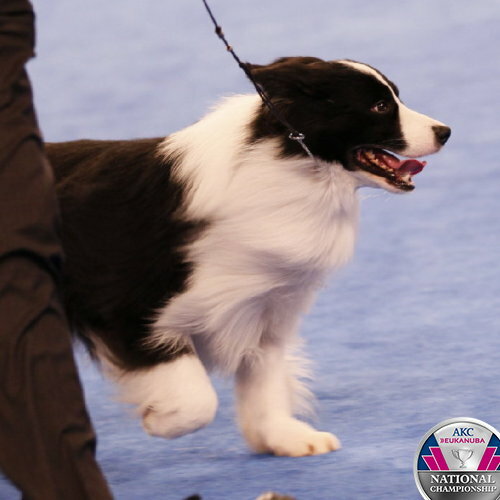 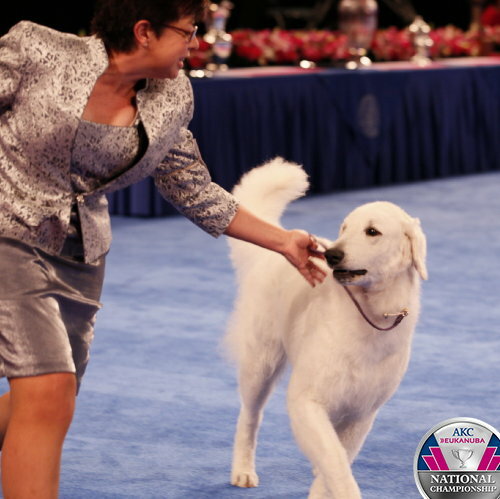 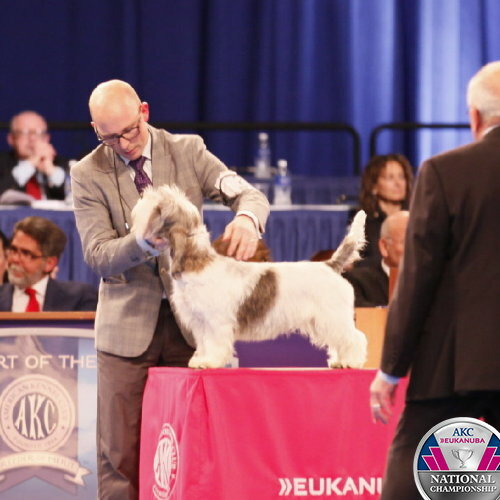 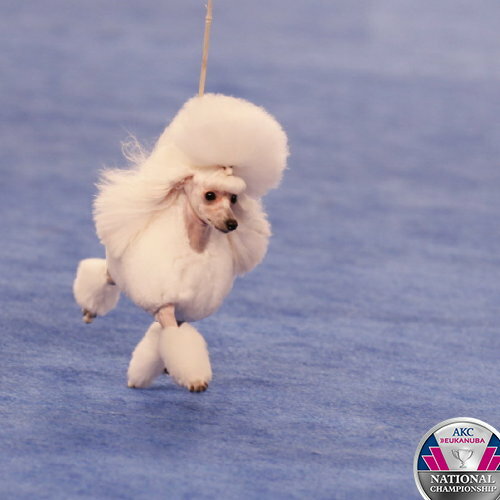 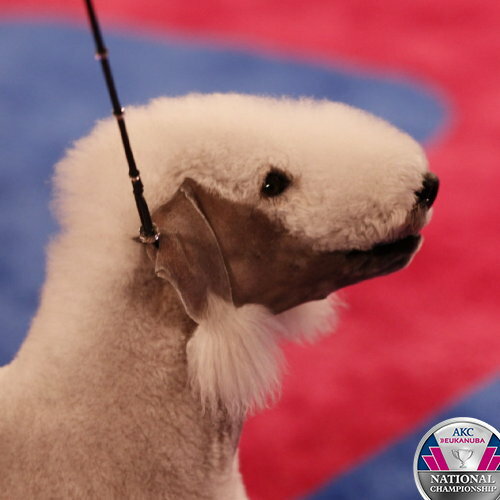 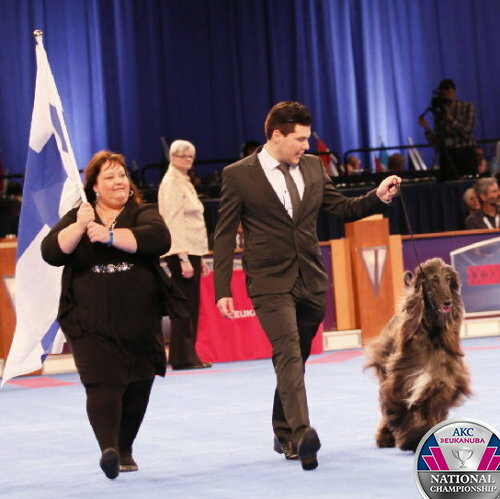 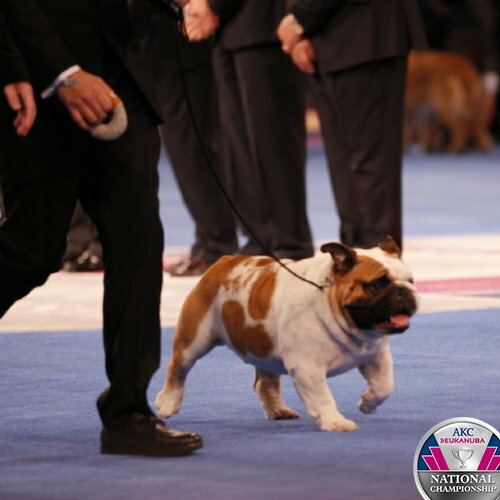 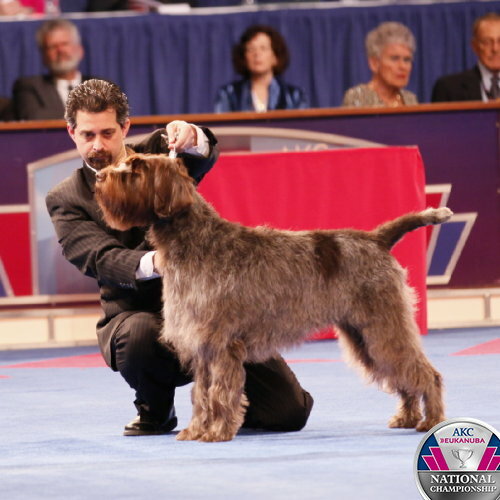 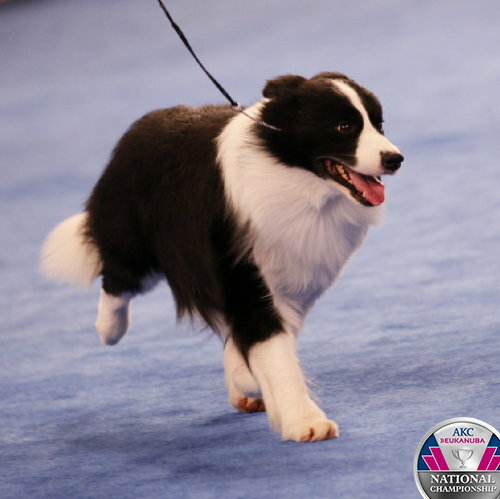 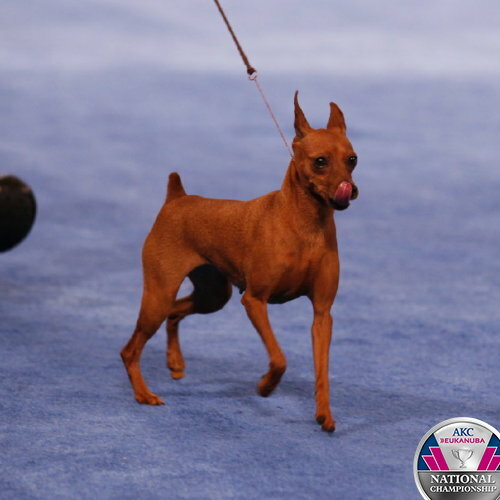 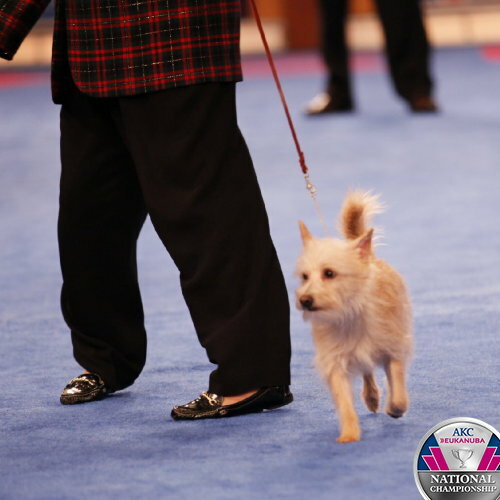 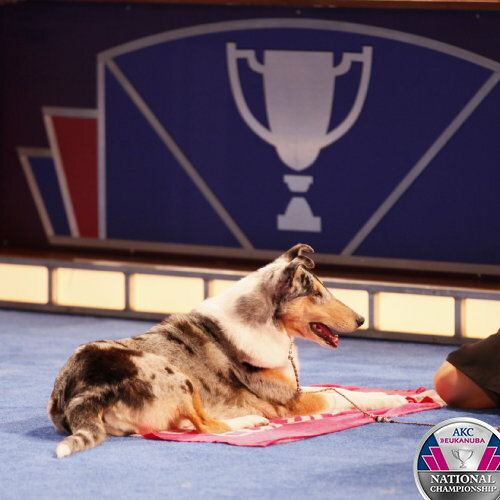 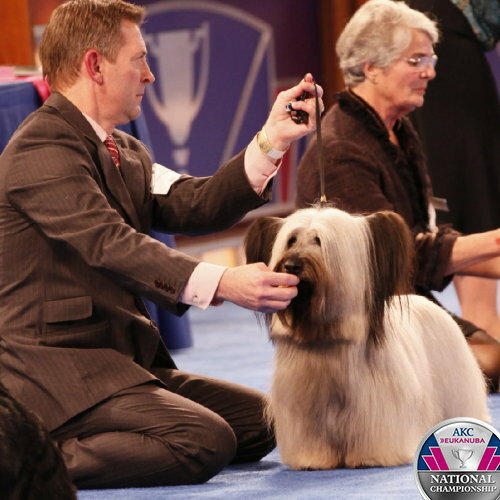 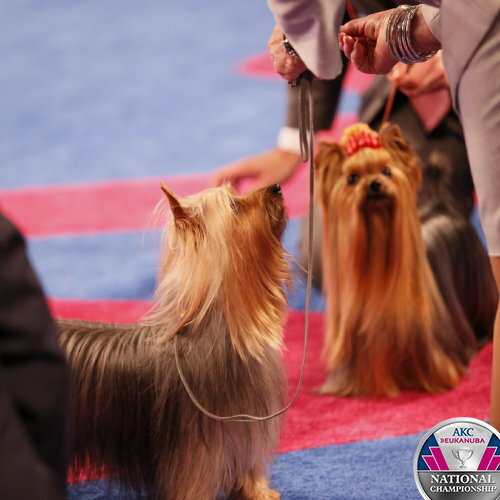 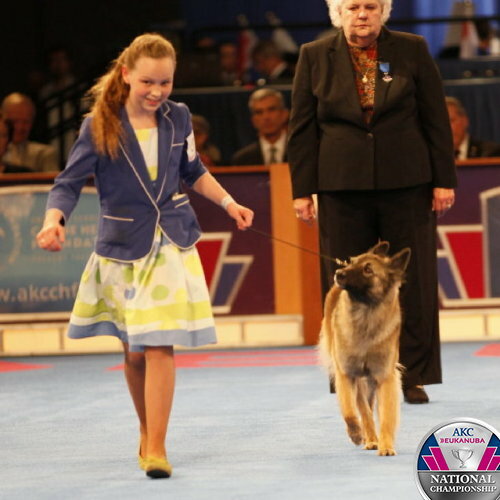 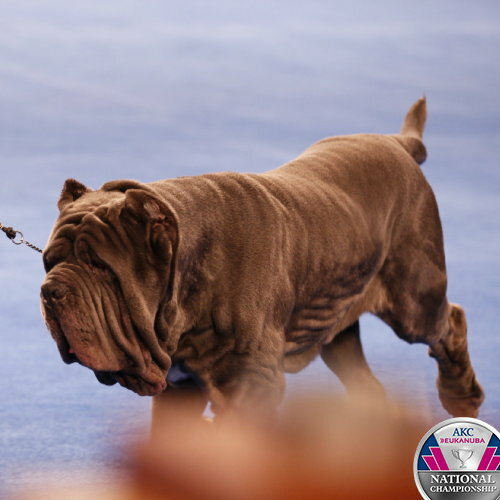 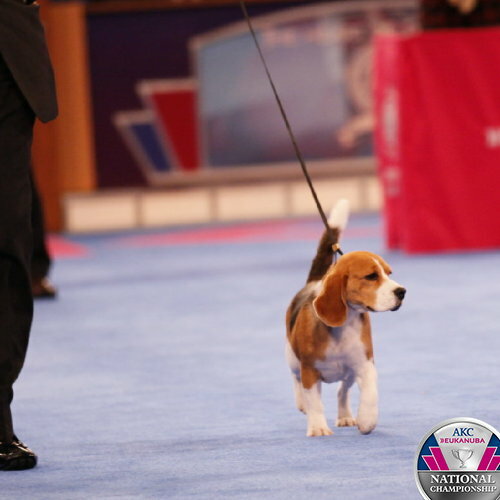 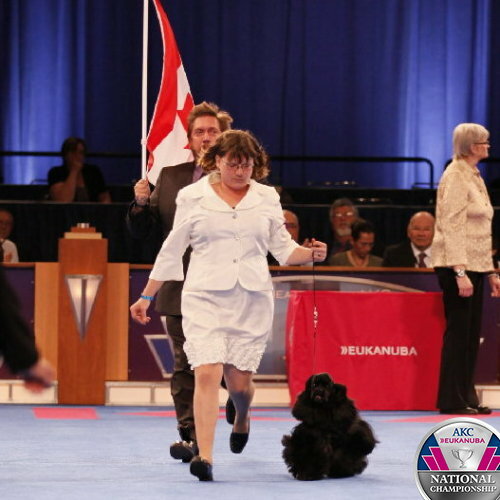 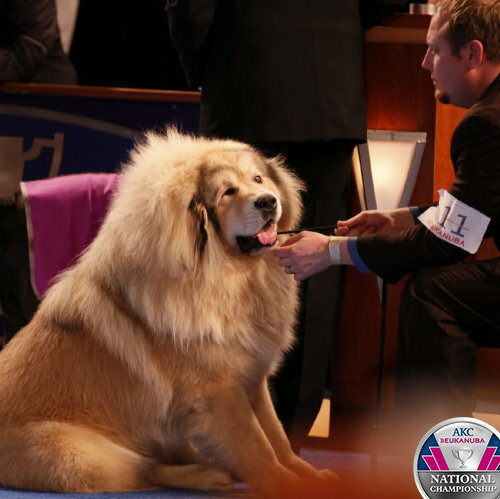 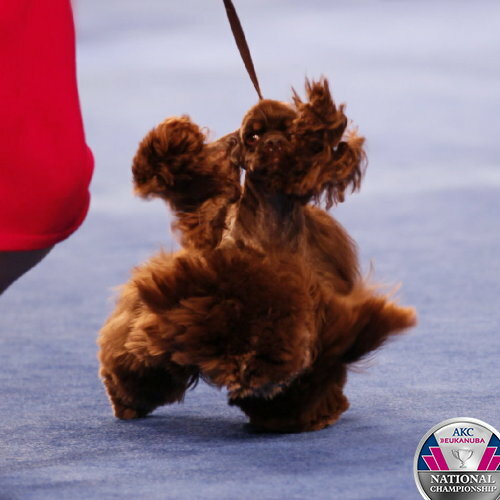 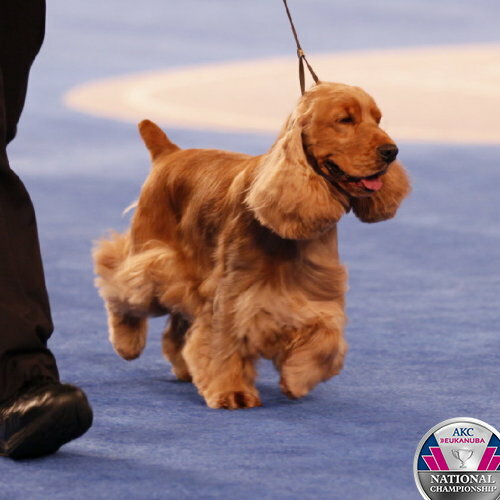 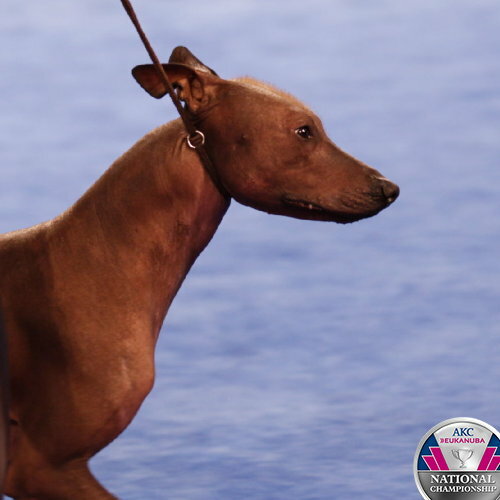 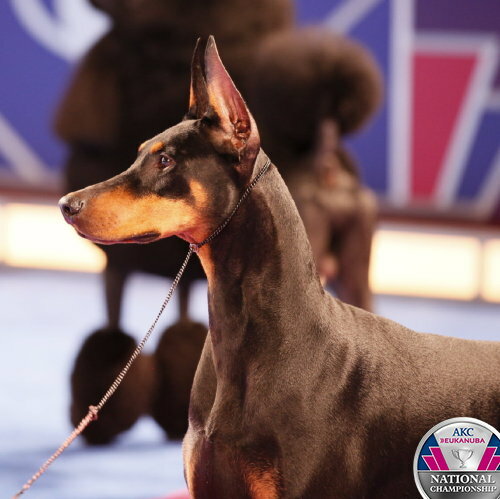 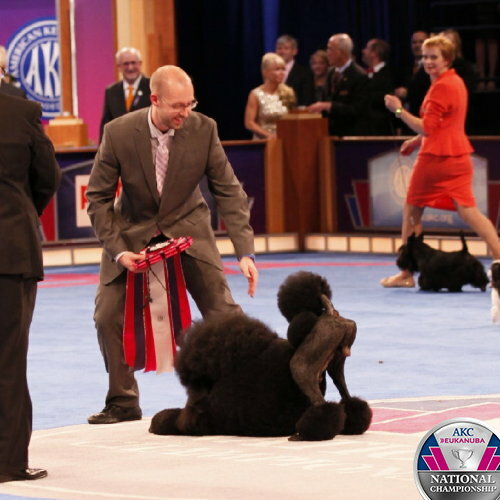 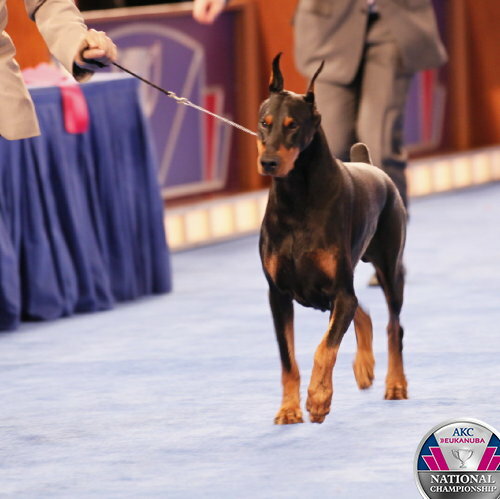 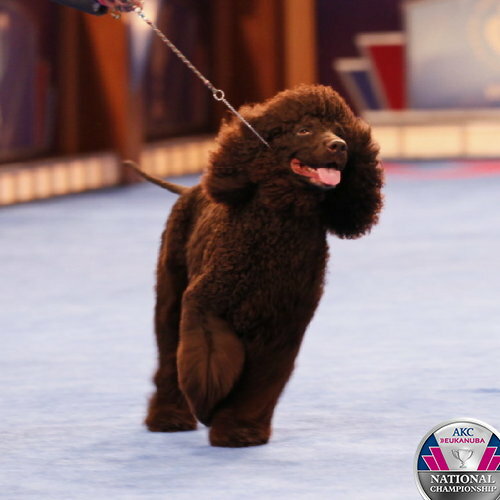 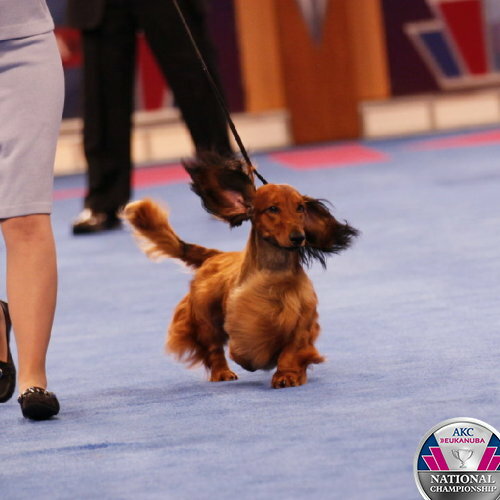 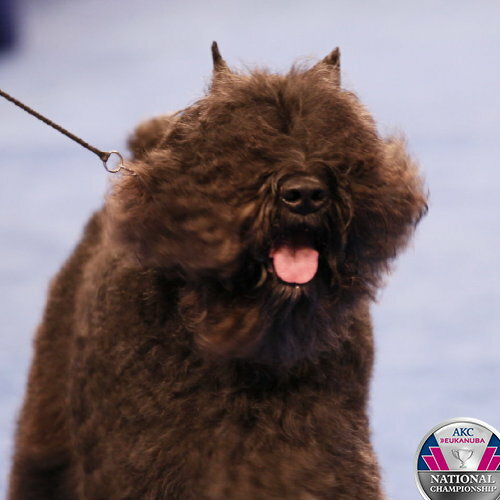 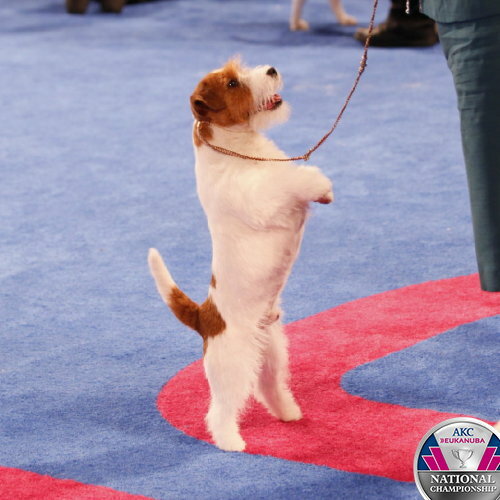 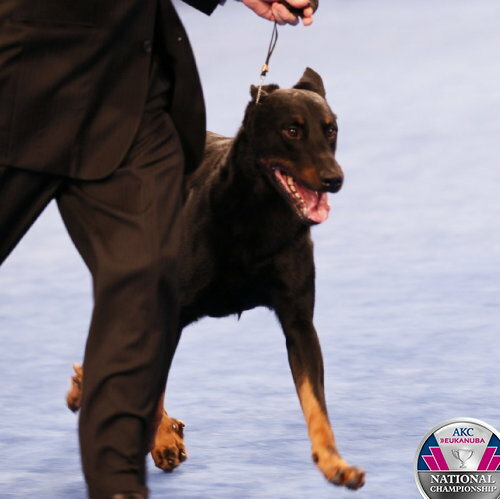 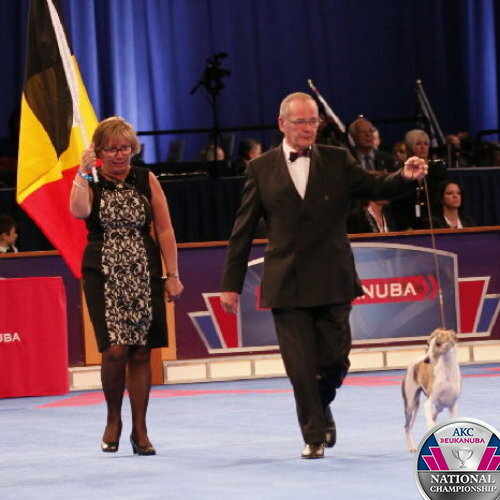 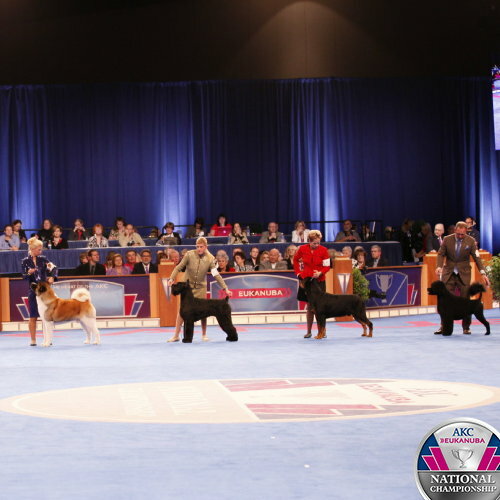 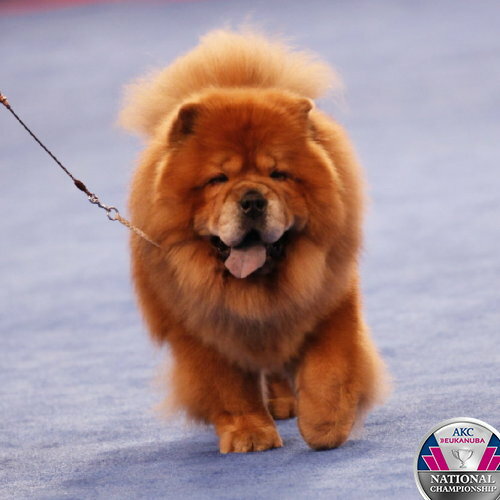 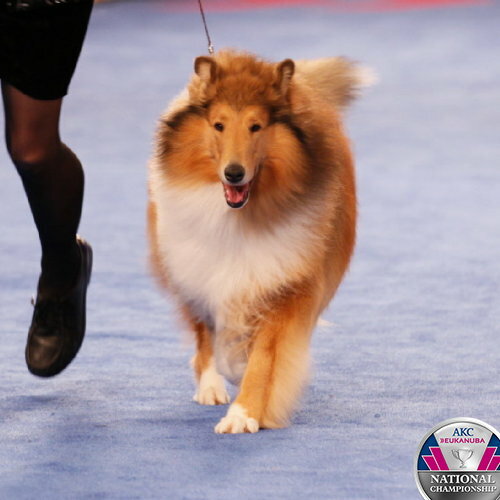 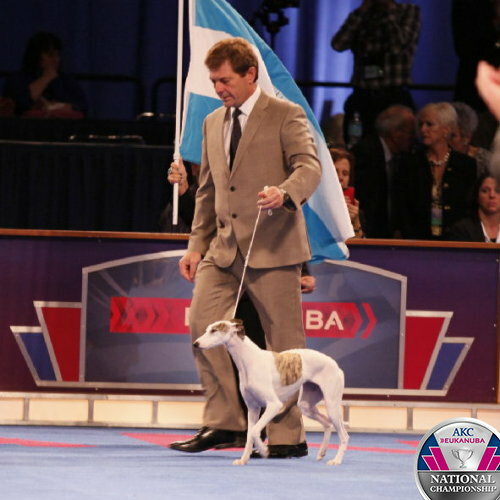 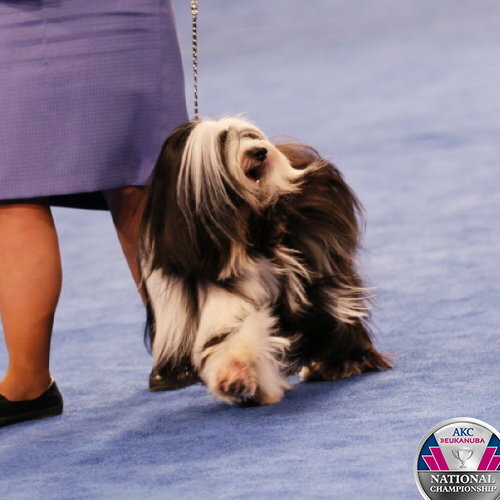 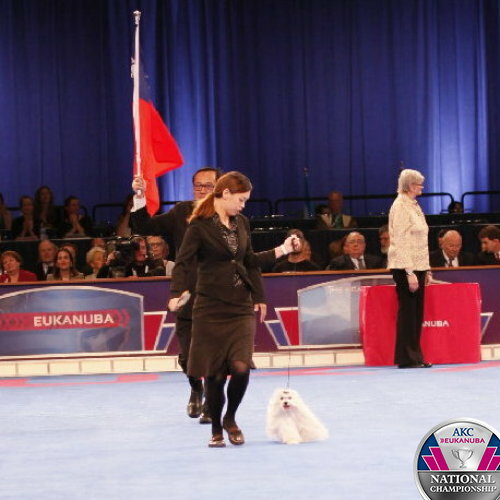 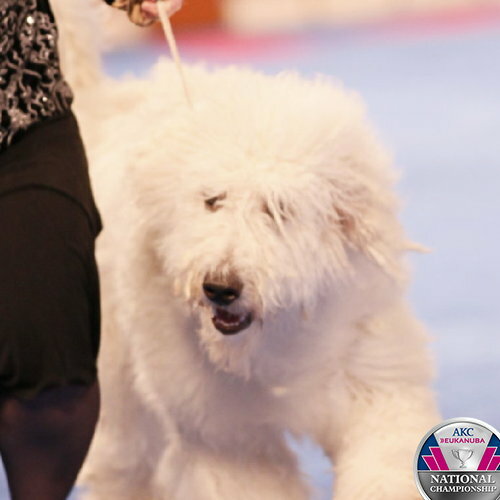 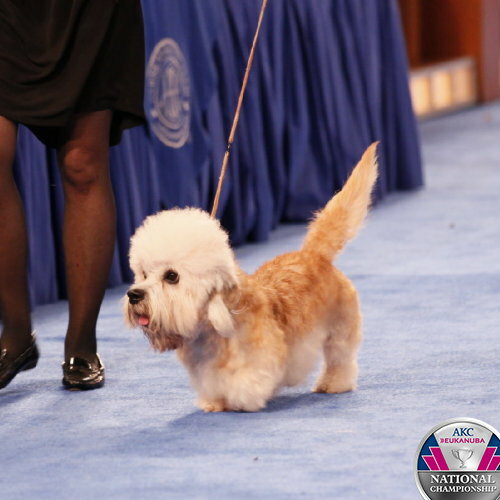 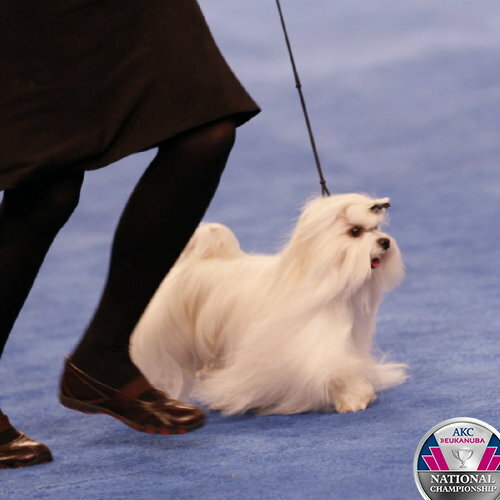 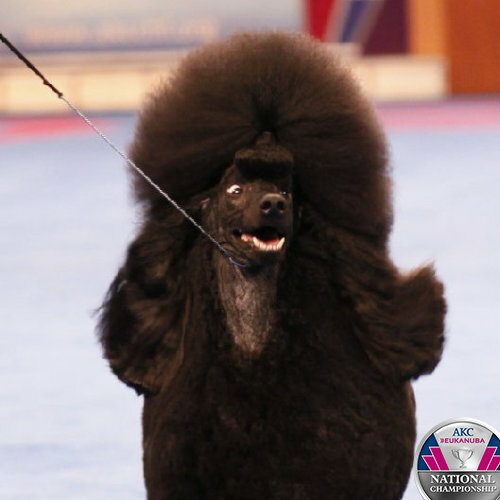 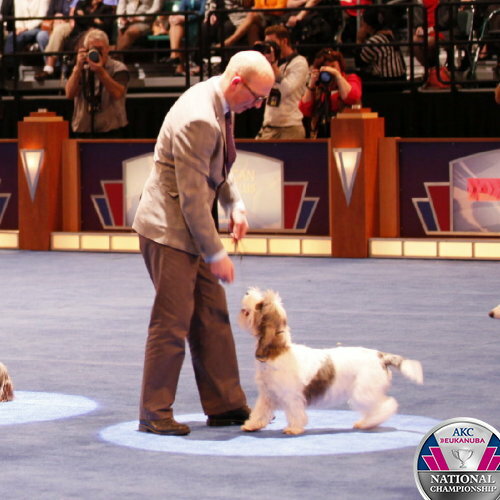 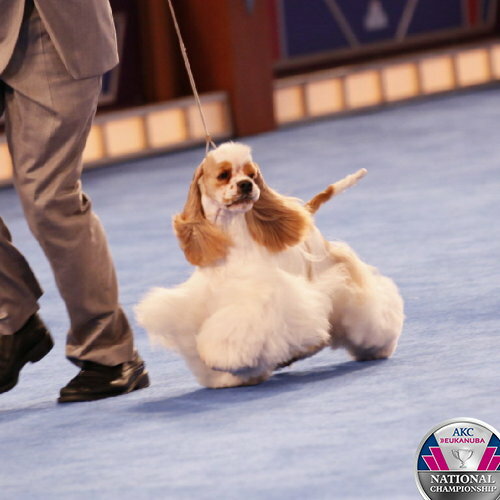 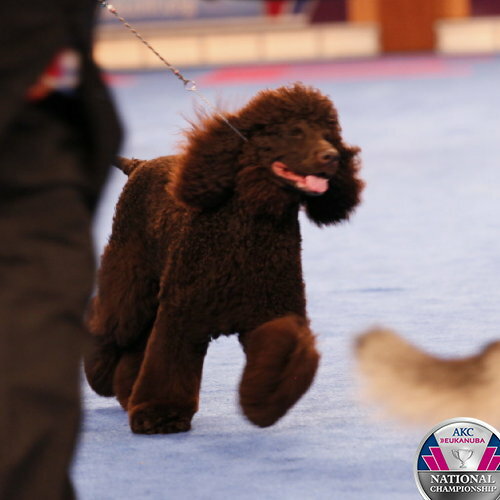 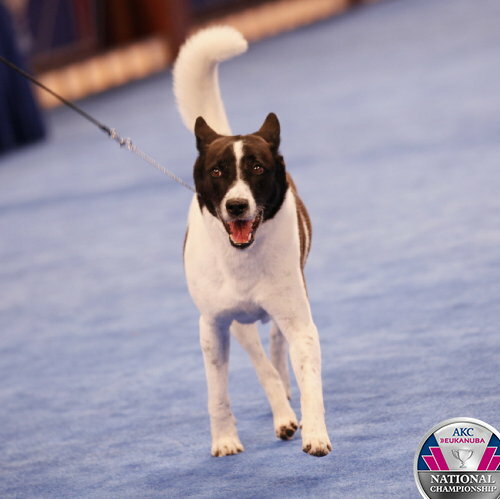 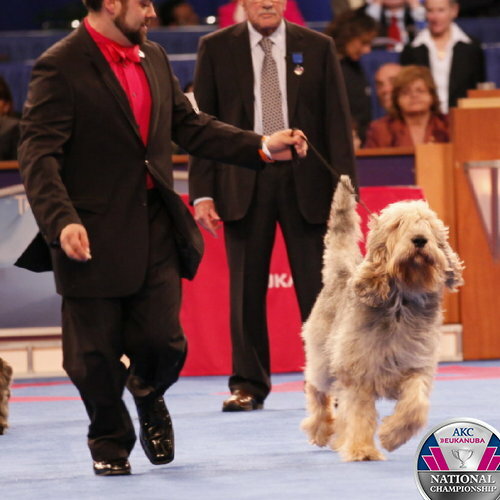 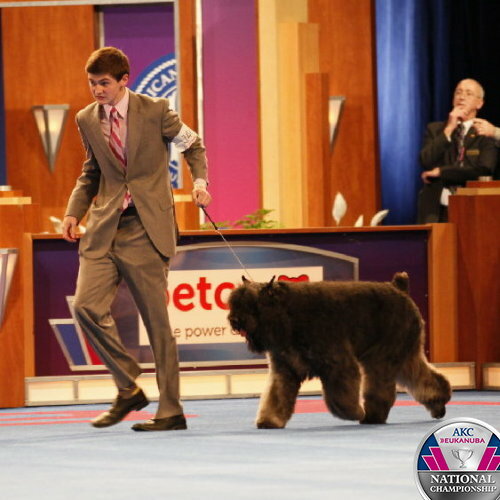 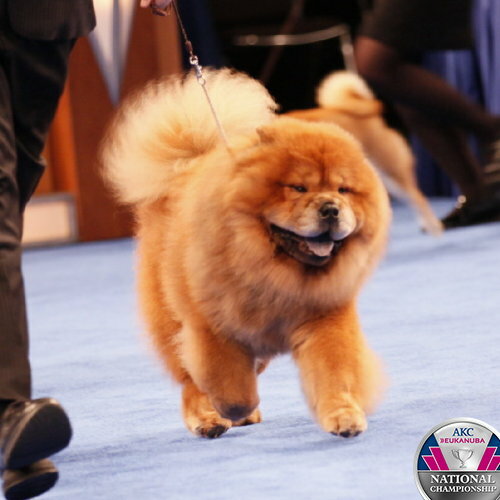 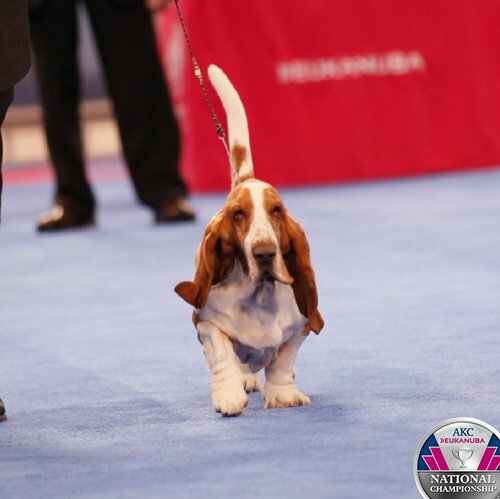 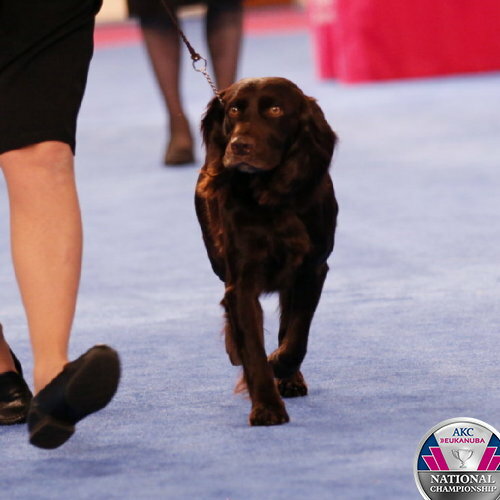 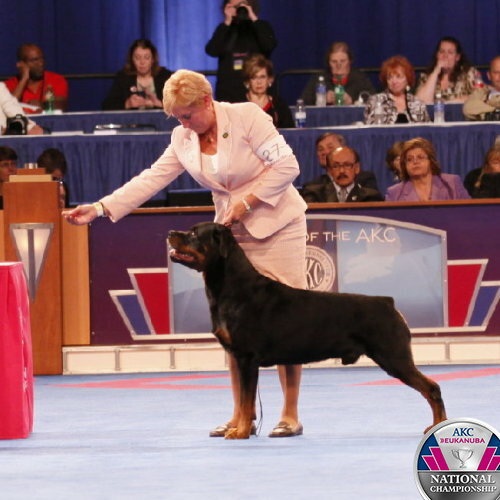 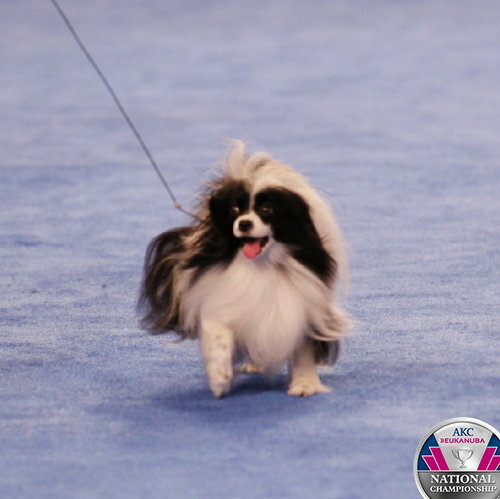 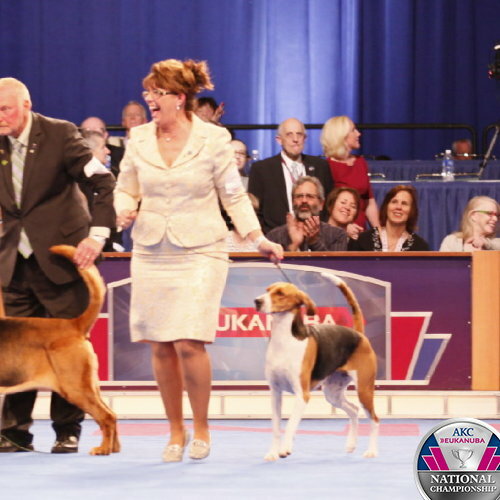 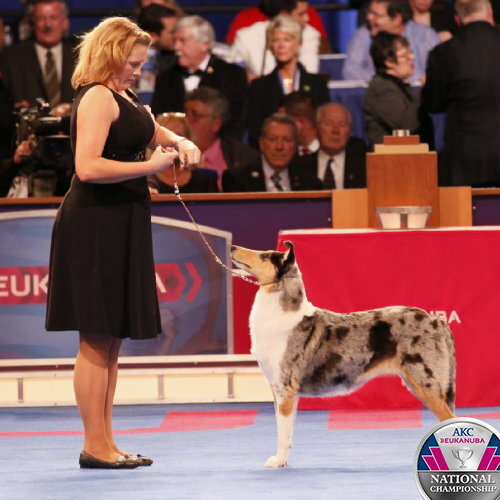 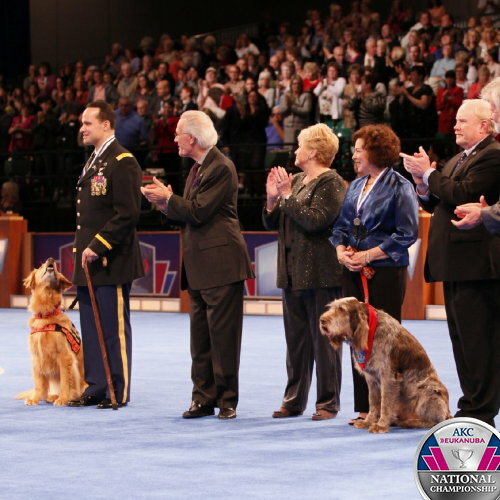 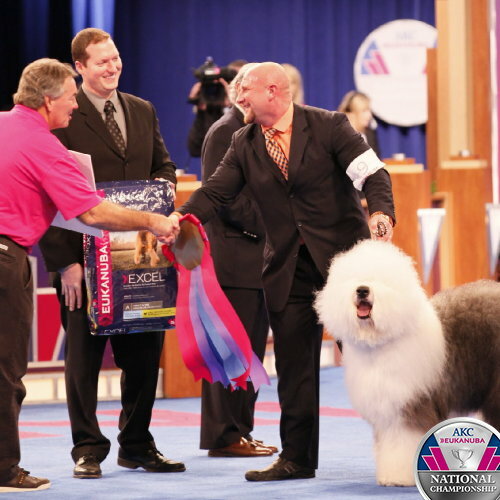 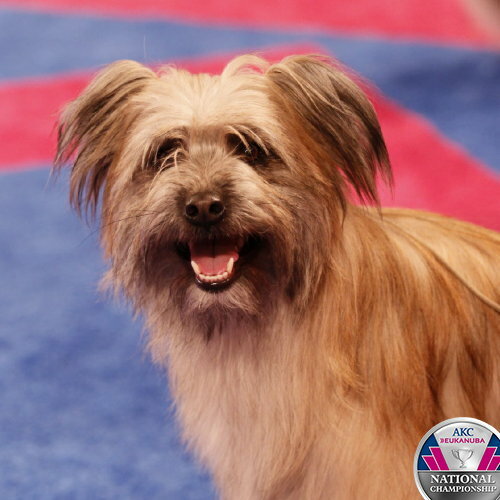 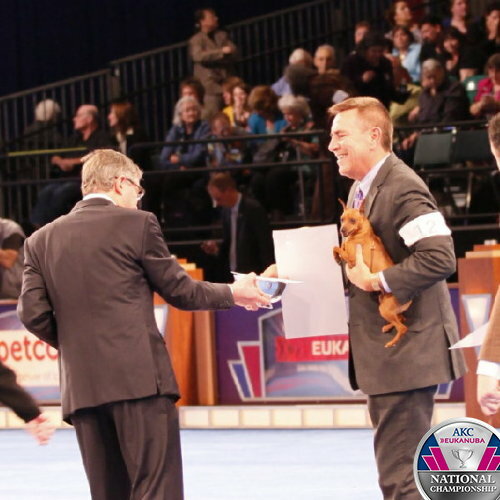 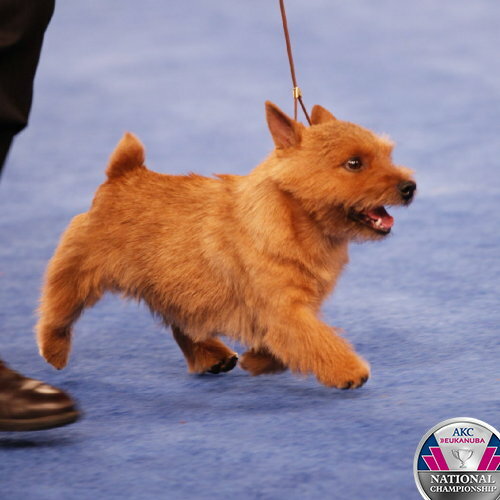 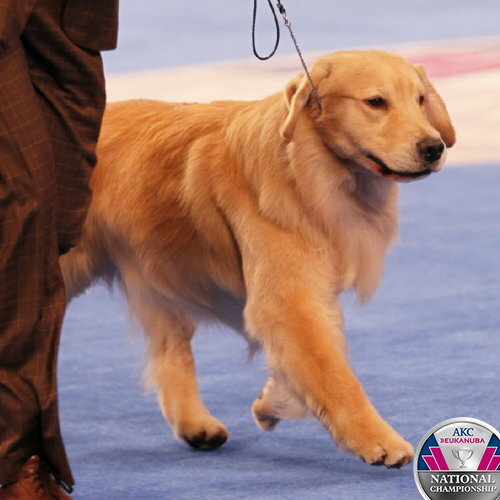 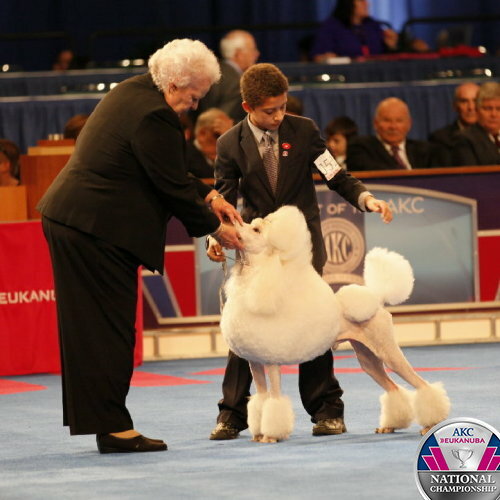 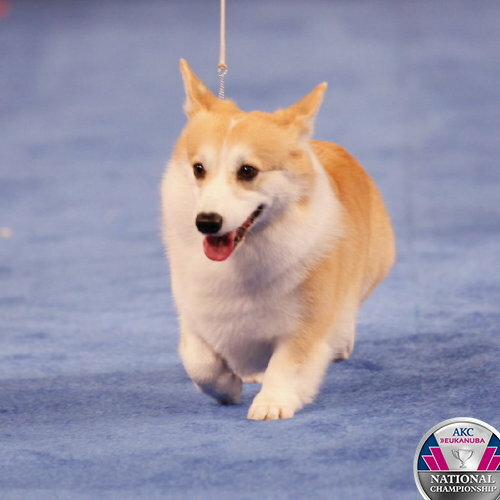 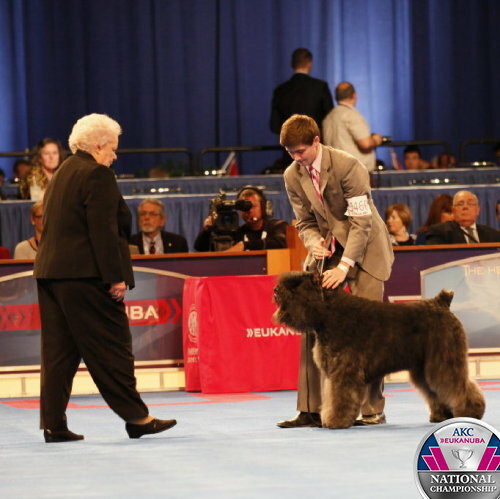 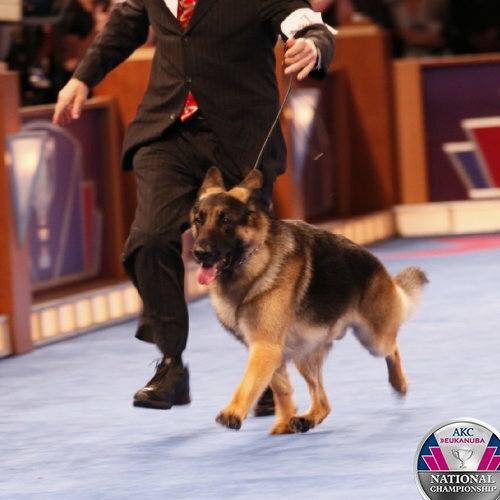 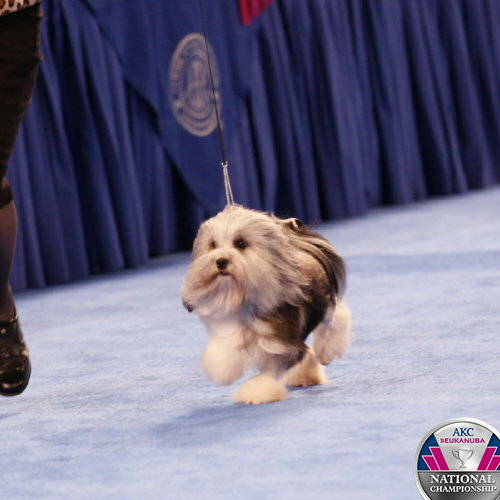 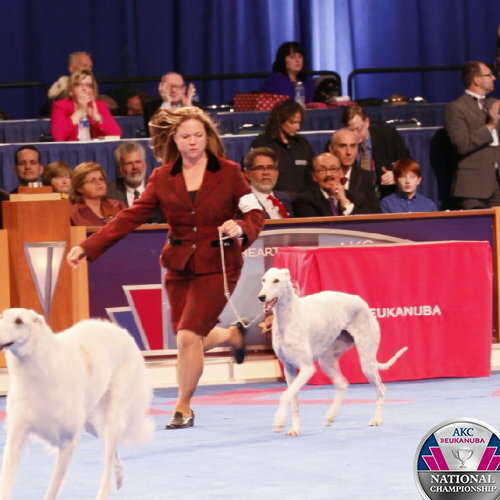 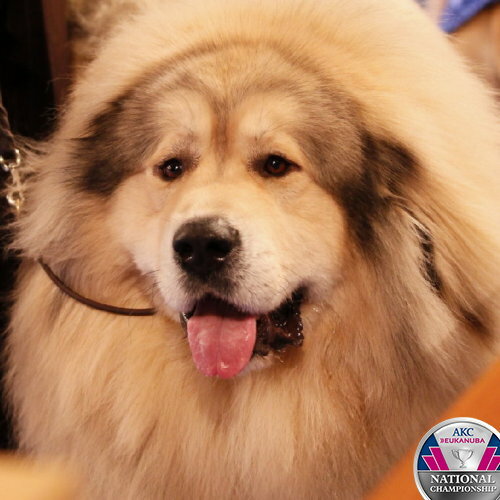 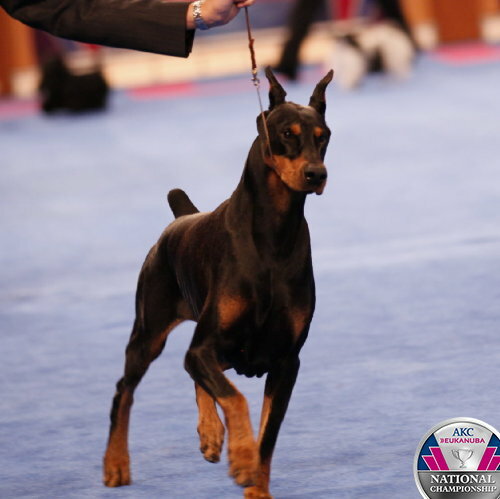 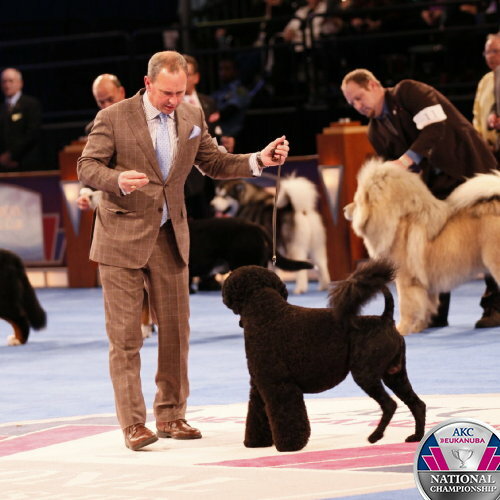 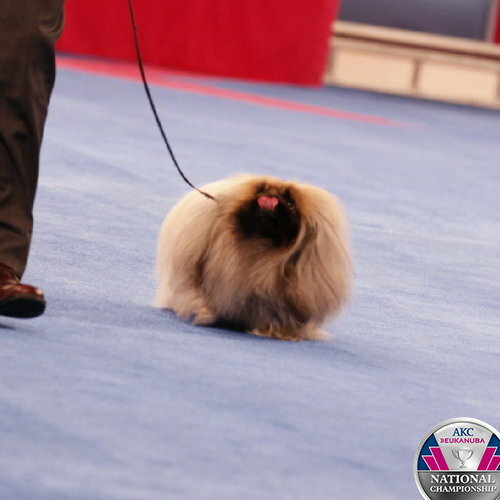 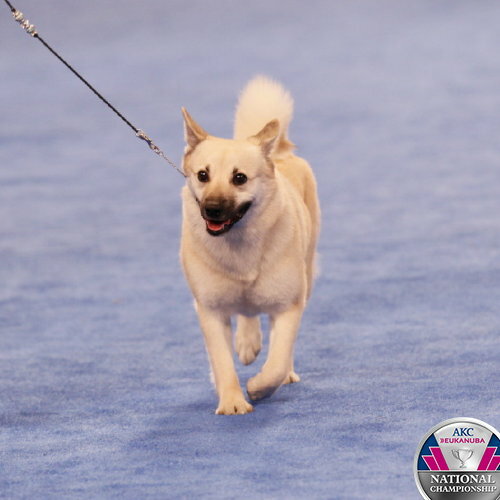 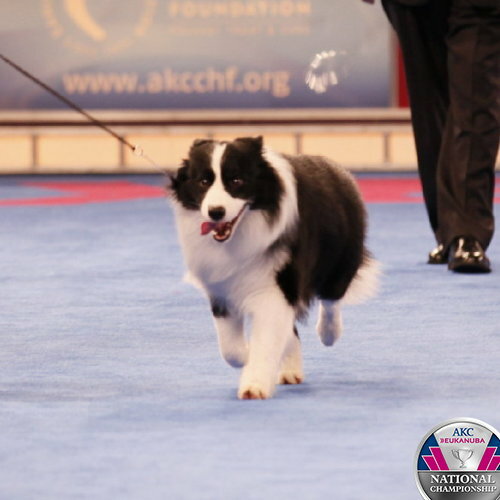 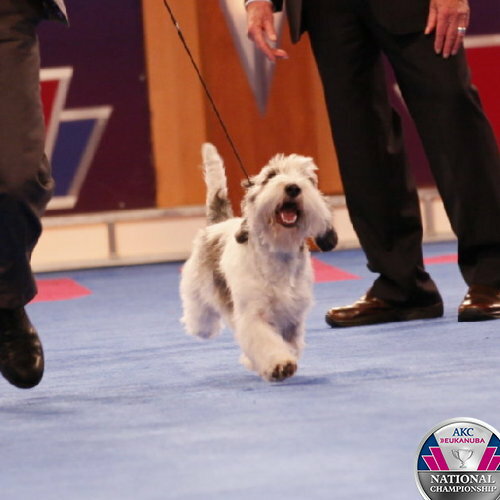 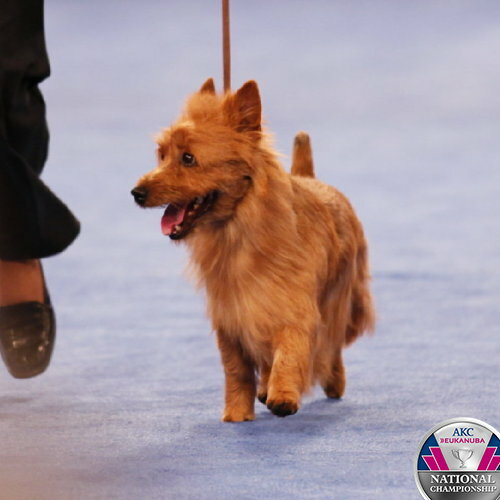 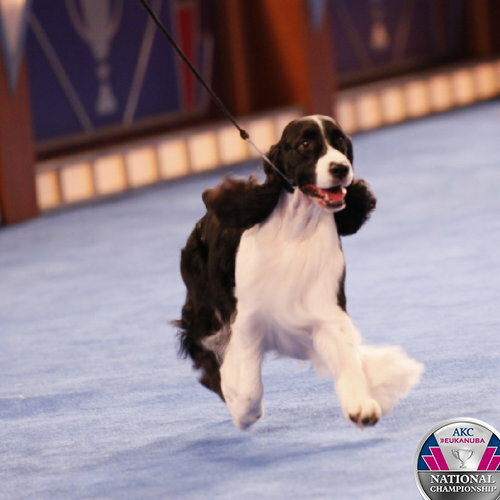 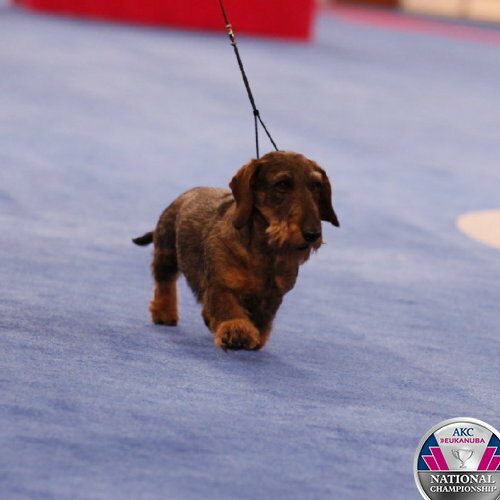 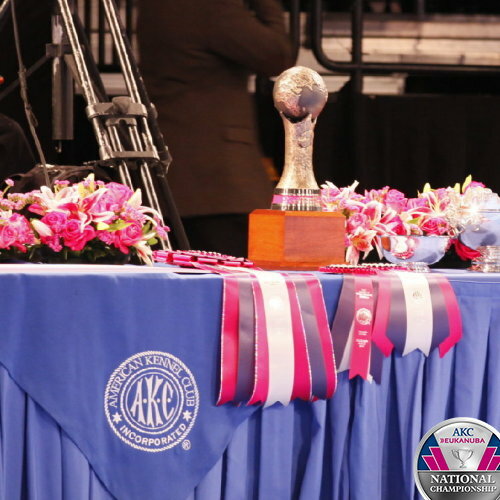 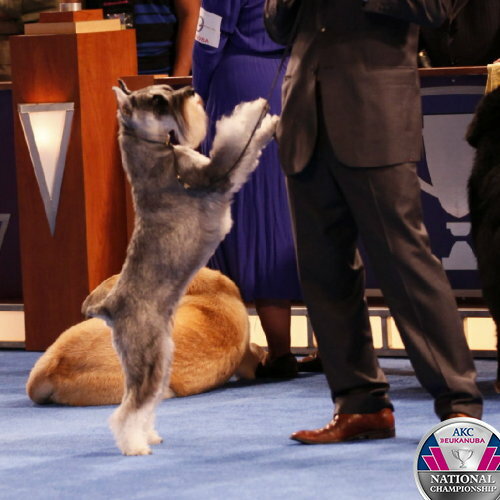 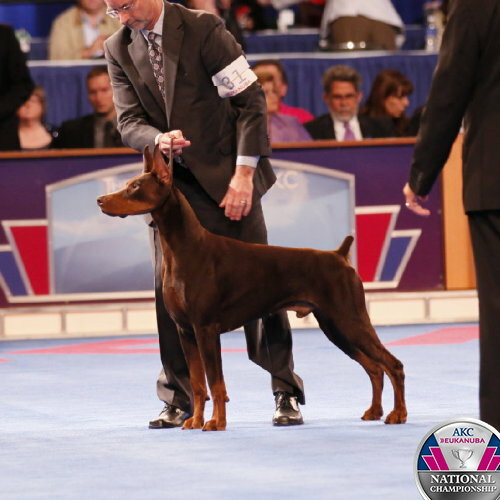 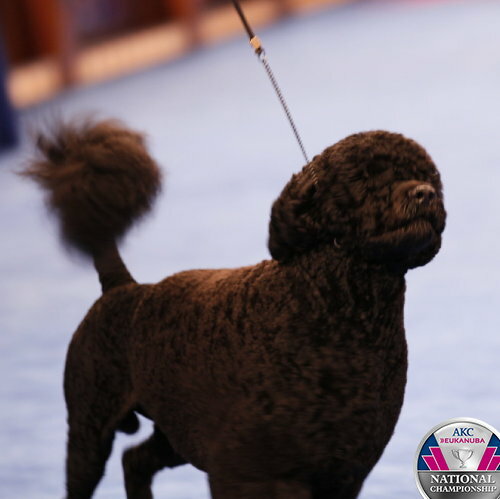 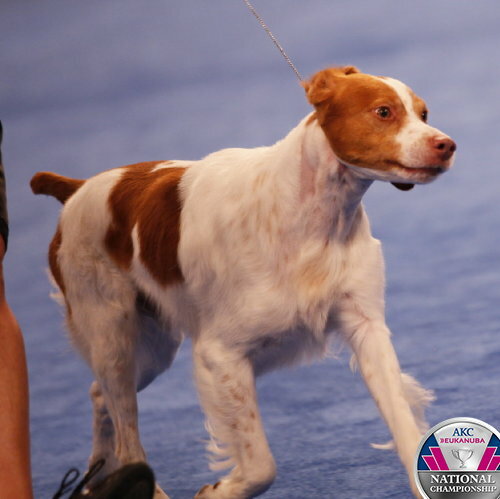 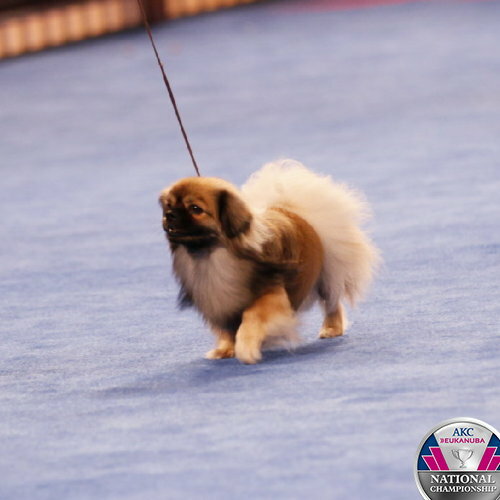 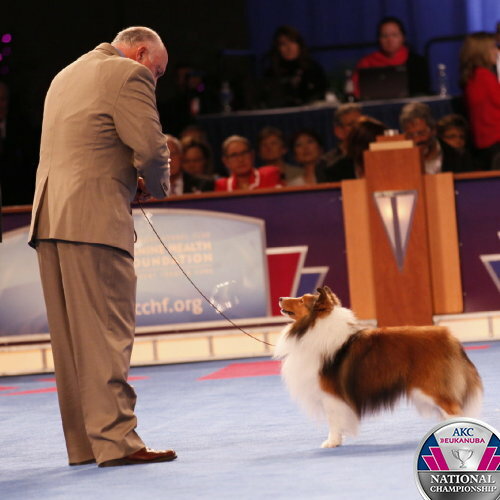 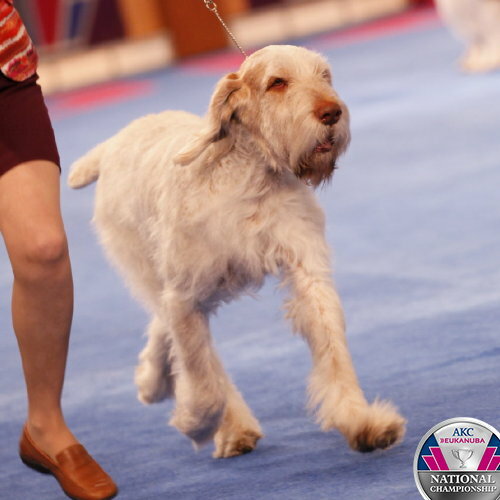 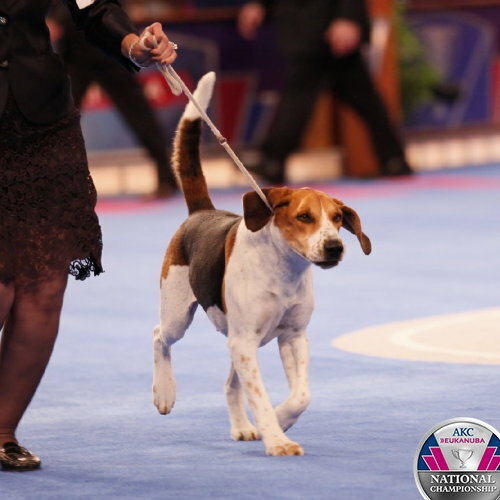 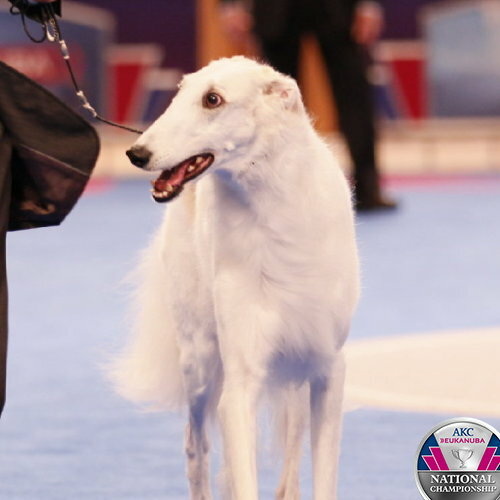 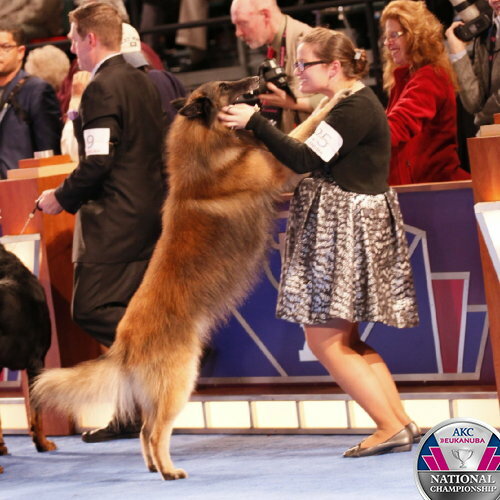 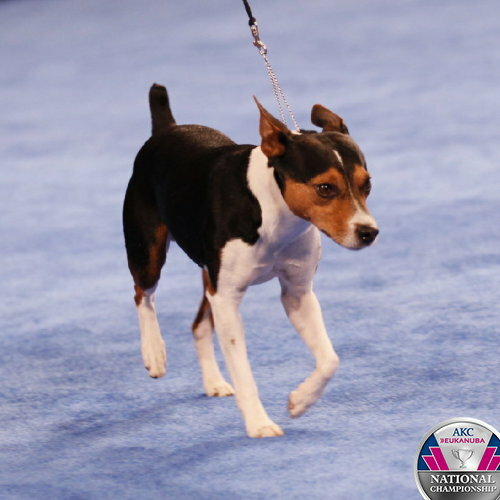 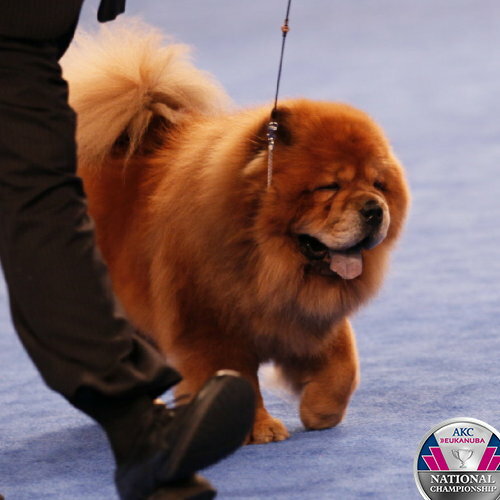 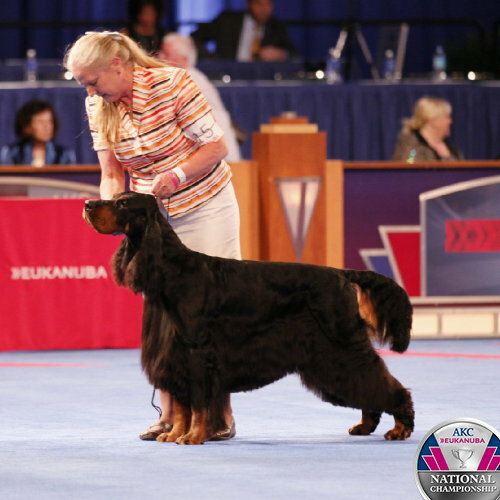 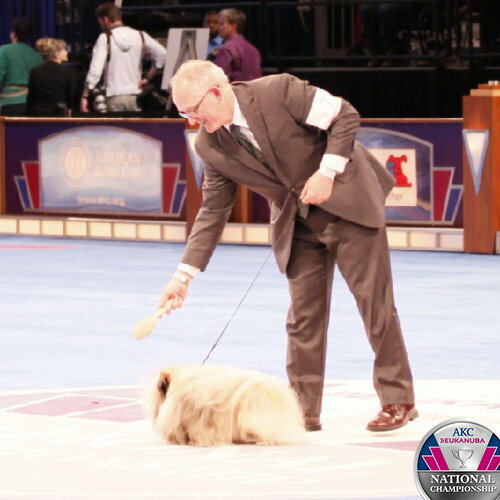 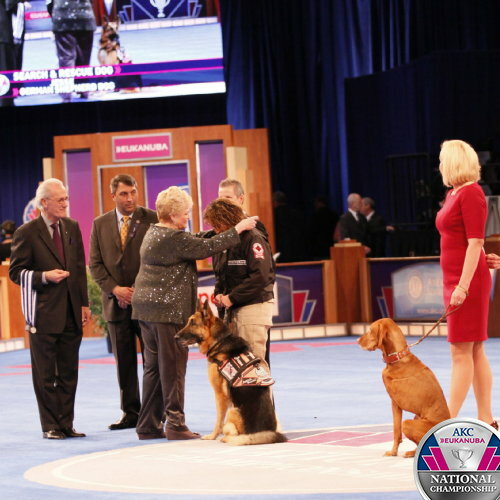 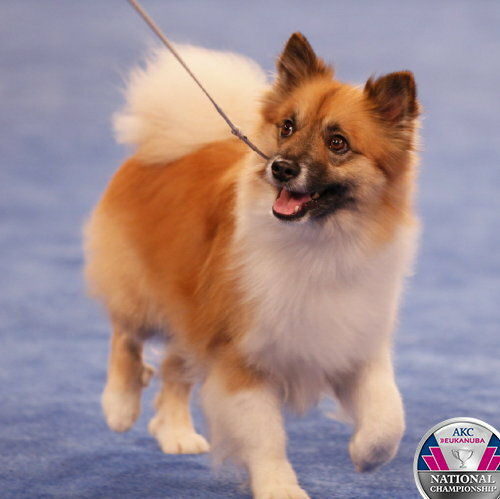 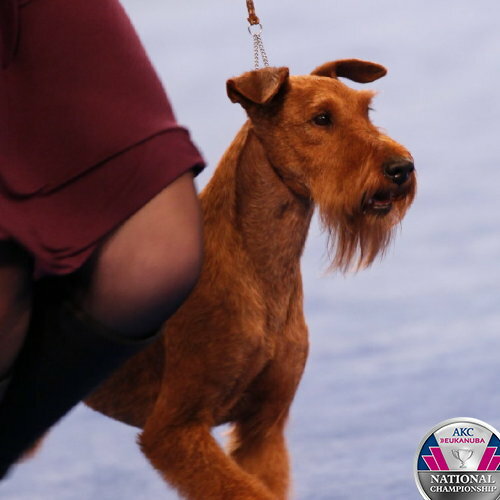 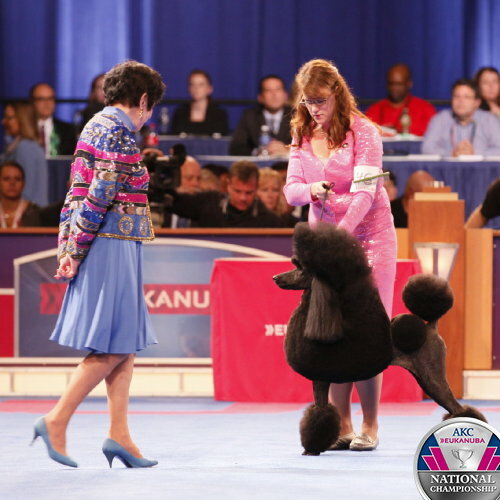 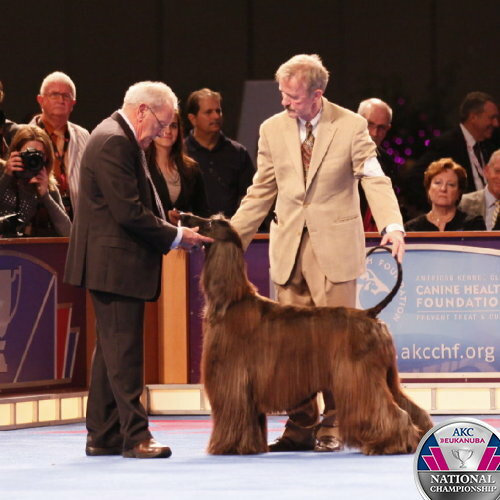 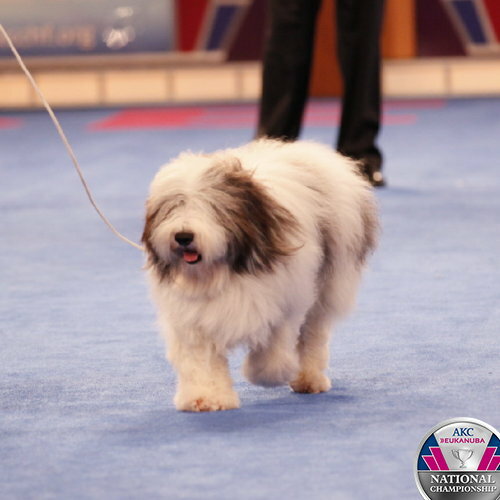 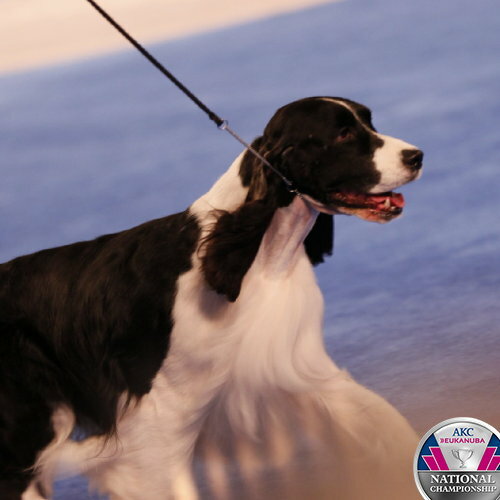 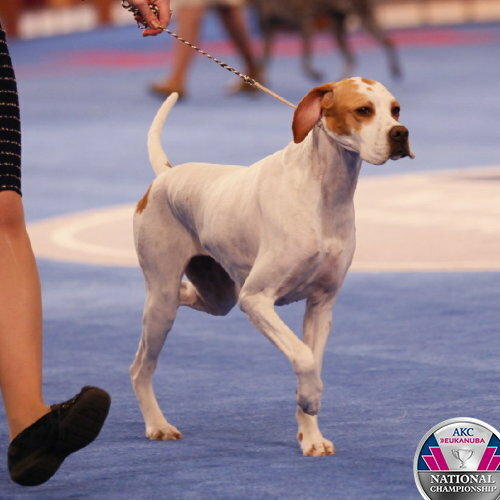 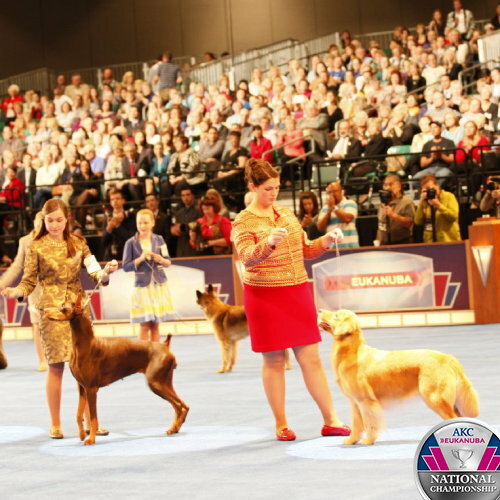 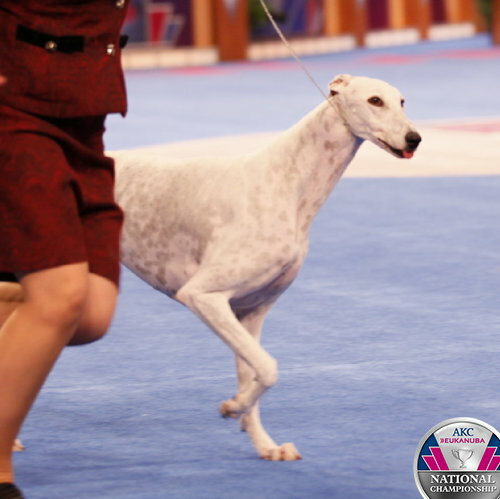 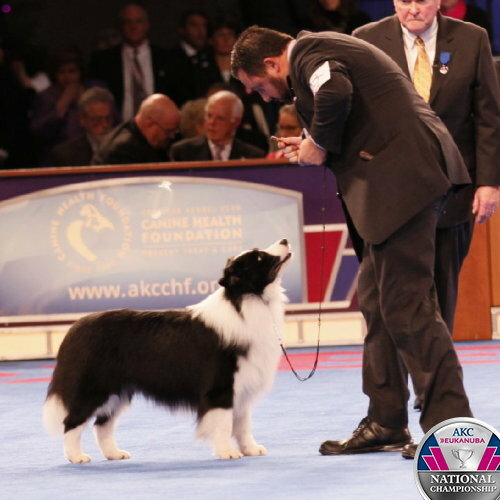 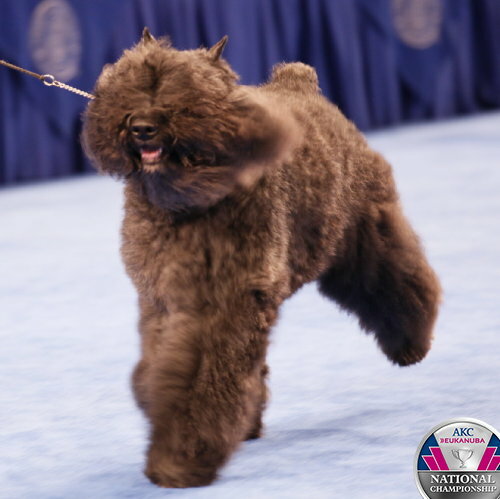 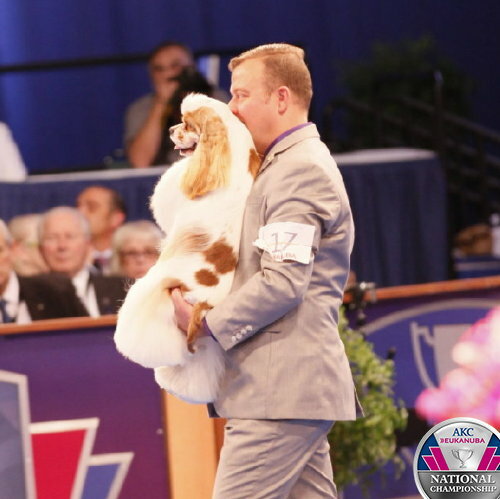 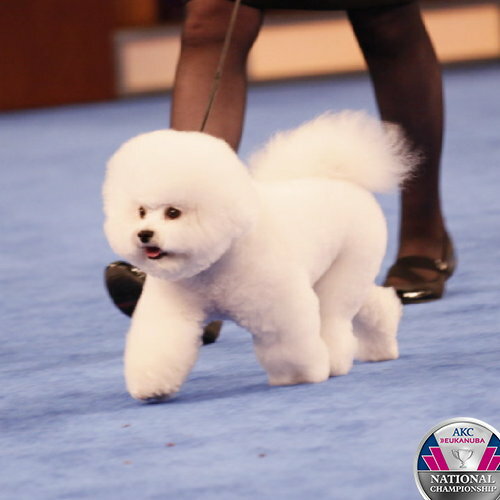 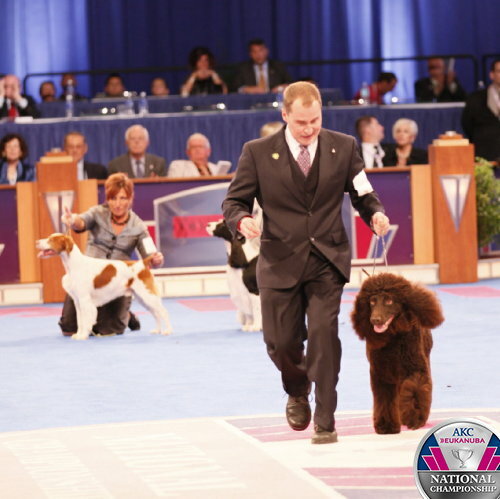 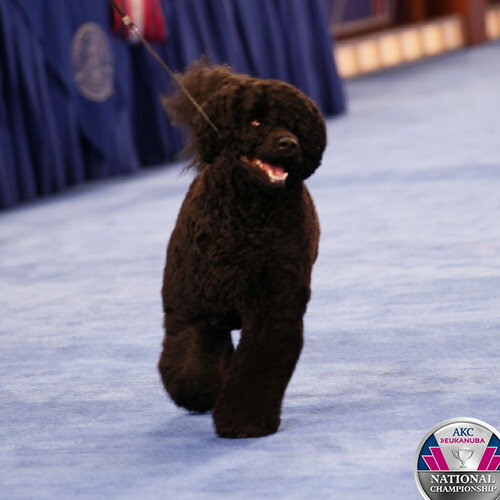 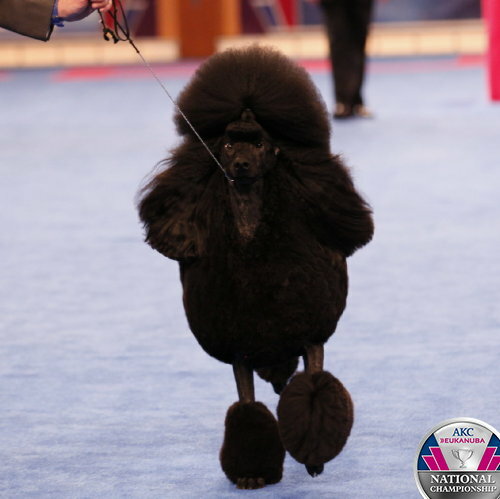 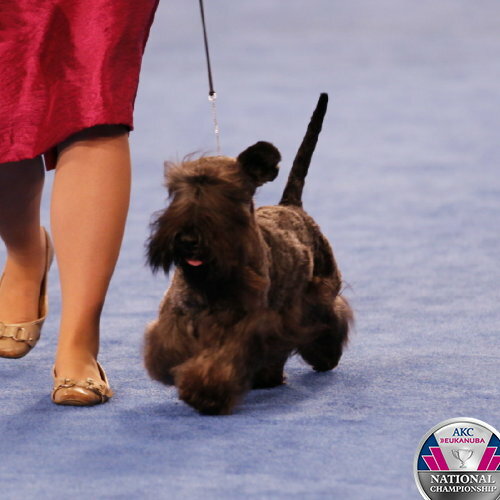 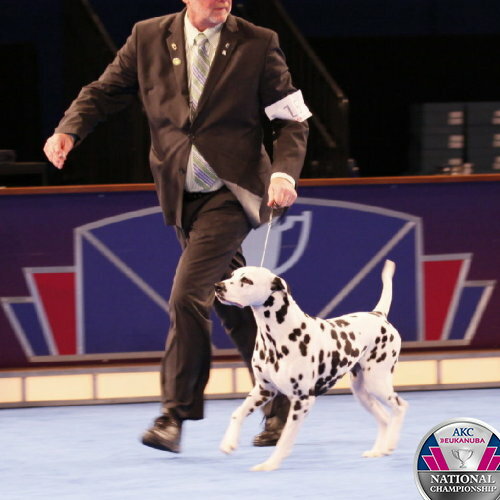 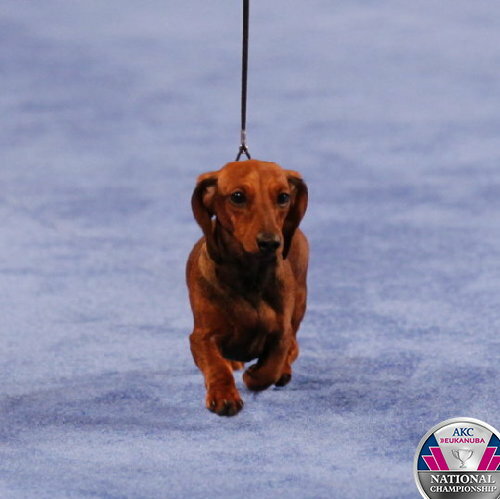 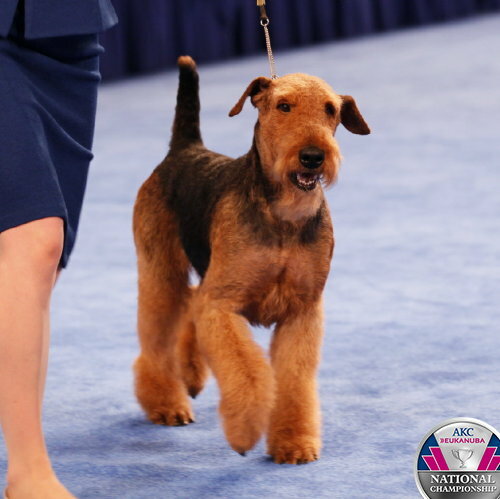 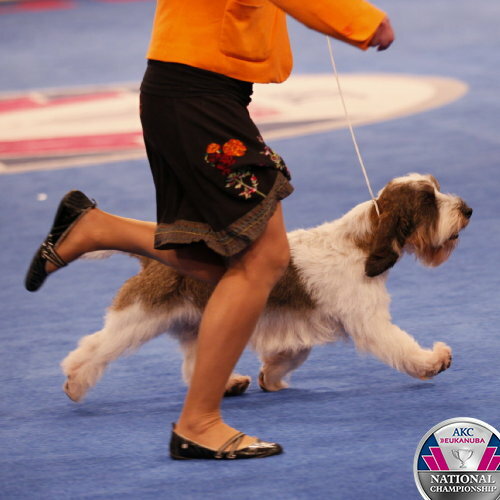 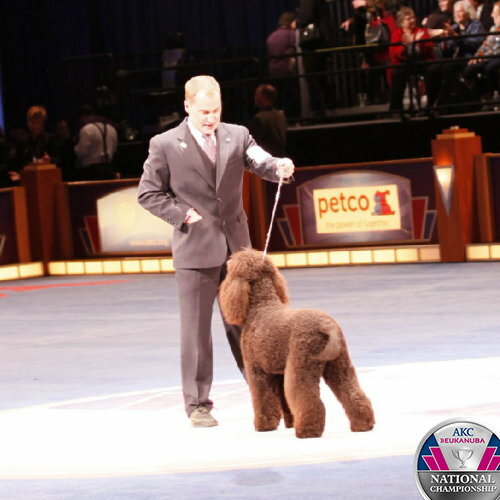 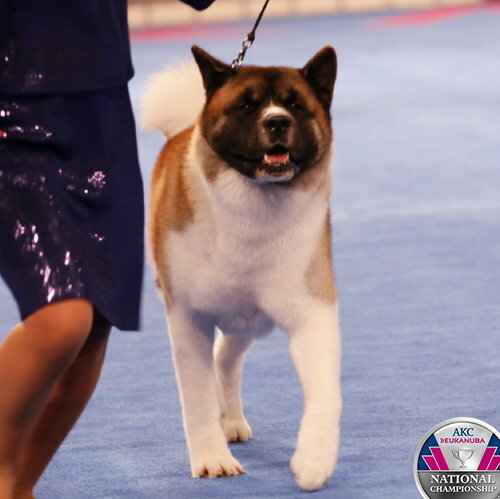 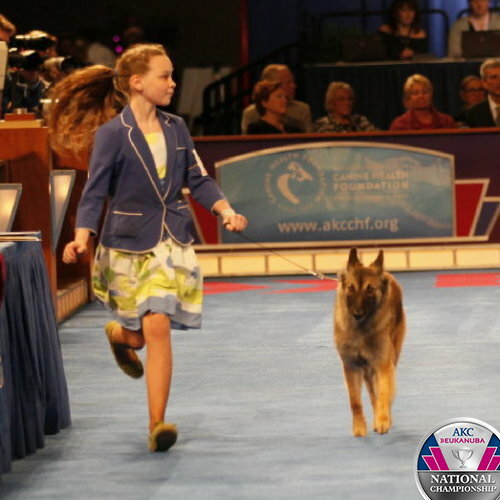 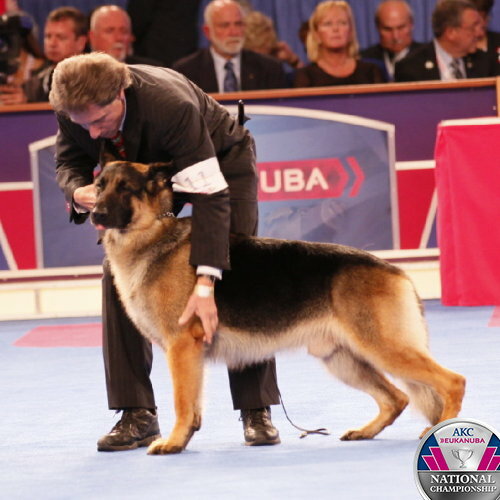 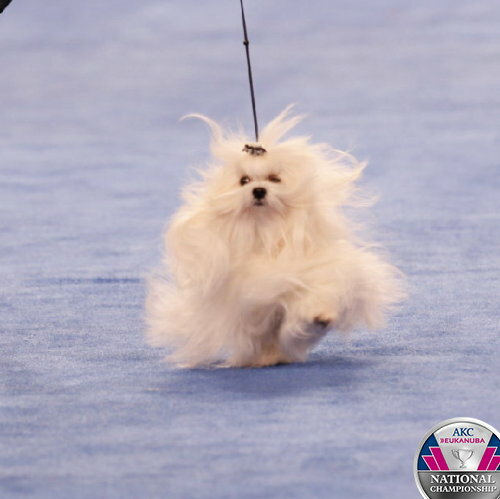 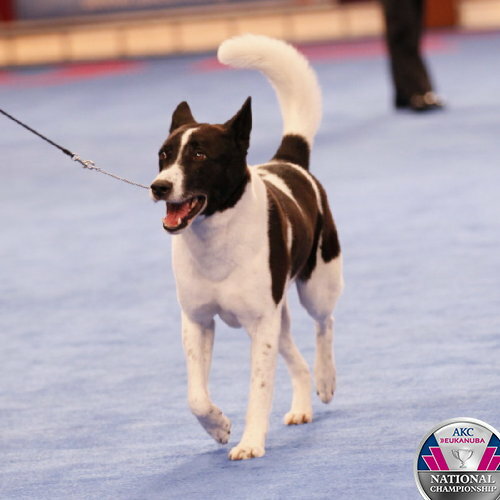 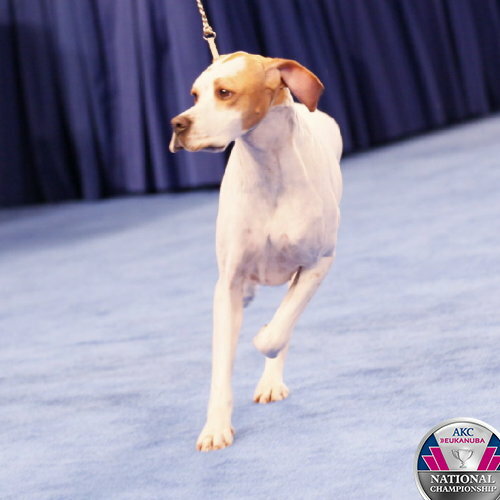 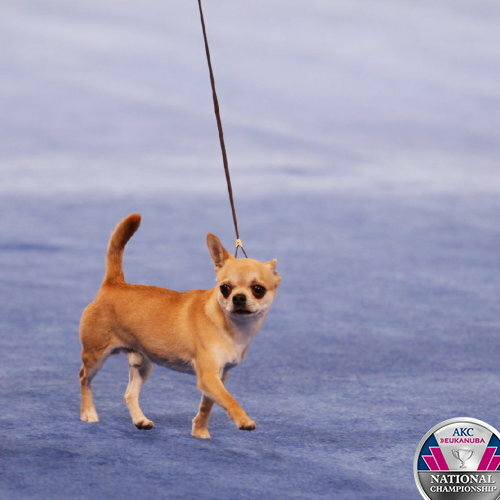 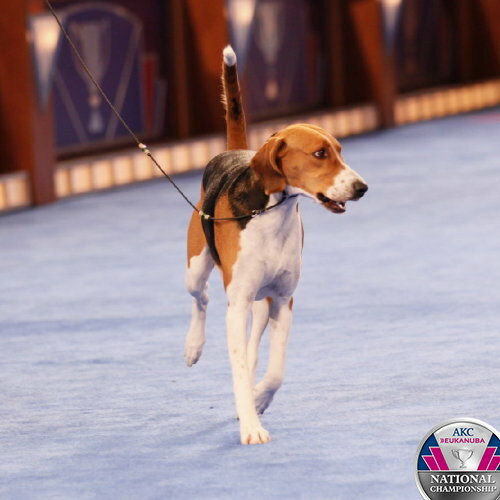 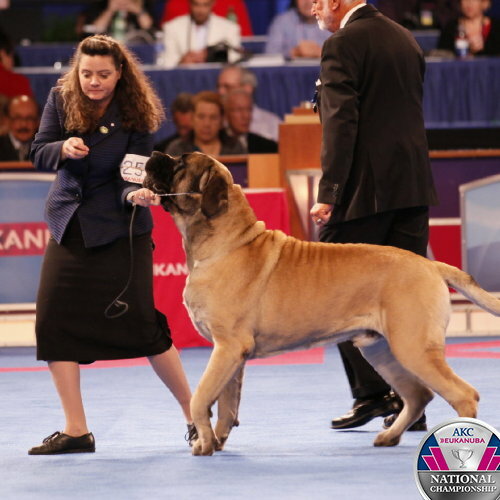 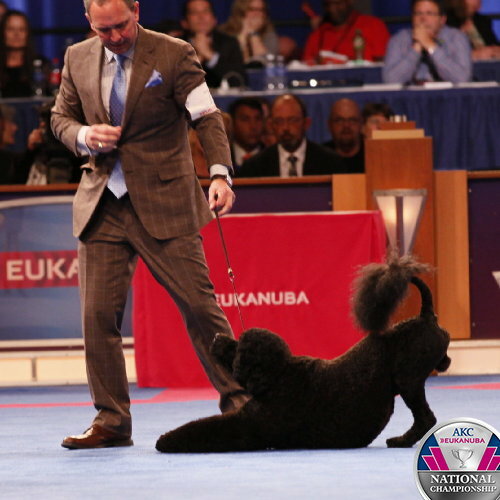 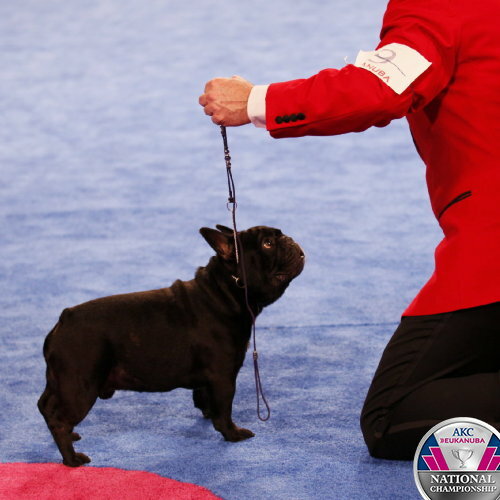 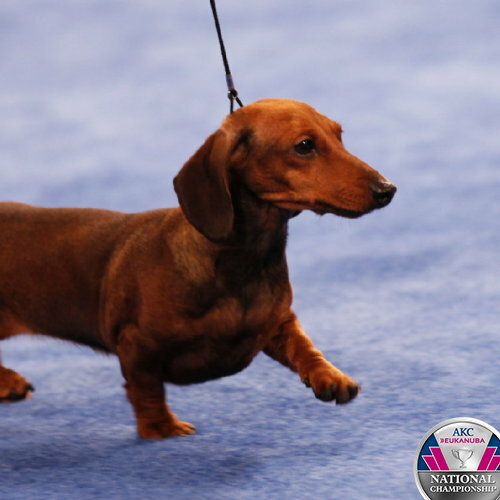 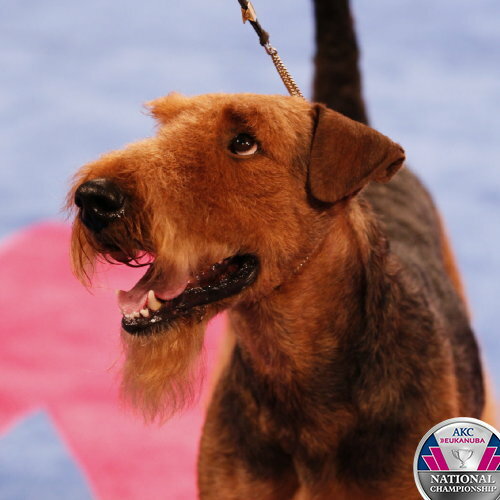 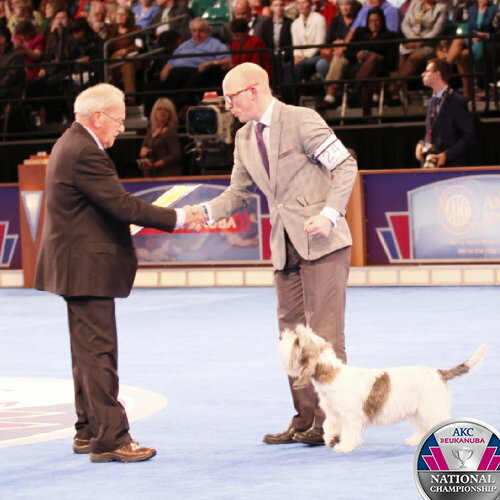 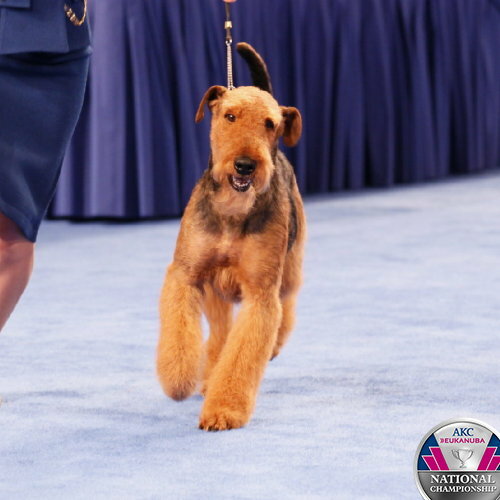 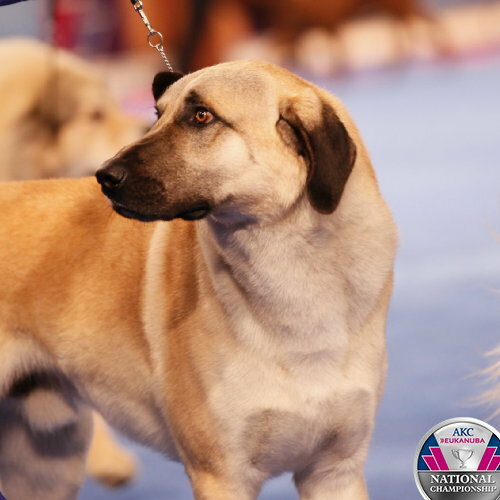 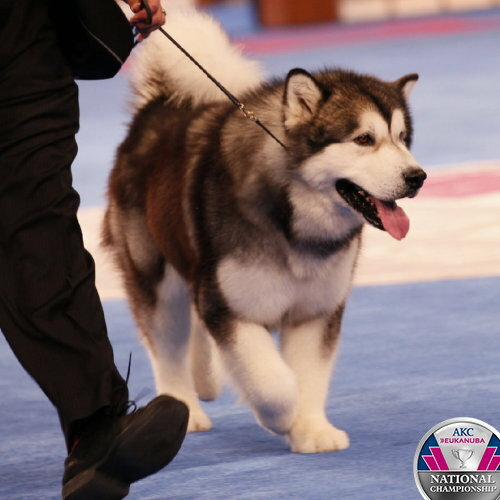 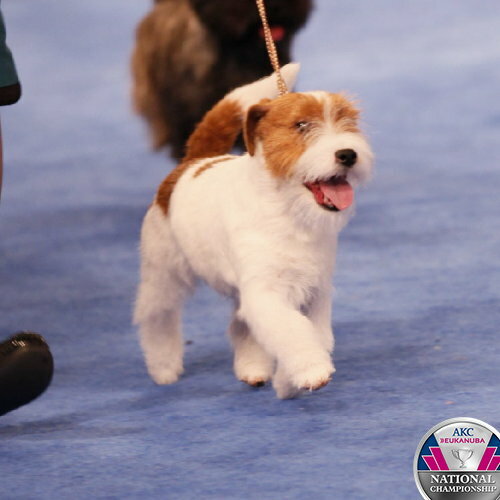 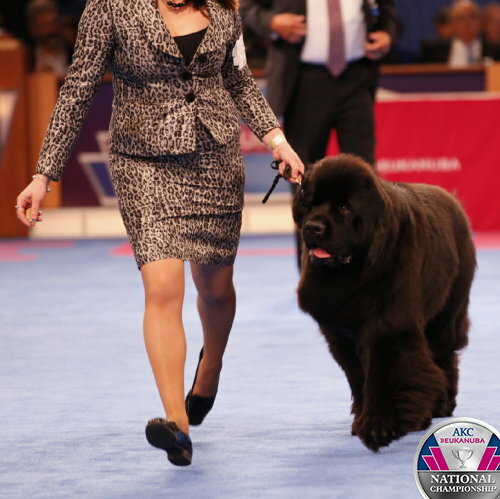 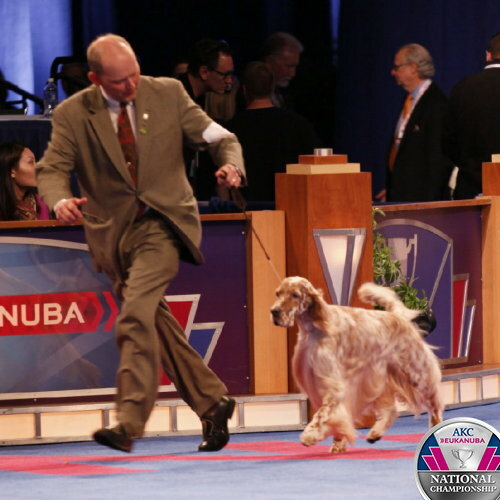 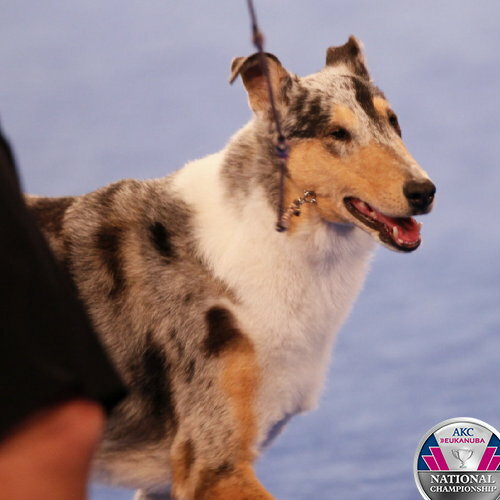 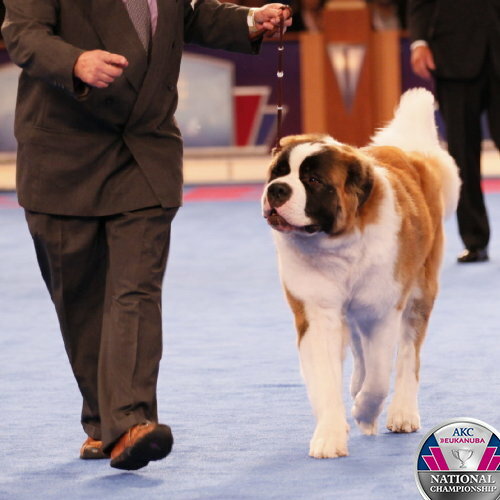 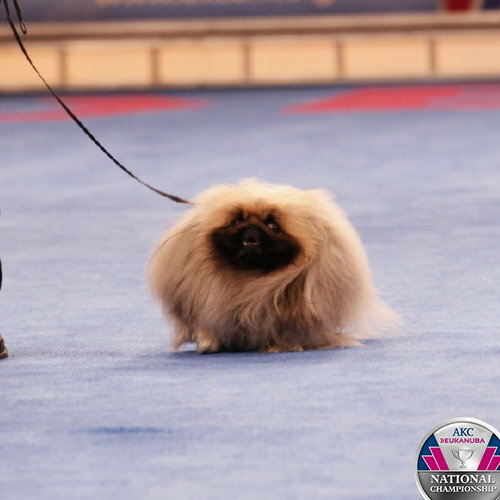 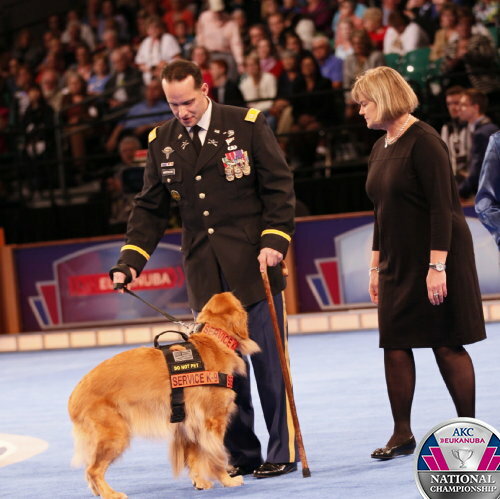 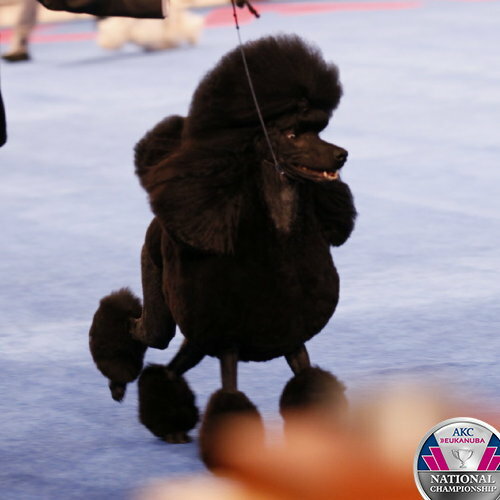 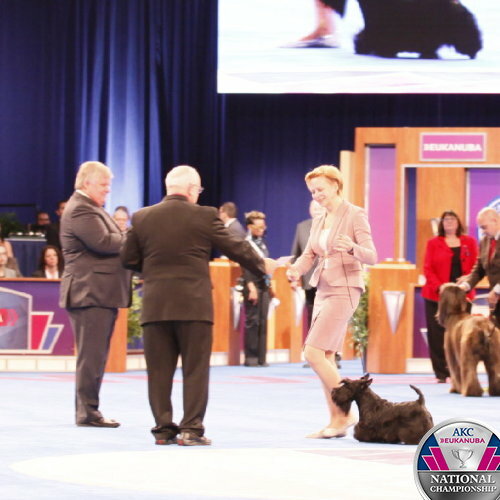 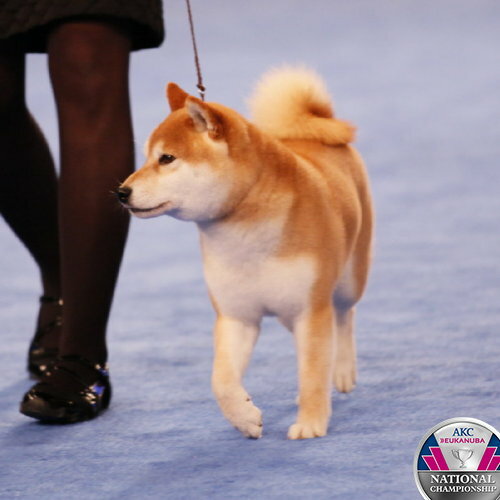 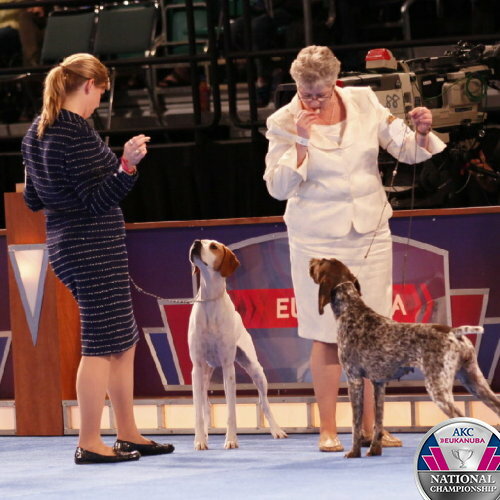 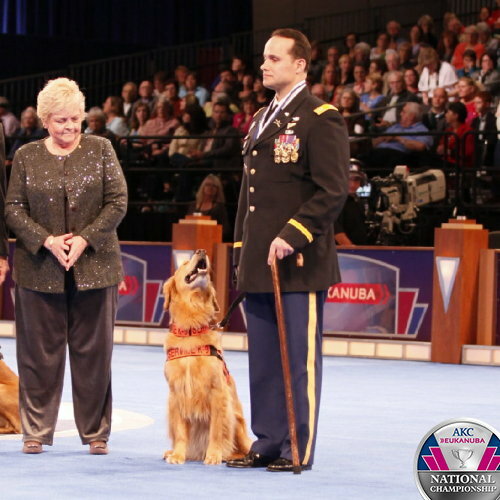 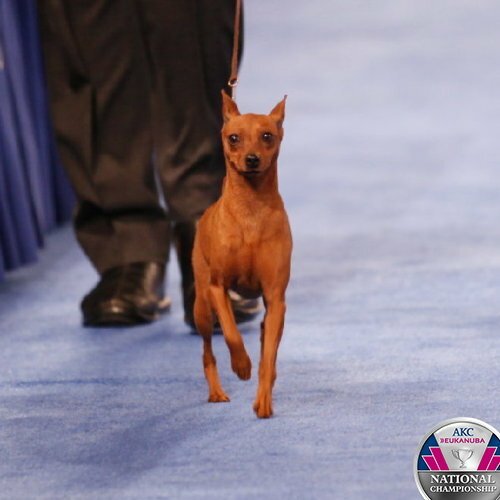 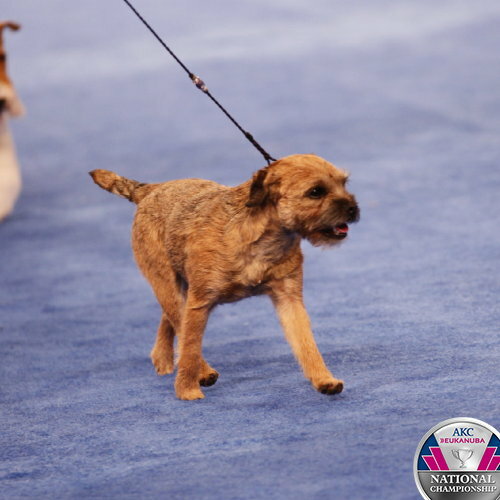 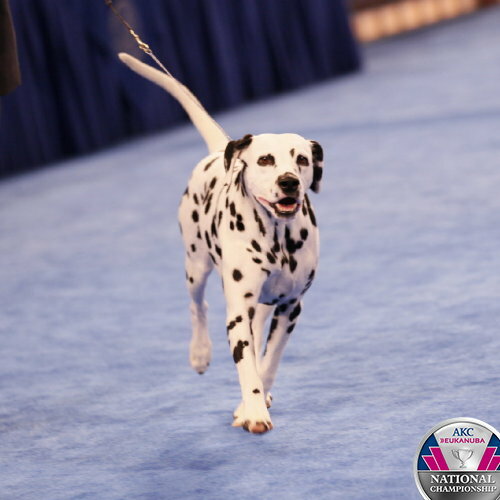 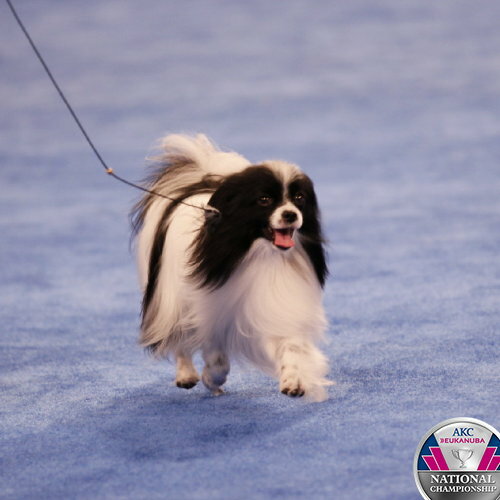 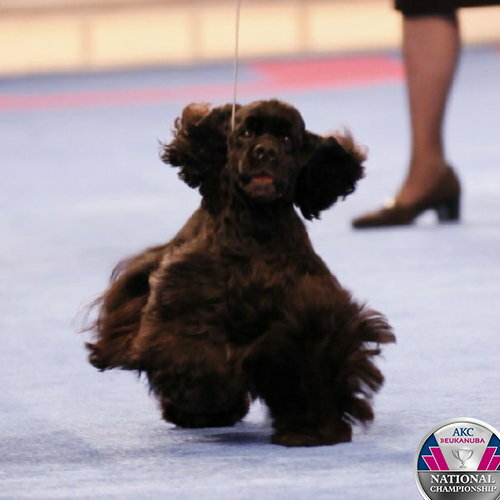 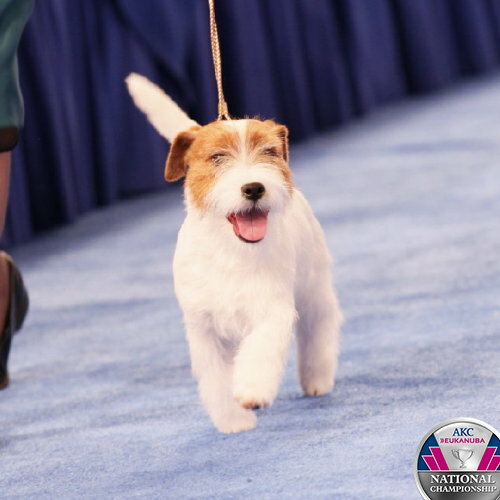 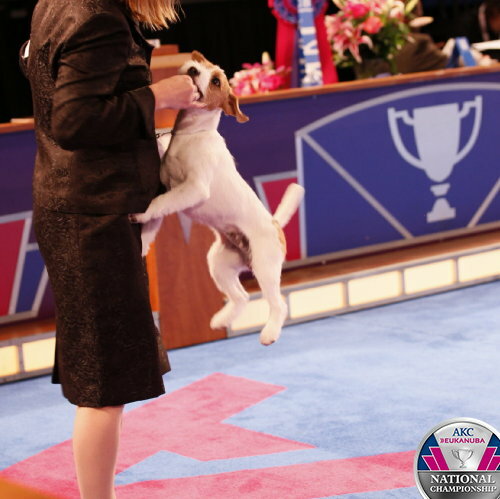 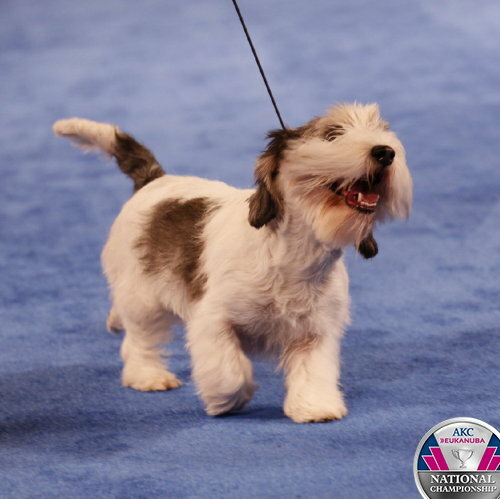 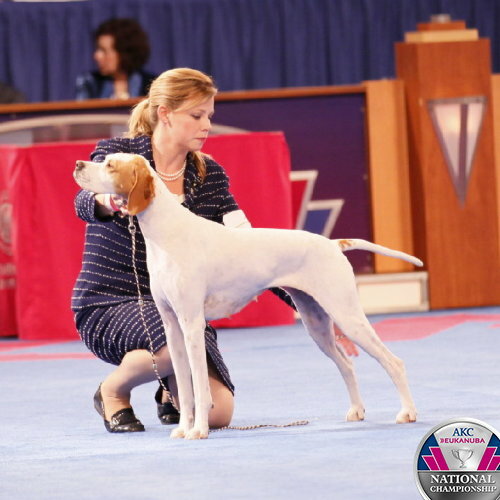 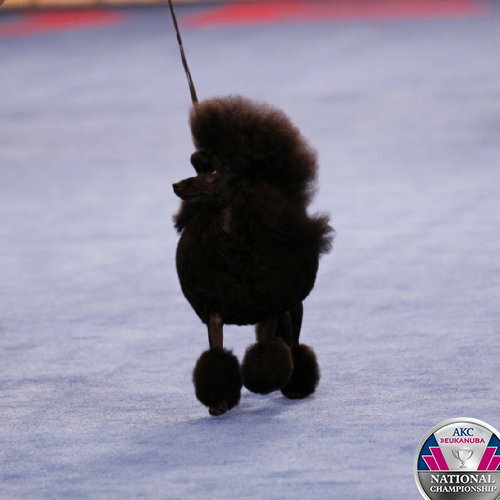 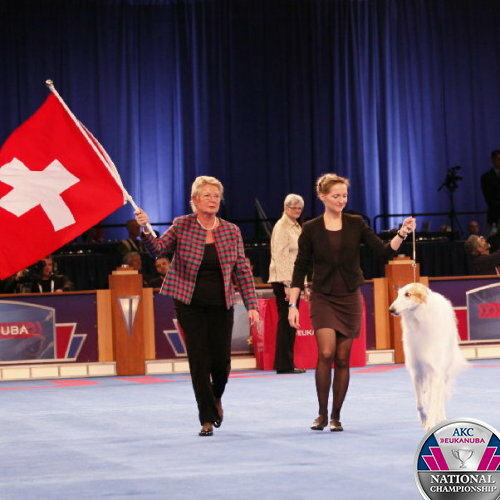 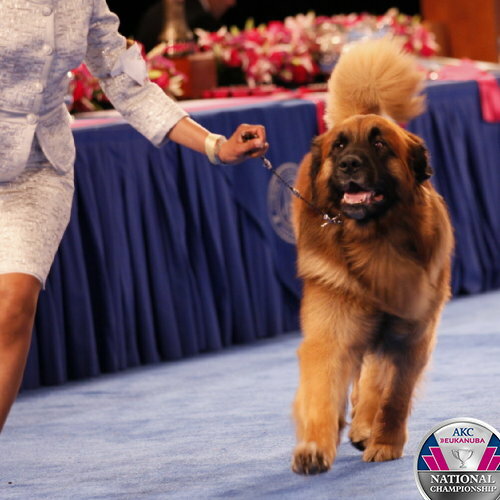 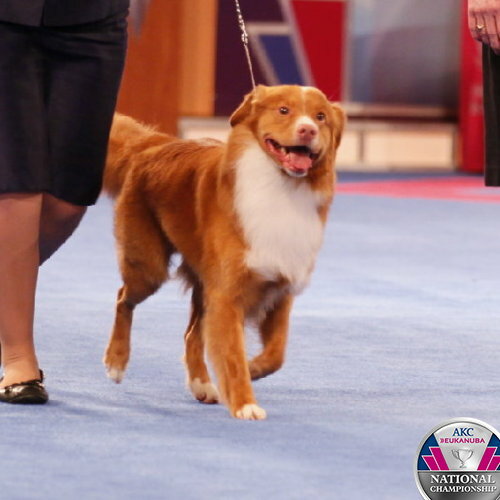 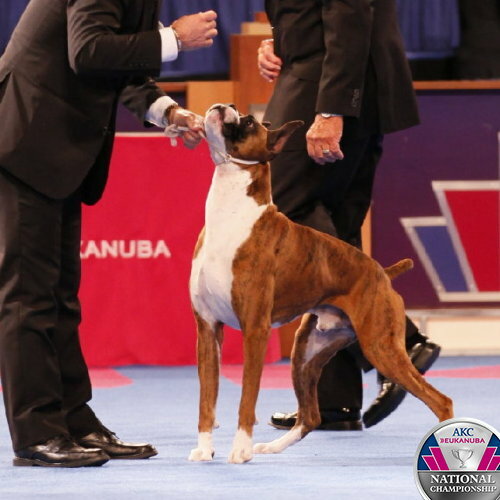 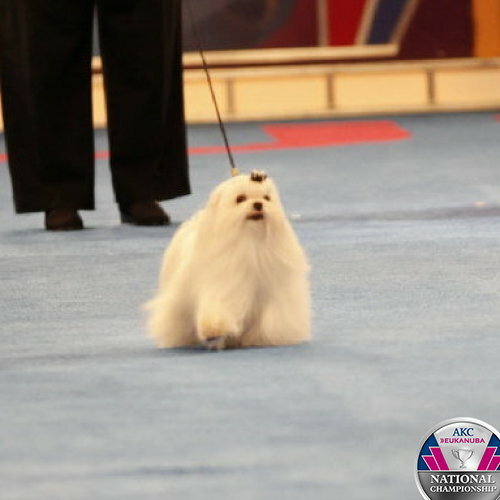 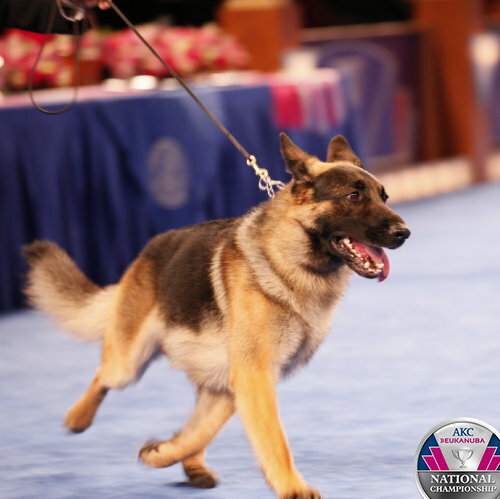 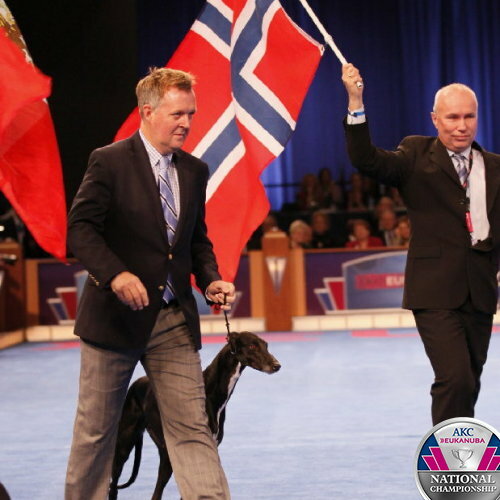 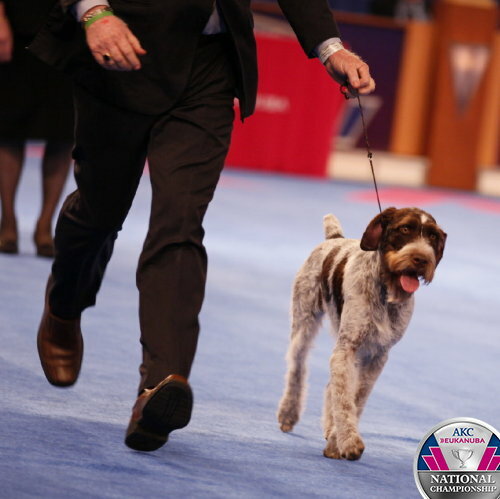 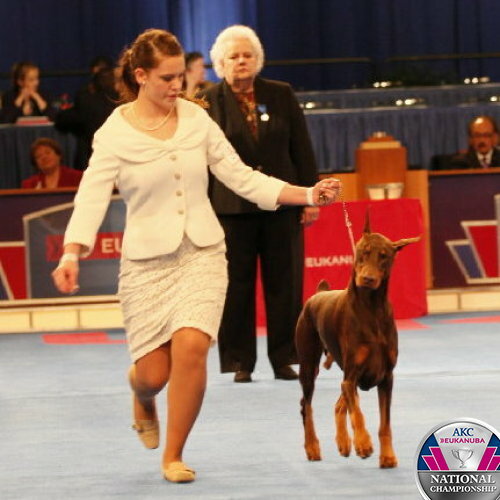 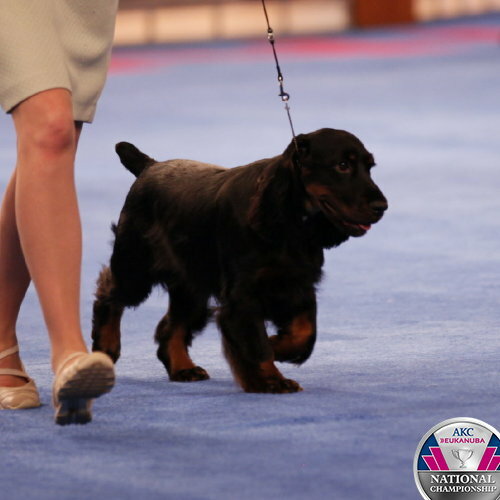 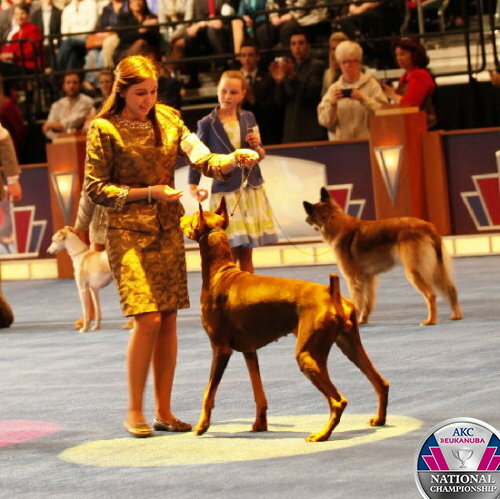 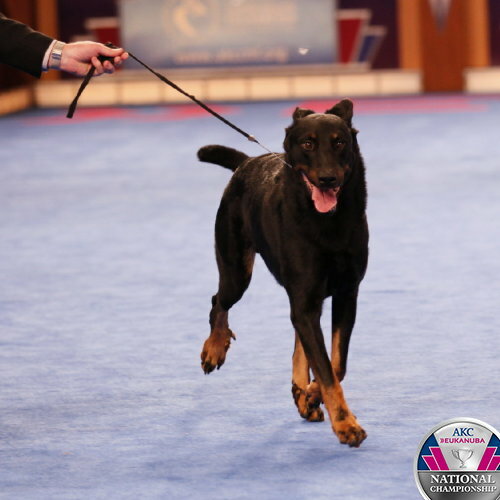 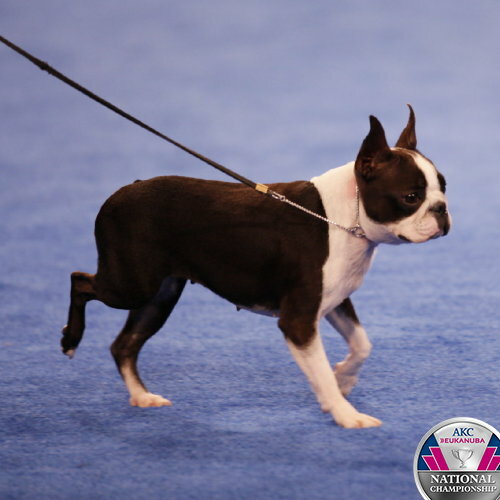 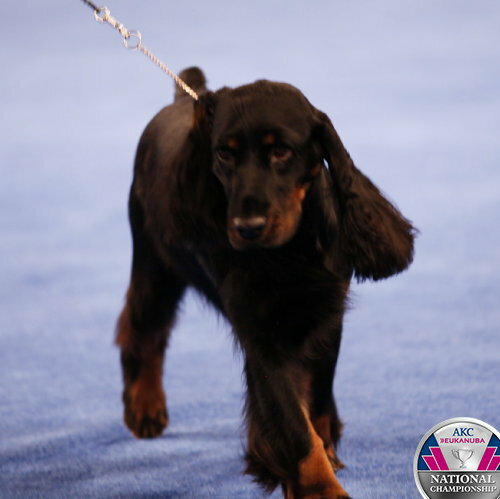 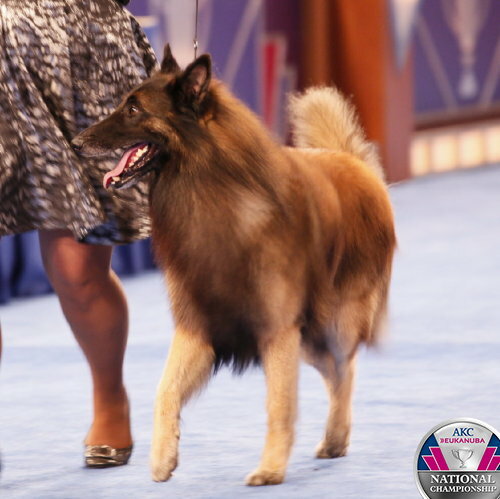 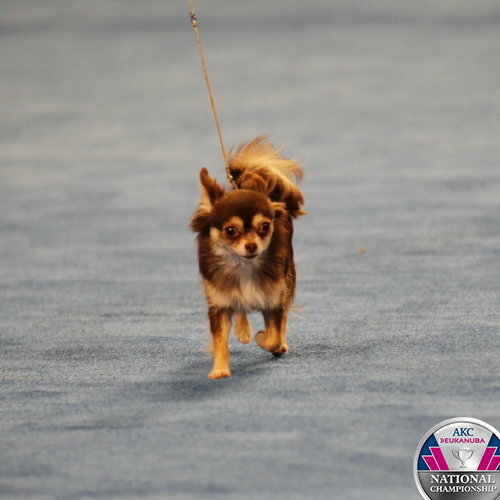 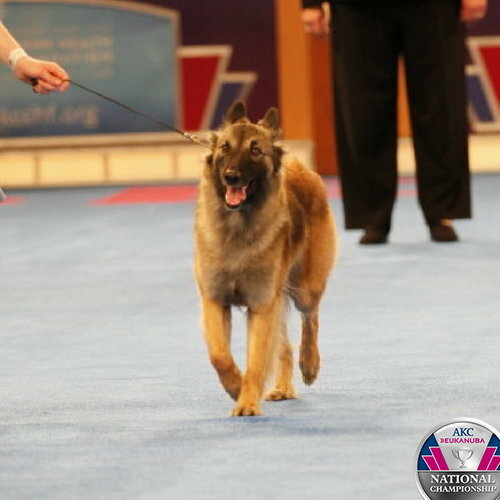 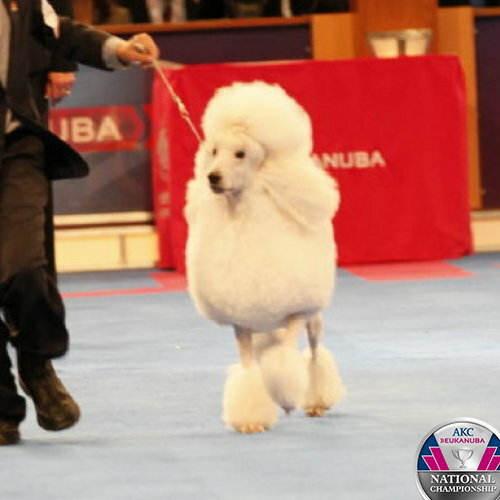 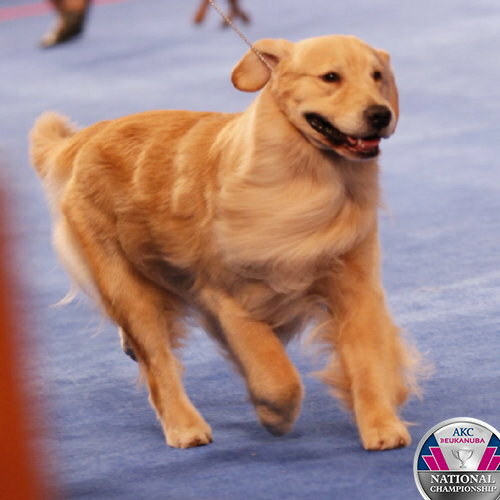 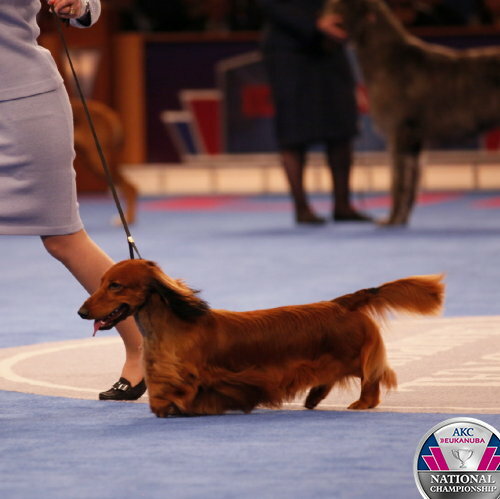 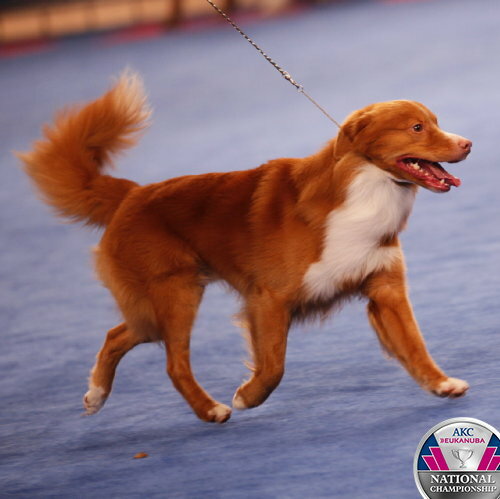 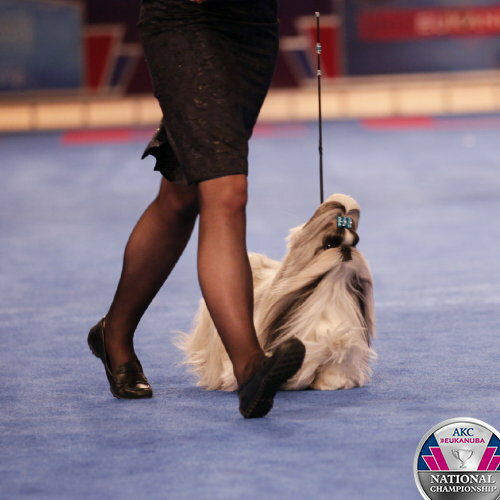 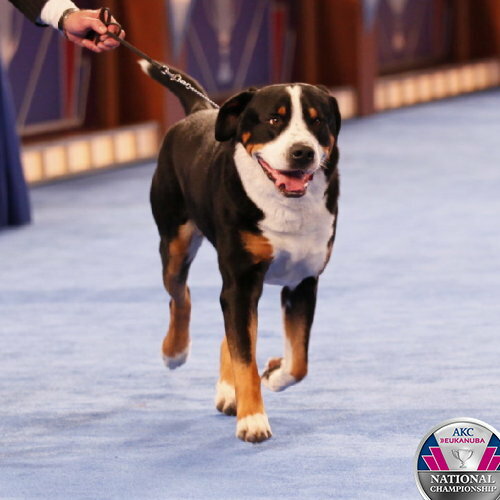 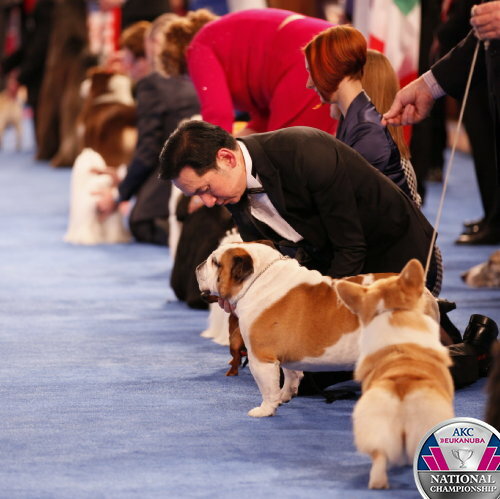 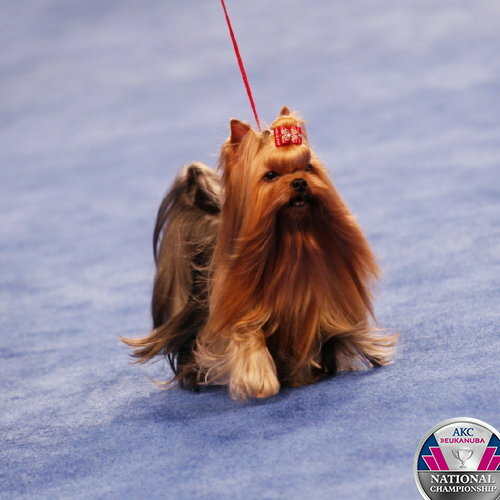 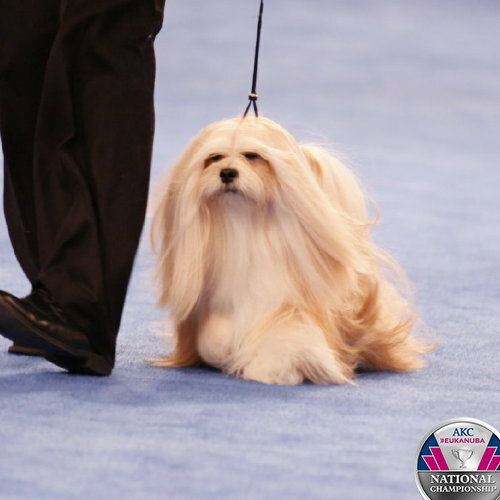 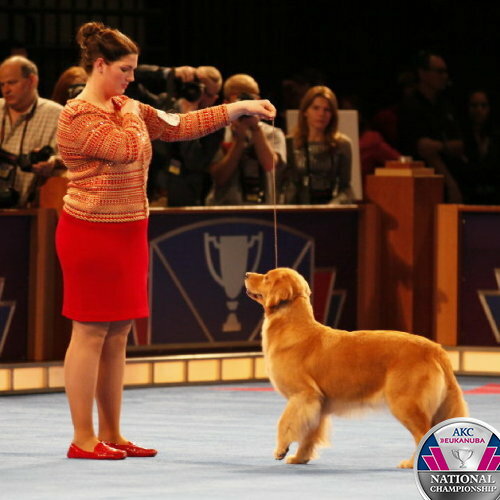 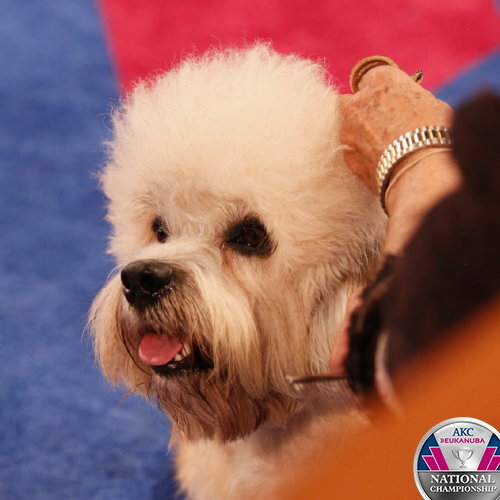 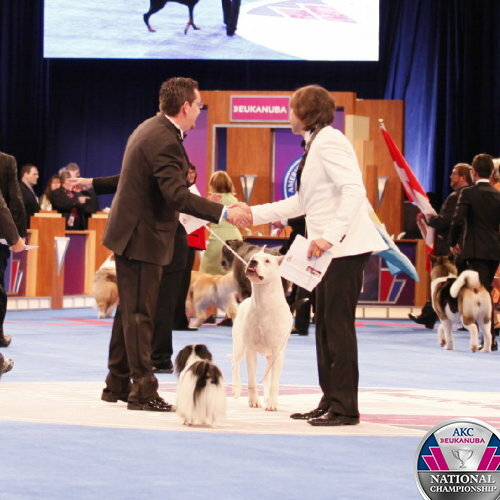 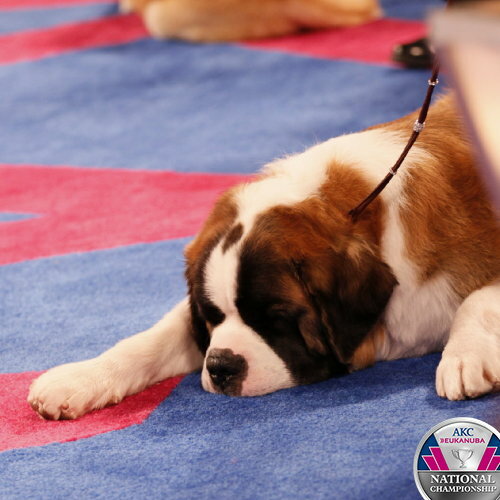 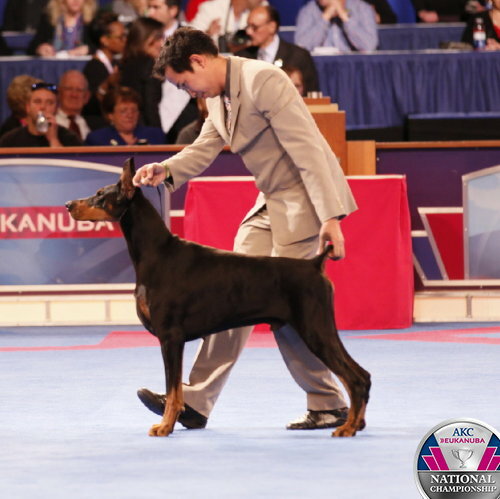 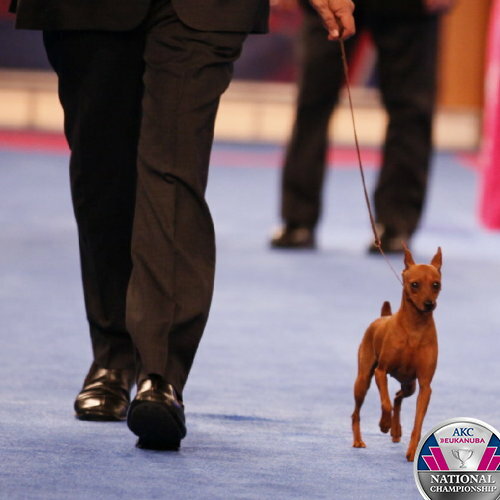 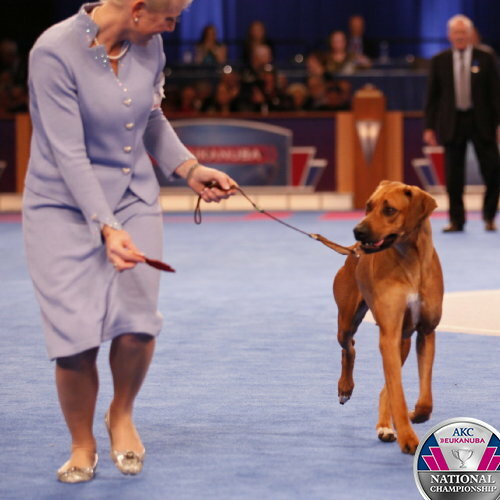 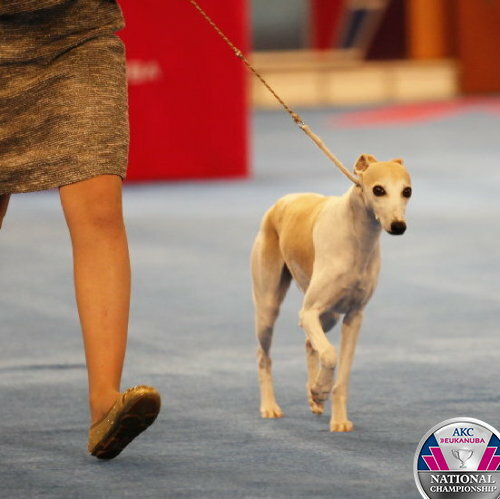 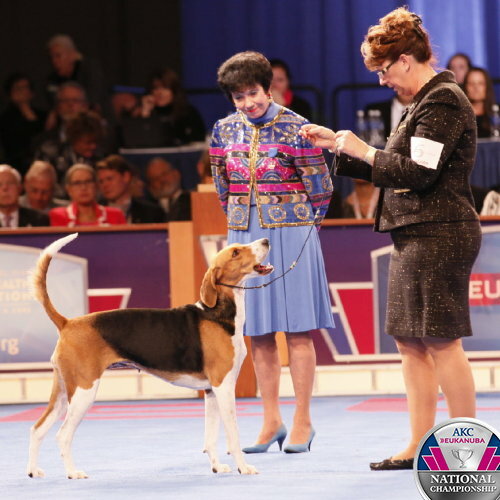 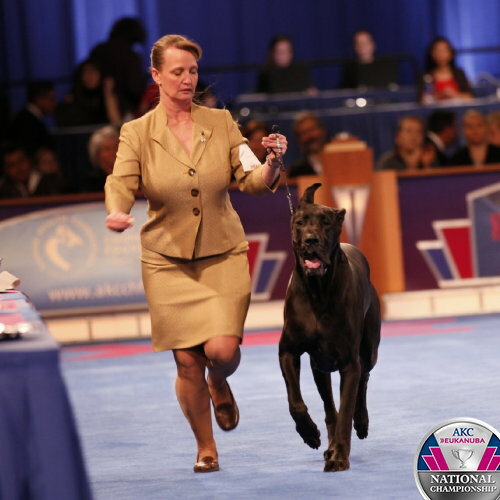 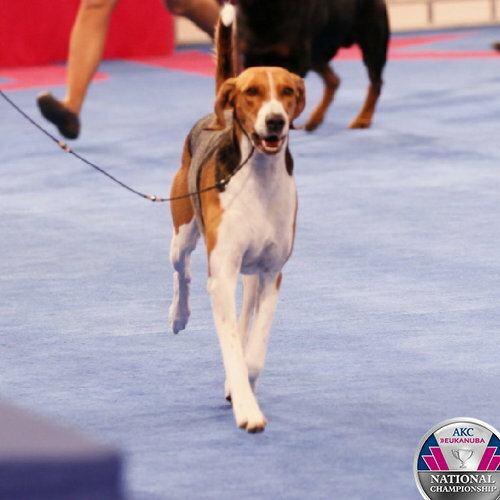 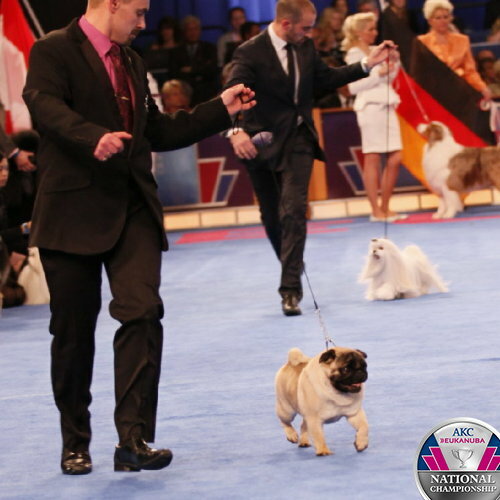 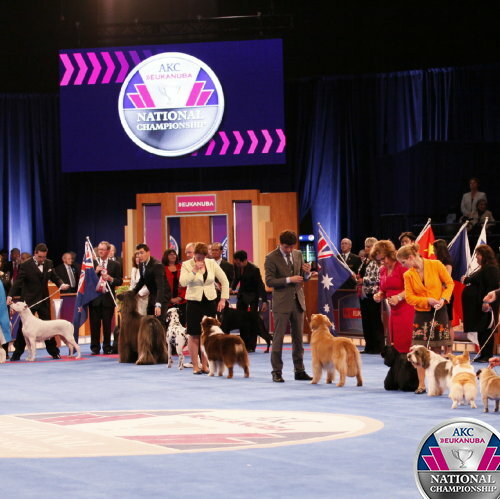 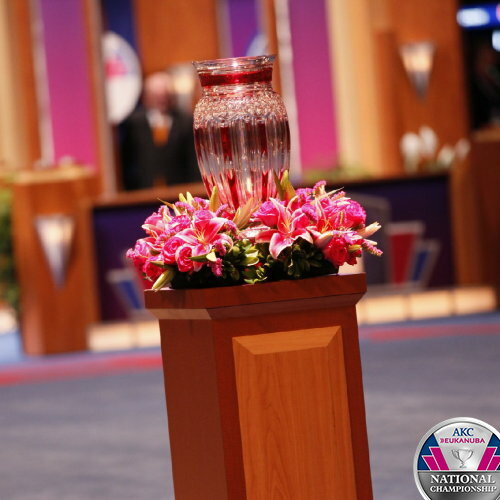 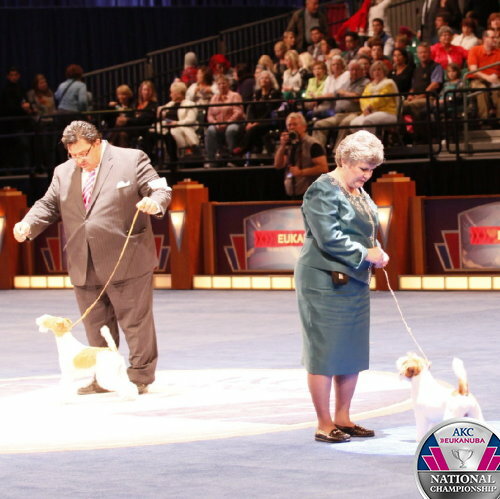 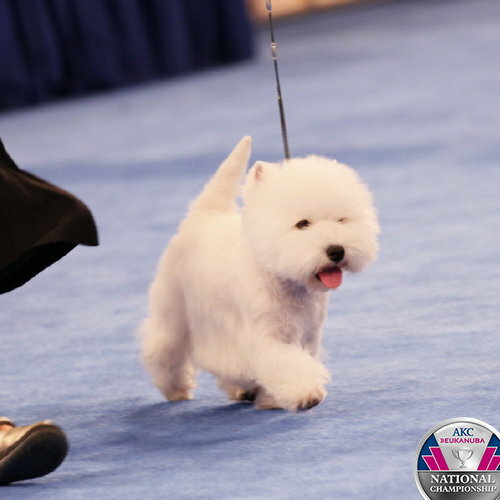 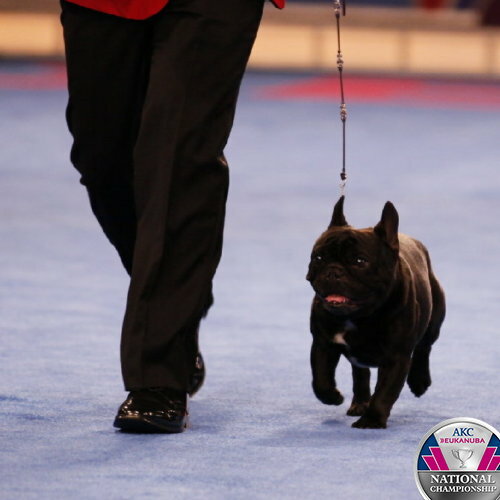 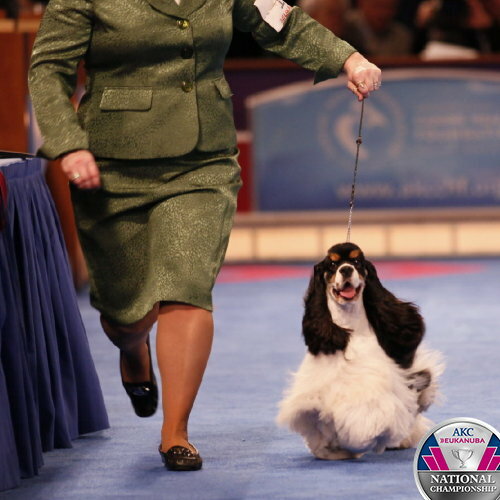 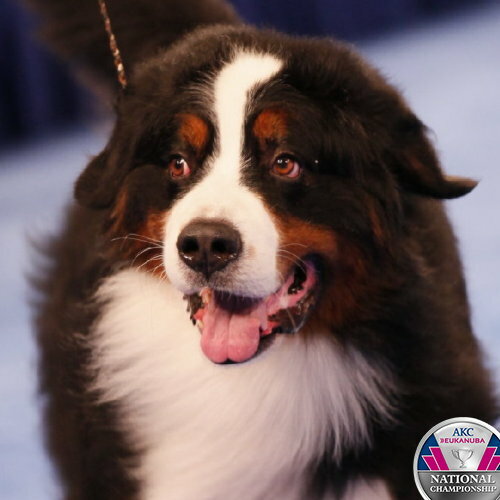 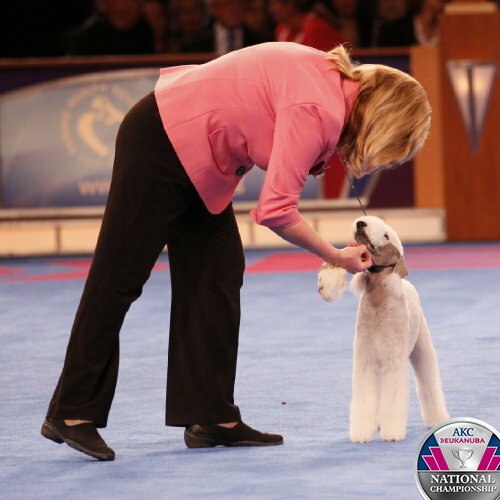 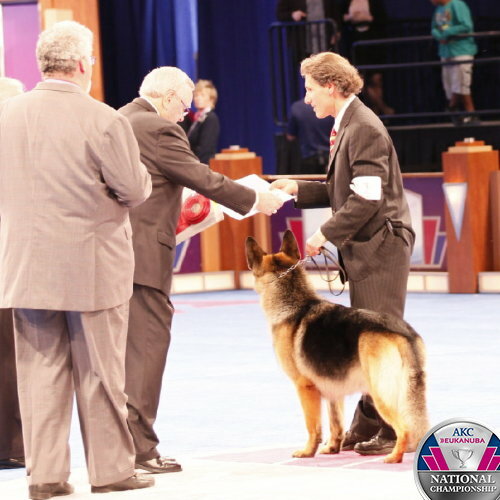 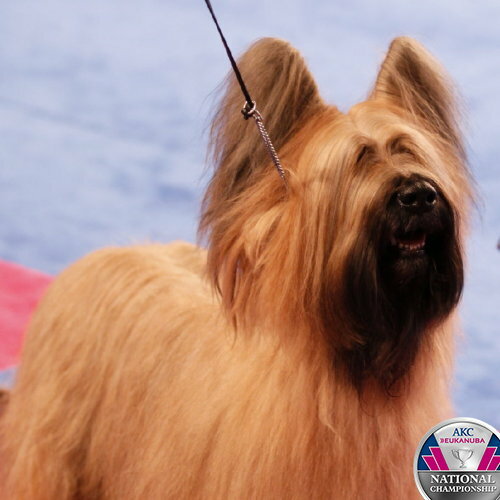 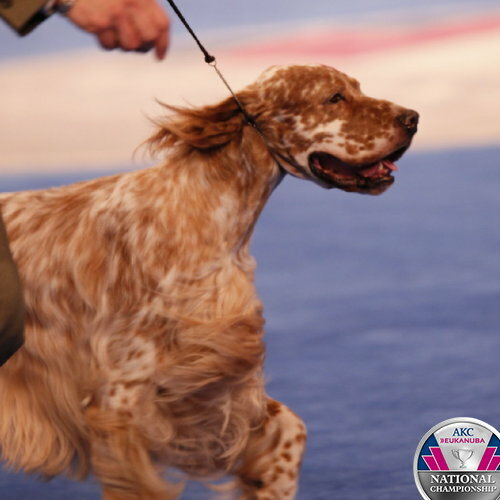 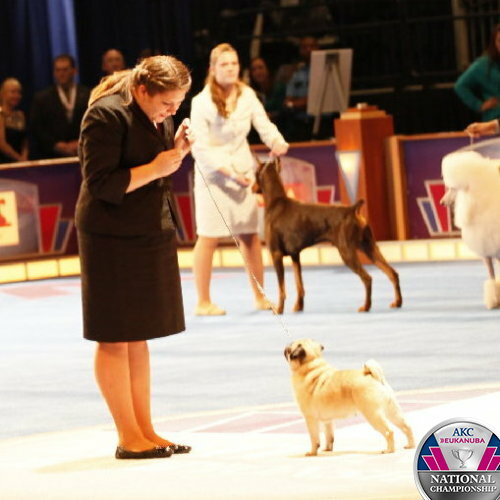 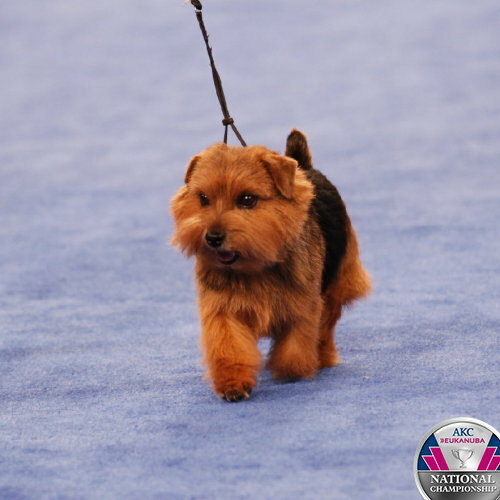 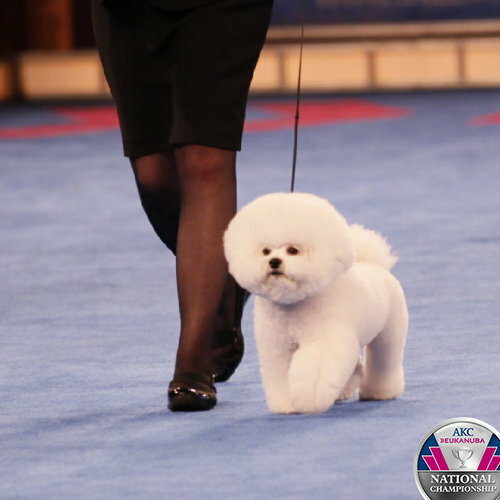 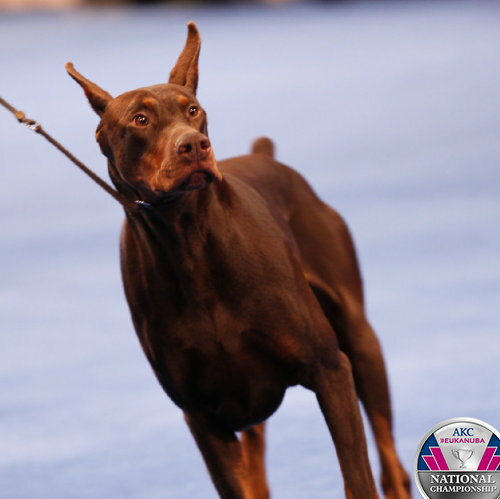 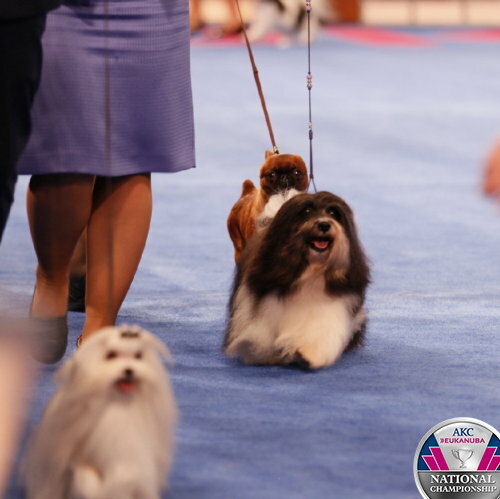 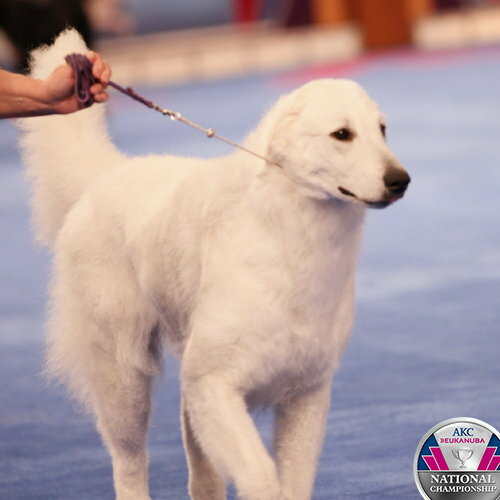 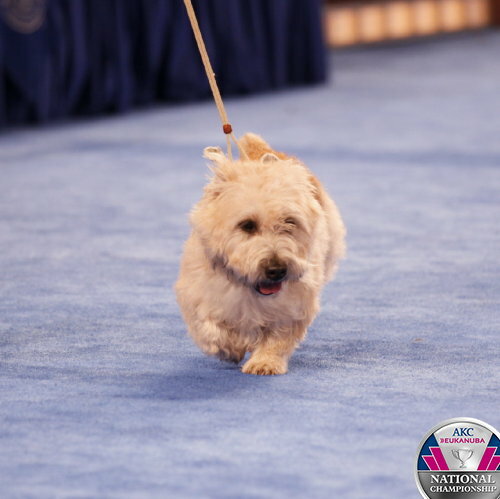 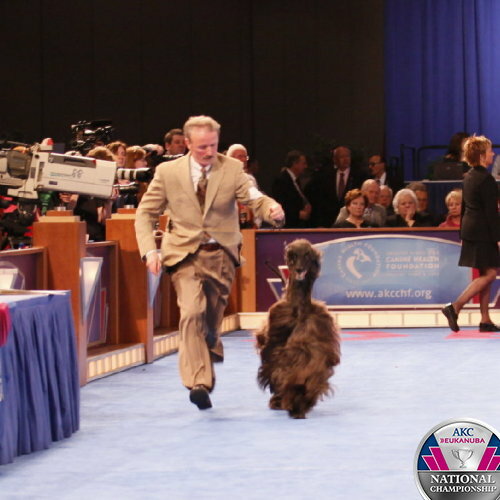 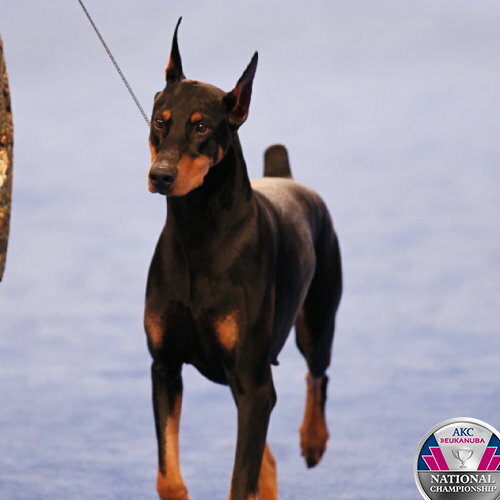 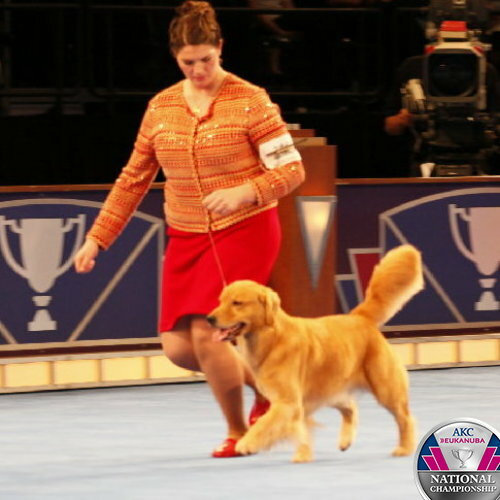 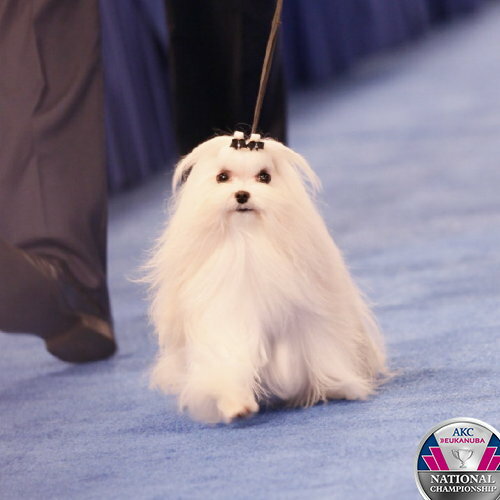 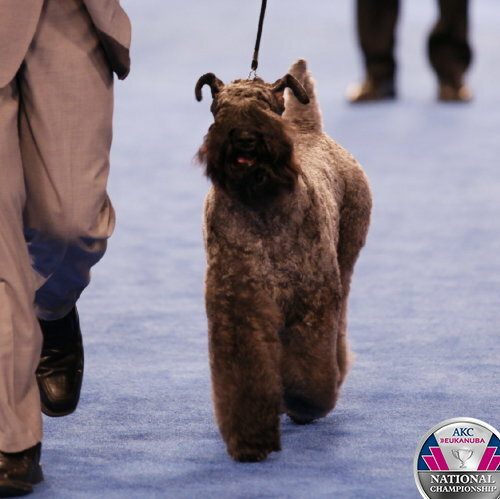 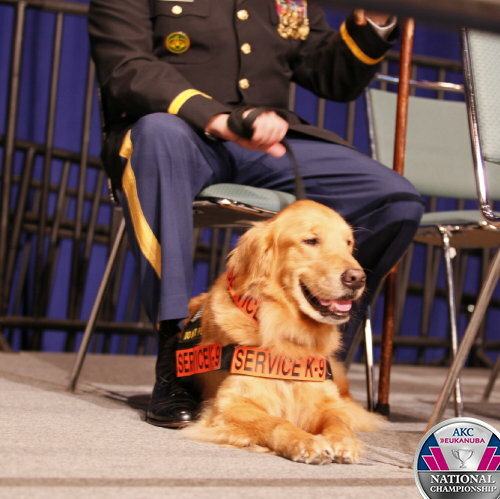 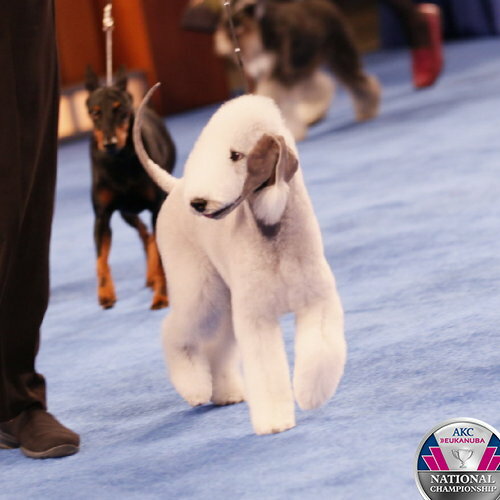 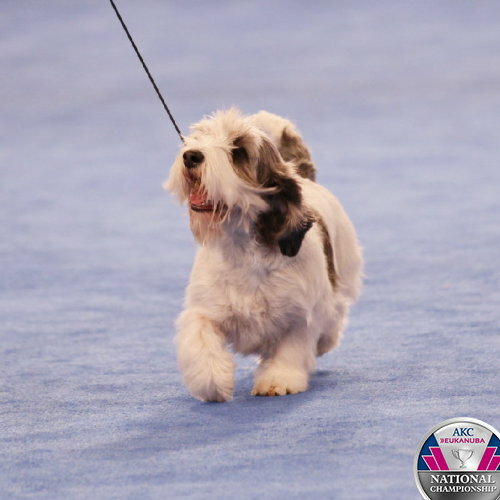 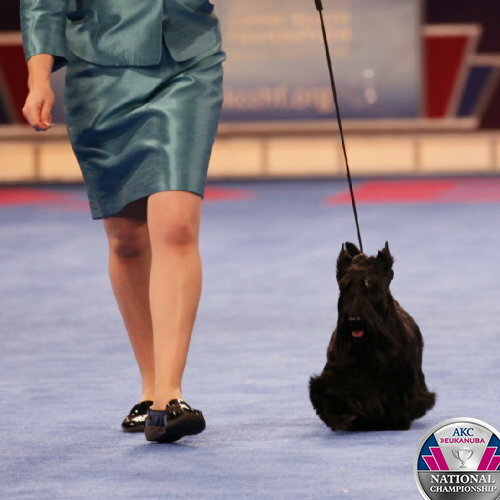 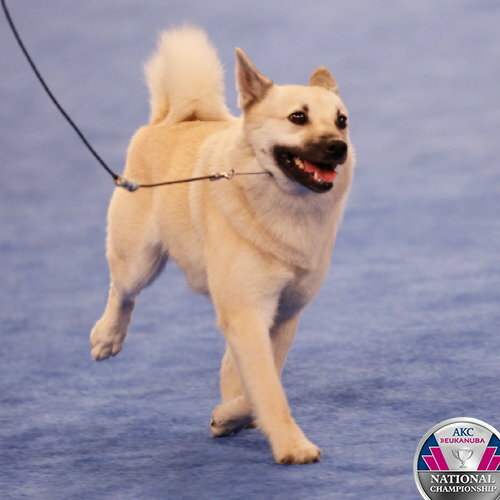 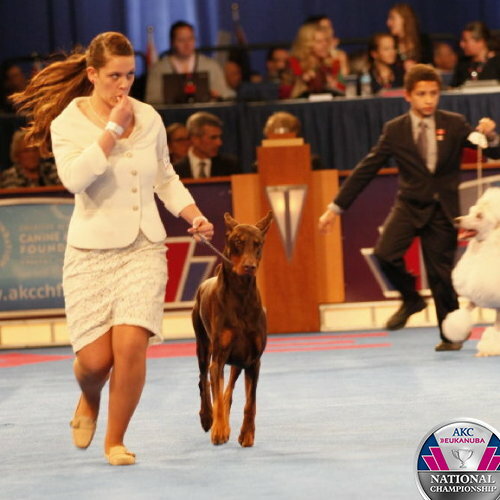 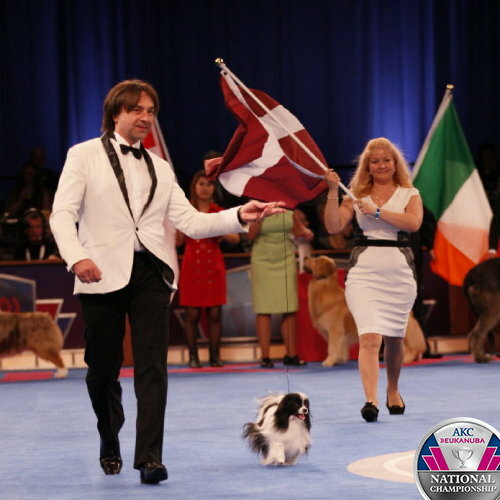 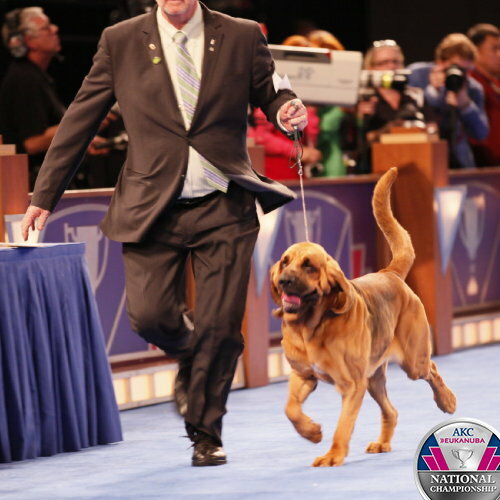 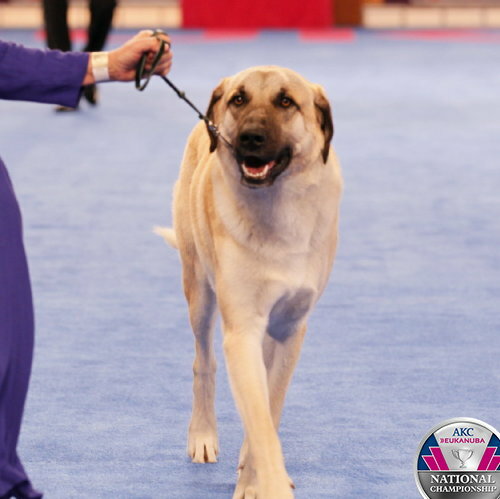 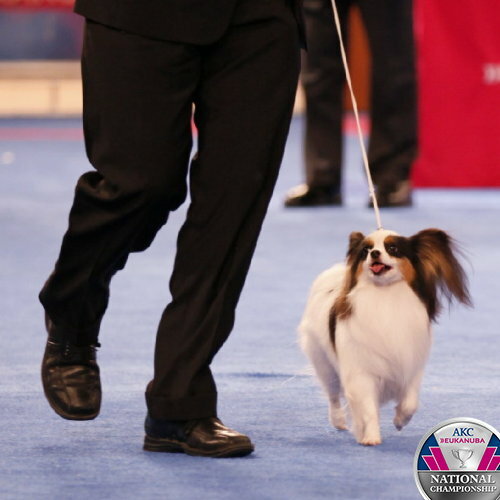 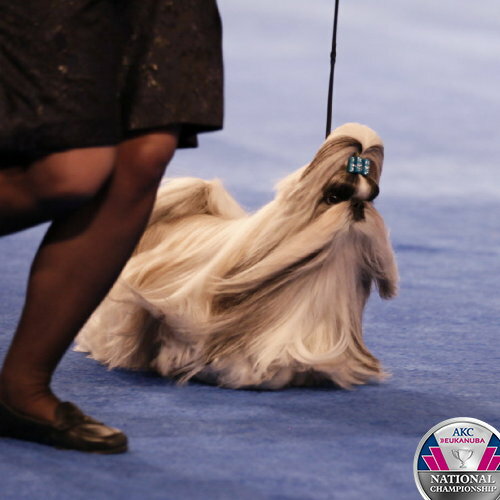 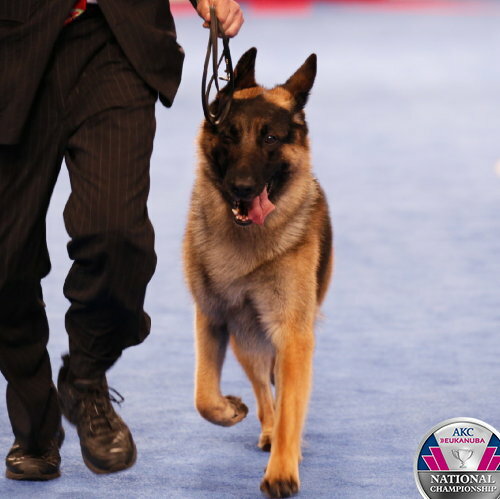 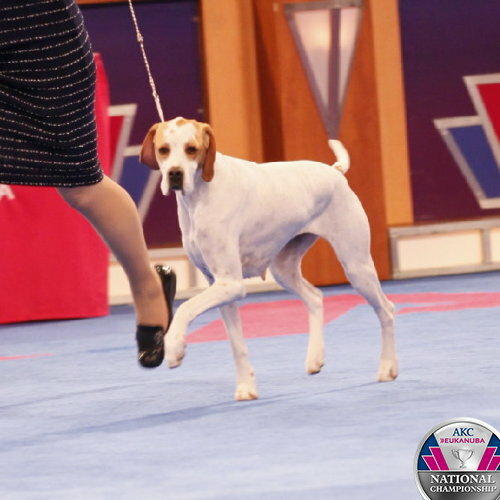 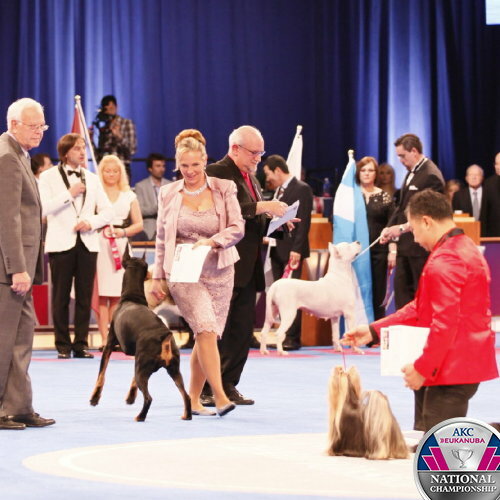 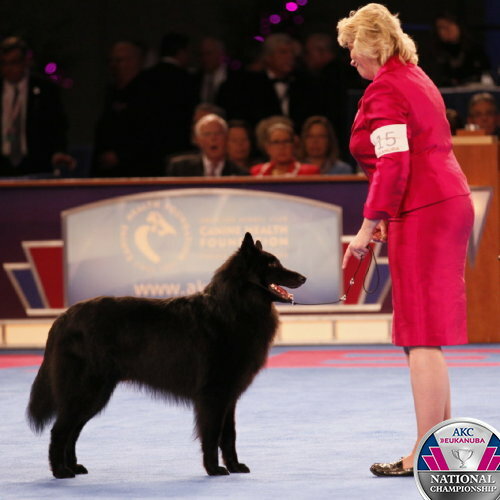 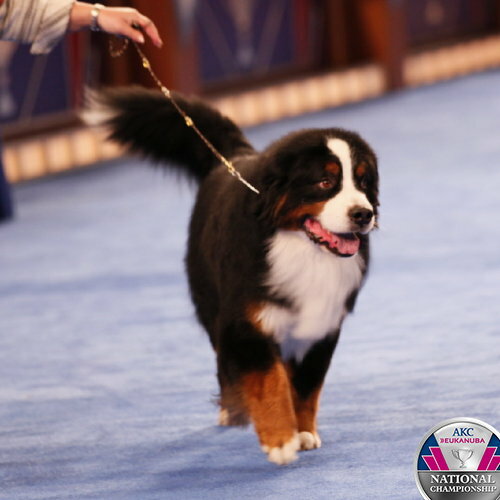 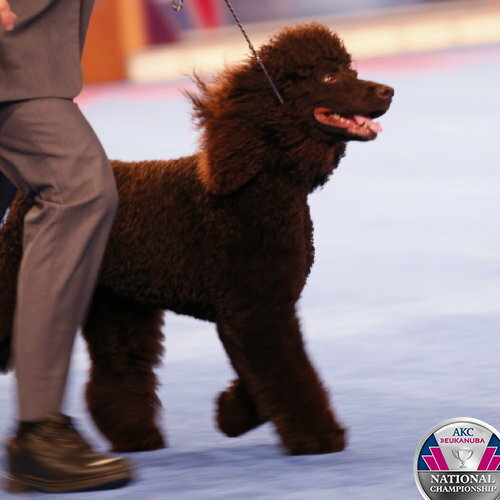 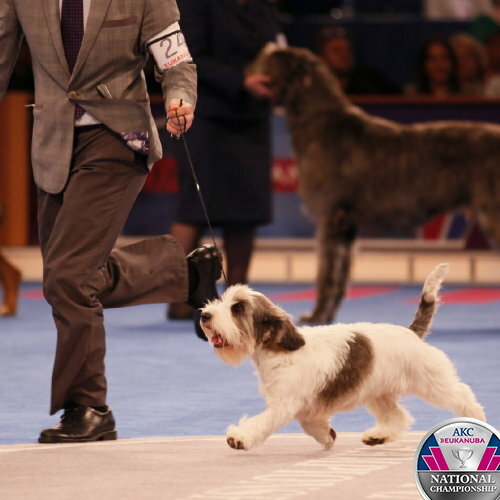 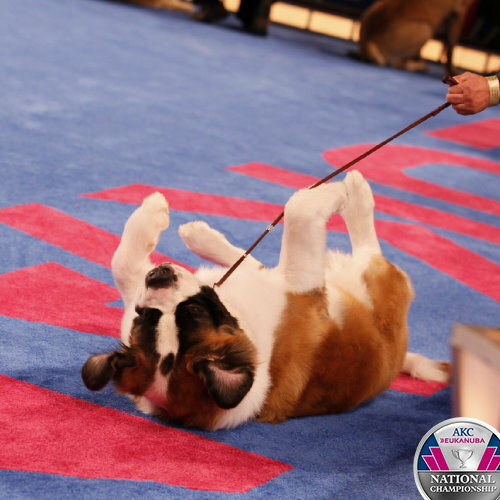 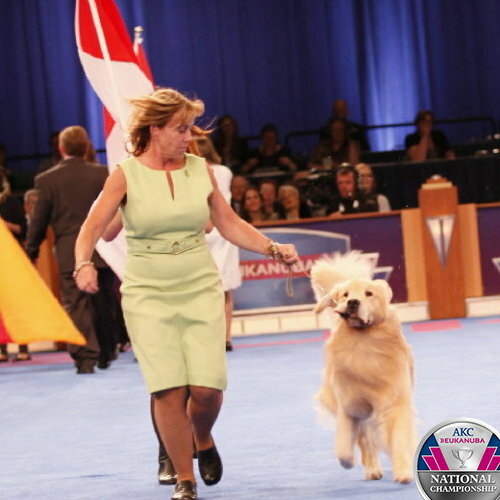 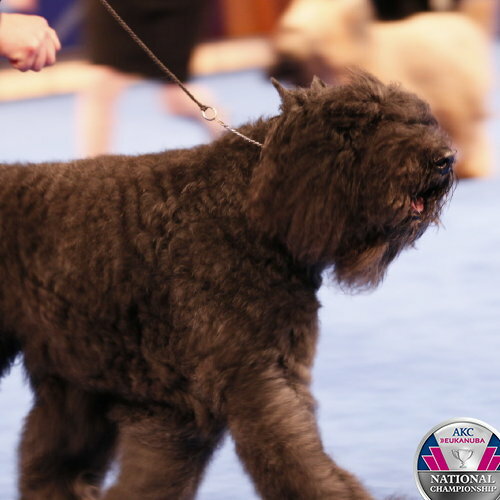 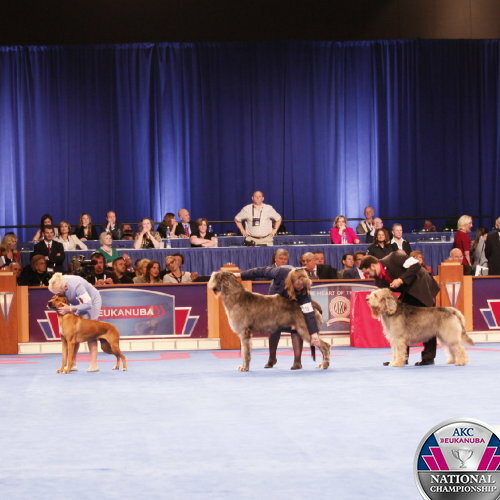 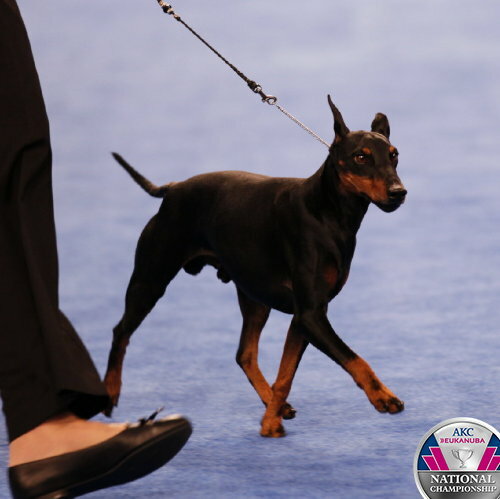 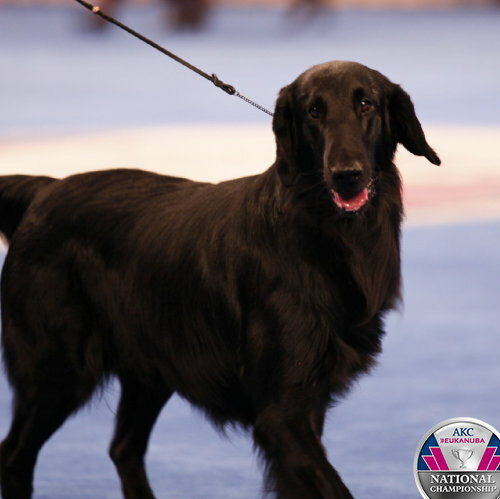 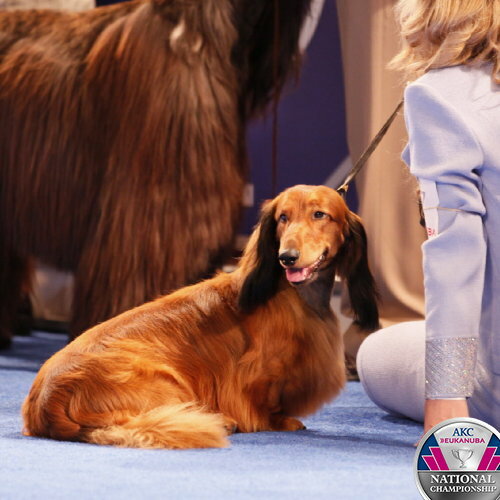 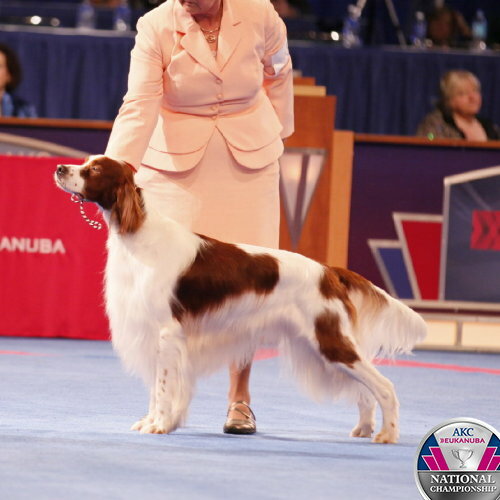 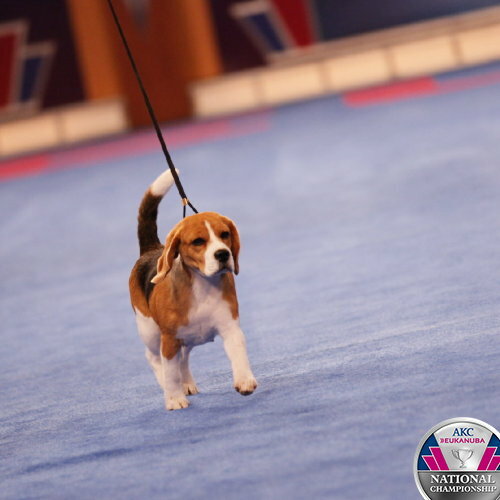 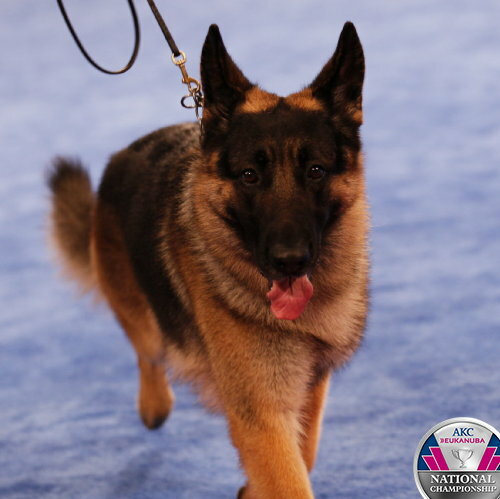 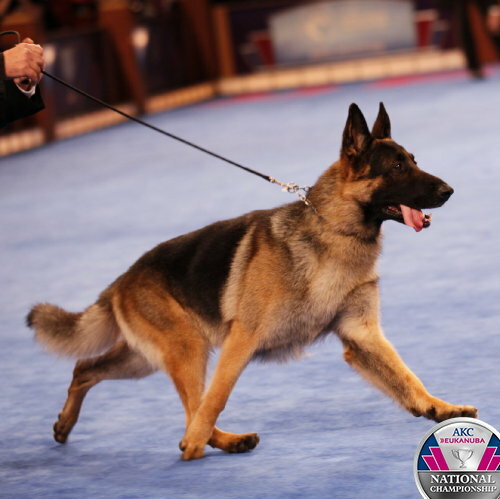 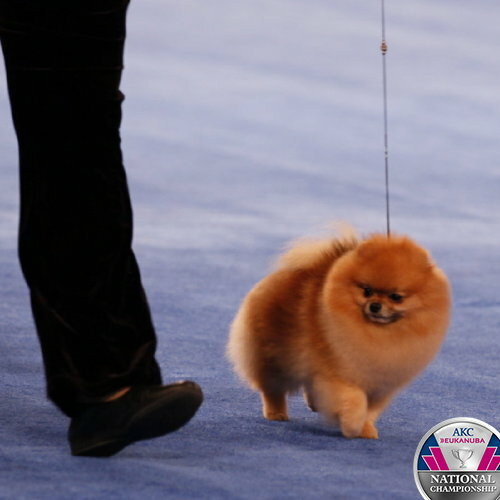 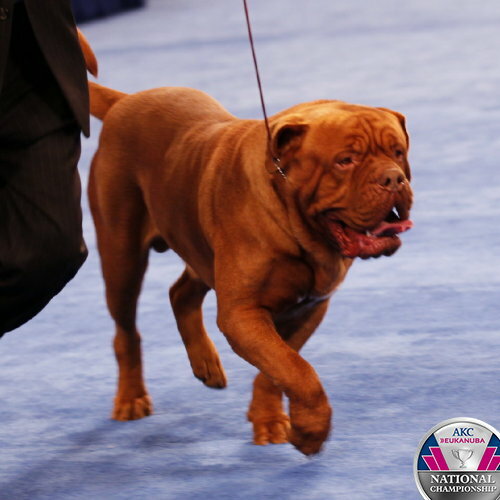 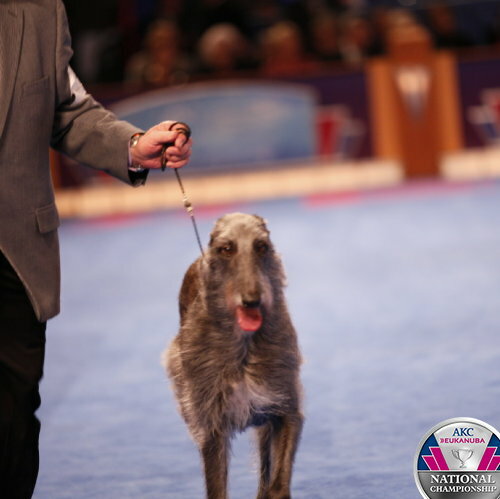 Special events including Junior Showmanship Finals, Eukanuba World Challenge Opening Ceremony and AKC Awards of Canine Excellence. 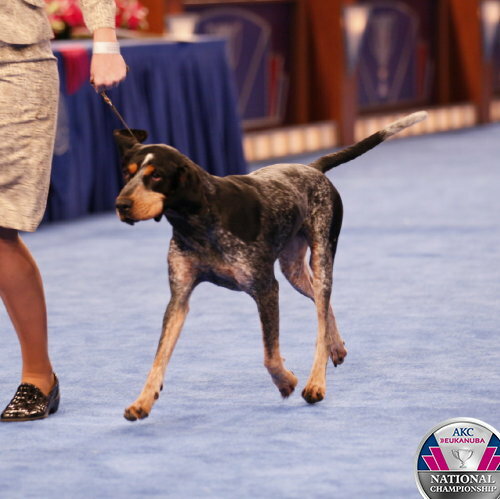 Blue Tick Coonhound breed judging. 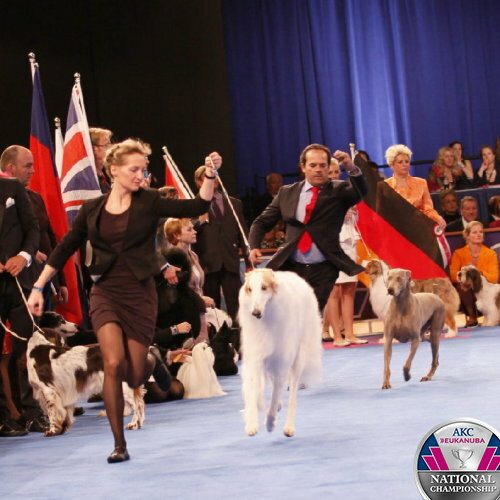 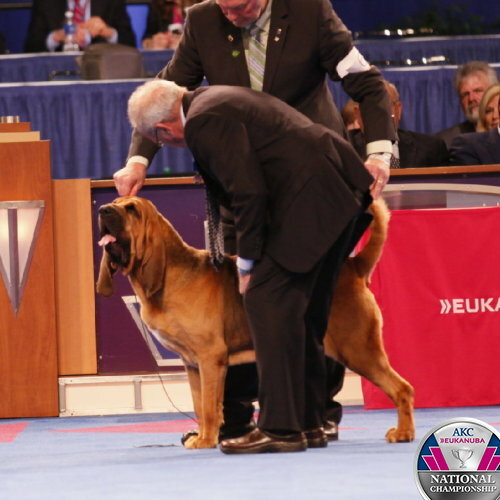 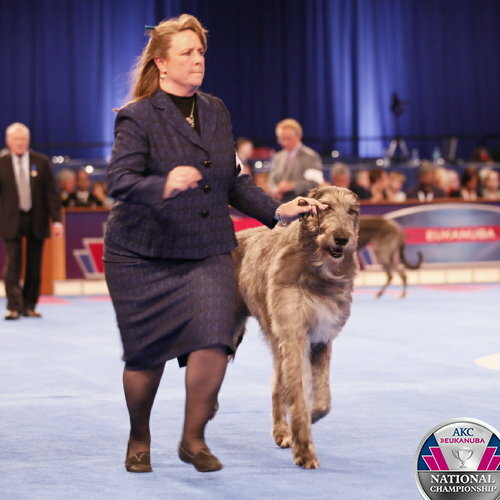 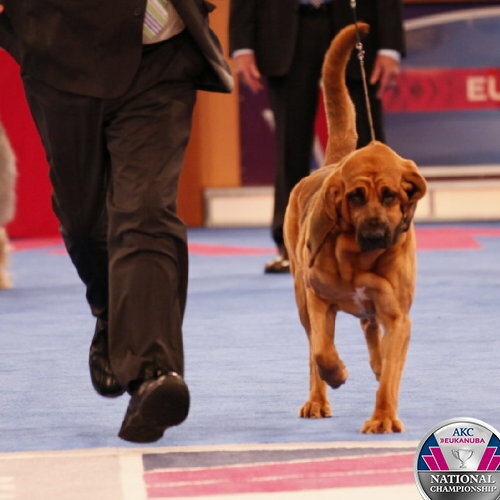 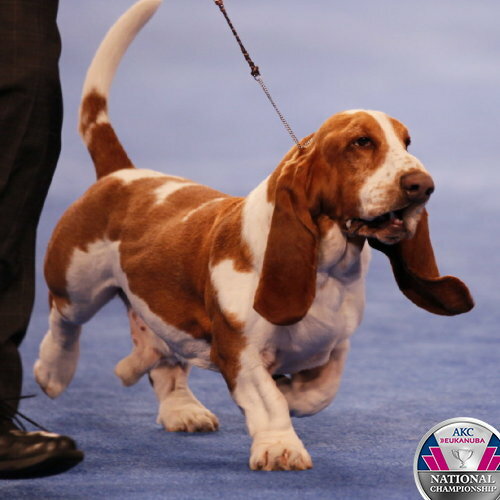 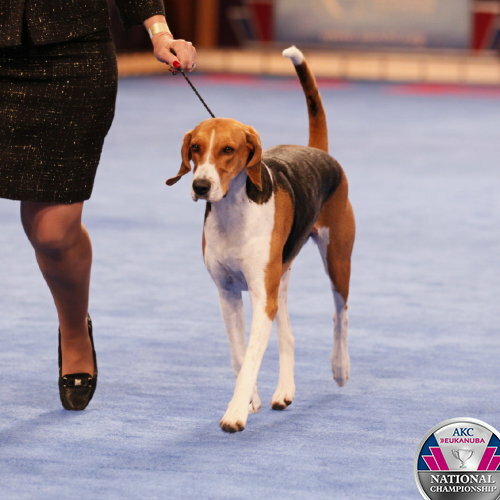 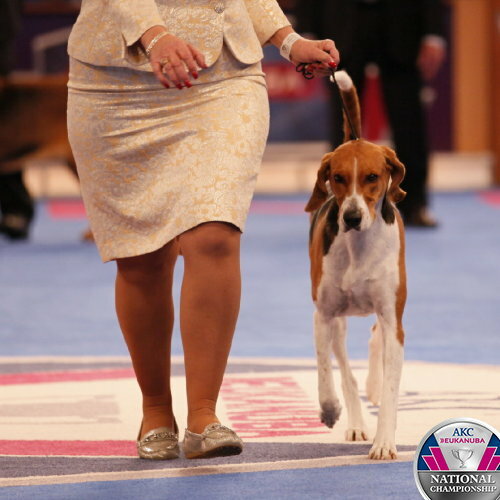 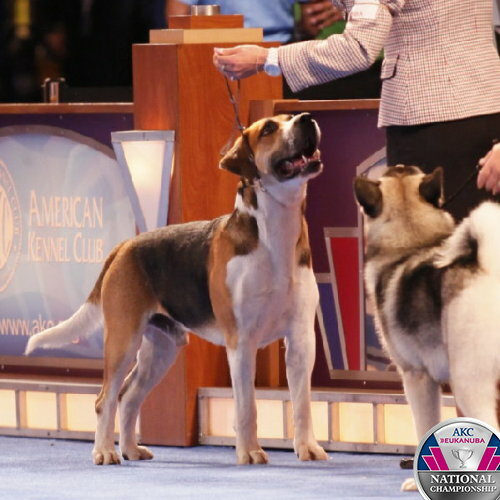 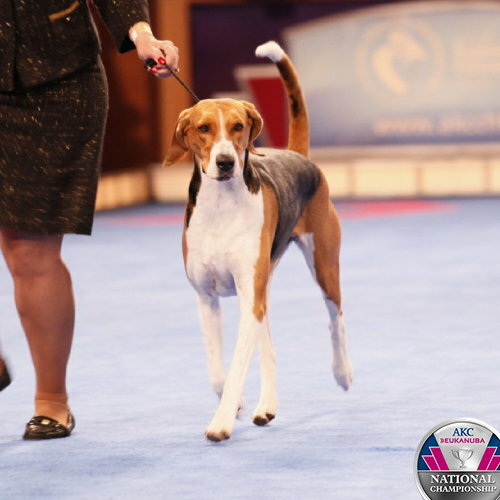 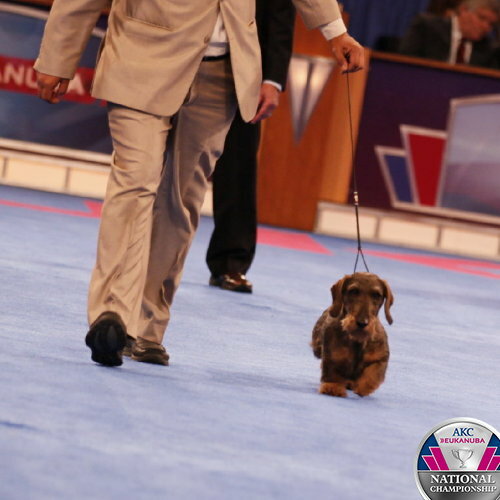 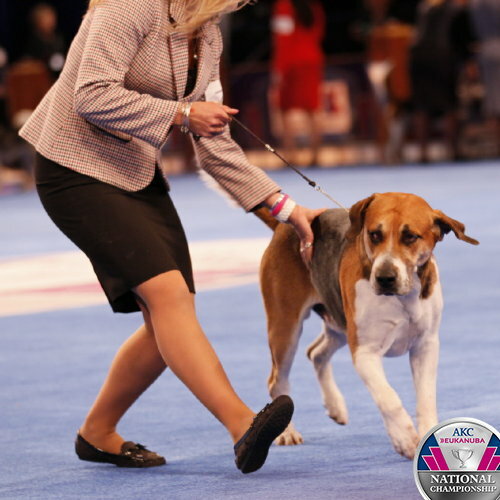 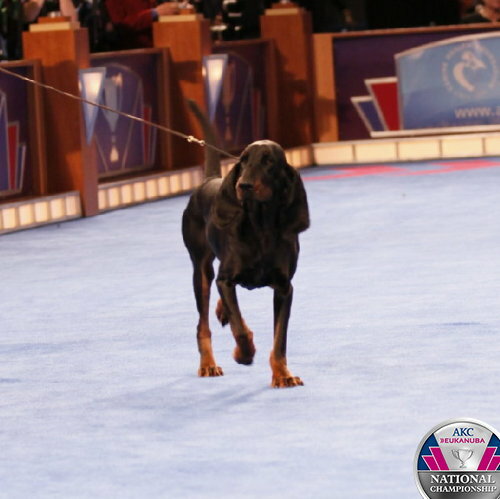 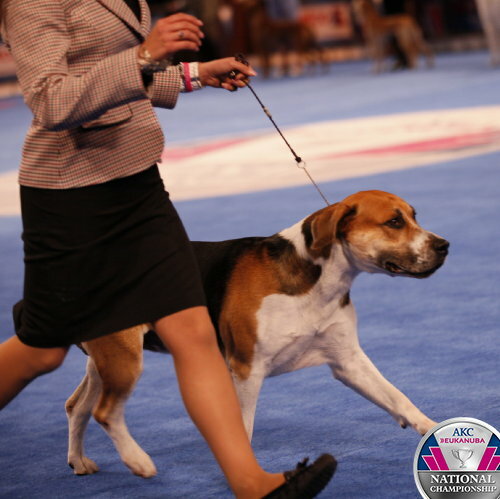 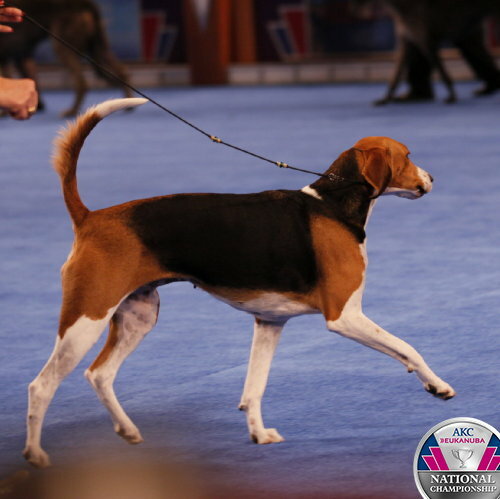 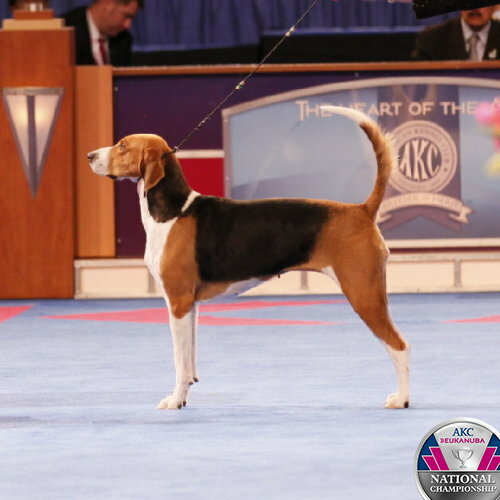 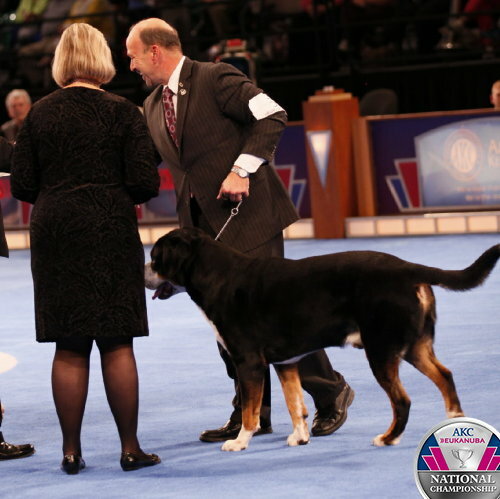 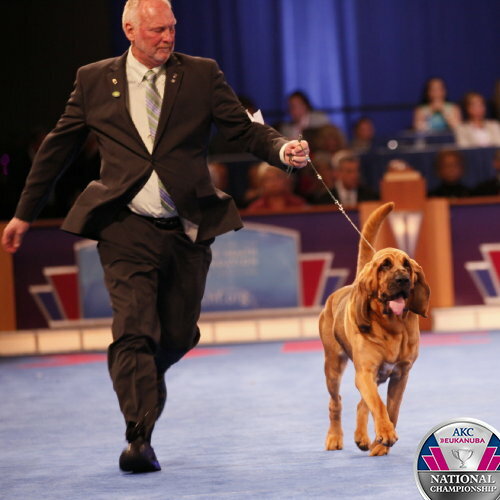 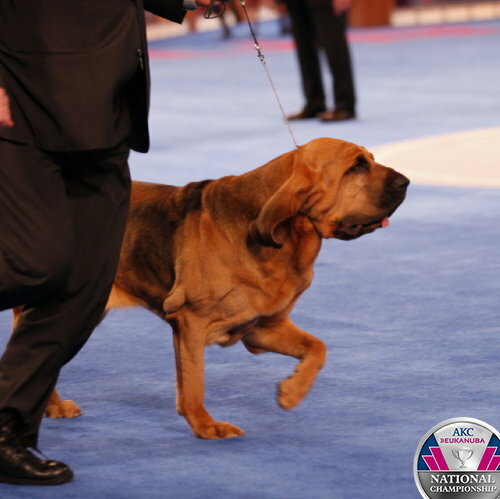 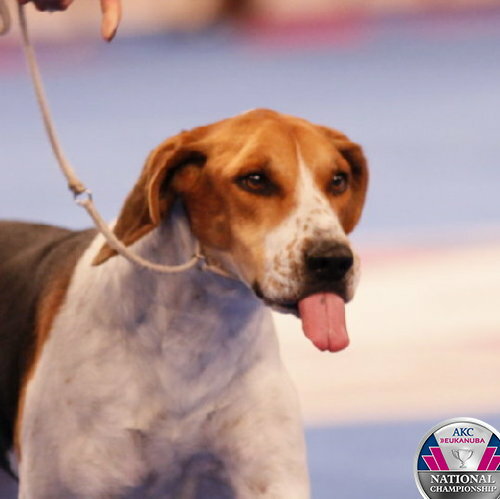 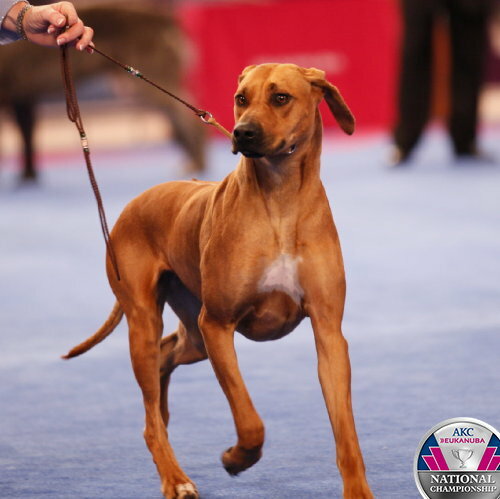 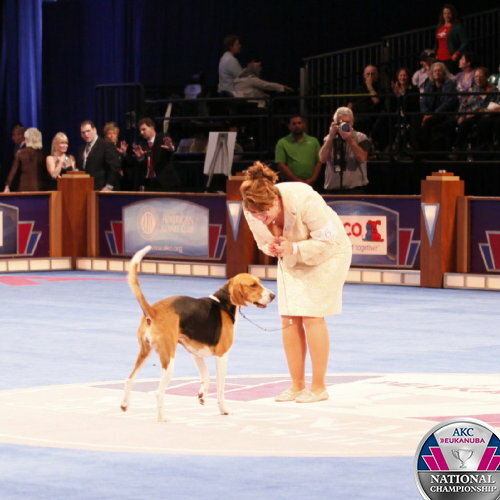 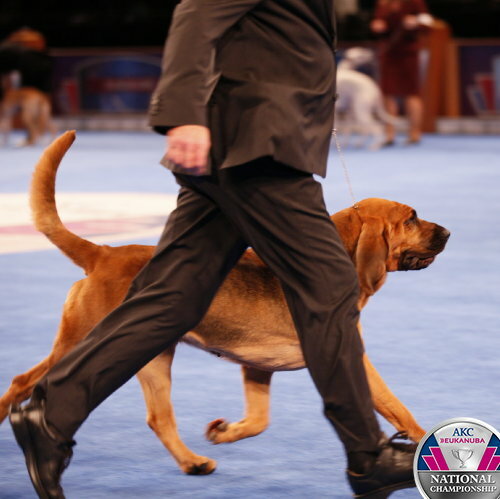 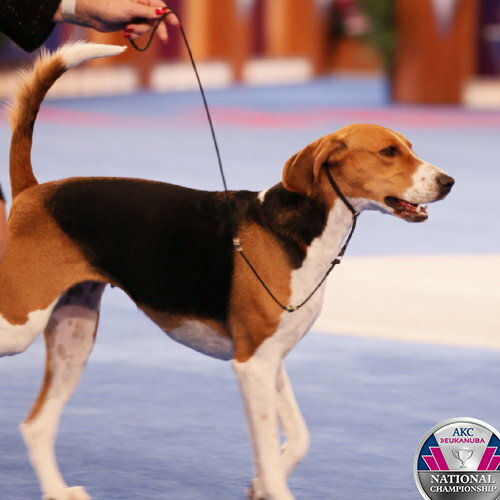 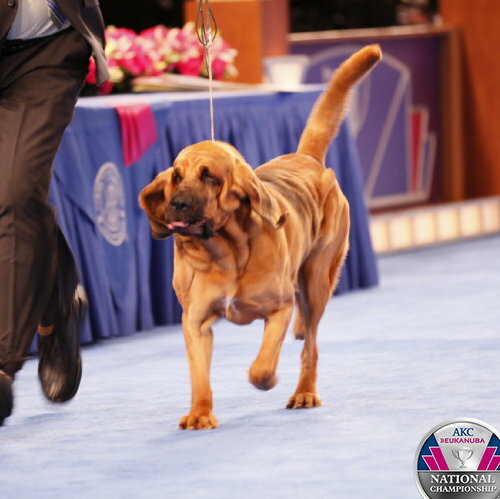 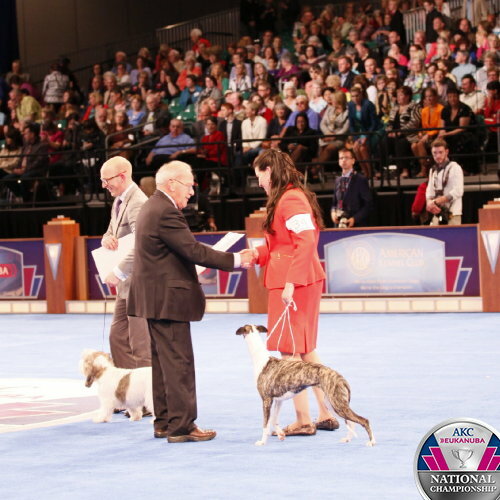 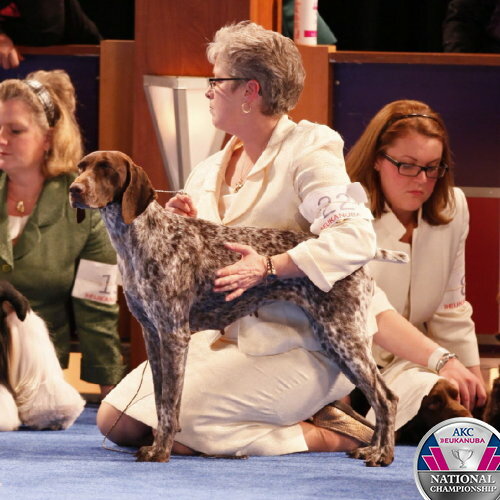 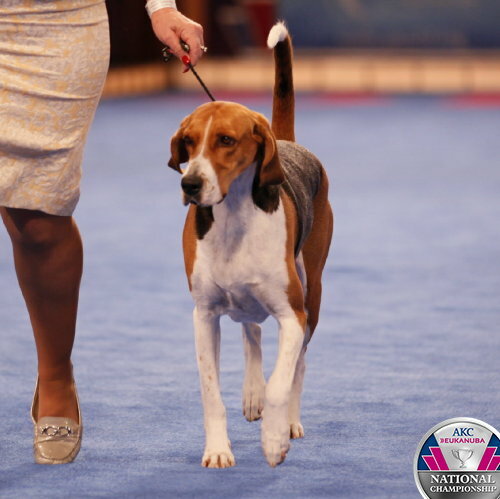 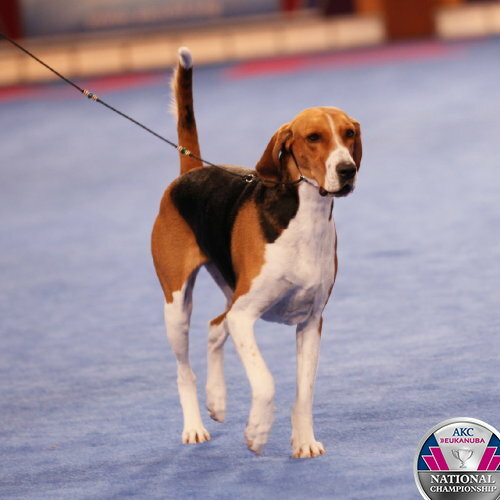 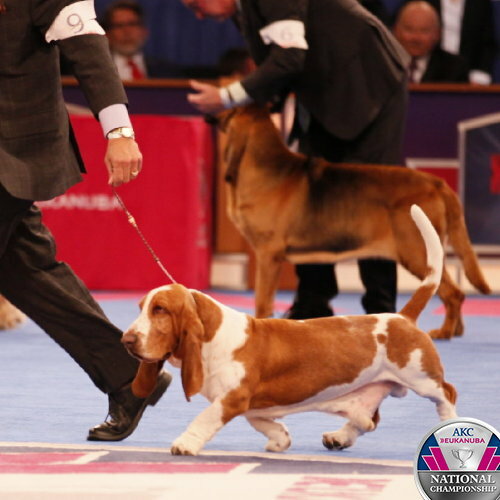 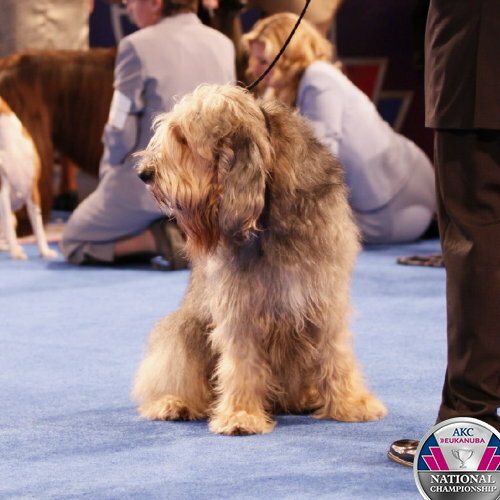 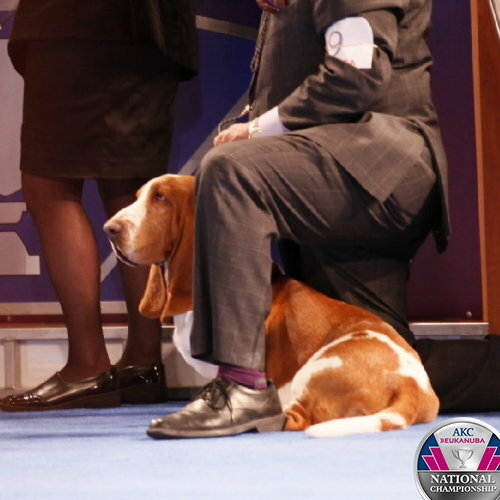 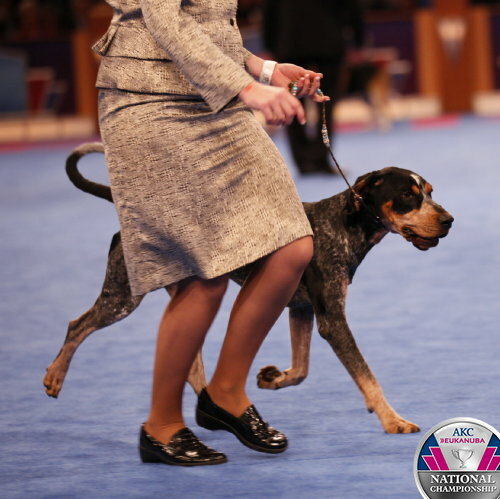 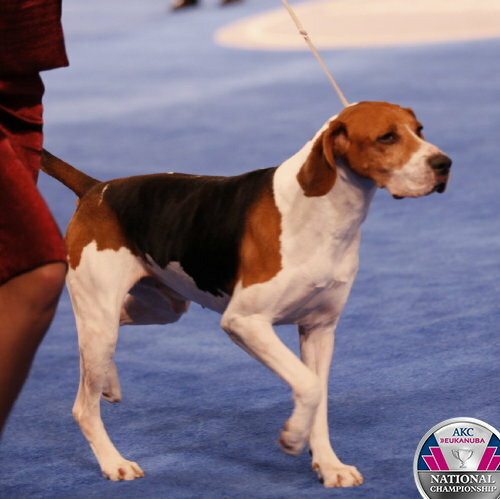 Best in Breed, Hound Group. 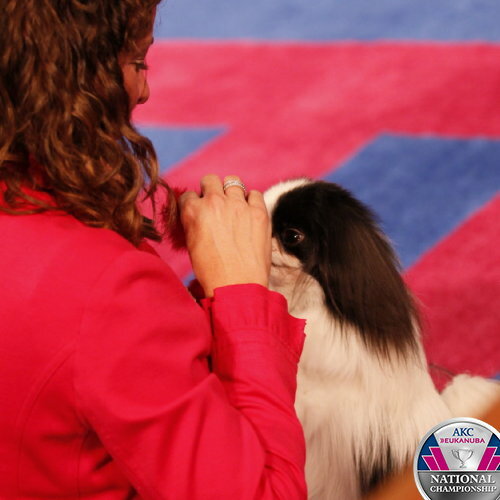 Interview with Lisa Miller. 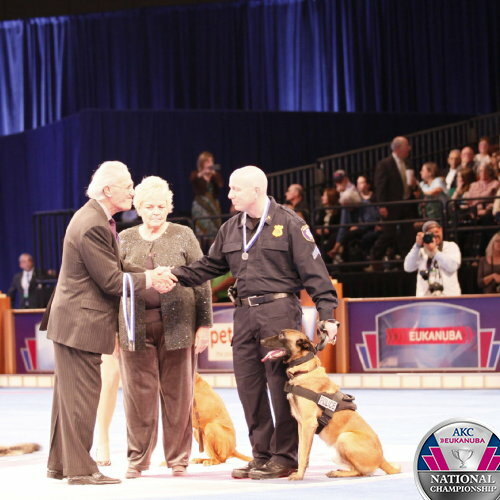 Hank and Police Dog, Smash. 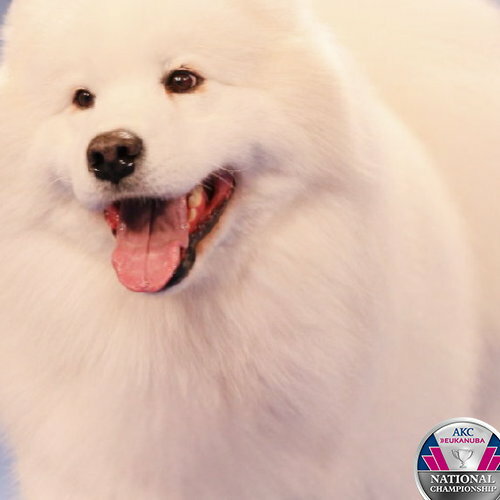 Which Puppy is Right for Me? 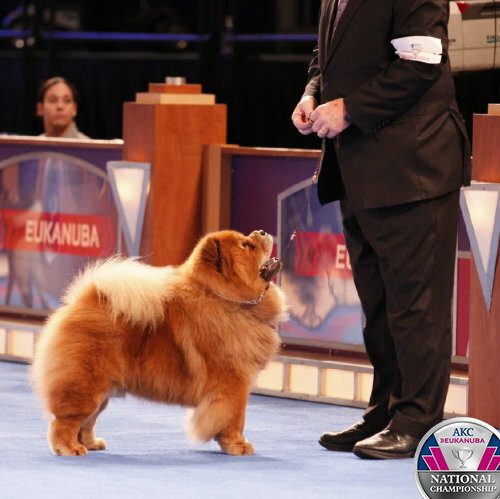 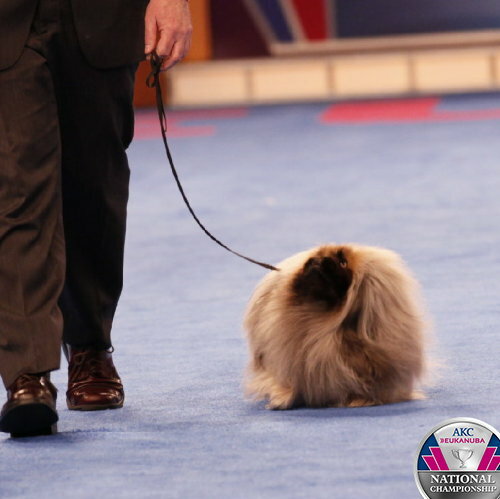 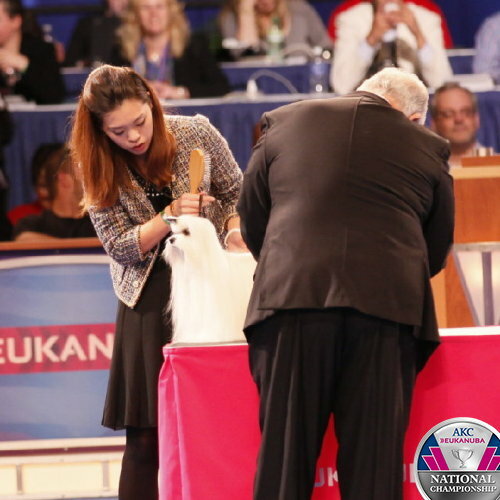 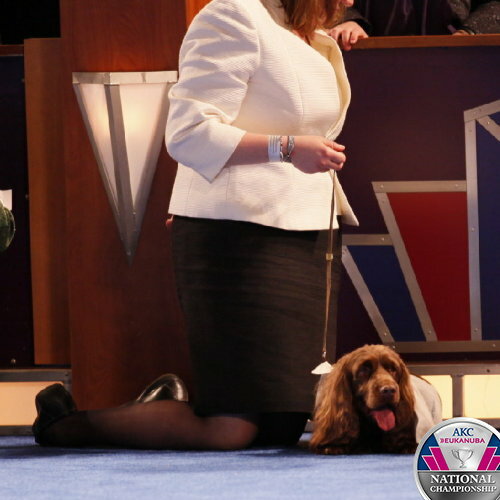 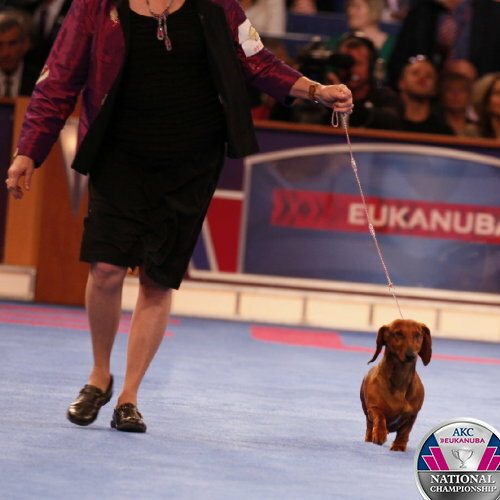 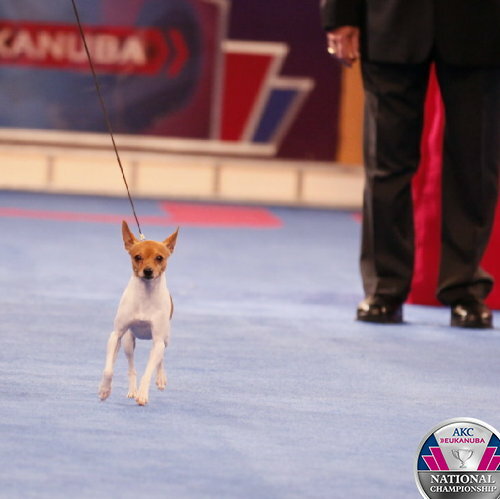 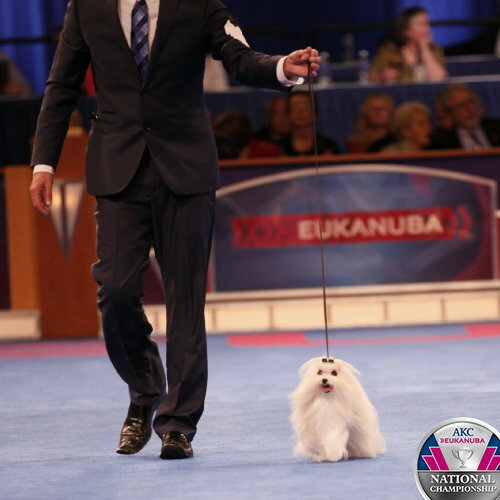 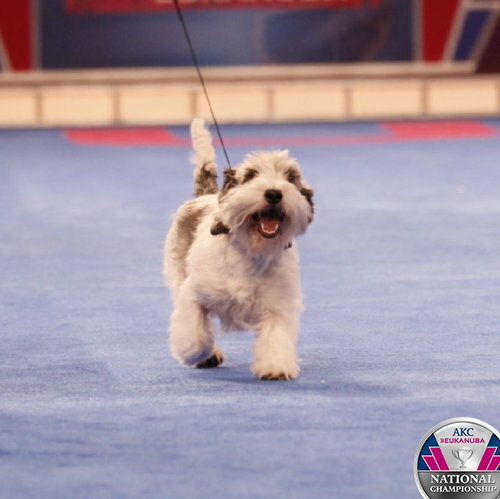 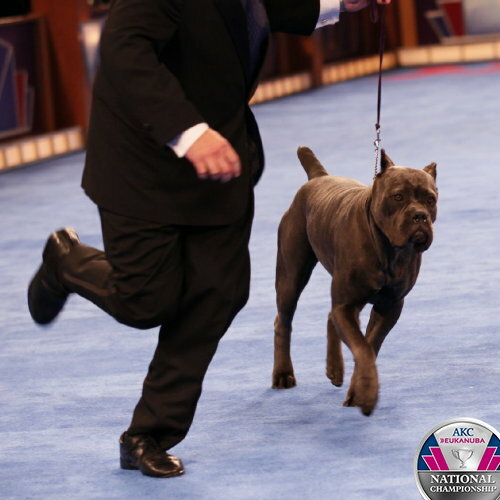 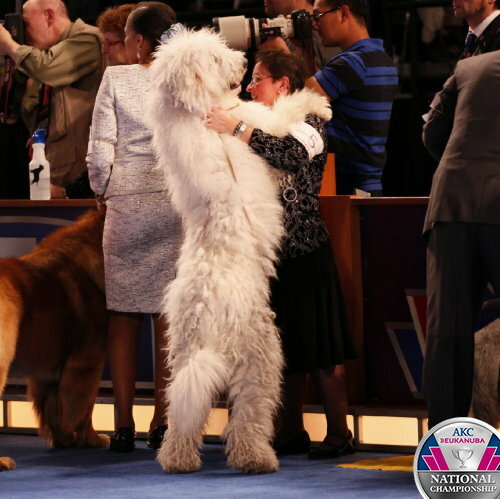 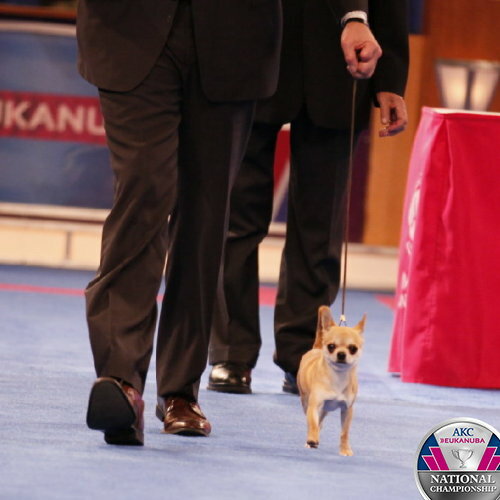 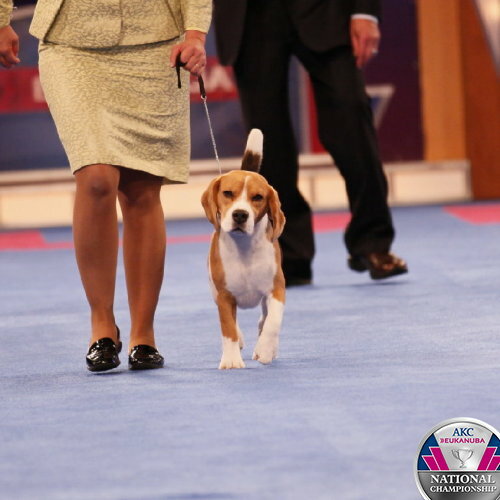 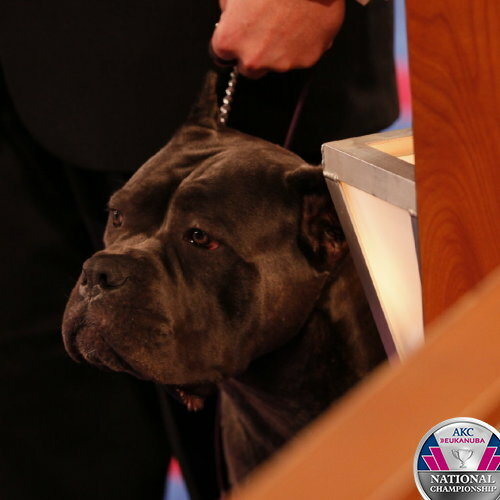 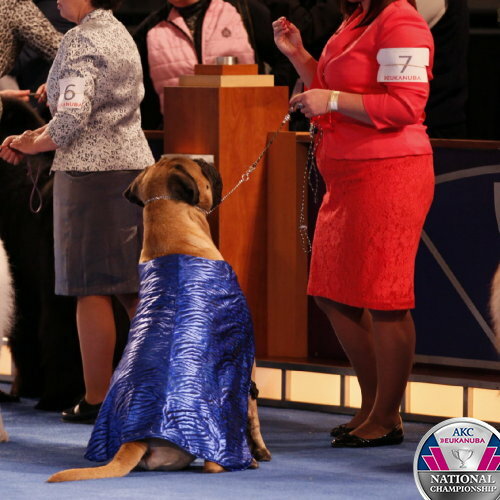 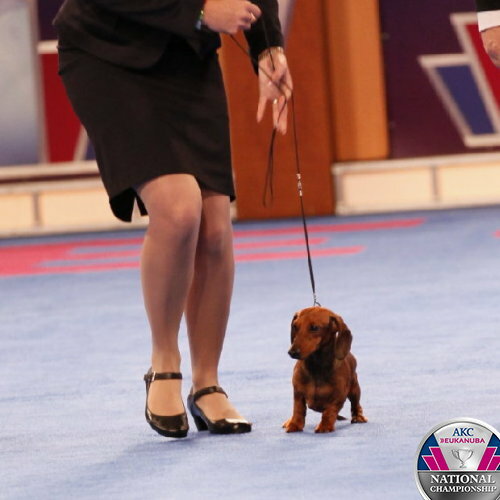 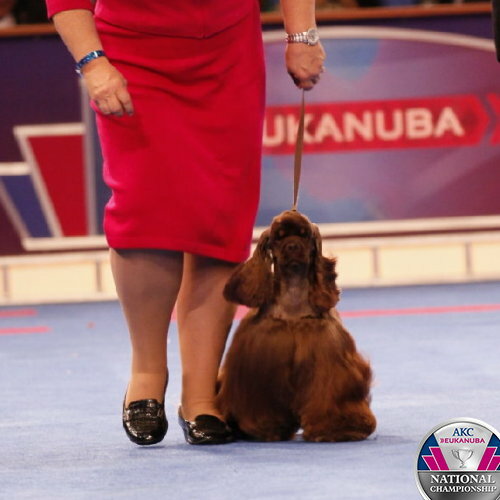 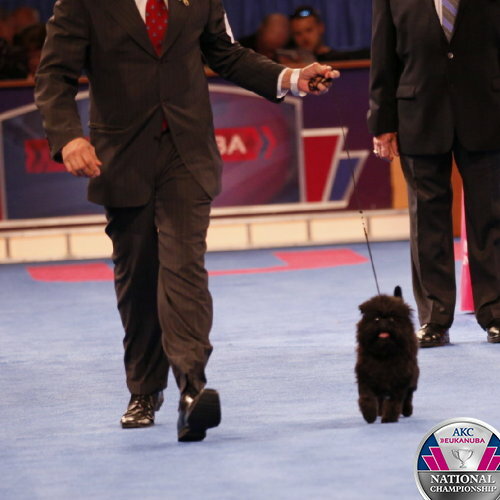 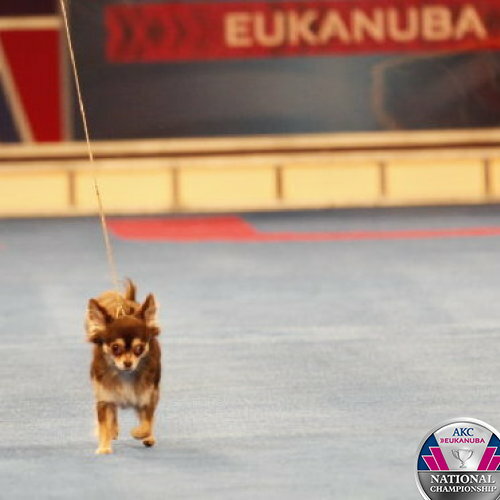 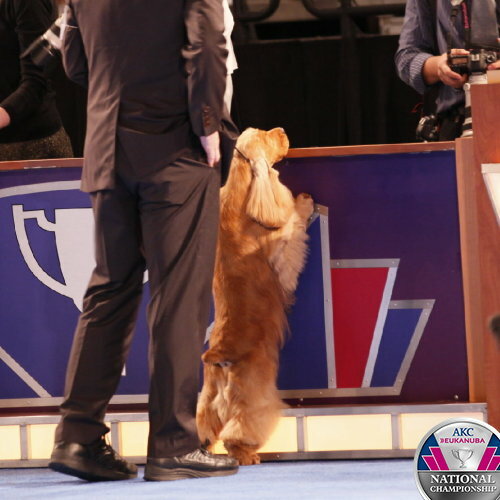 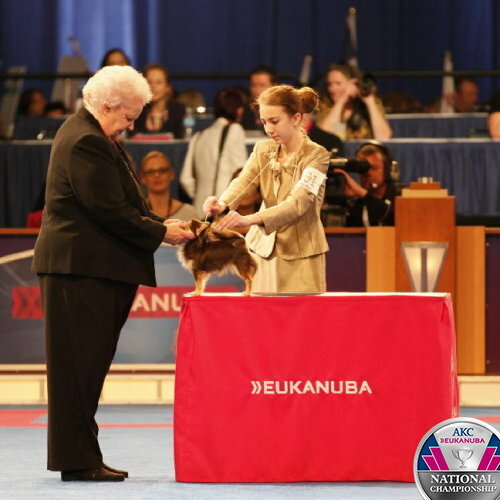 When you need an expert, Ask Eukanuba! 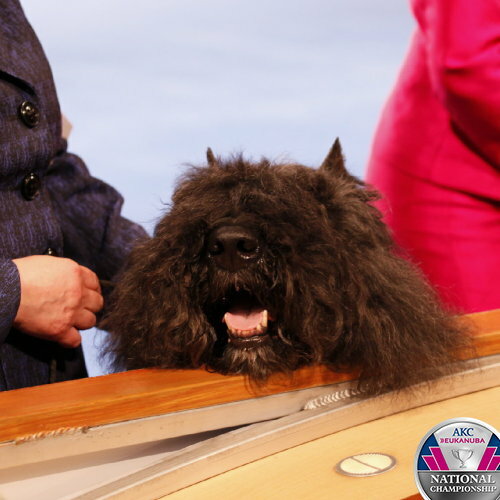 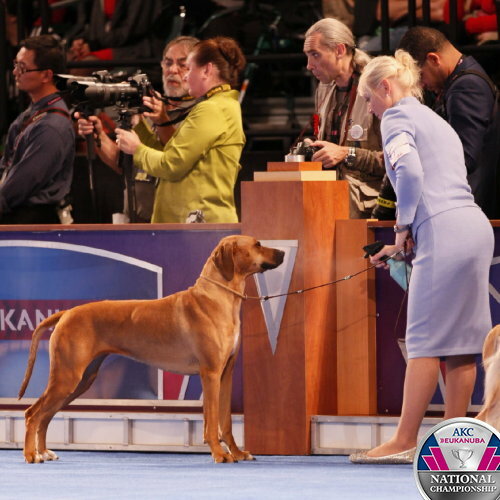 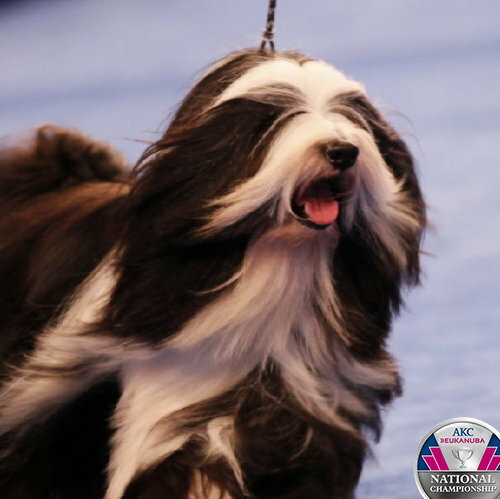 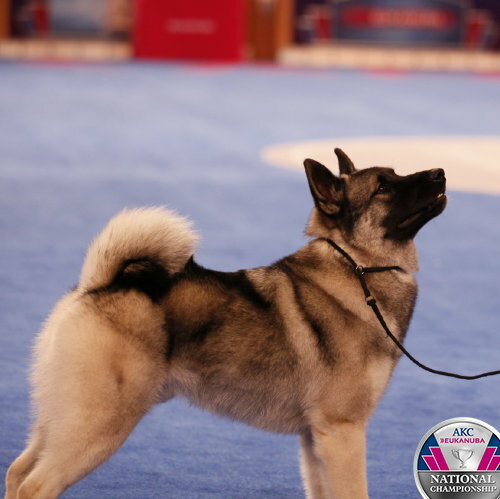 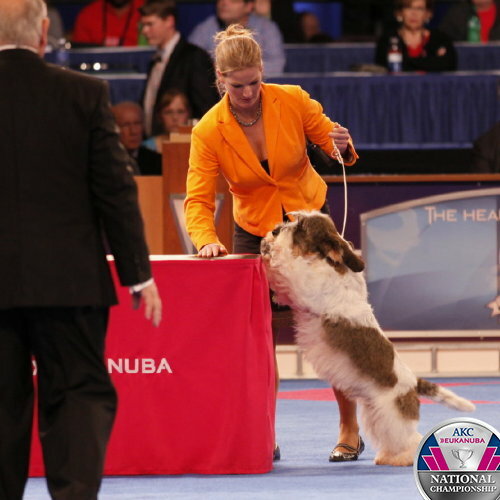 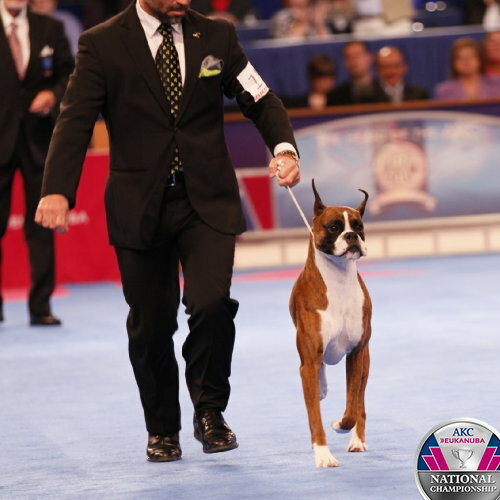 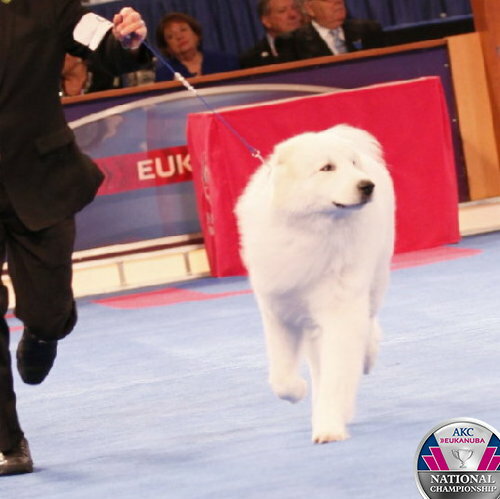 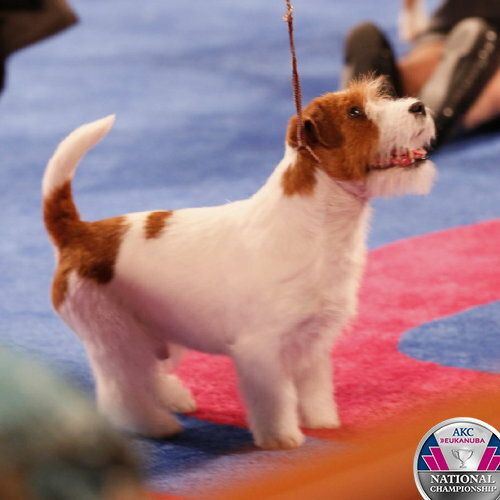 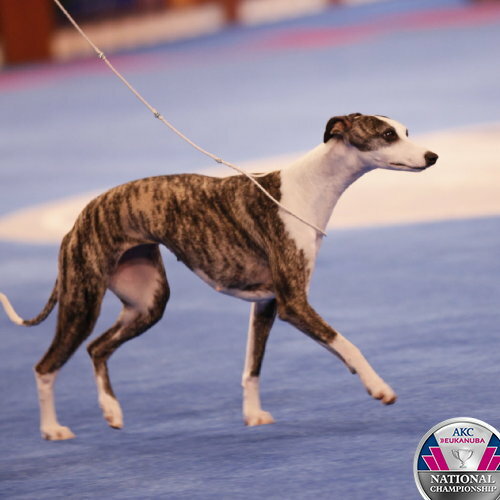 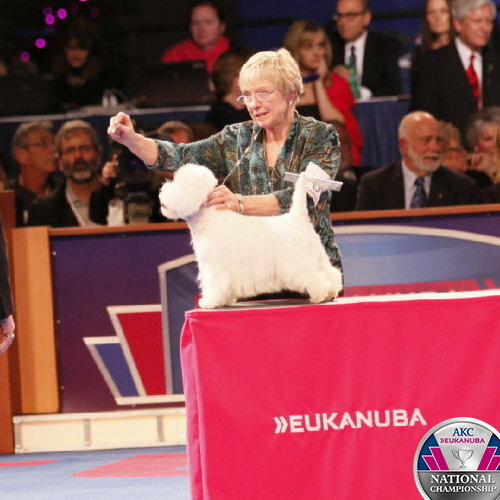 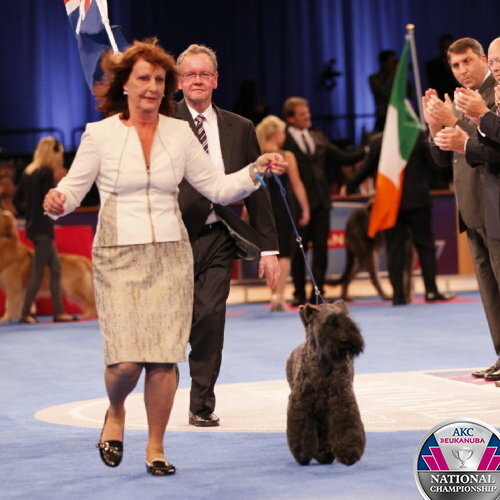 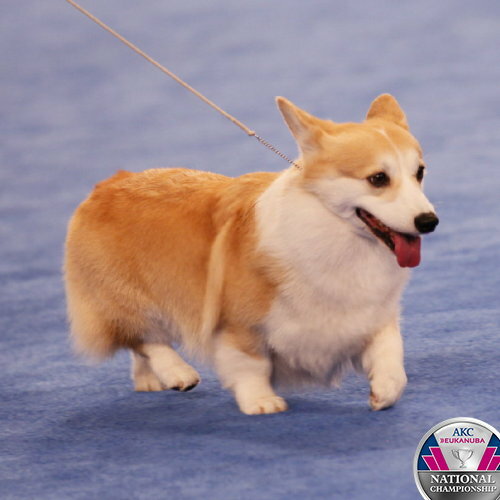 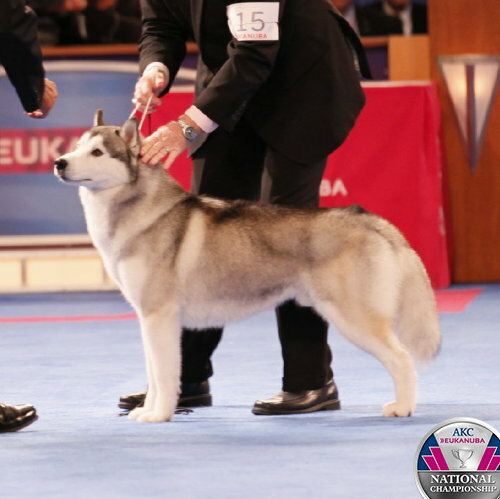 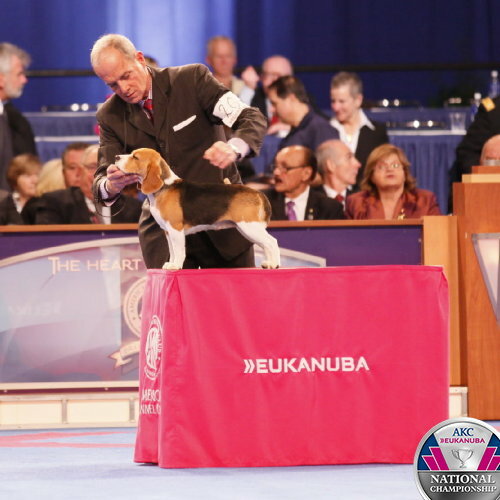 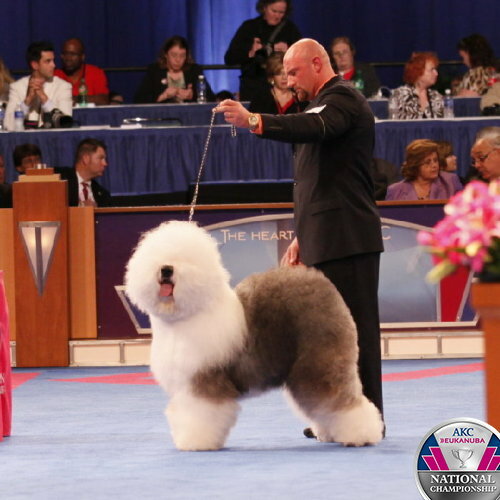 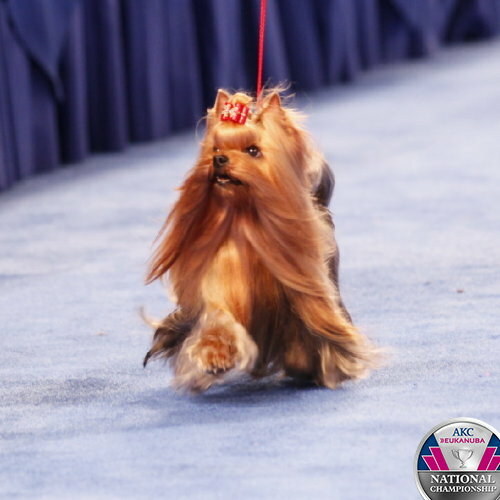 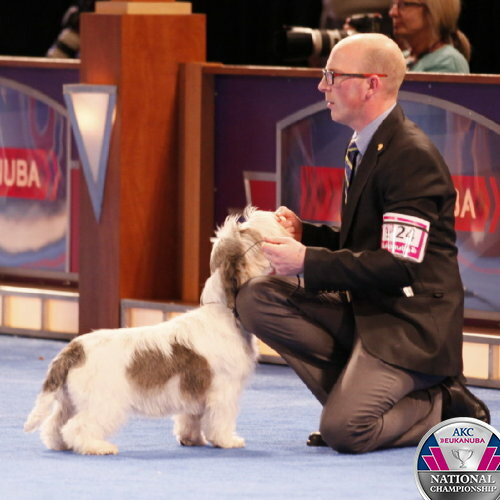 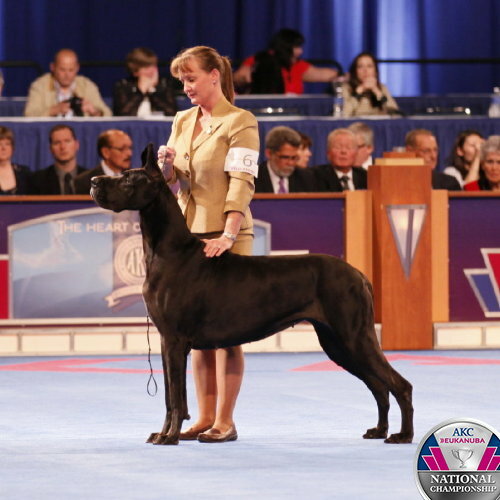 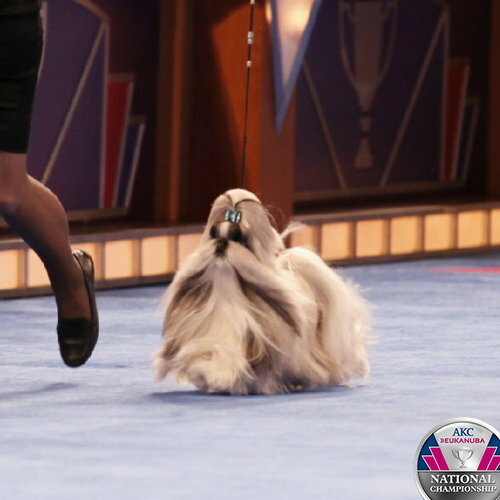 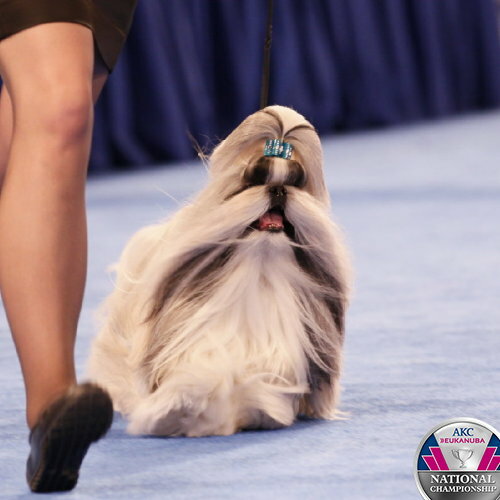 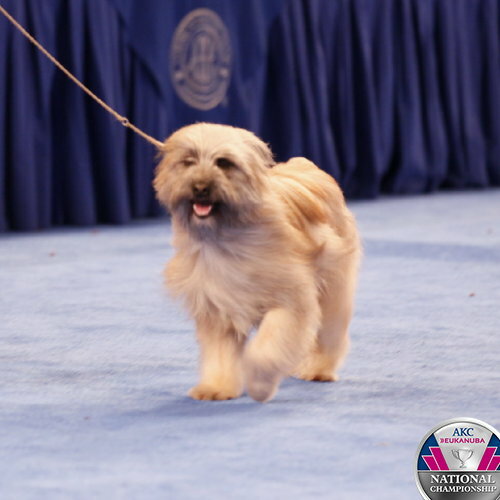 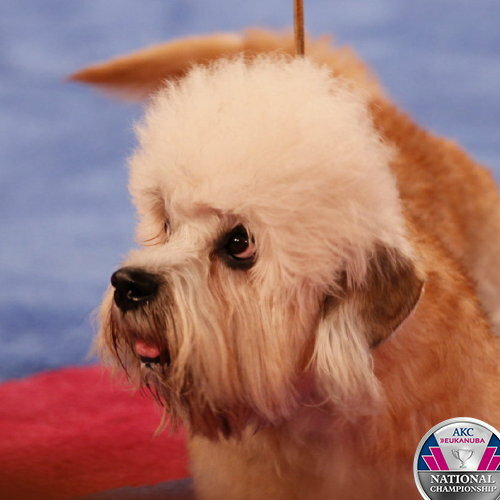 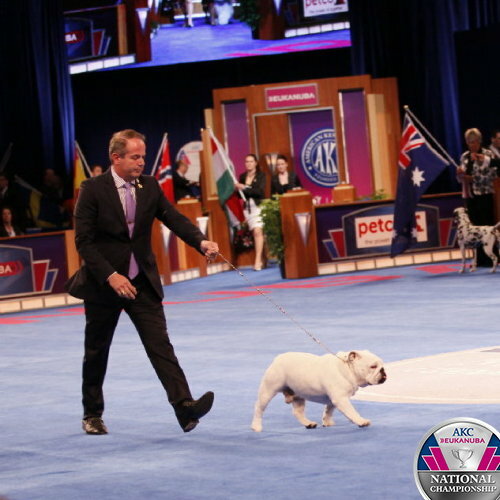 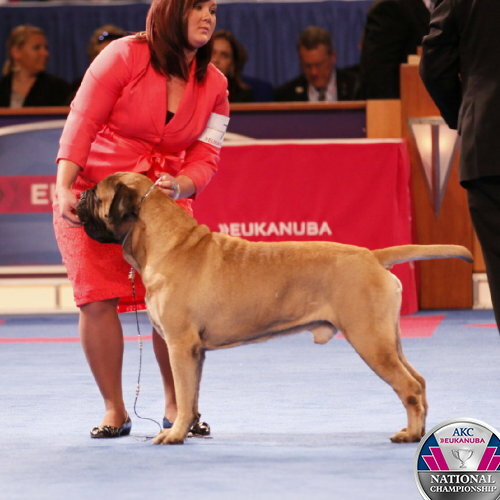 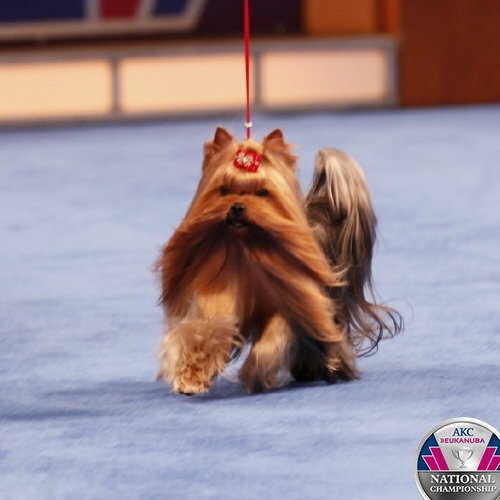 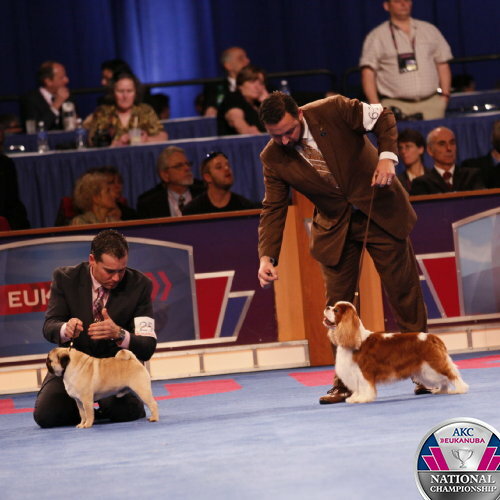 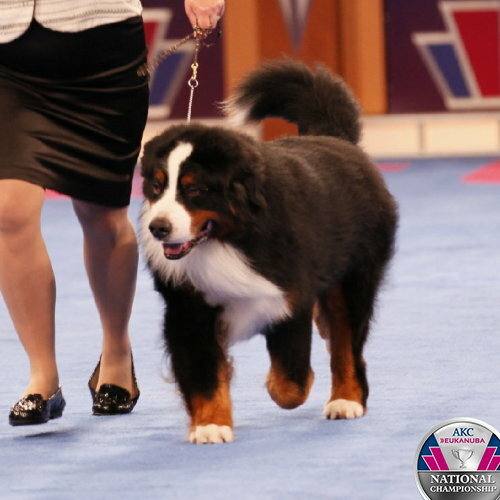 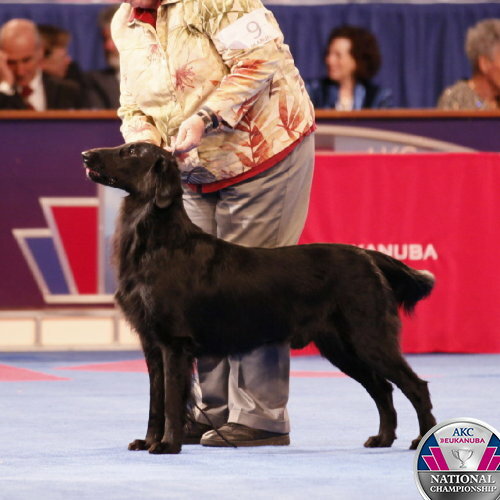 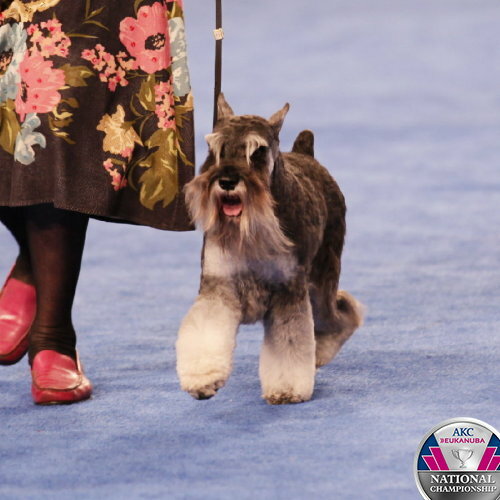 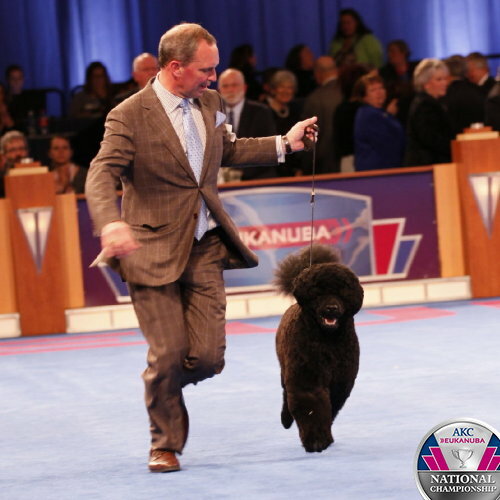 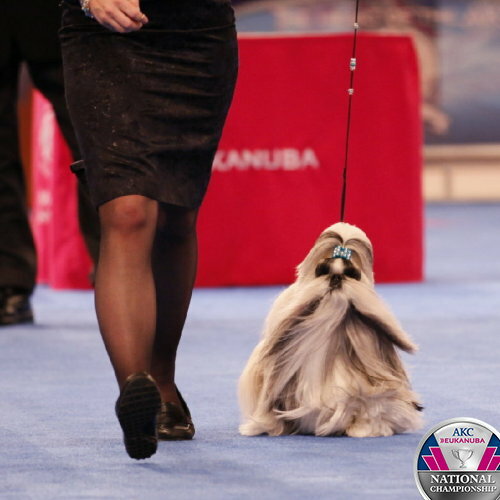 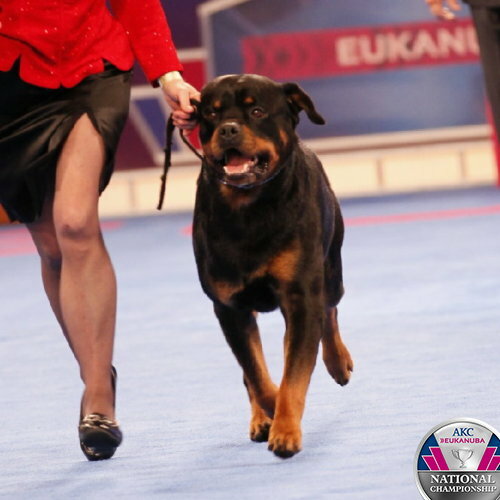 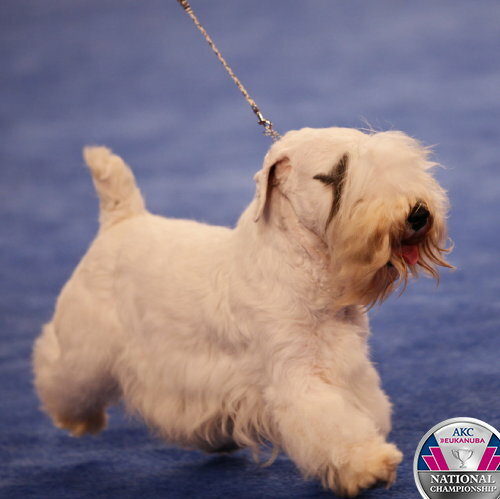 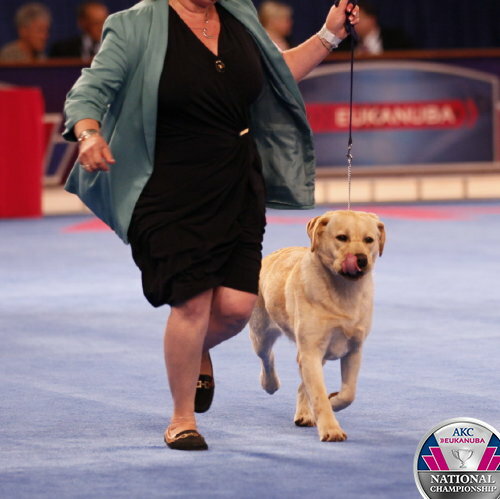 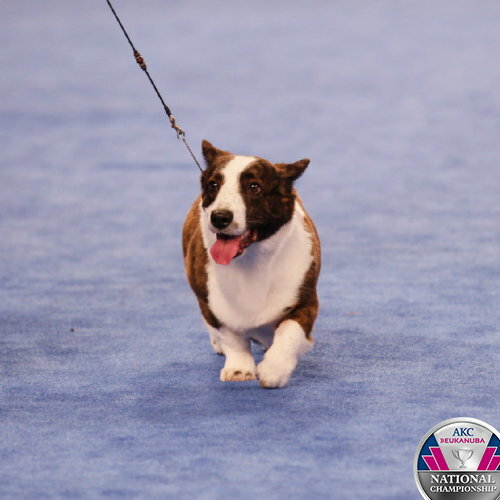 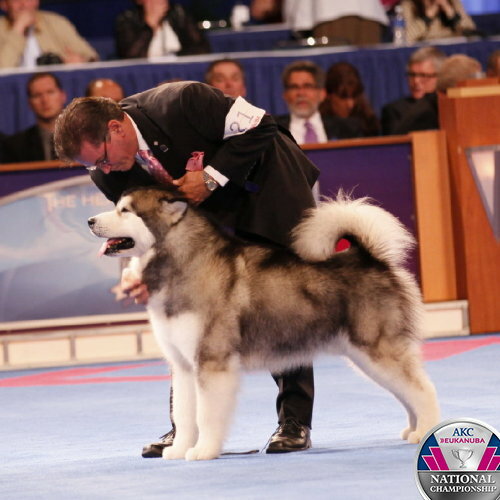 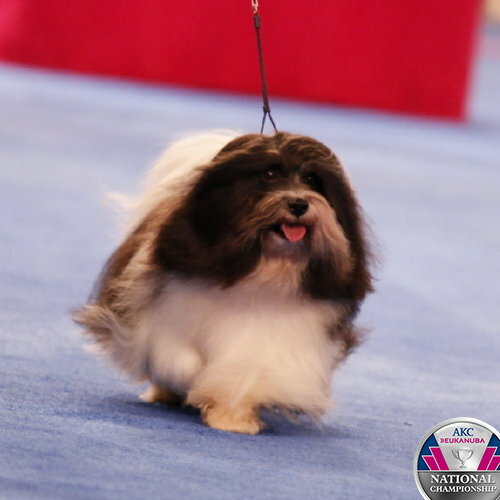 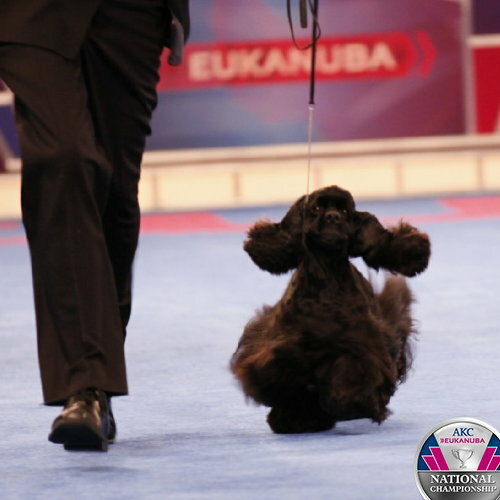 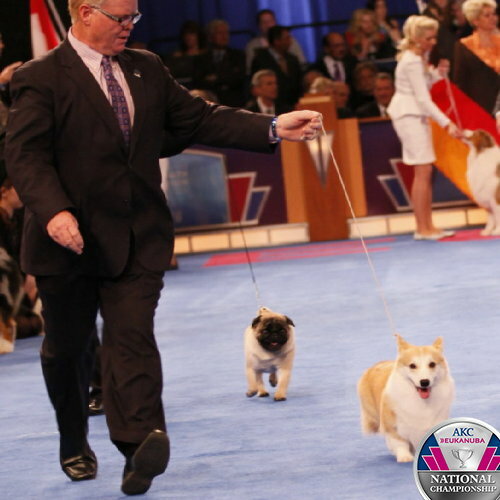 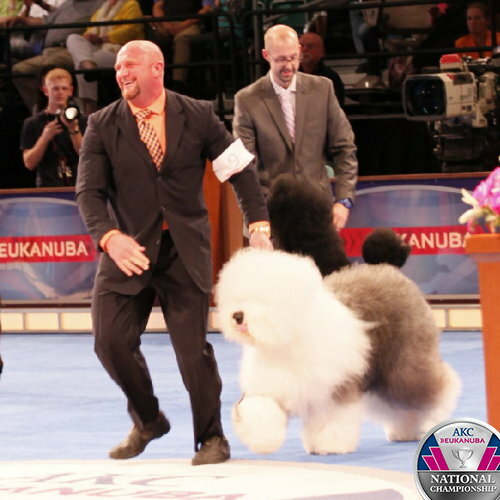 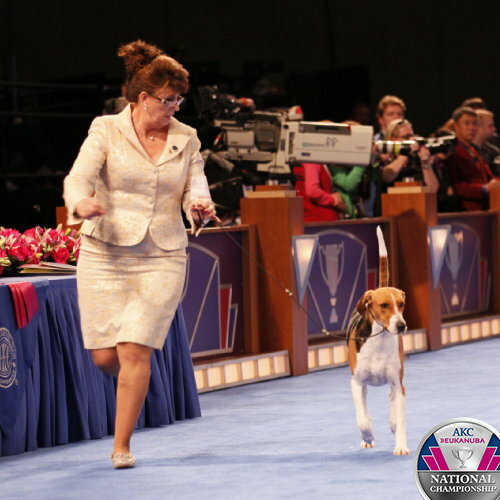 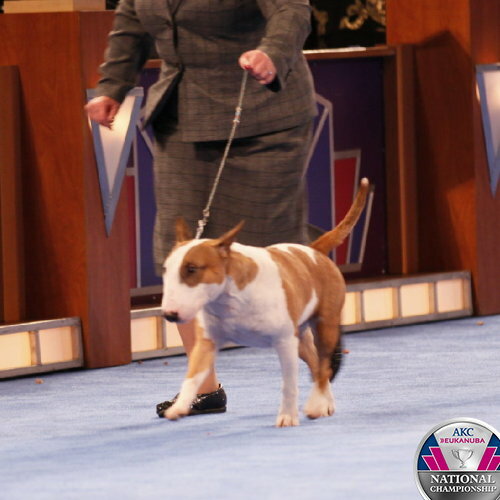 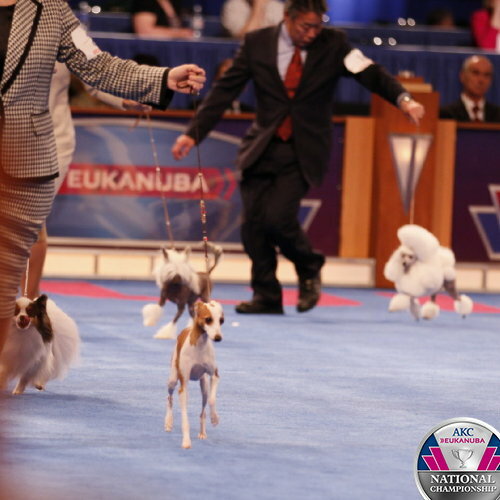 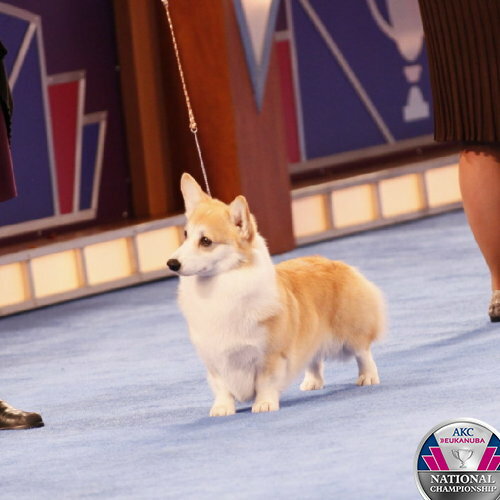 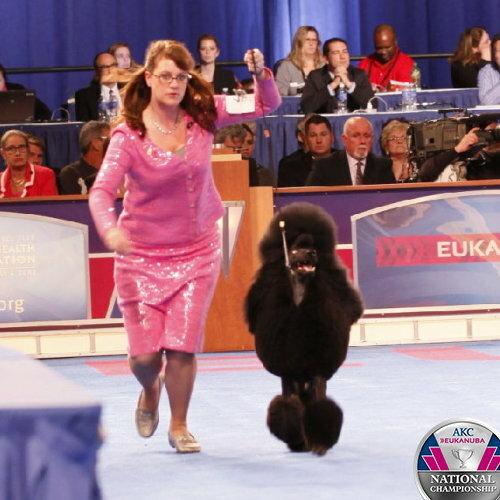 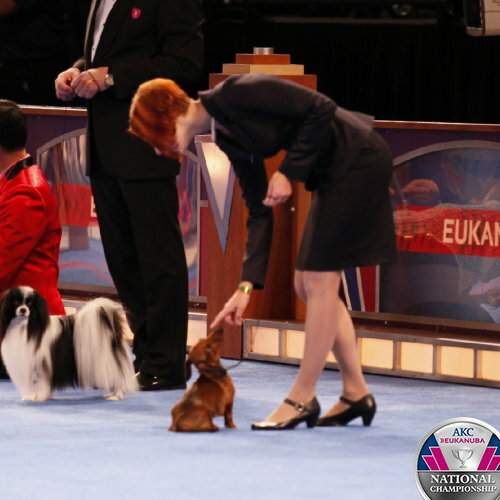 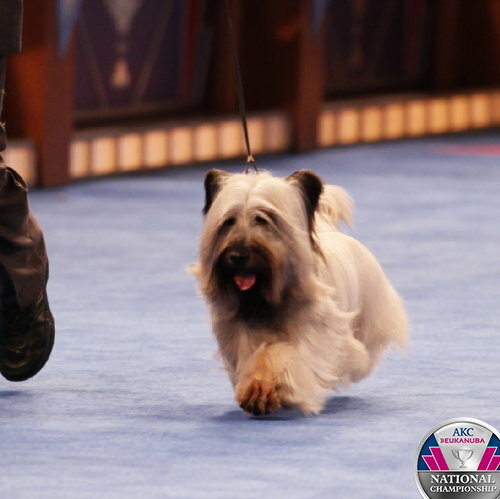 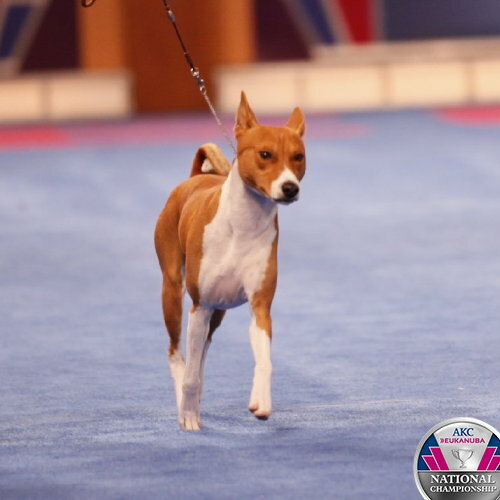 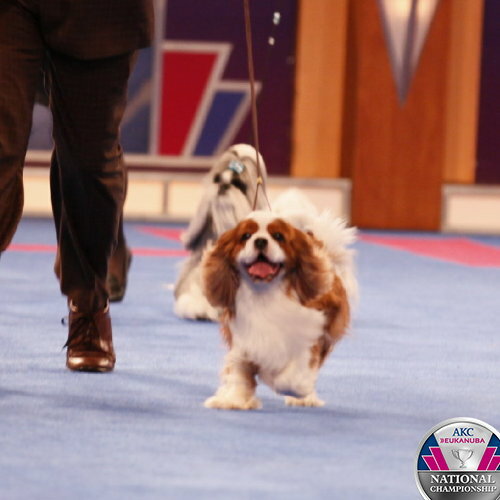 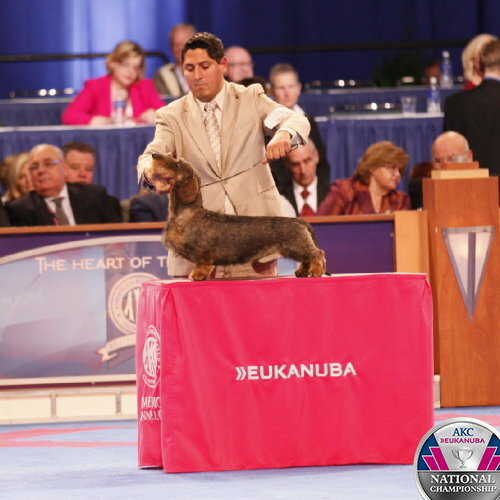 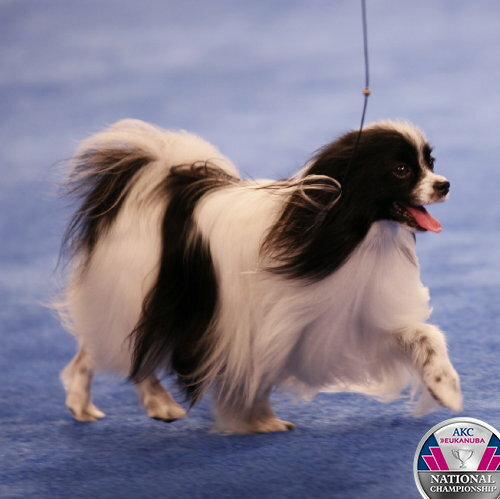 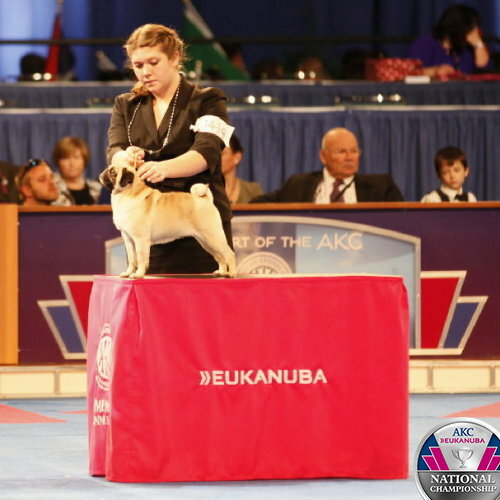 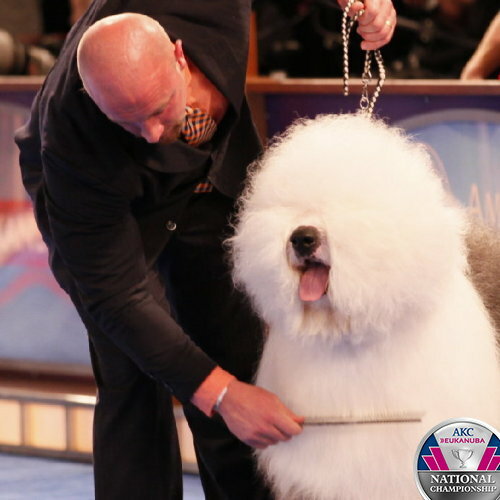 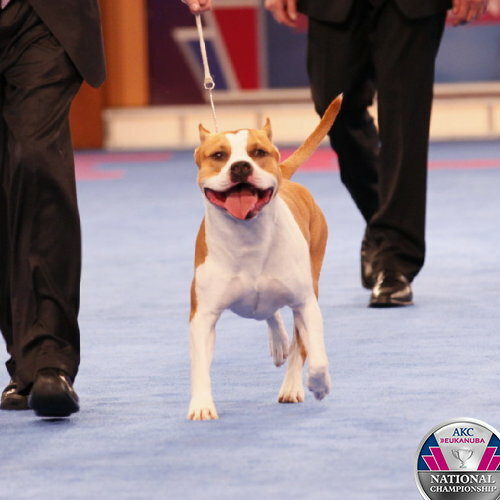 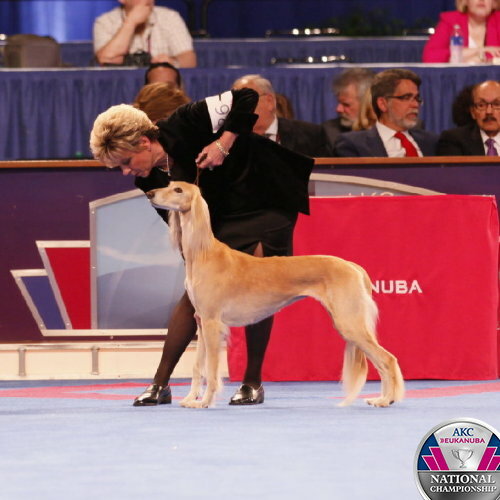 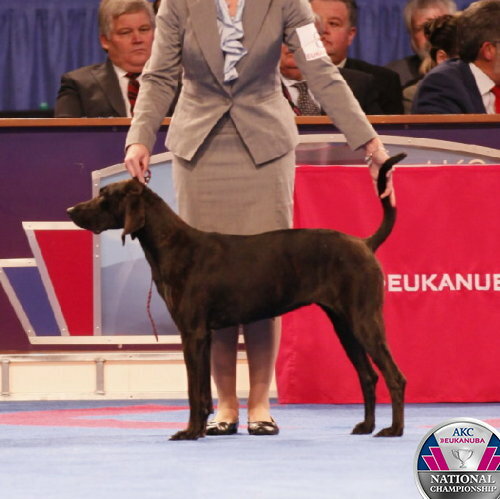 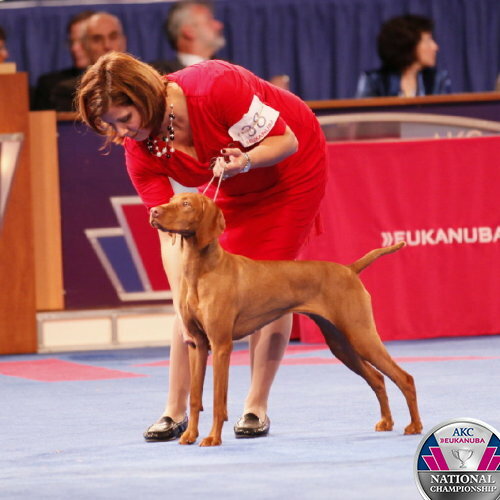 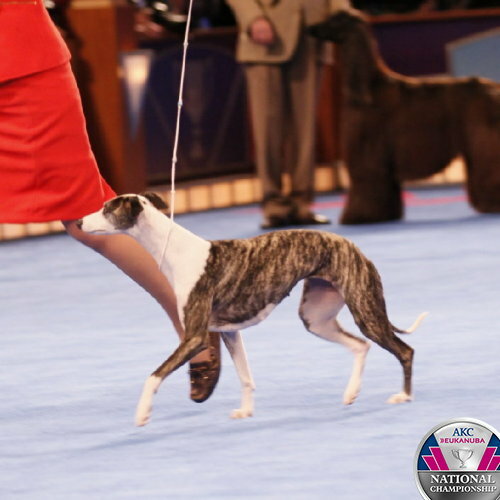 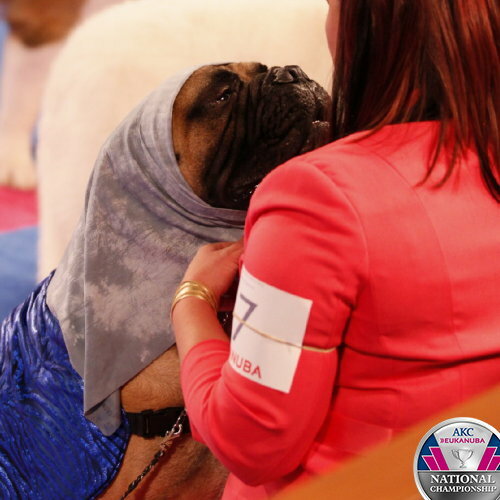 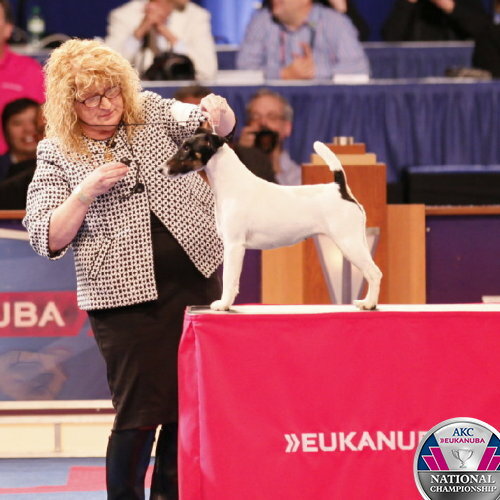 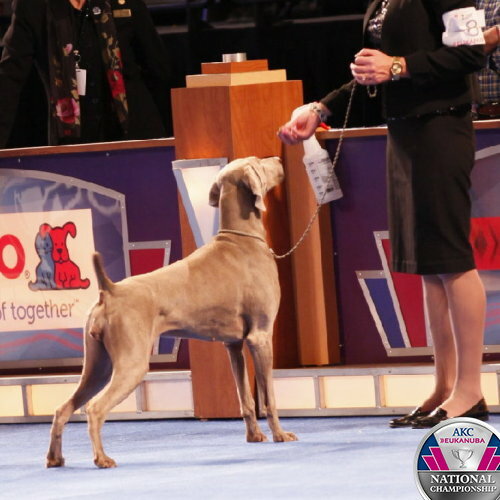 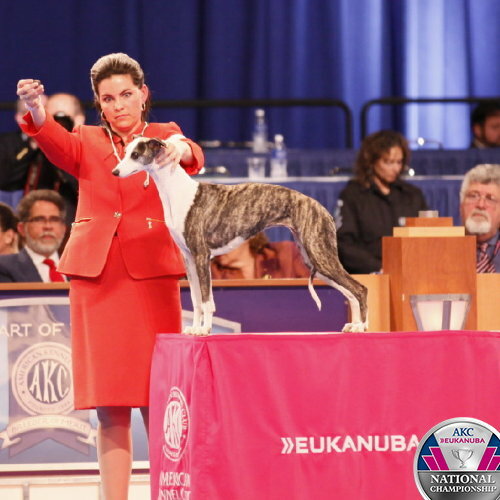 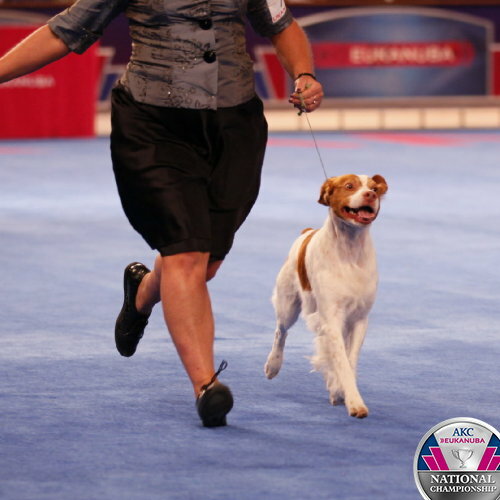 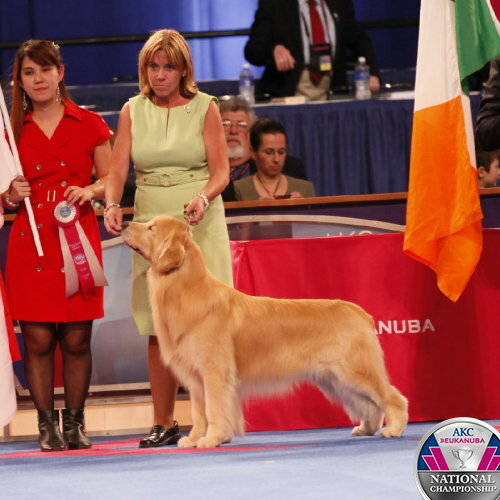 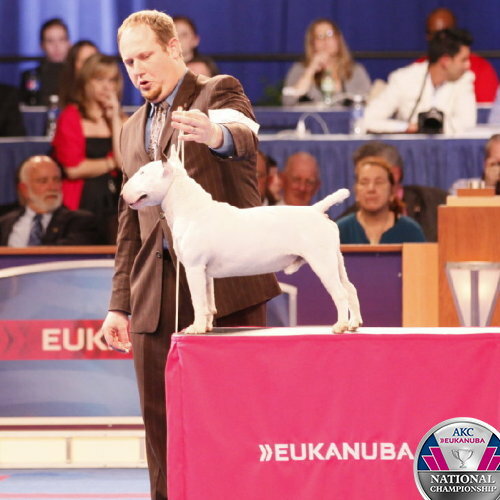 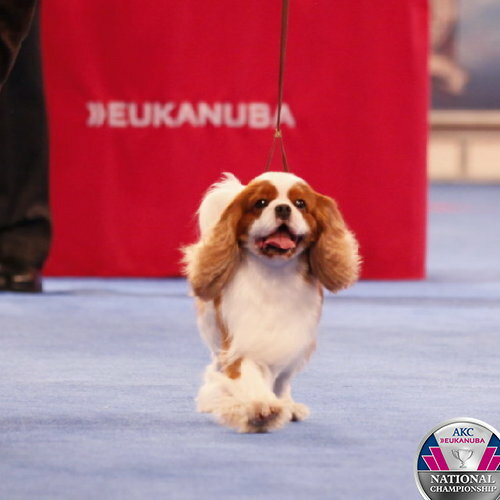 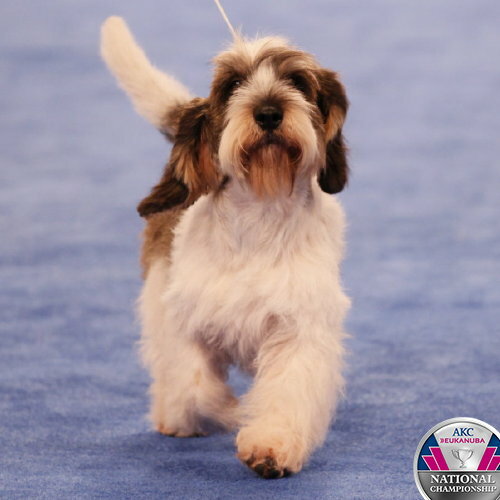 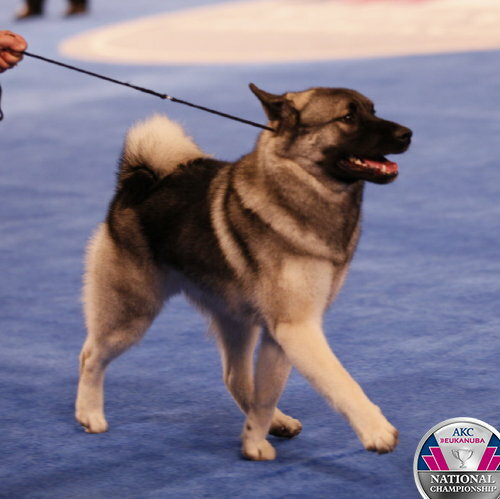 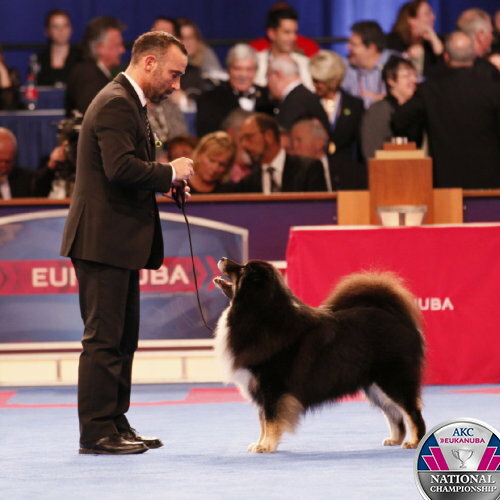 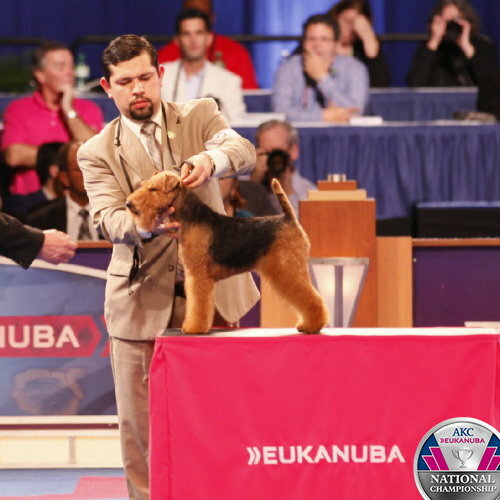 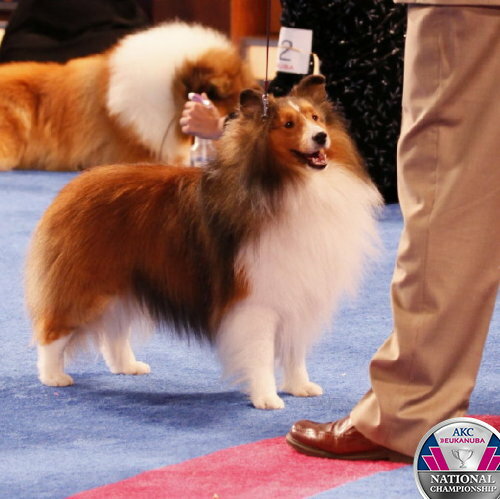 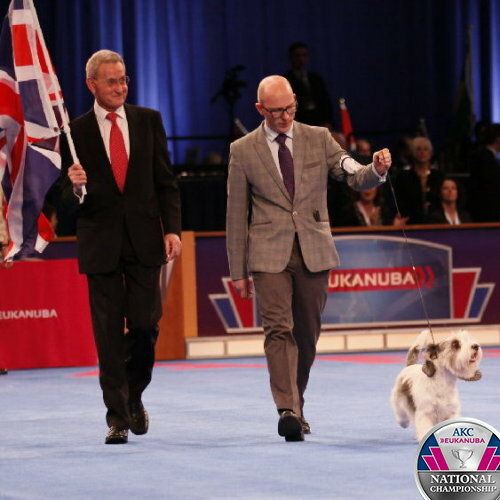 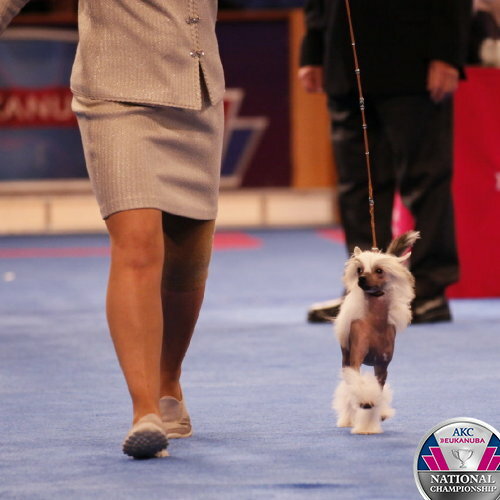 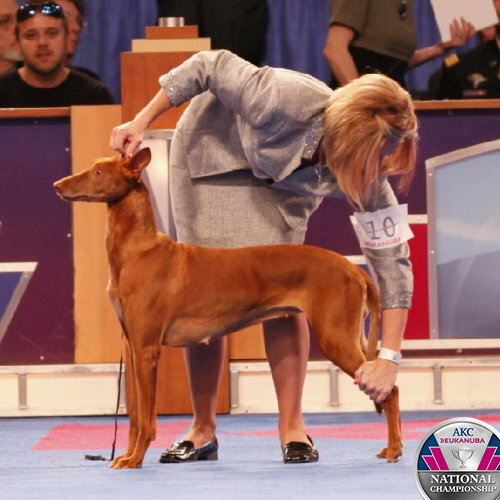 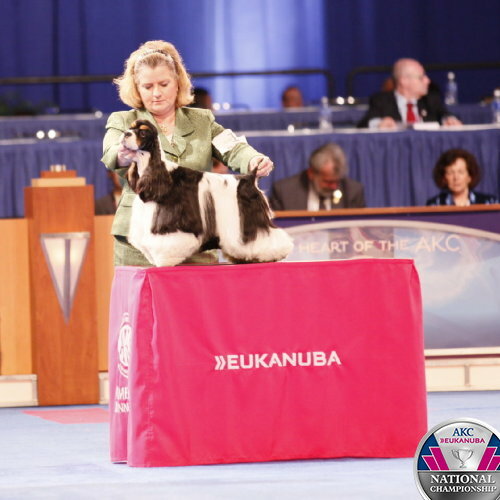 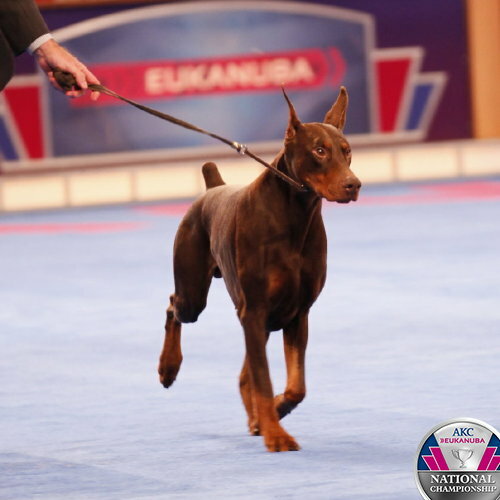 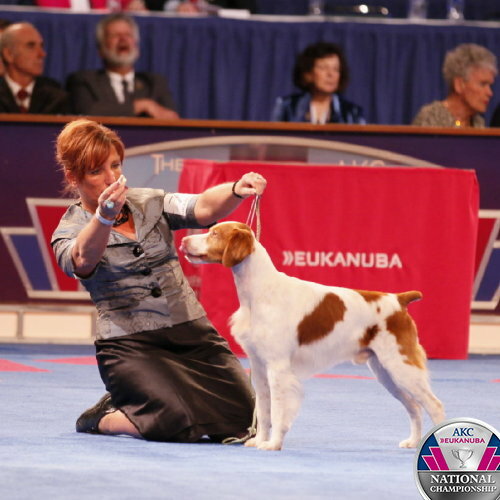 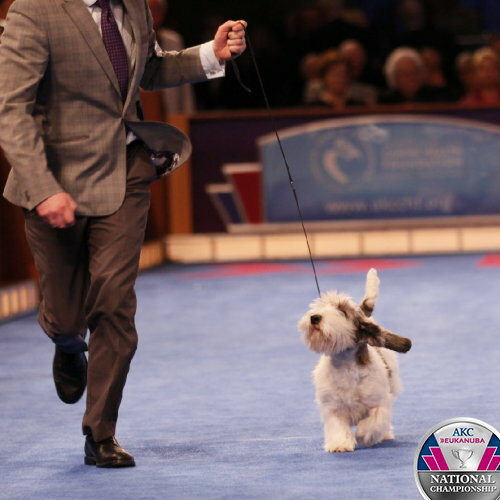 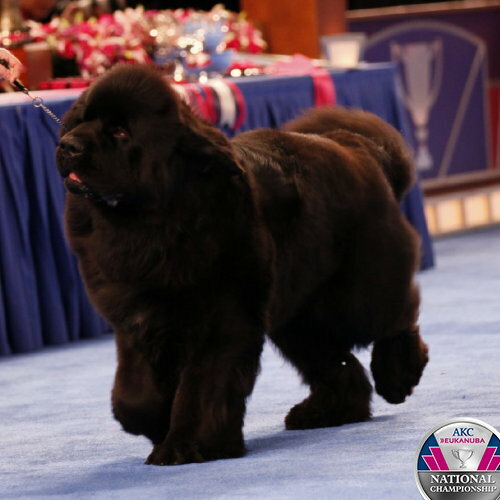 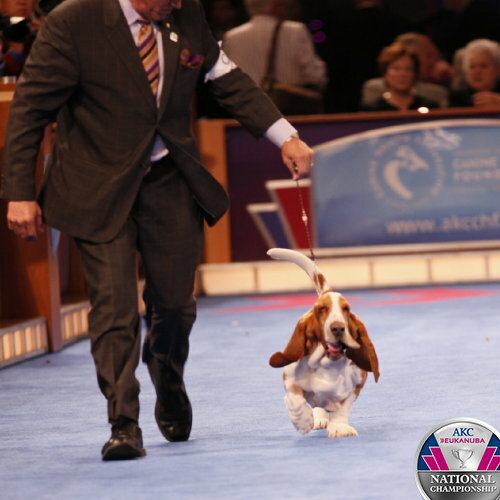 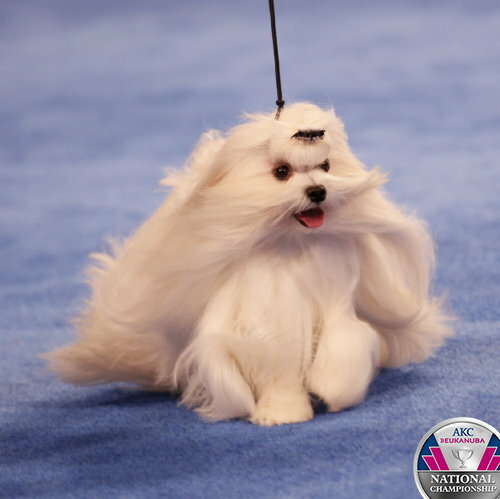 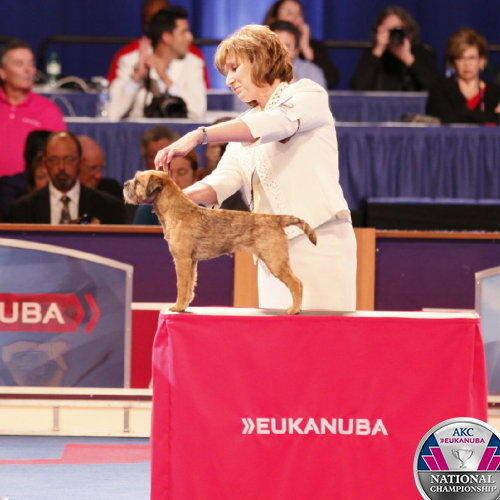 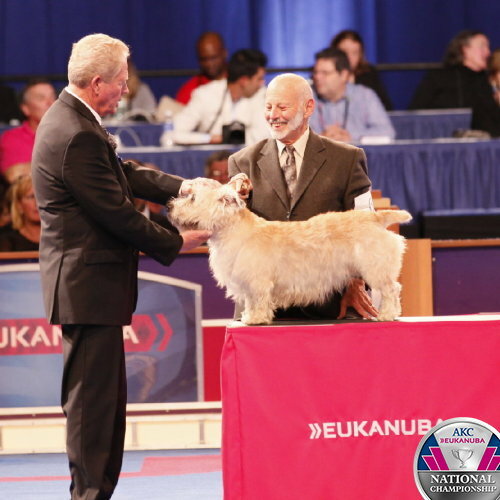 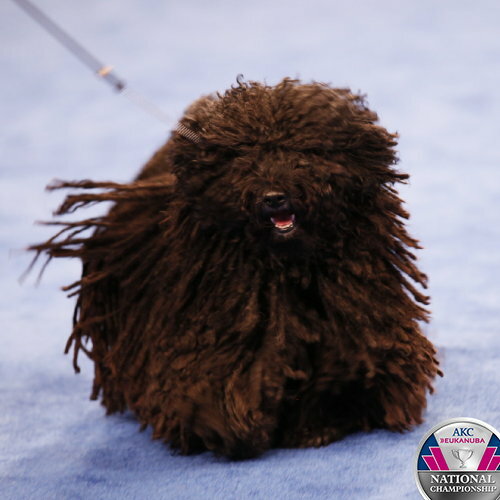 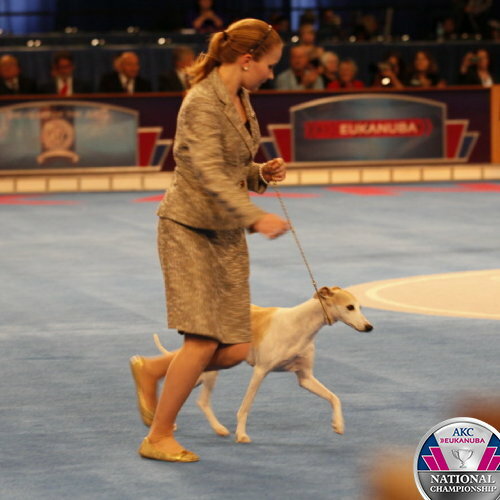 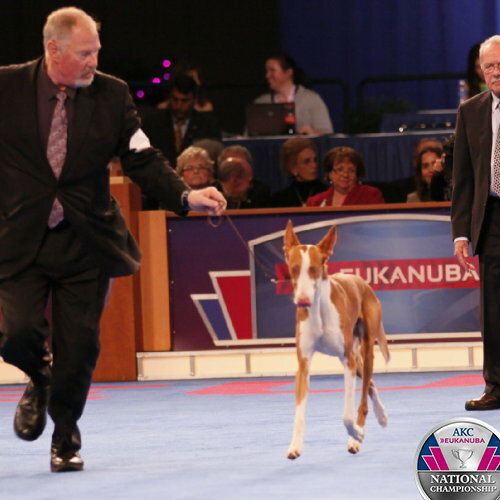 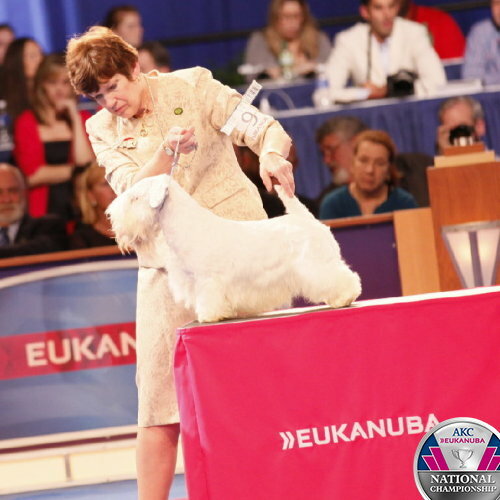 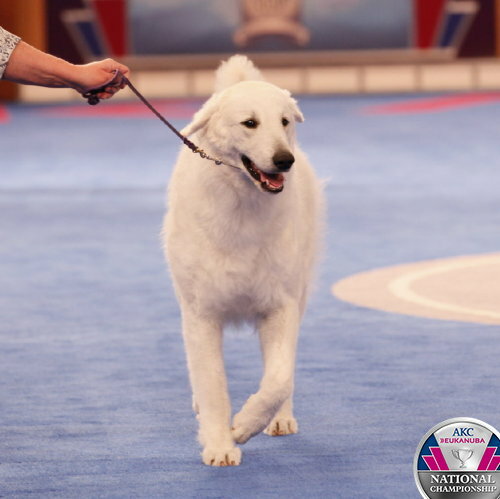 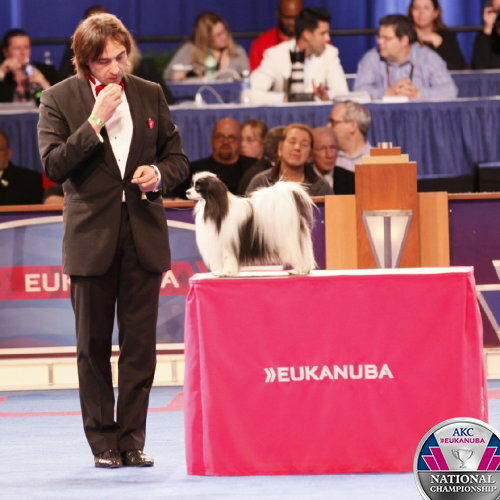 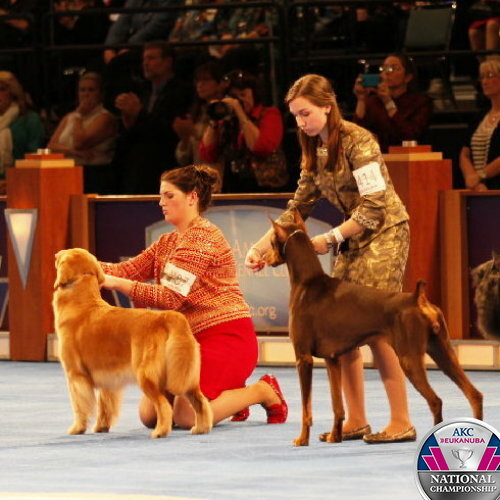 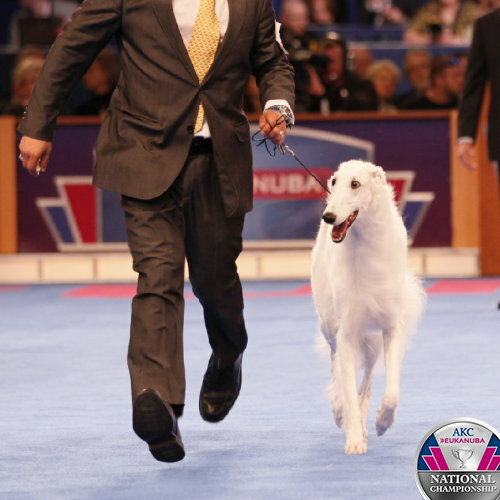 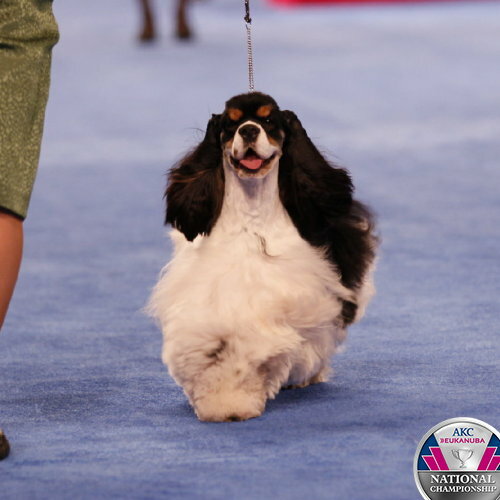 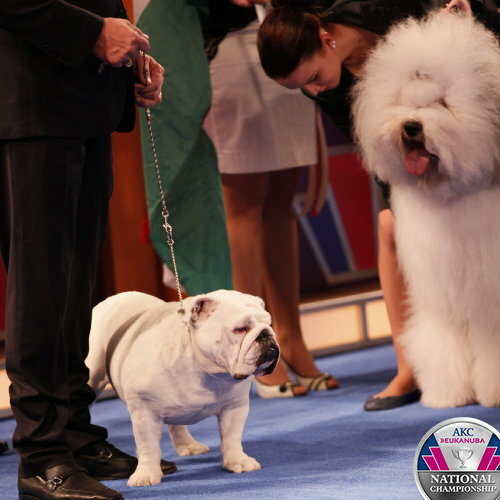 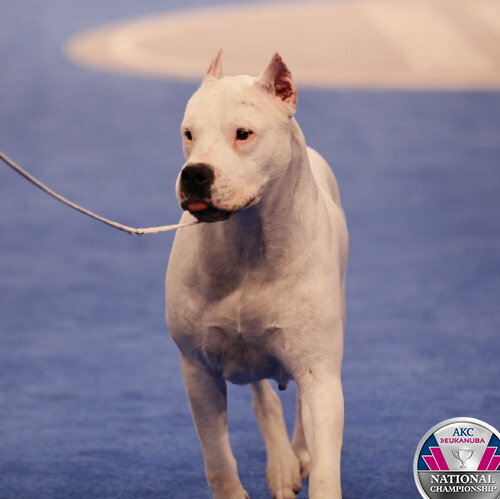 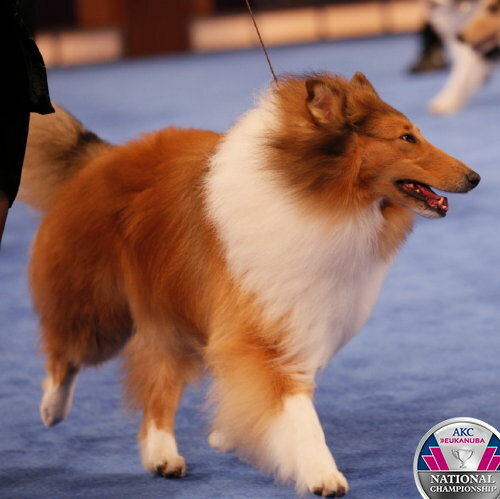 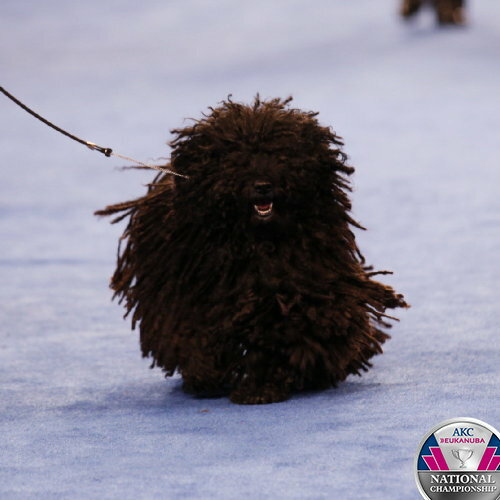 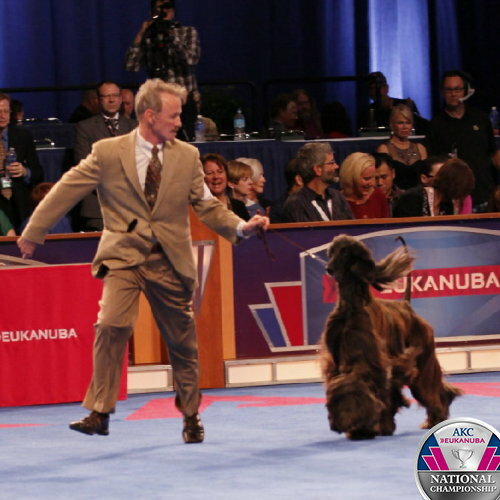 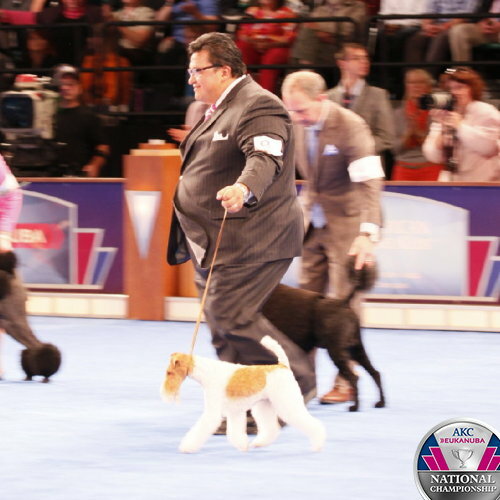 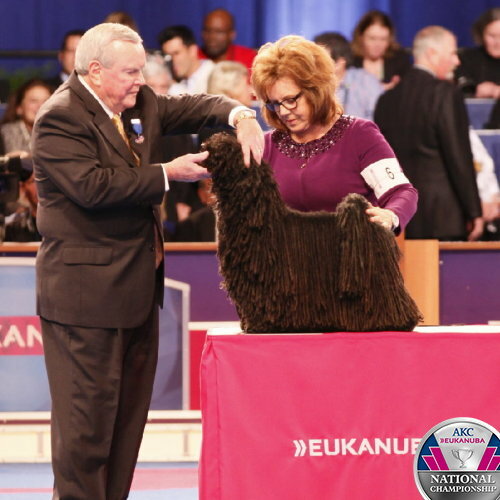 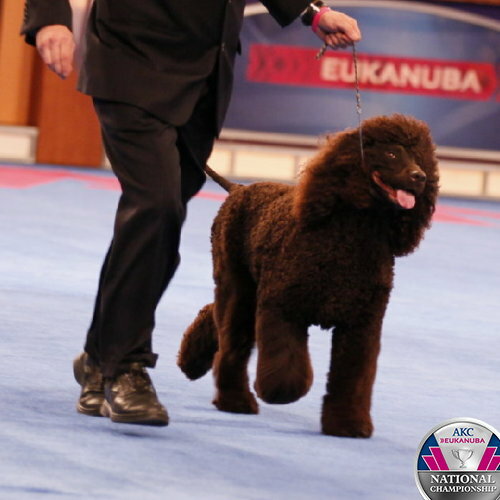 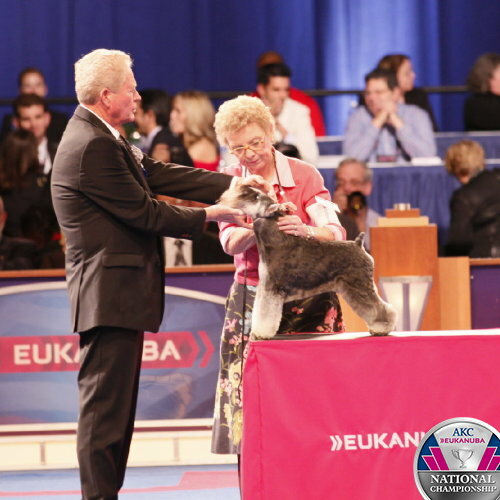 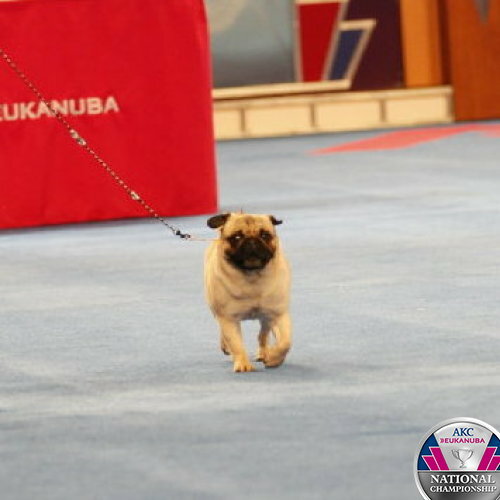 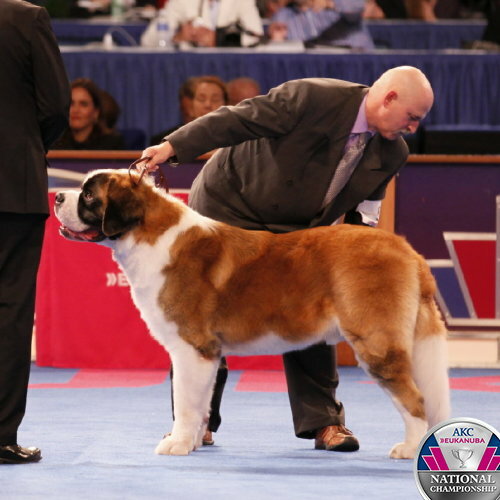 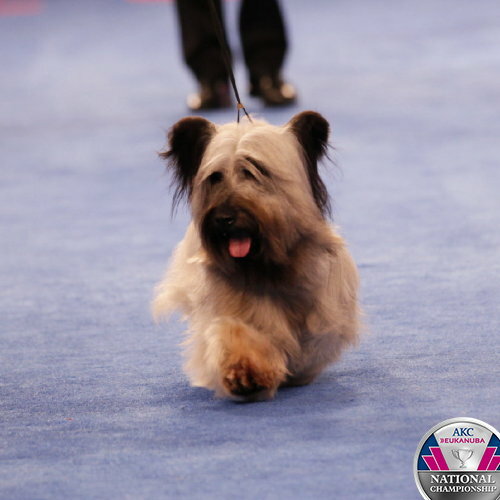 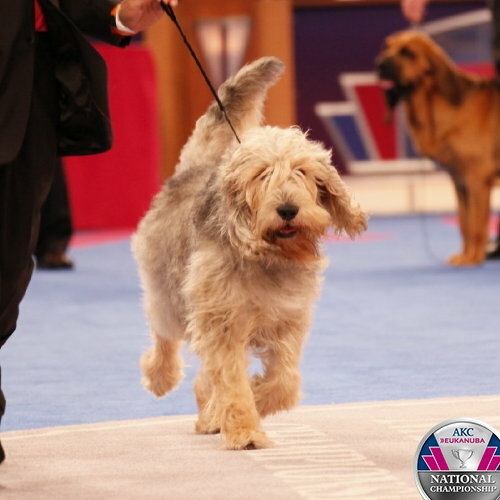 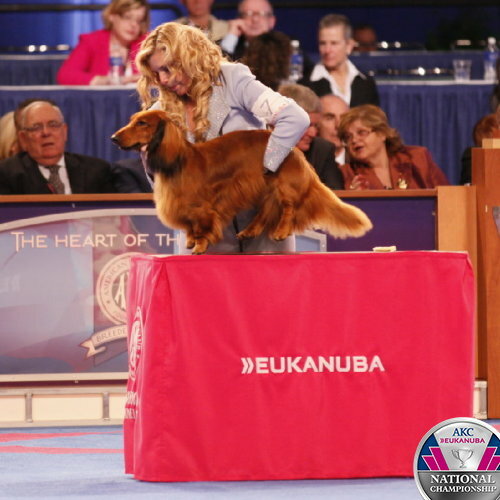 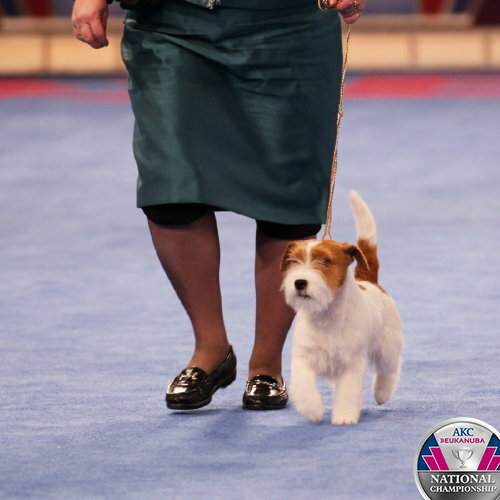 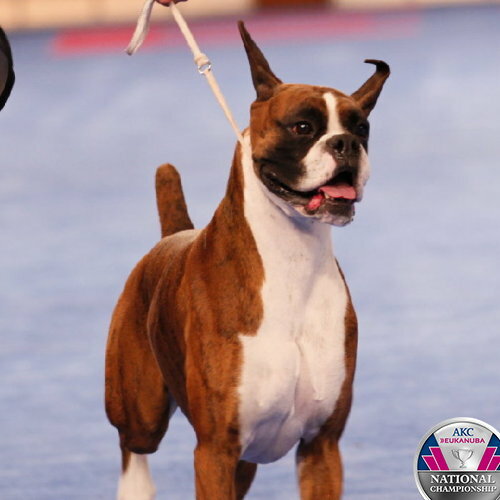 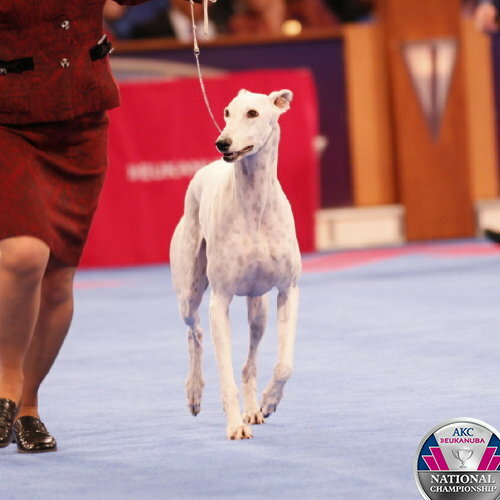 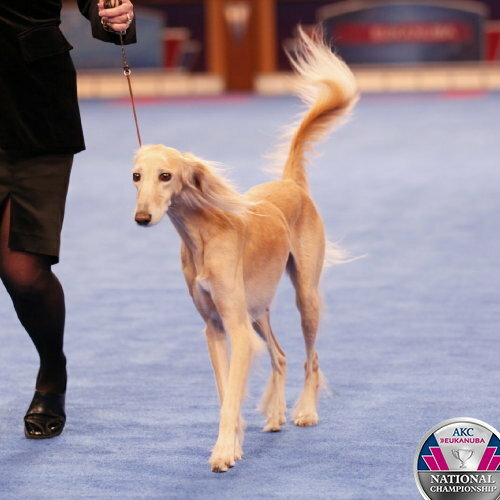 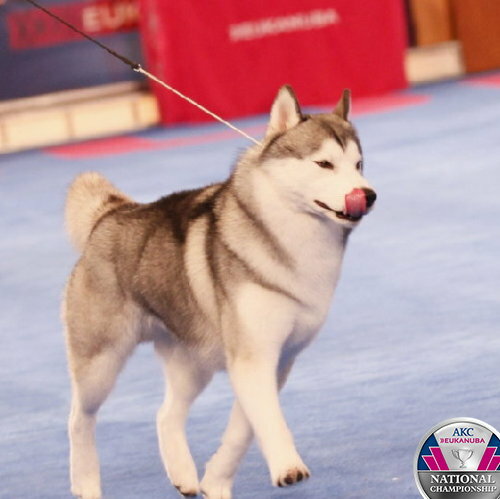 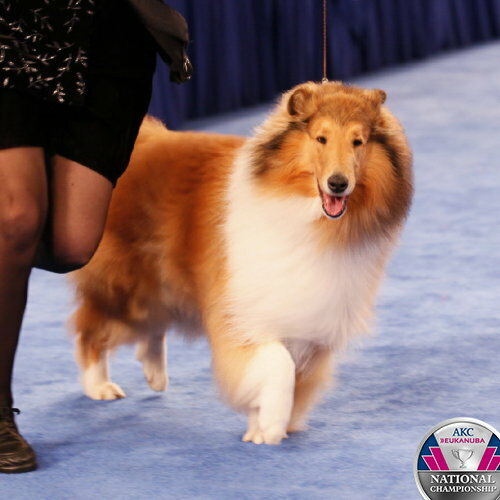 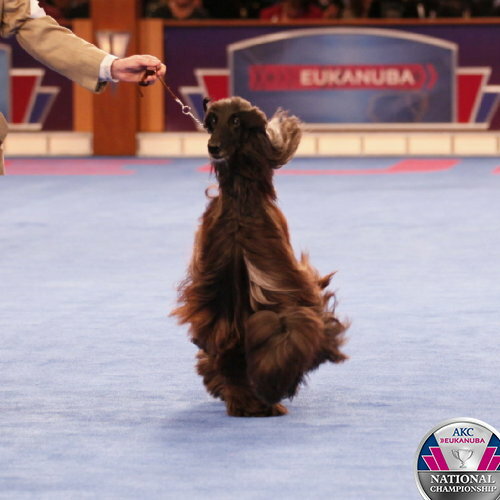 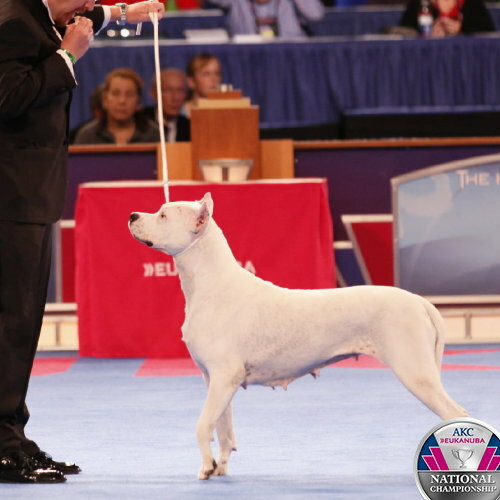 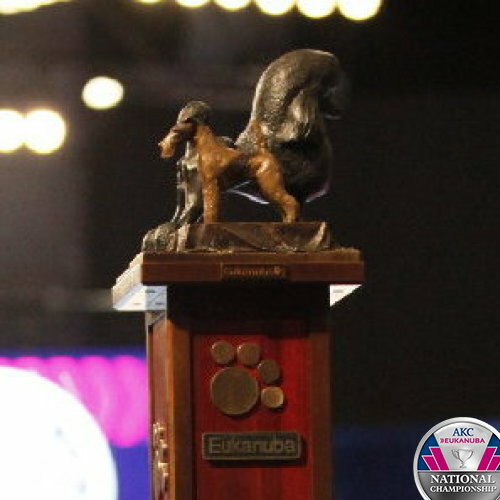 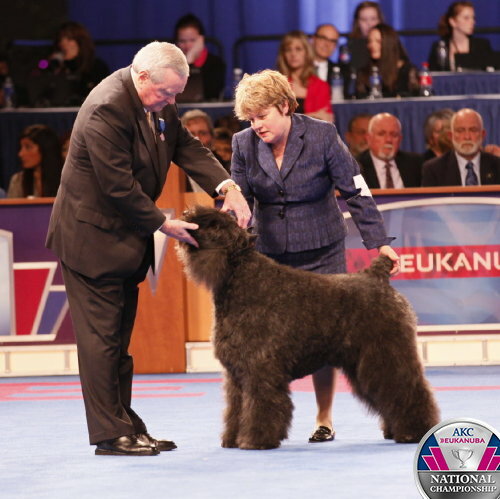 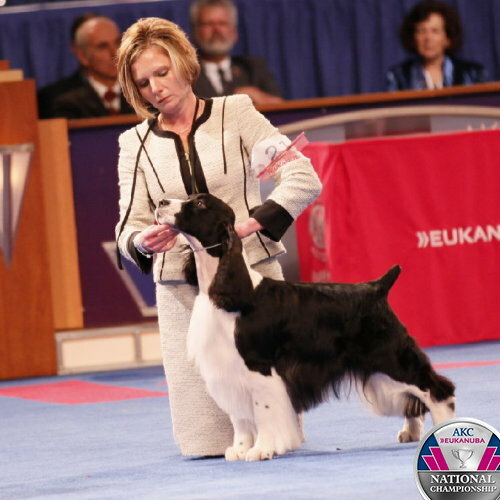 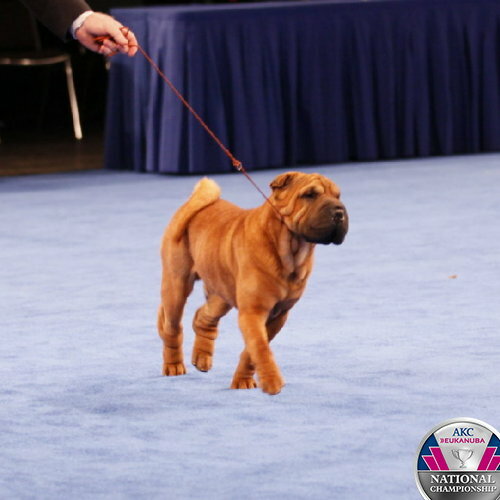 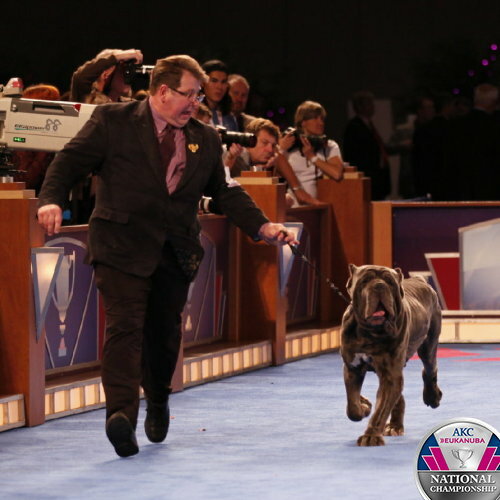 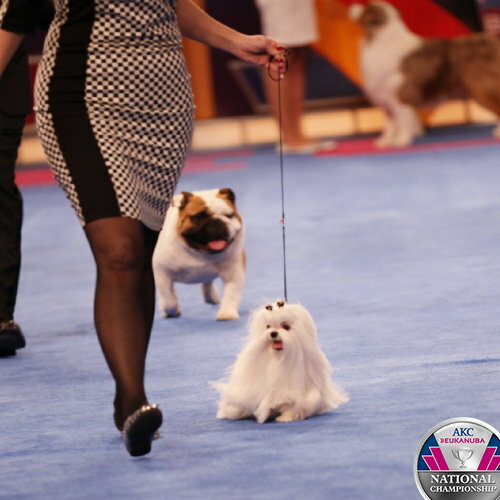 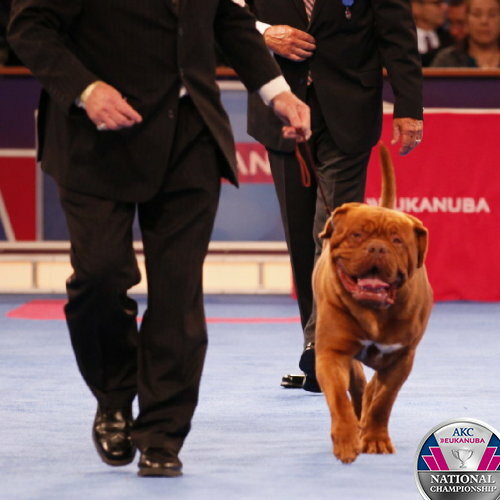 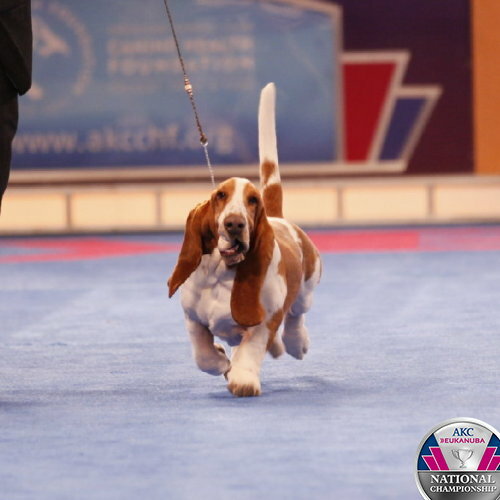 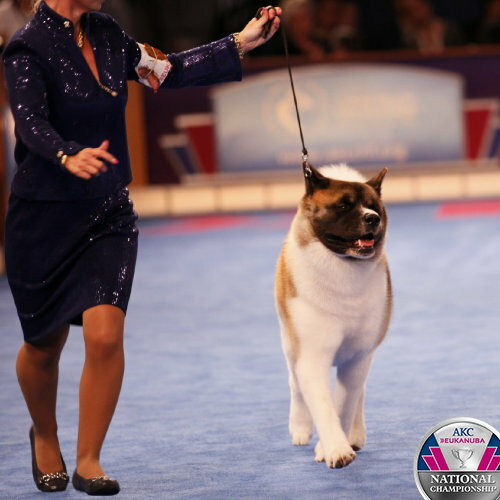 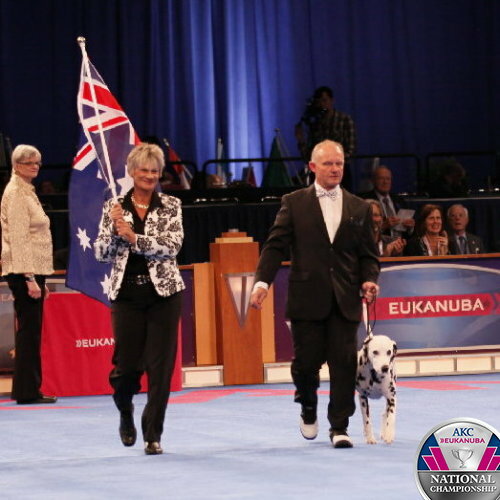 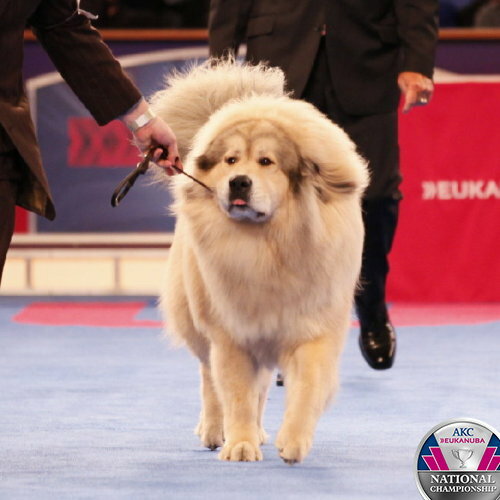 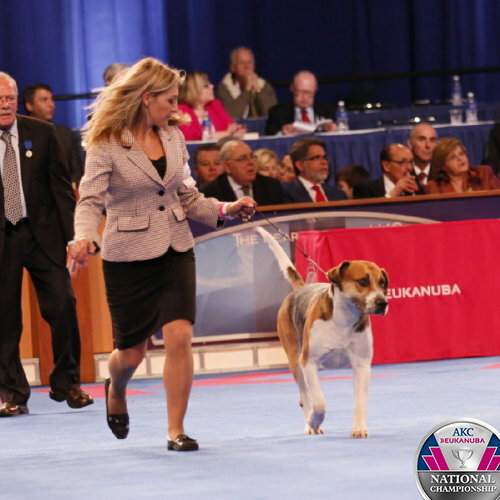 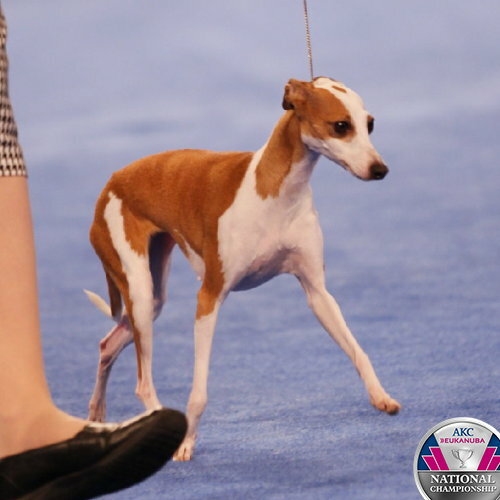 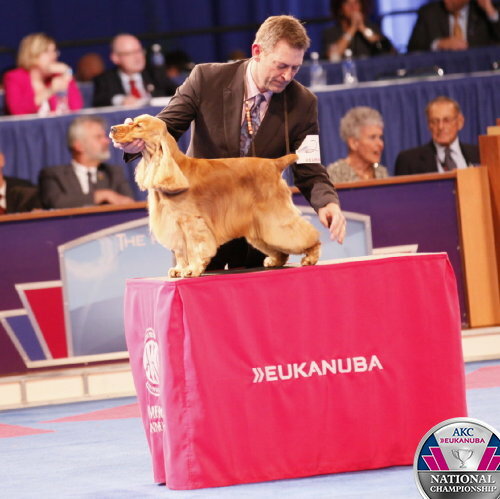 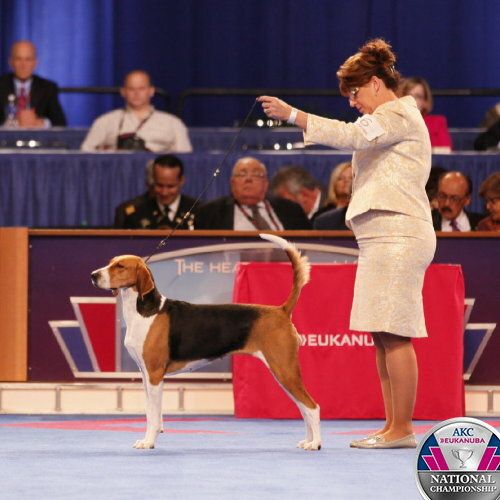 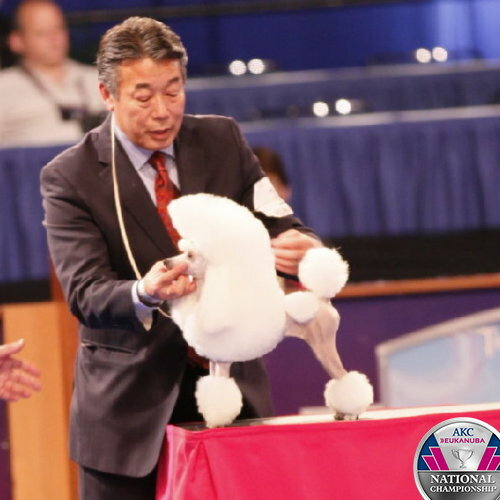 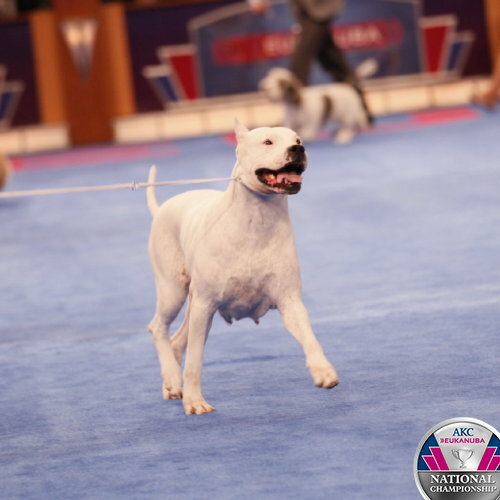 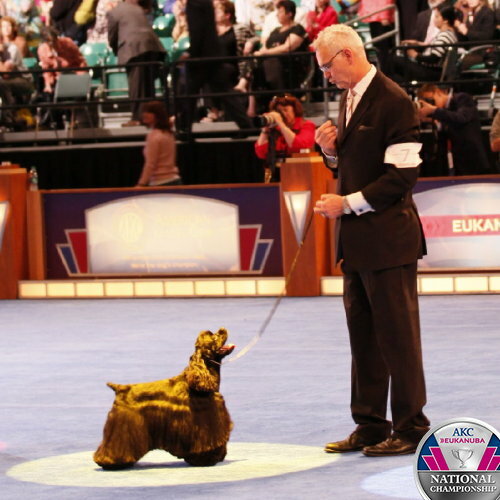 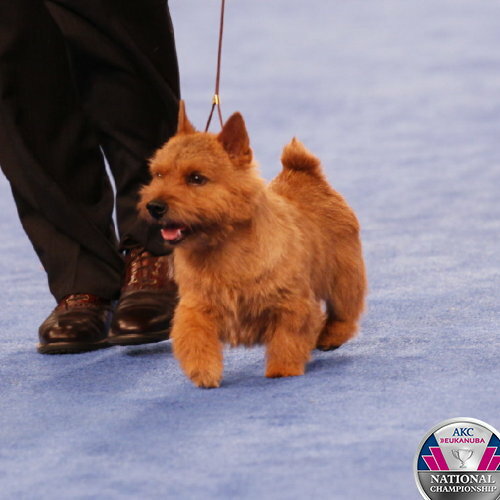 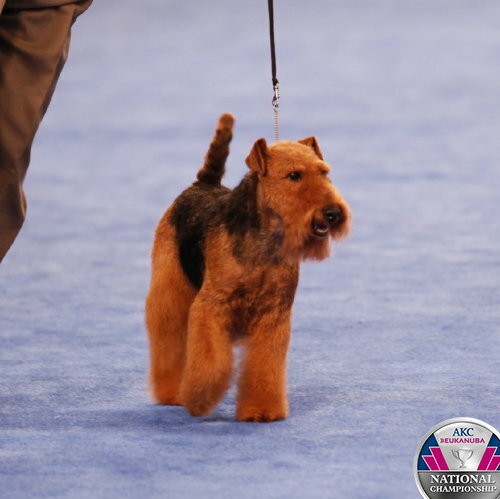 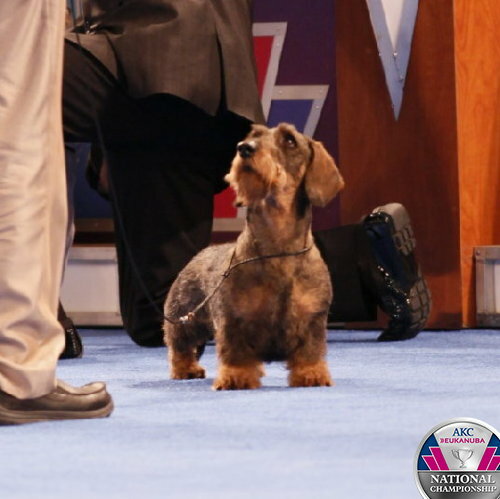 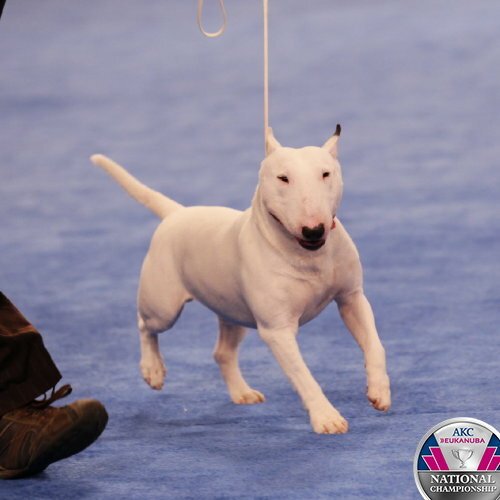 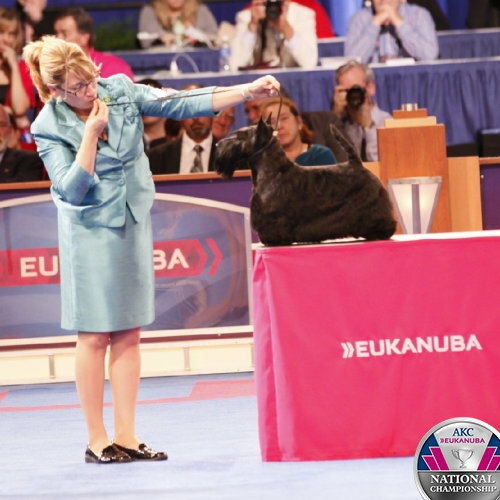 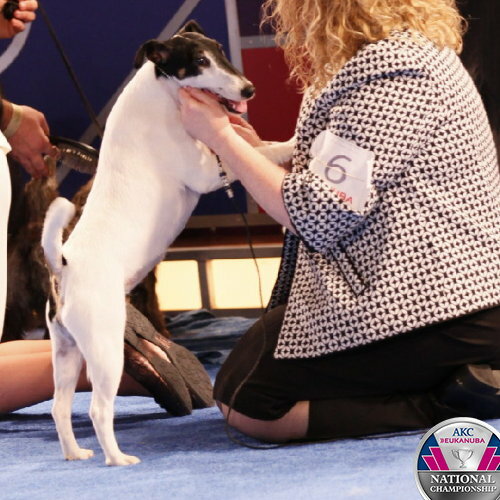 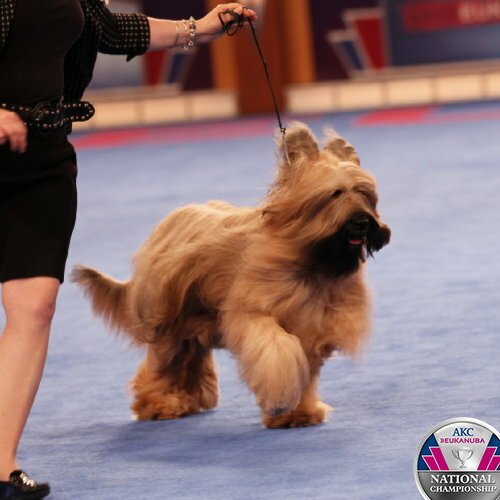 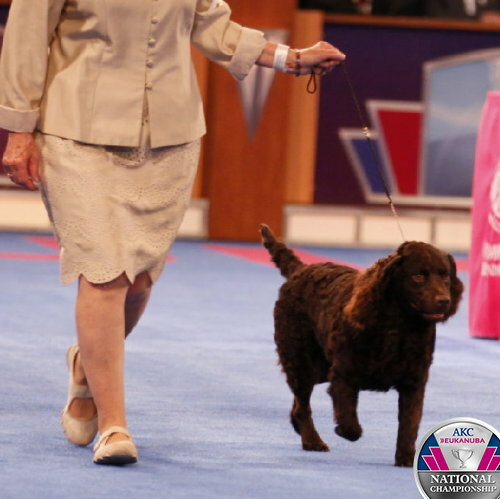 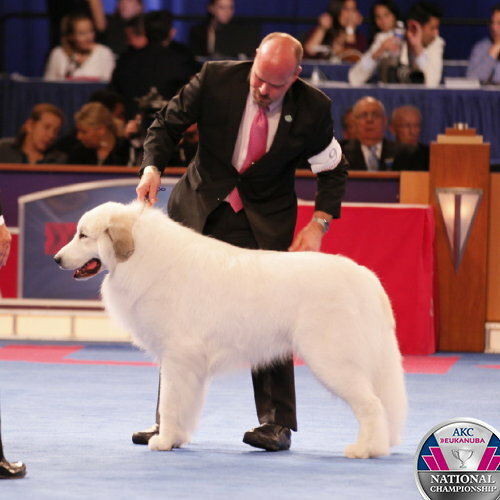 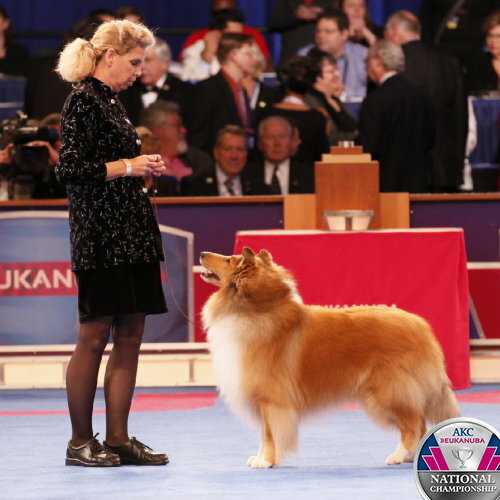 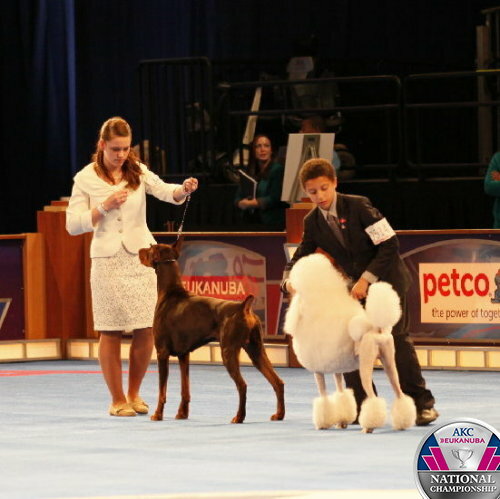 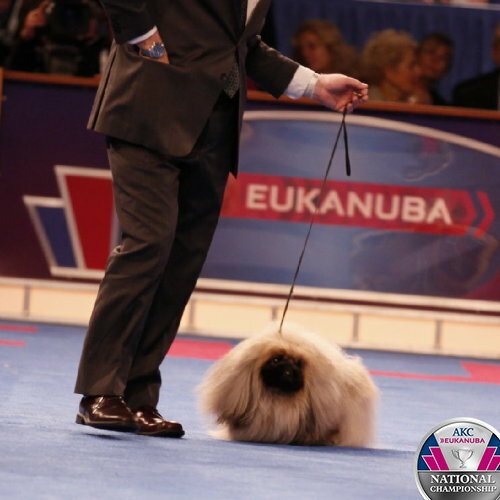 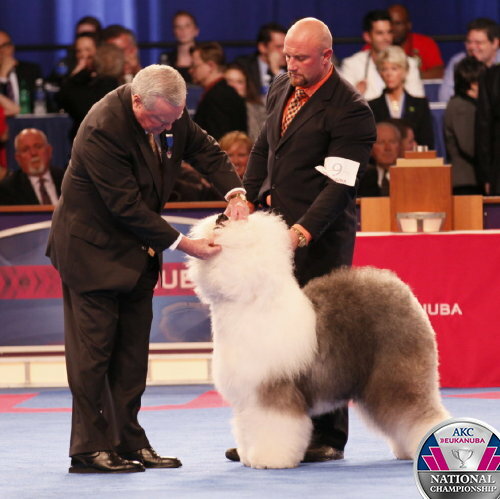 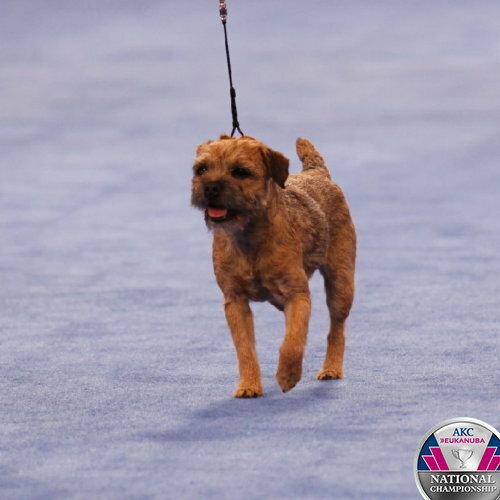 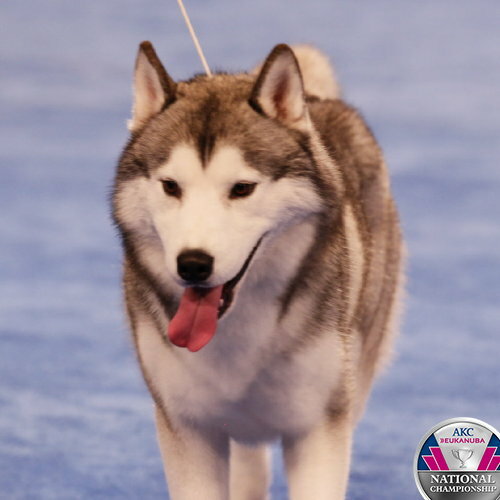 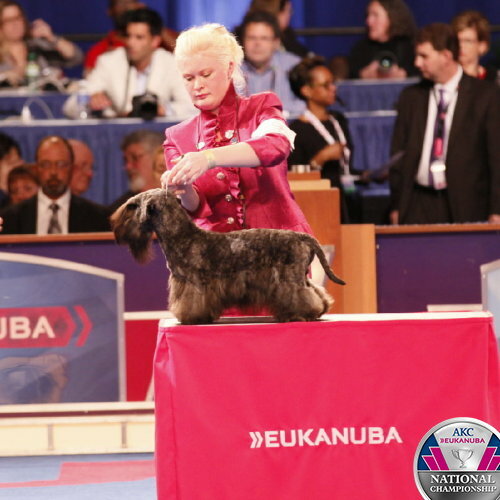 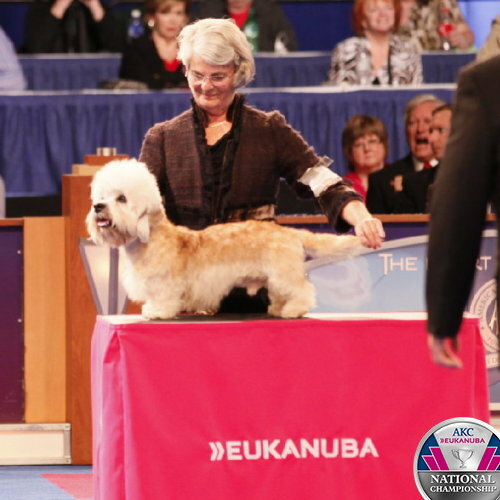 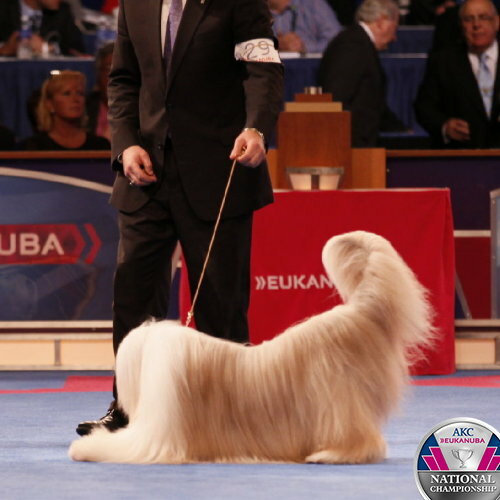 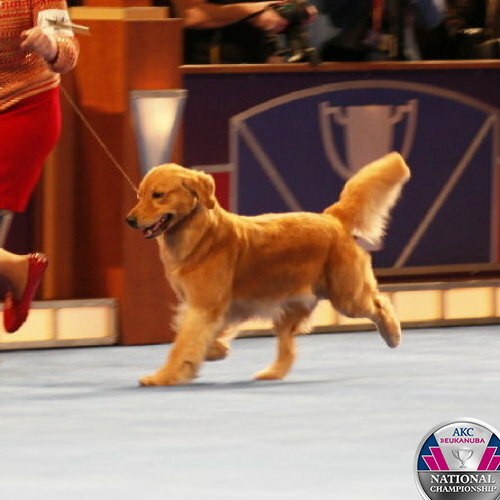 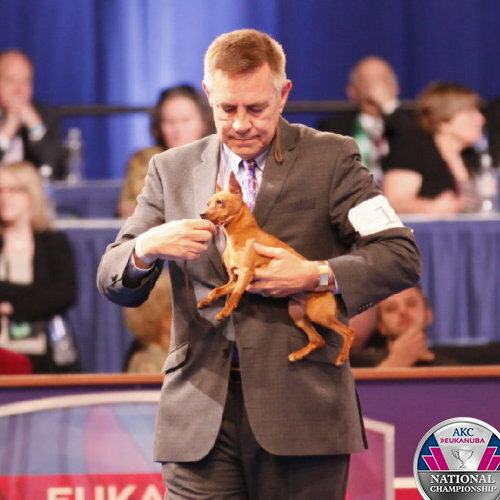 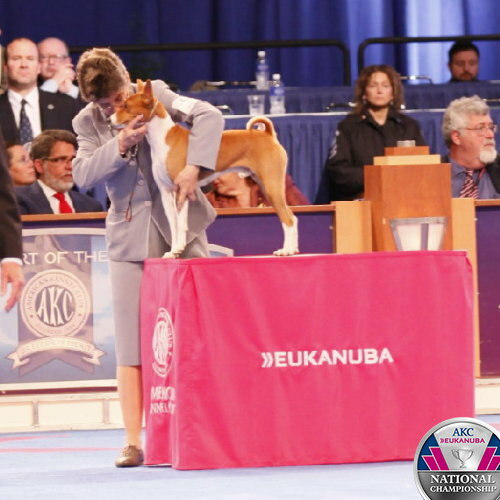 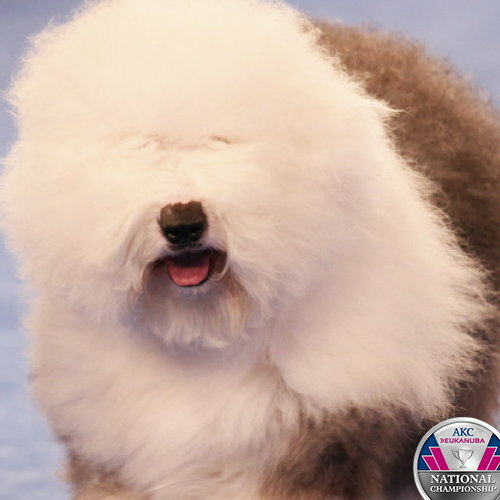 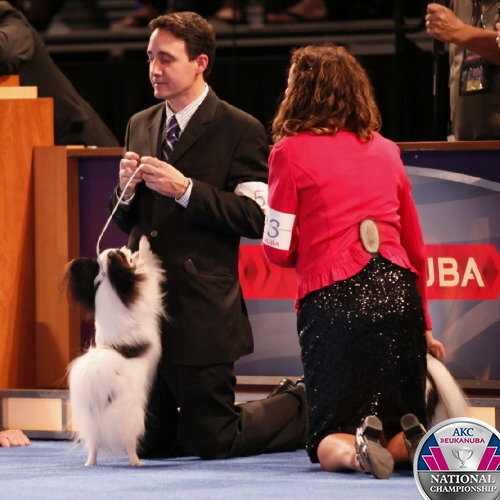 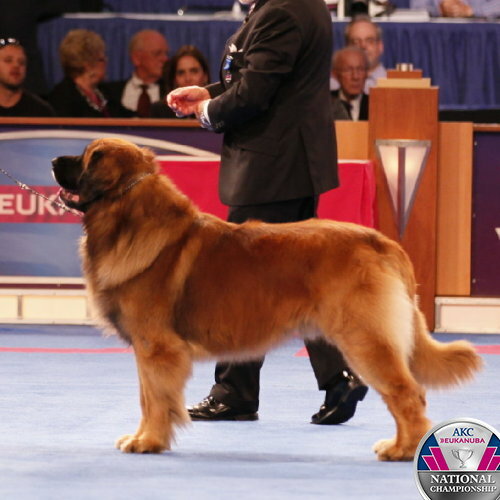 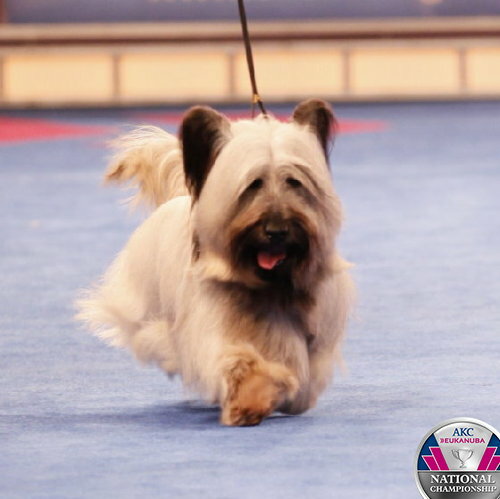 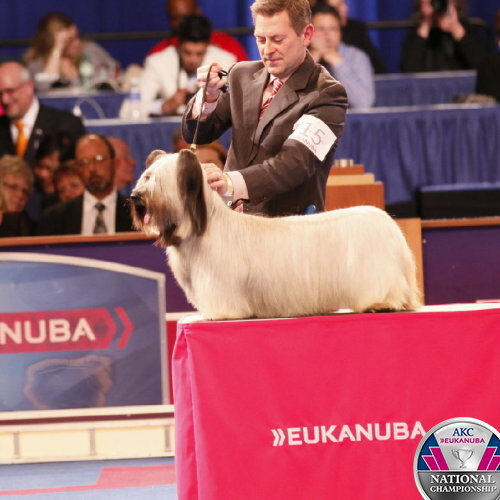 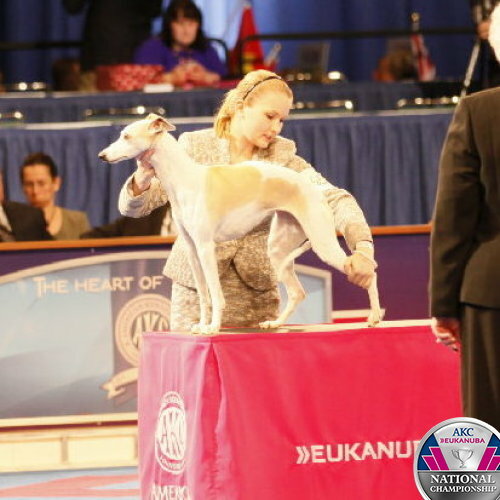 What is the Eukanuba Breeder Stakes? 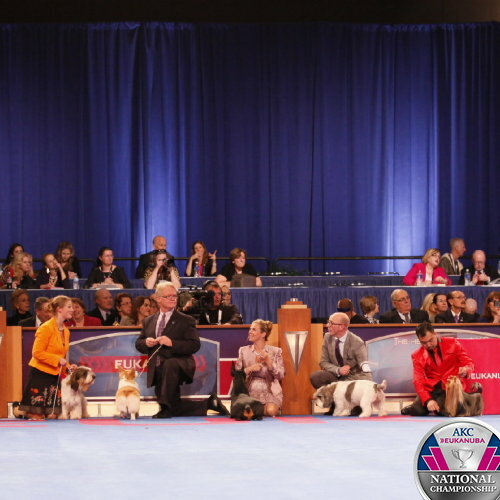 Portuguese Water Dog breed judging. 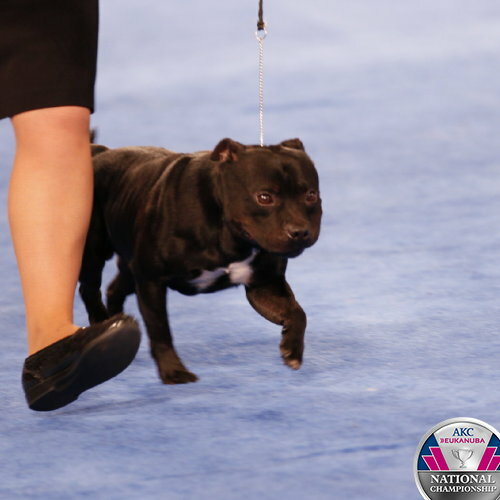 American Staffordshire Terrier breed judging. 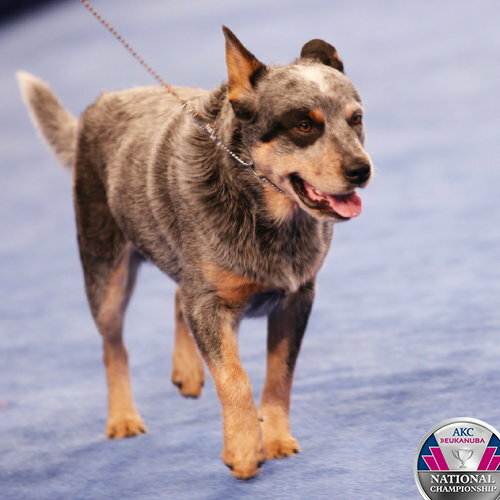 Australian Cattle Dog breed judging. 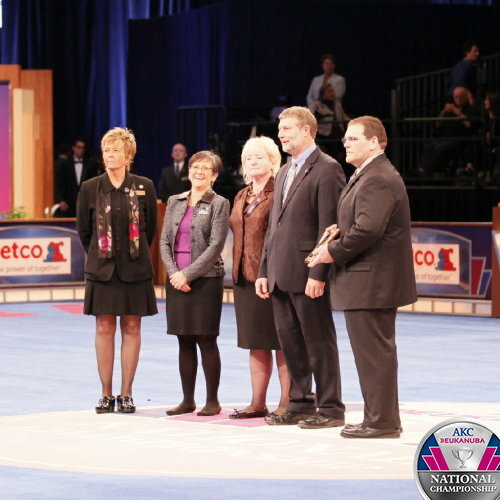 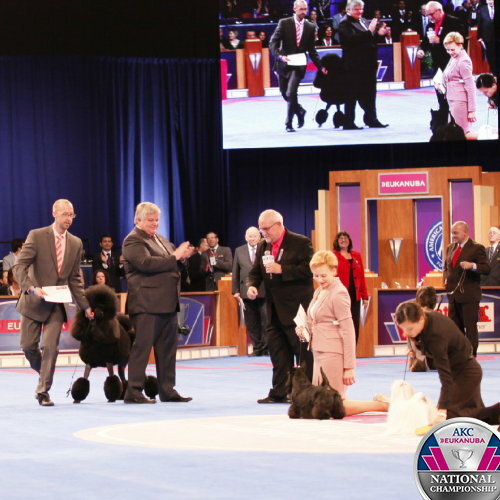 Bouvier des Flandres breed judging. 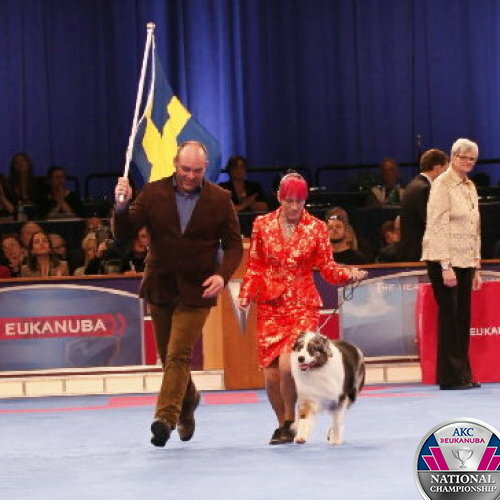 Cardigan Welsh Corgi breed judging. 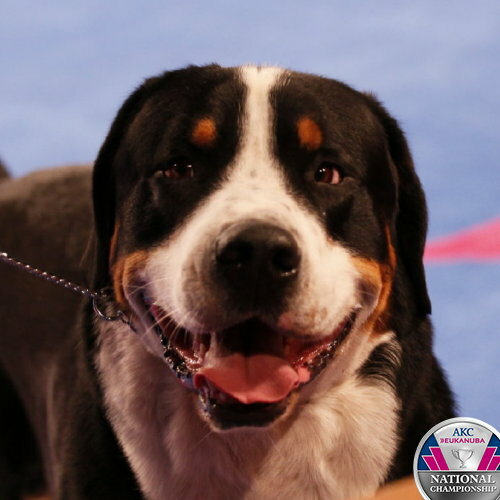 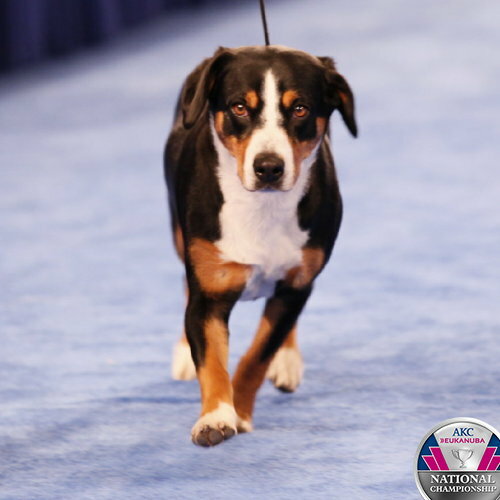 Entlebucher Mountian Dog breed judging. 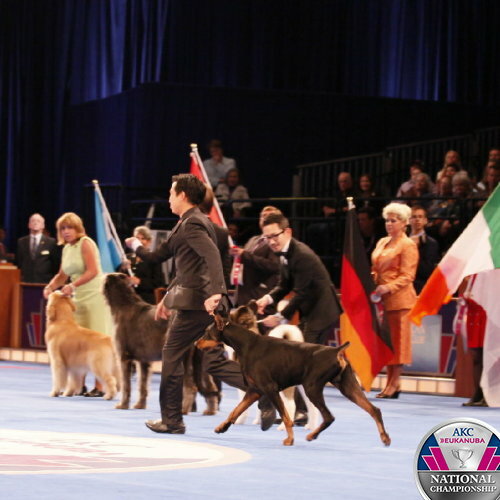 German Shepherd Dog breed judging. 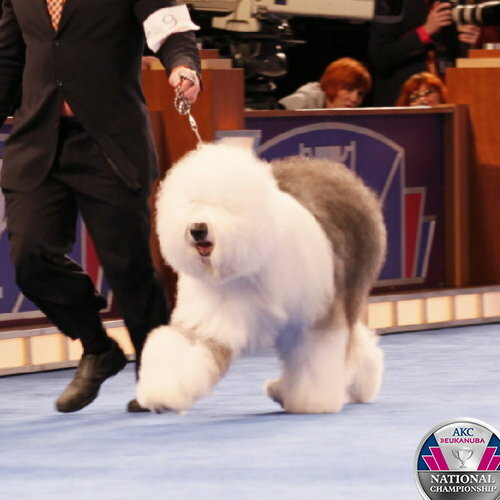 Old English Sheepdog breed judging. 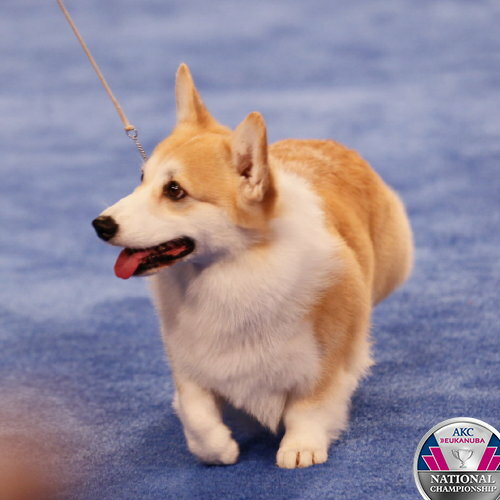 Pembroke Welsh Corgi breed judging. 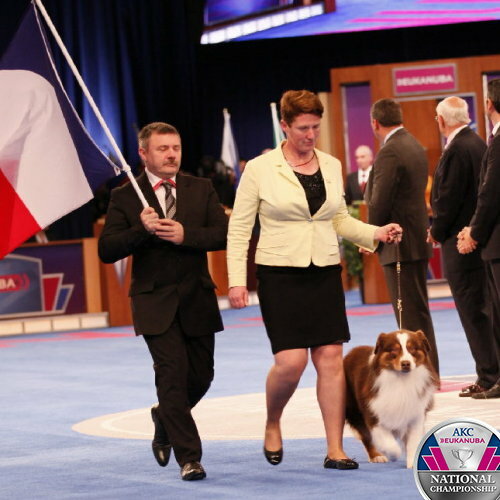 Polish Lowland Sheepdog breed judging. 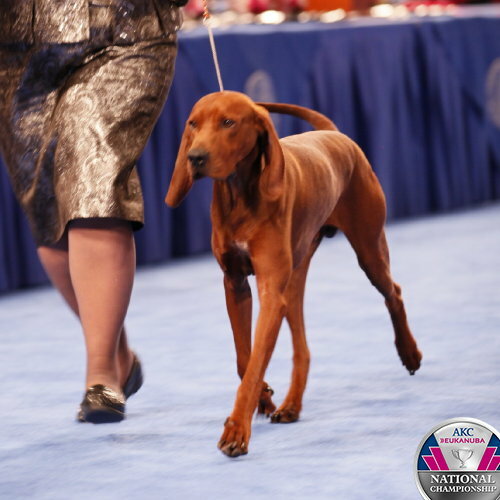 American English Coonhound breed judging. 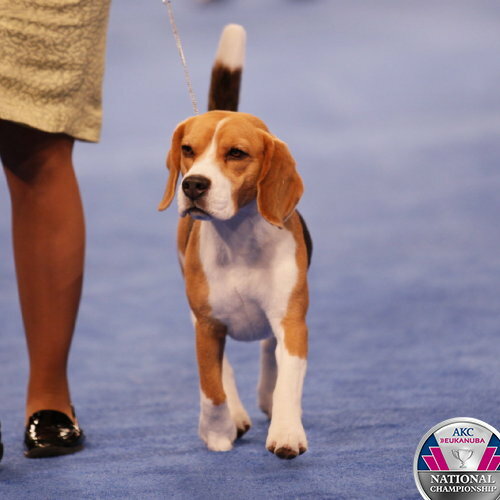 Beagle (13 inch) breed judging. 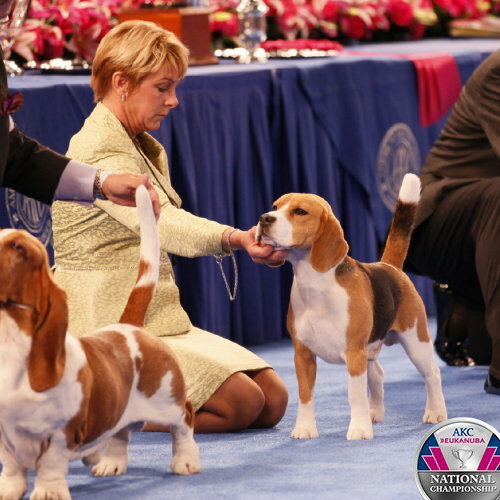 Beagle (15 inch) breed judging. 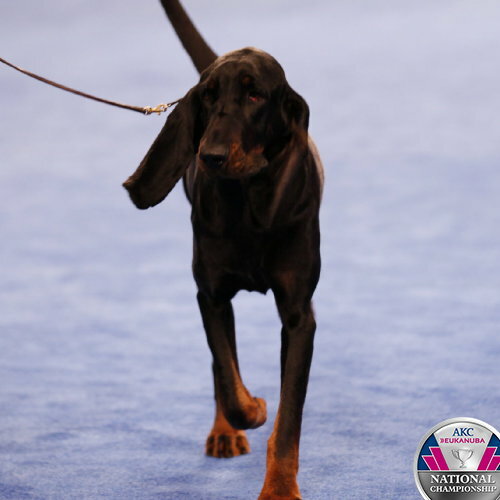 Black and Tan Coonhound breed judging. 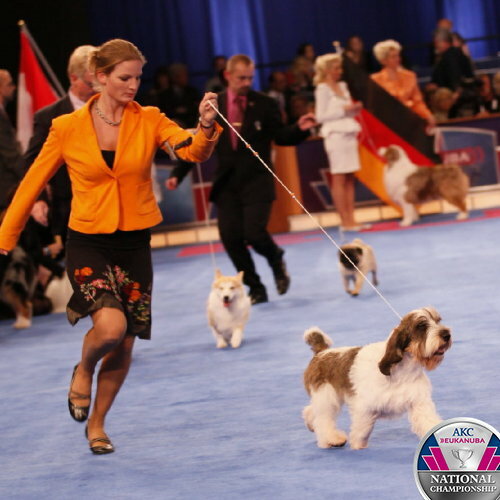 Petit Basset Griffon Vendéen breed judging. 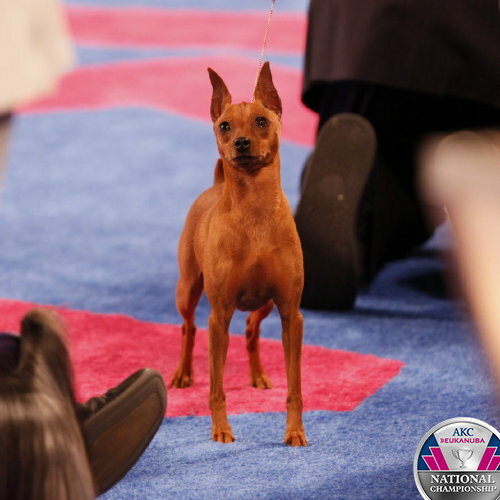 Portuguese Podengo Pequeno breed judging. 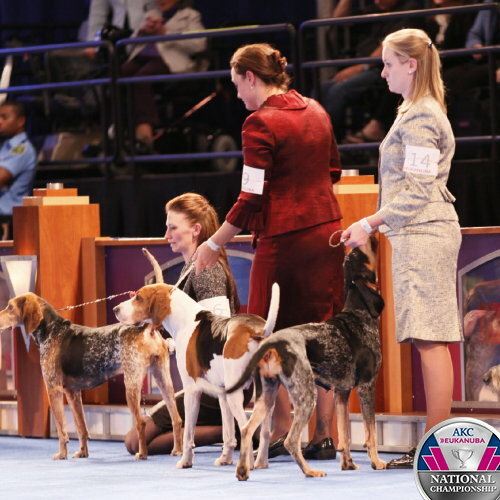 Treeing Walker Coonhounds breed judging. 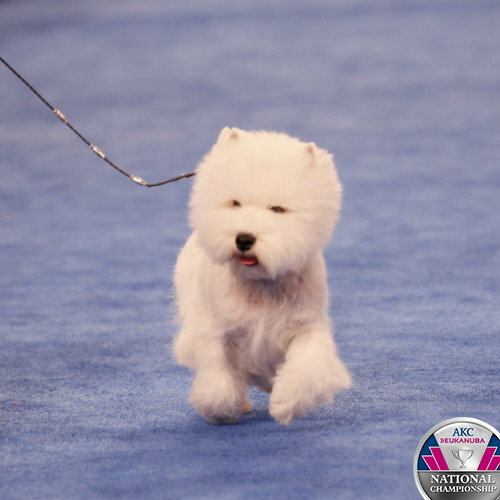 Coton de Tulear breed judging. 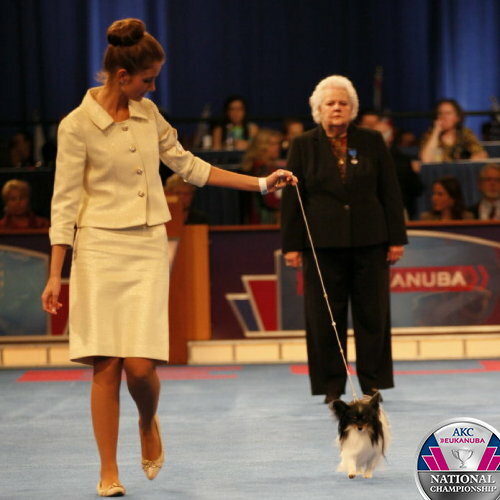 Miniature American Shepherd breed judging. 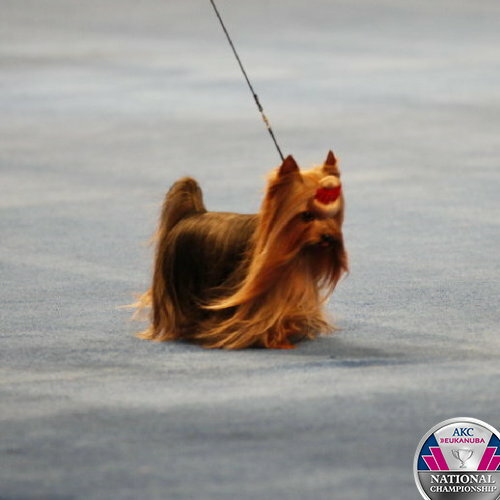 Peruvian Inca Orchid breed judging. 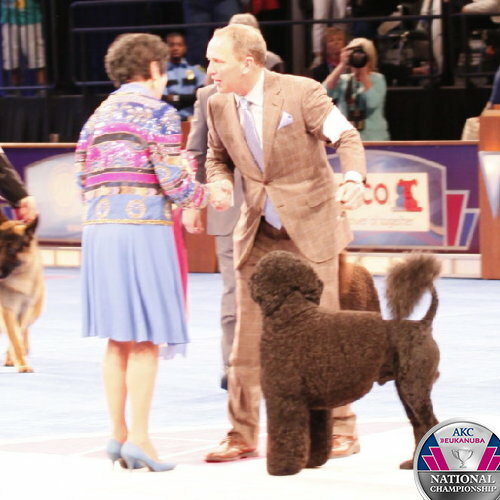 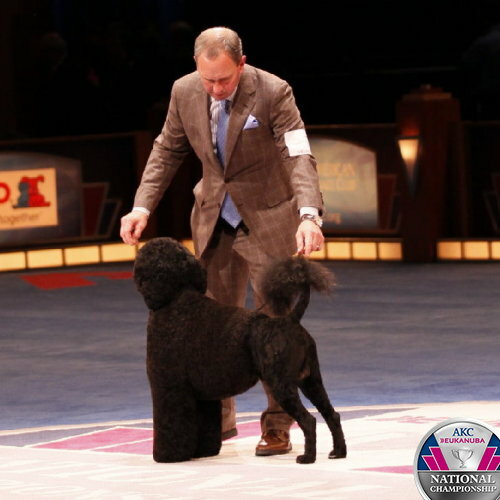 Spanish Water Dog breed judging. 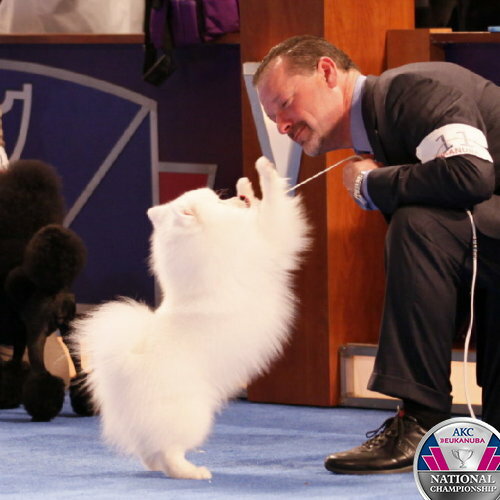 American Eskimo Dog breed judging. 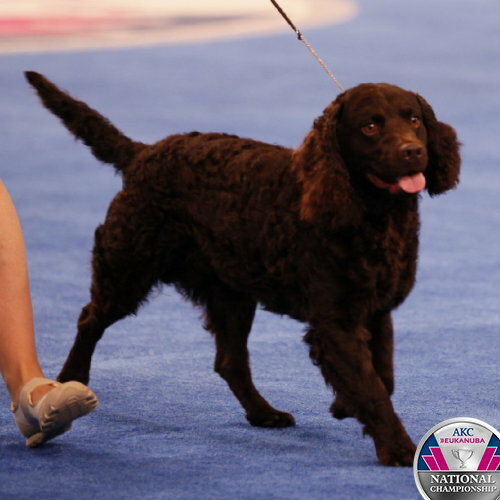 American Water Spaniel breed judging. 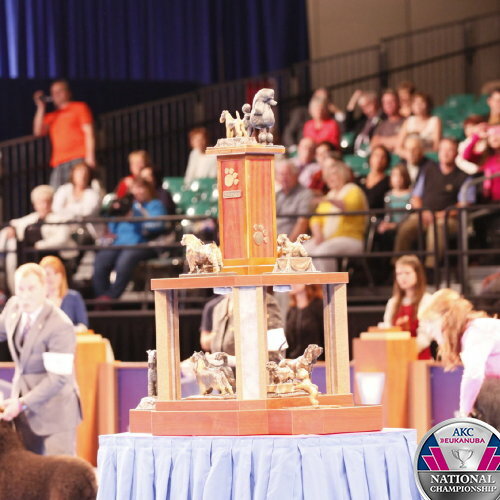 ASCOB Cocker Spaniel breed judging. 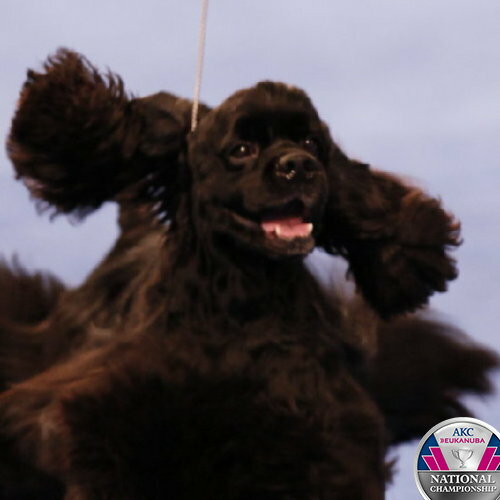 Black Cocker Spaniel breed judging. 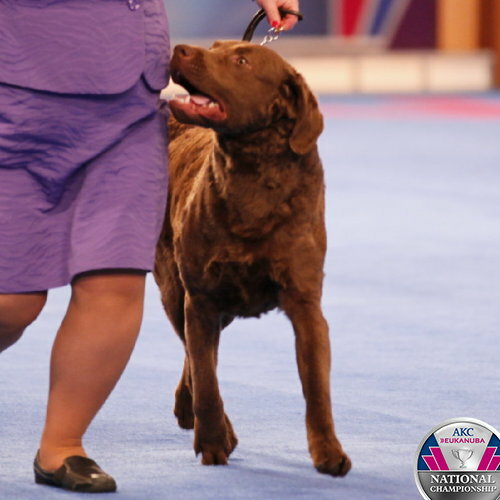 Chesapeake Bay Retriever breed judging. 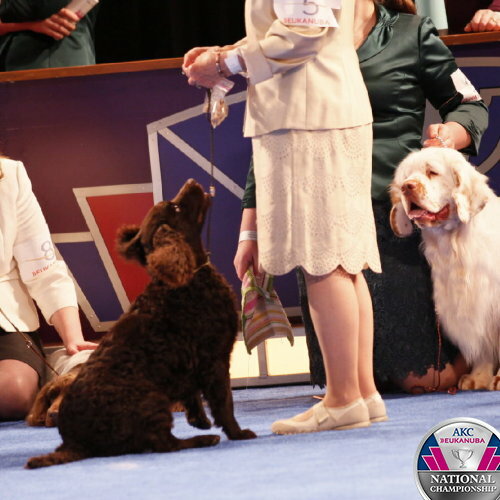 English Cocker Spaniel breed judging. 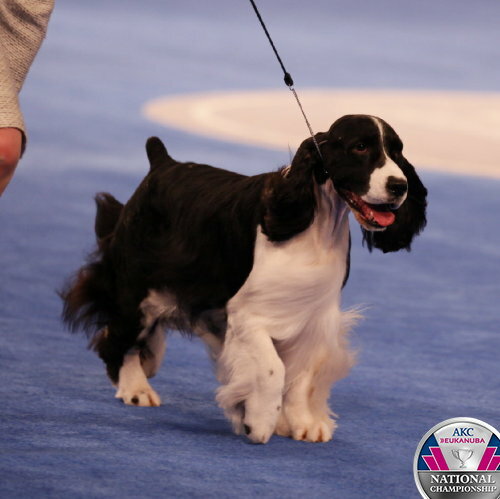 English Springer Spaniel breed judging. 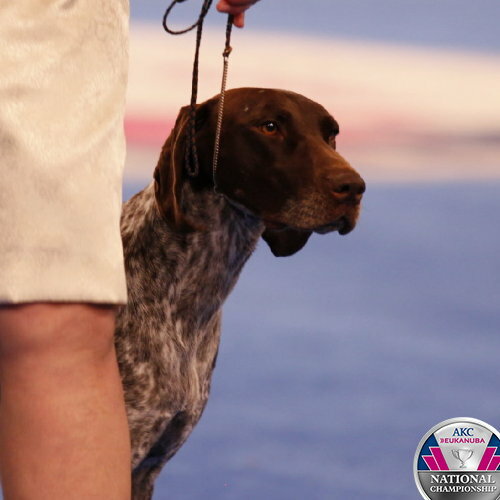 German Shorthaired Pointer breed judging. 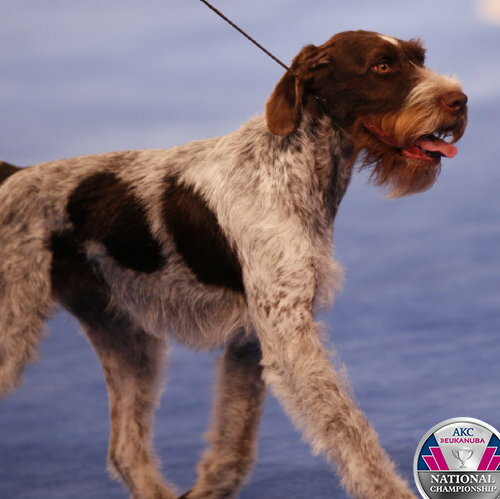 German Wirehaired Pointer breed judging. 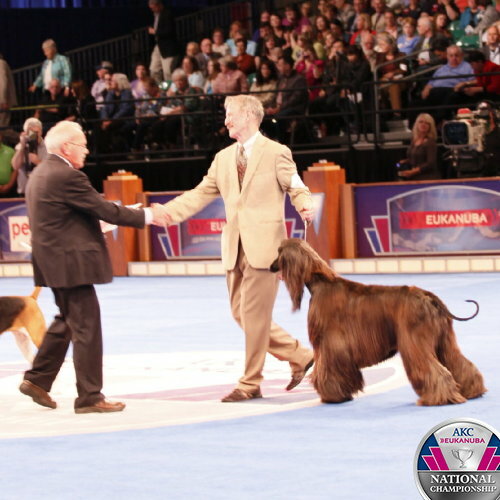 Irish Red and White Setter breed judging. 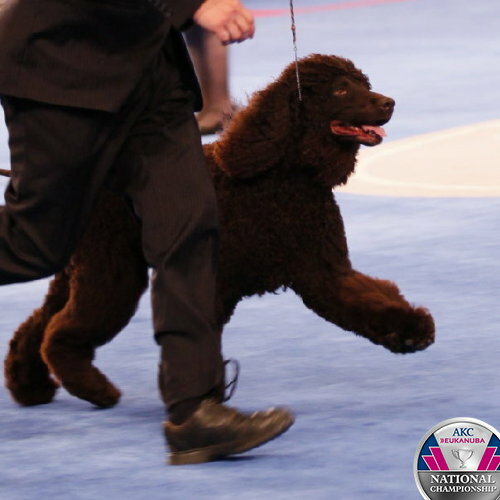 The Irish Water Spaniel best of breed at the Sporting Group Judging. 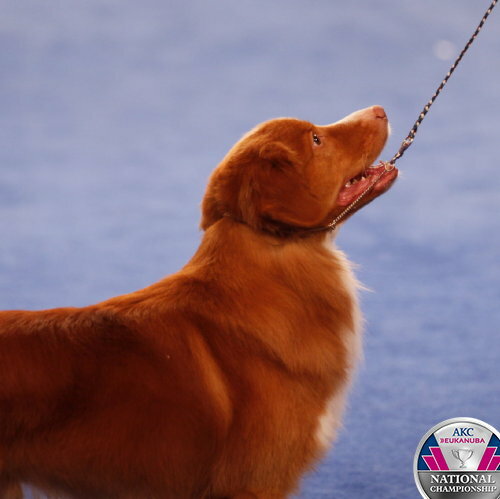 Nova Scotia Duck Tolling Retriever breed judging. 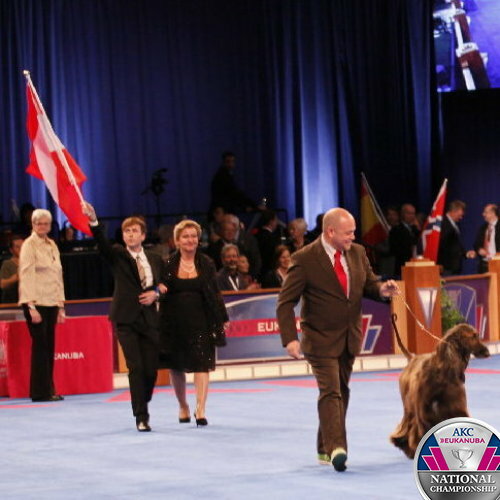 Parti-Color Cocker Spaniel breed judging. 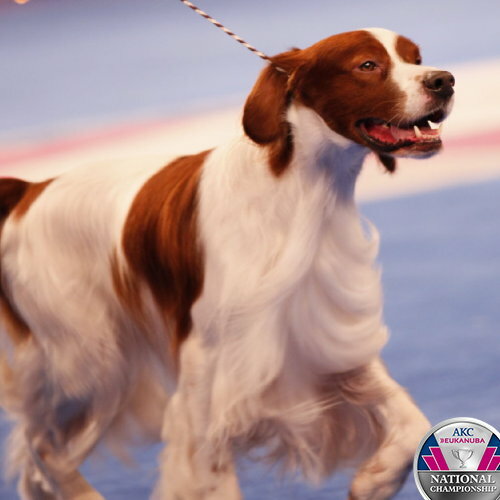 The best of breed Welsh Springer Spaniel at the Sporting Group Judging. 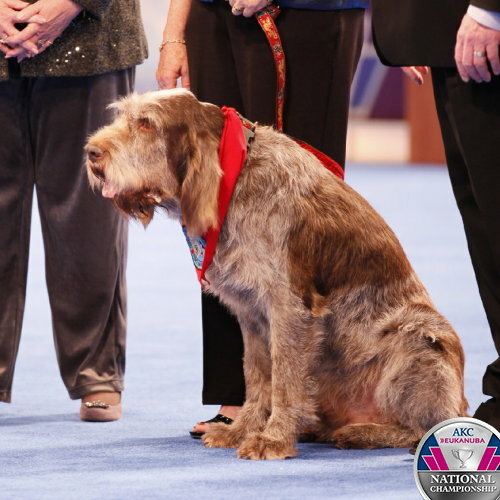 The best of breed Wirehaired Pointing Griffon at the Sporting Group Judging. 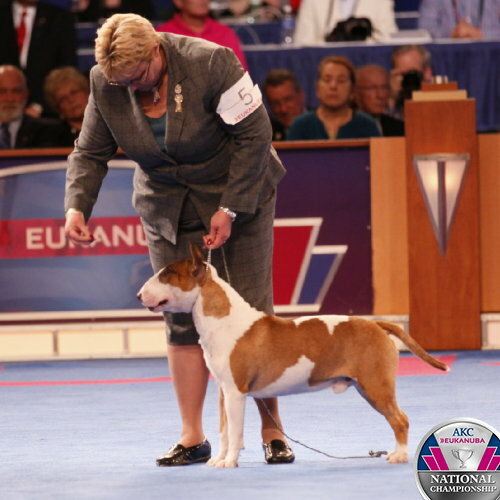 Colored Bull Terrier breed judging. 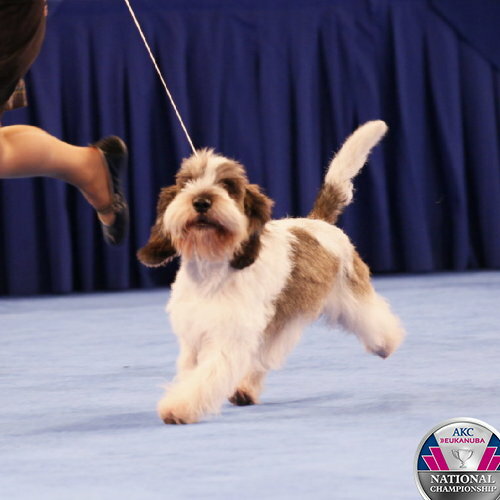 Dandie Dinmont Terrier breed judging. 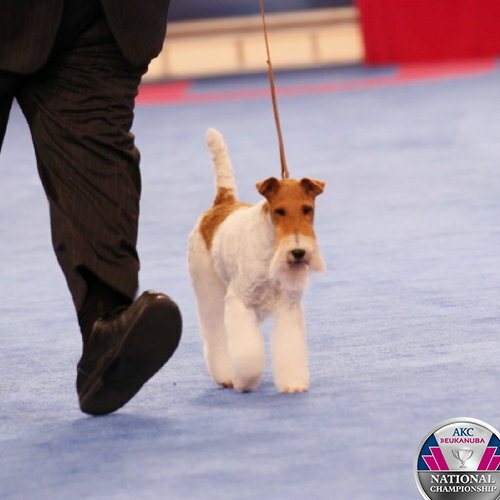 Glen of Imaal Terrier breed judging. 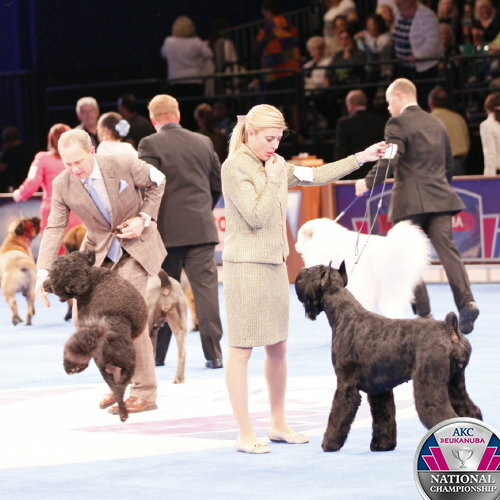 Kerry Blue Terrier breed judging. 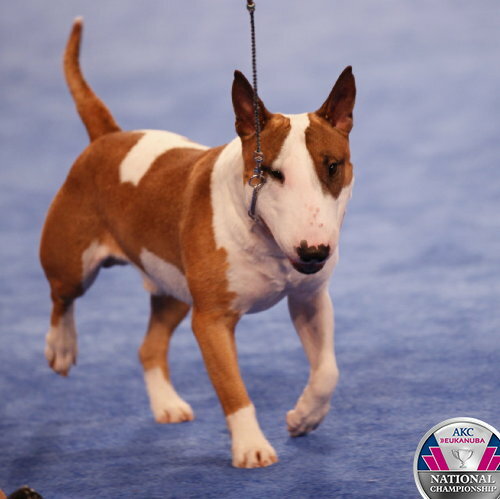 Miniature Bull Terrier breed judging. 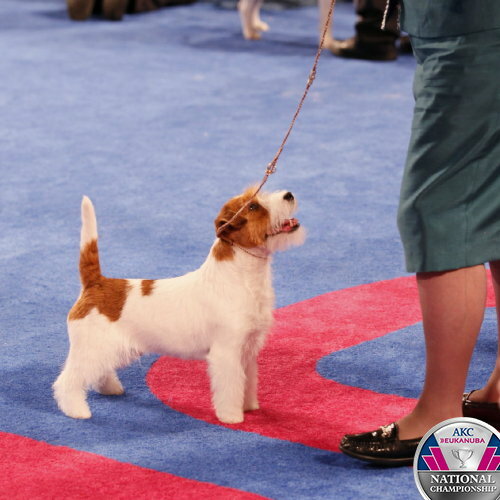 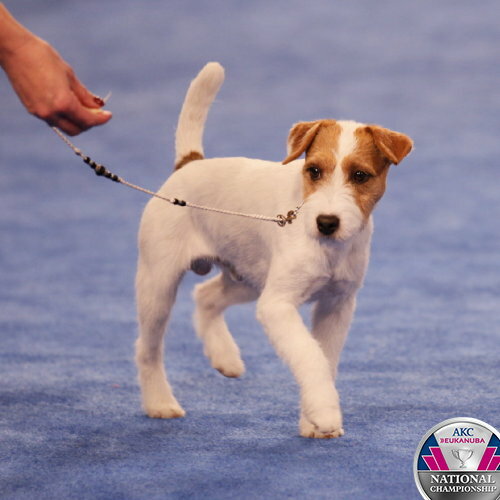 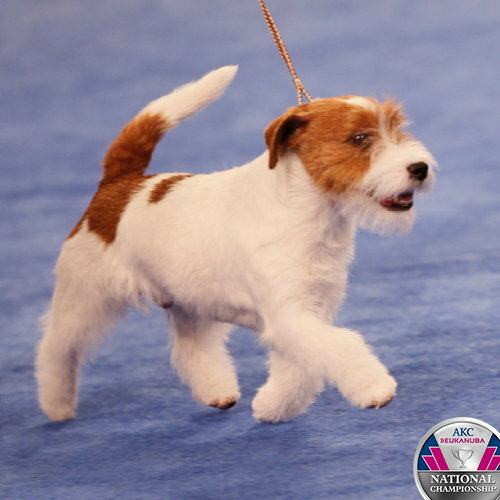 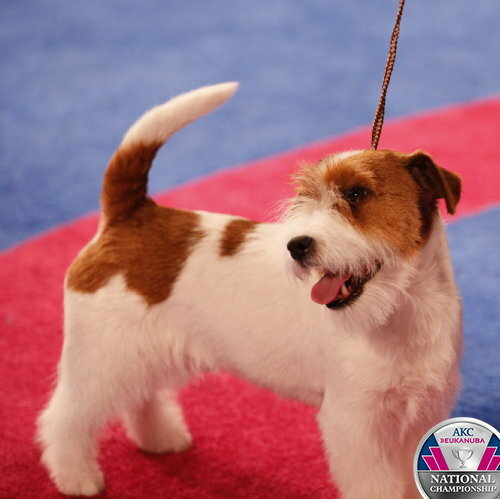 Parson Russell Terrier breed judging. 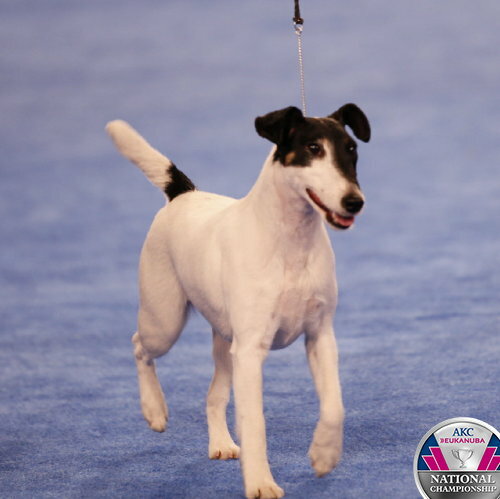 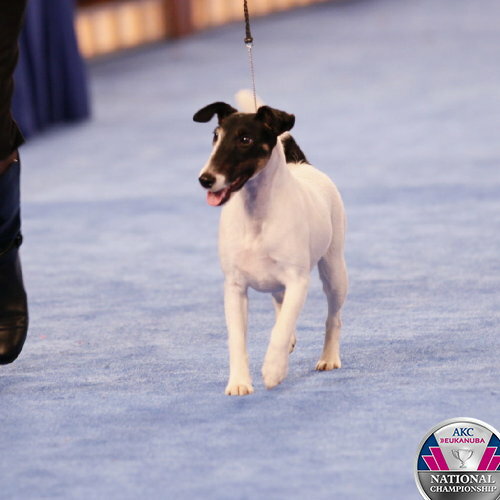 Smooth Fox Terrier breed judging. 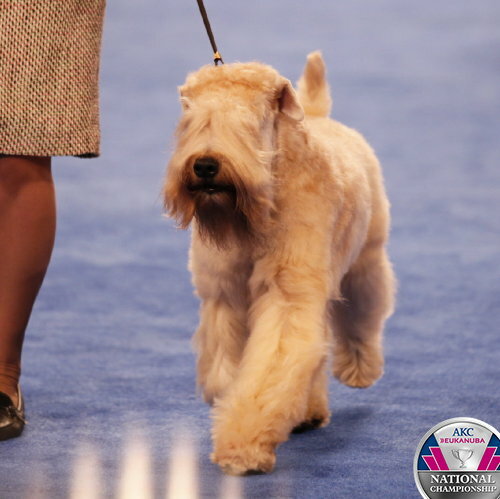 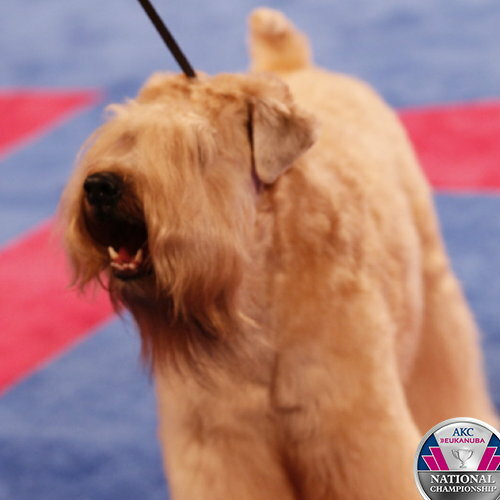 Soft Coated Wheaten Terrier breed judging. 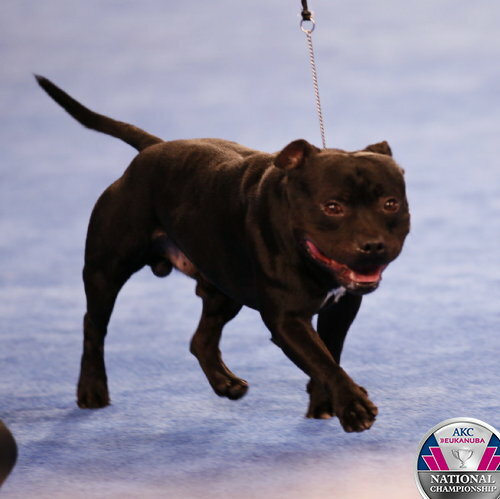 Staffordshire Bull Terrier breed judging. 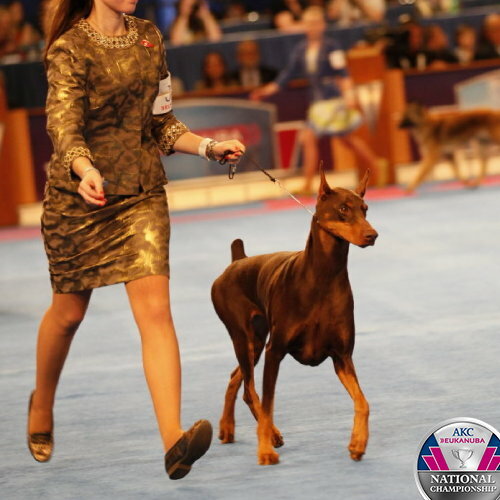 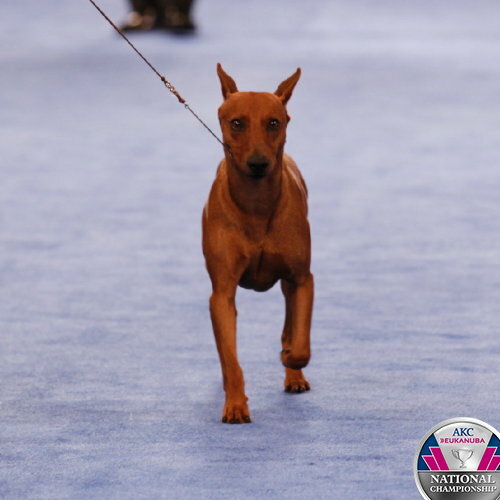 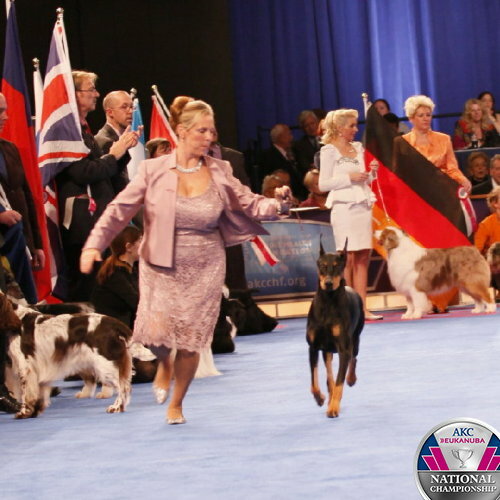 Standard Manchester Terrier breed judging. 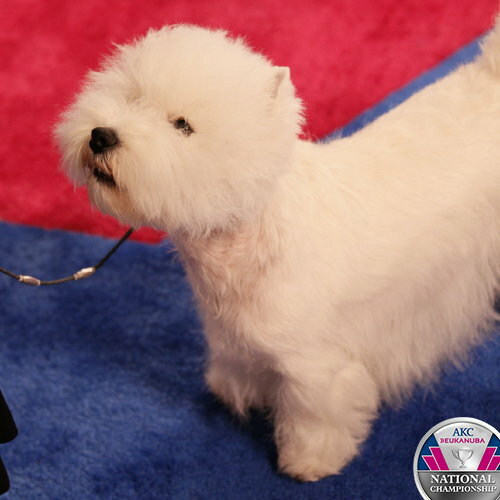 West Highland White Terrier breed judging. 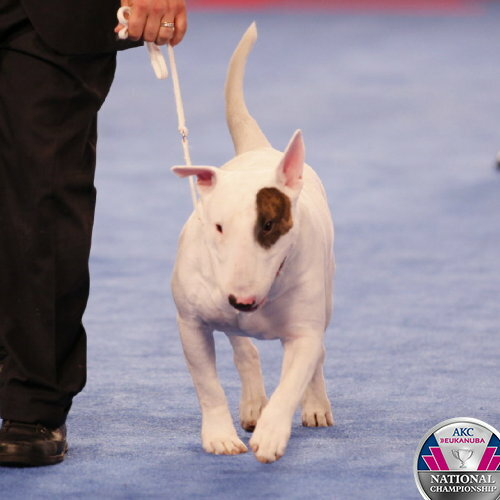 White Bull Terrier breed judging. 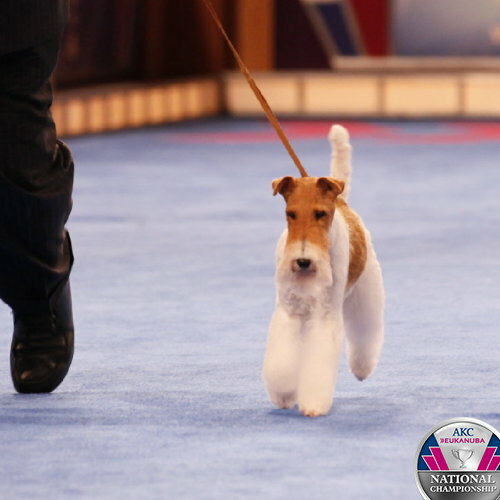 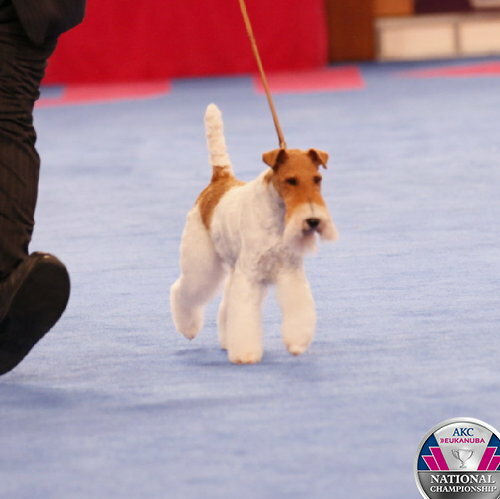 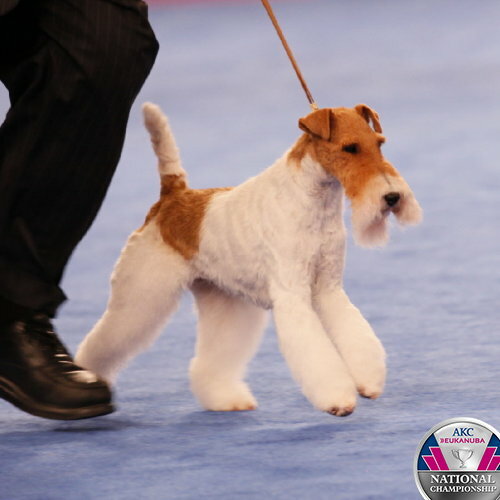 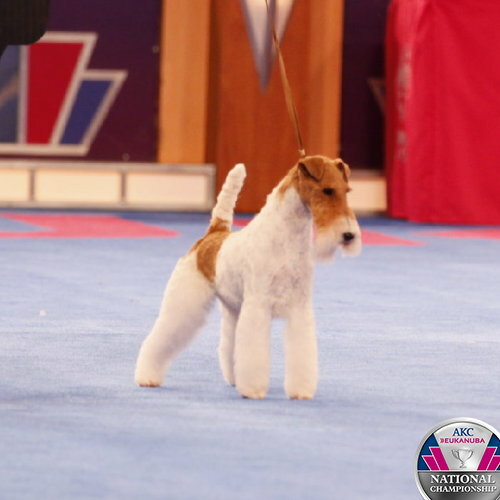 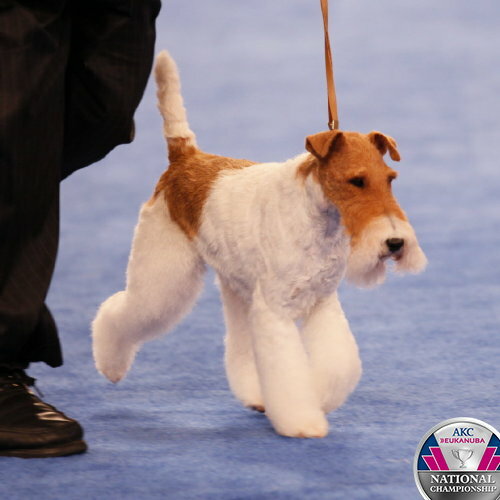 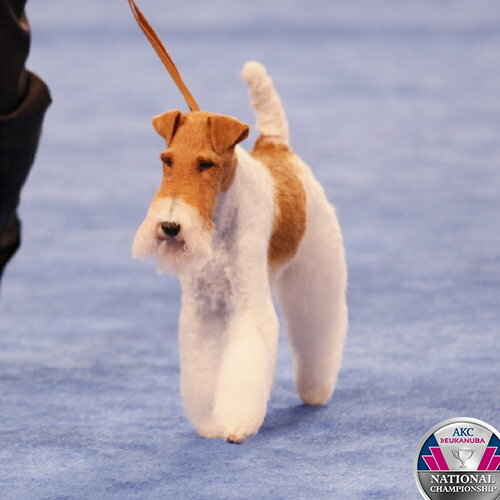 Wire Fox Terrier breed judging. 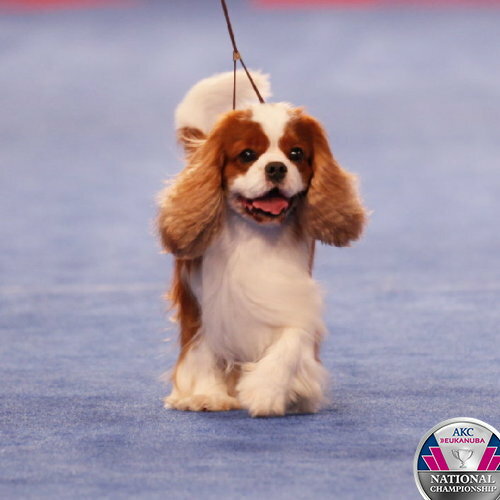 Cavalier King Charles Spaniel breed judging. 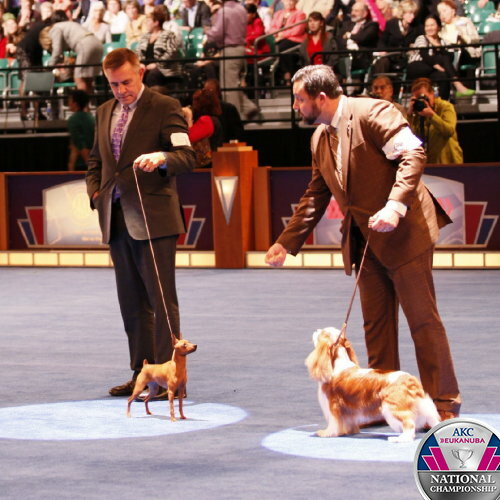 Chihuahua (Long Coat) breed judging. 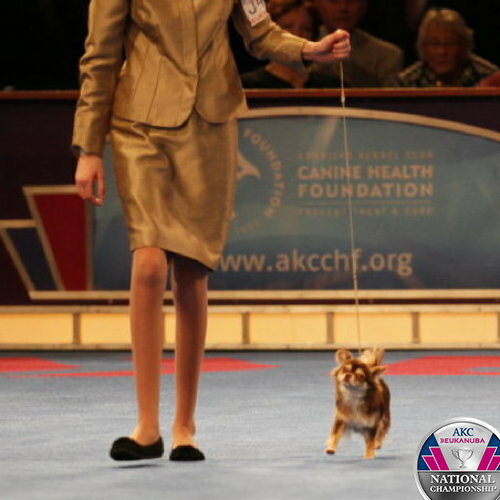 Chihuahua (Smooth Coat) breed judging. 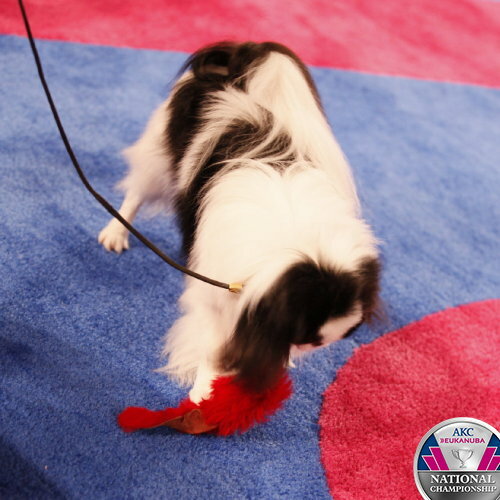 English Toy Spaniel (Blenheim and Prince Charles) breed judging. 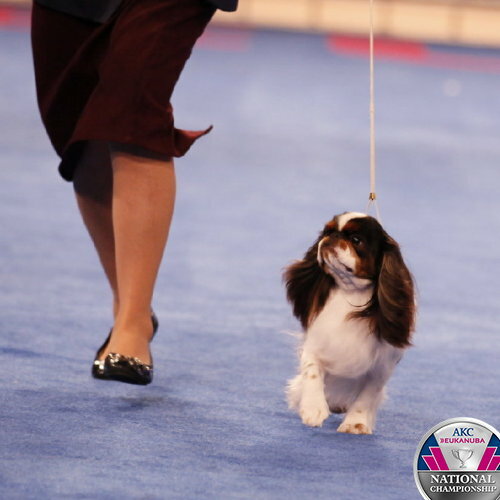 English Toy Spaniel King Charles and Ruby breed judging. 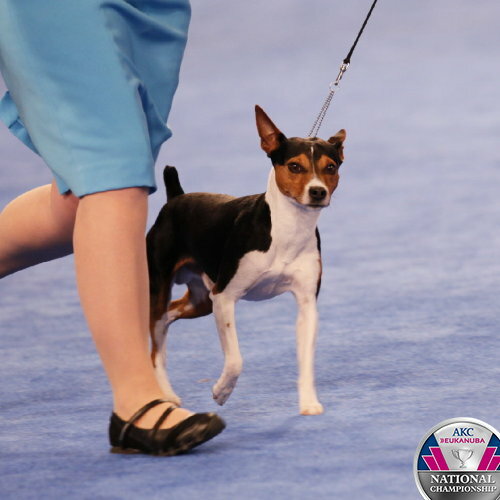 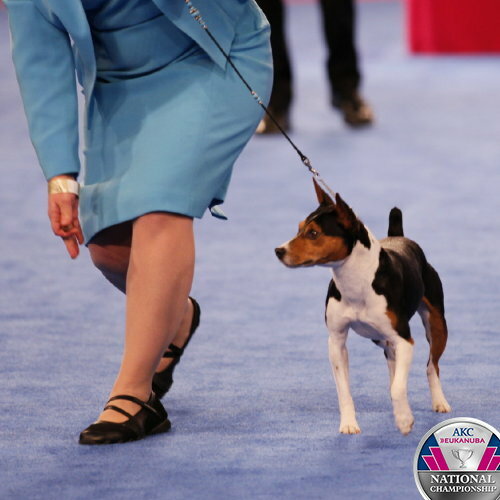 Toy Fox Terrier breed judging. 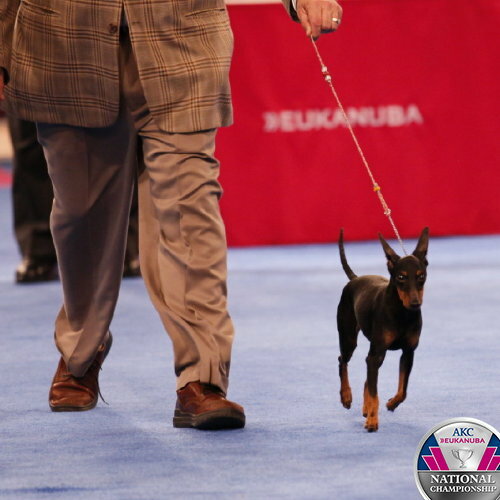 Toy Manchester Terrier breed judging. 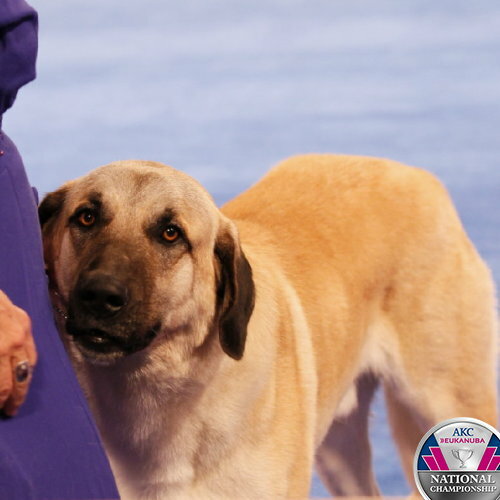 Anatolian Shepherd Dog breed judging. 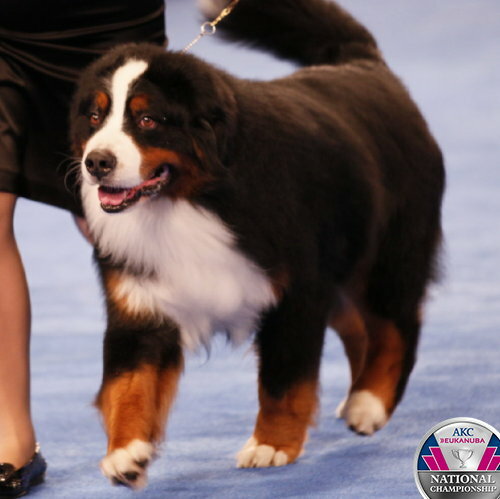 Bernese Mountain Dog breed judging. 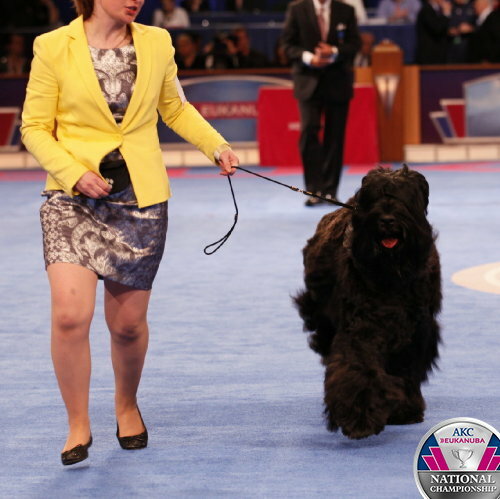 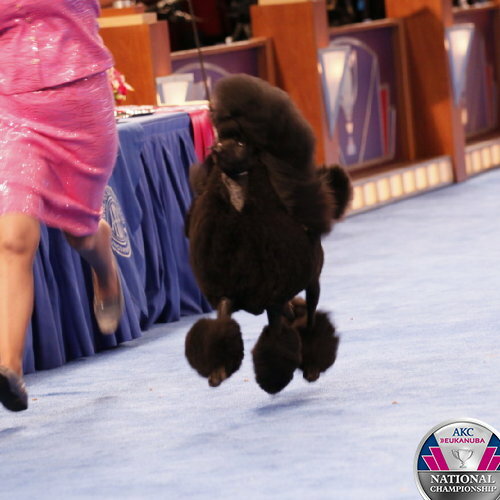 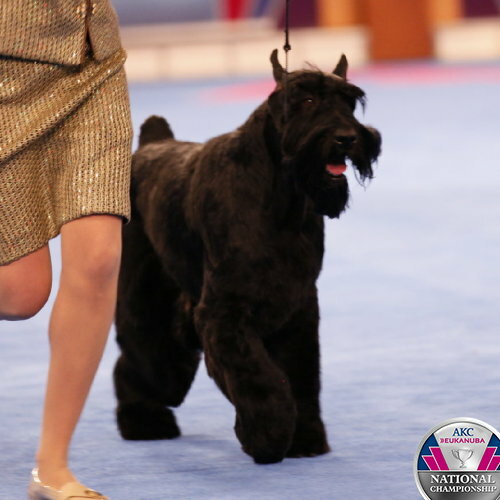 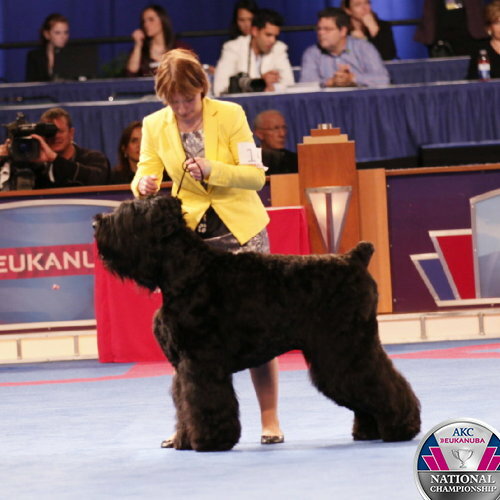 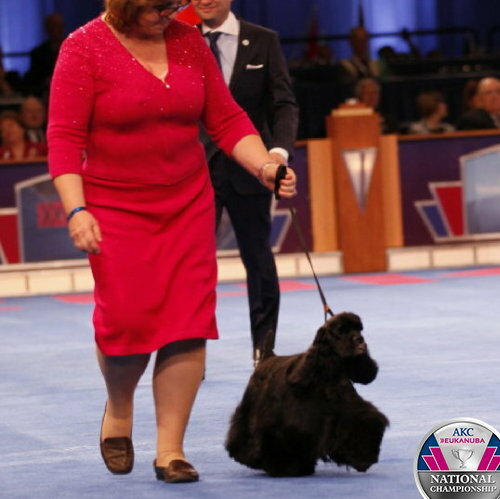 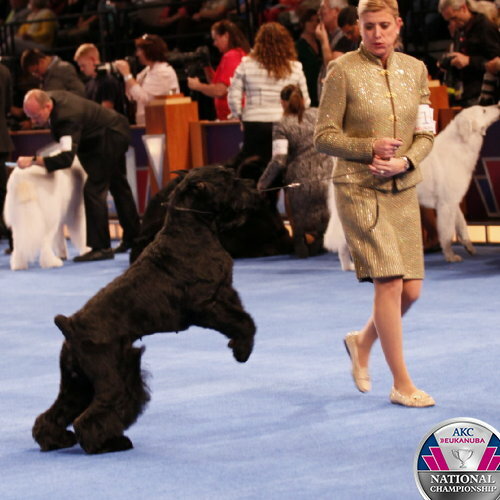 Black Russian Terrier breed judging. 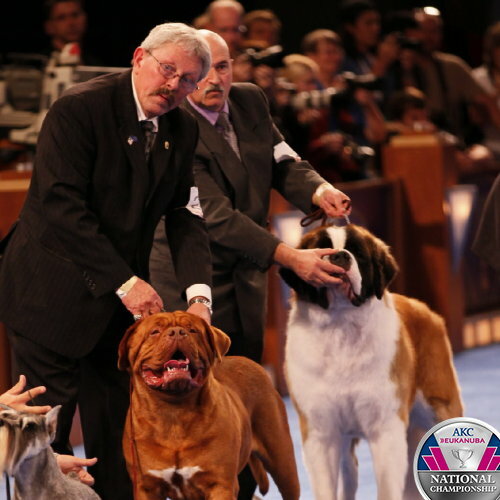 Dogue de Bordeaux breed judging. 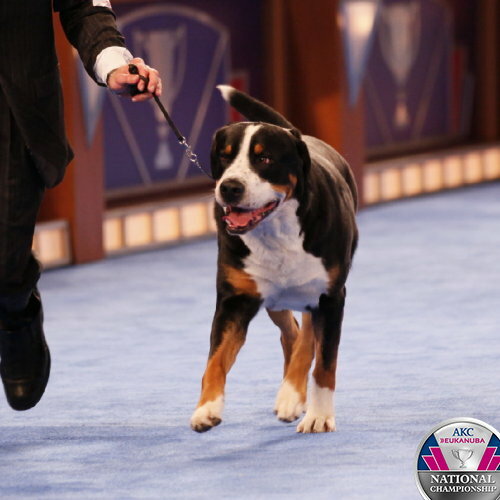 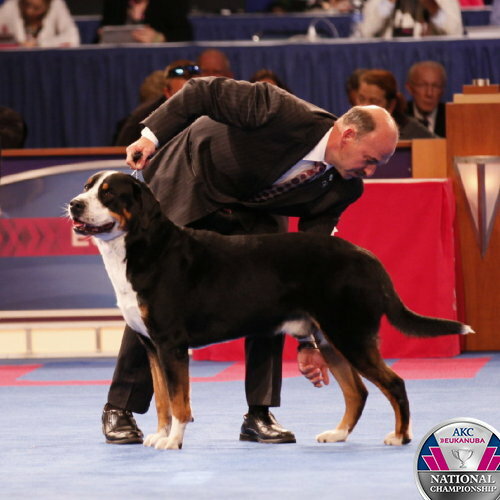 Greater Swiss Mountain Dog breed judging. 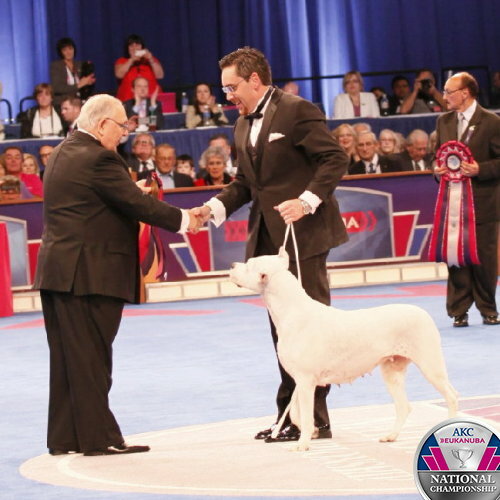 Breed videos will be available approx. 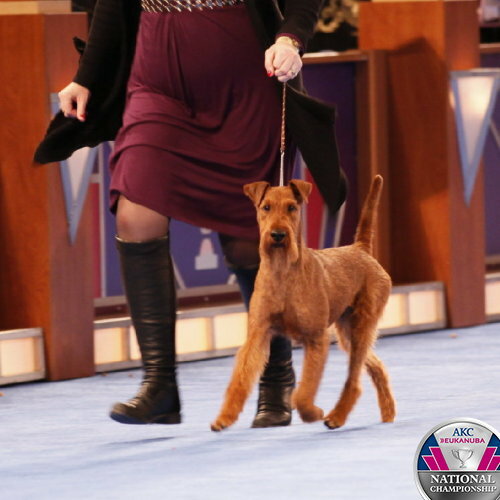 2 hours after each breed's judging concludes.